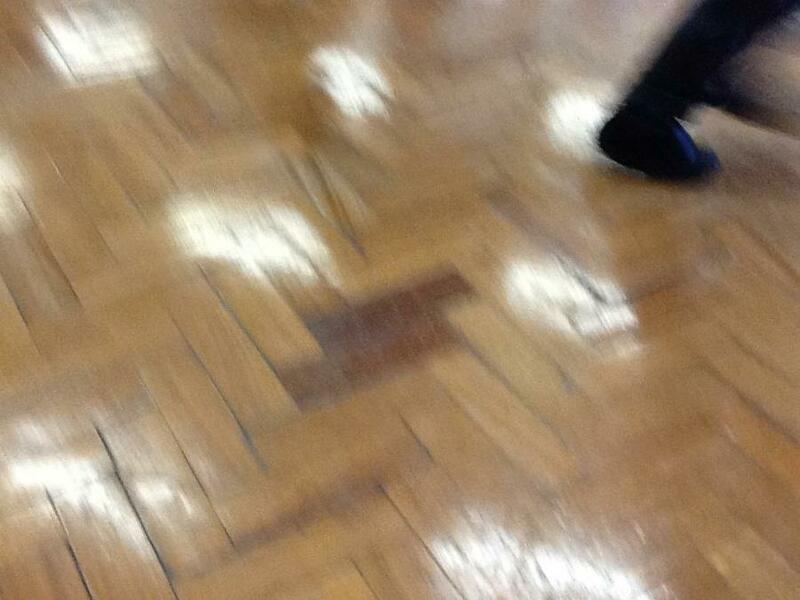 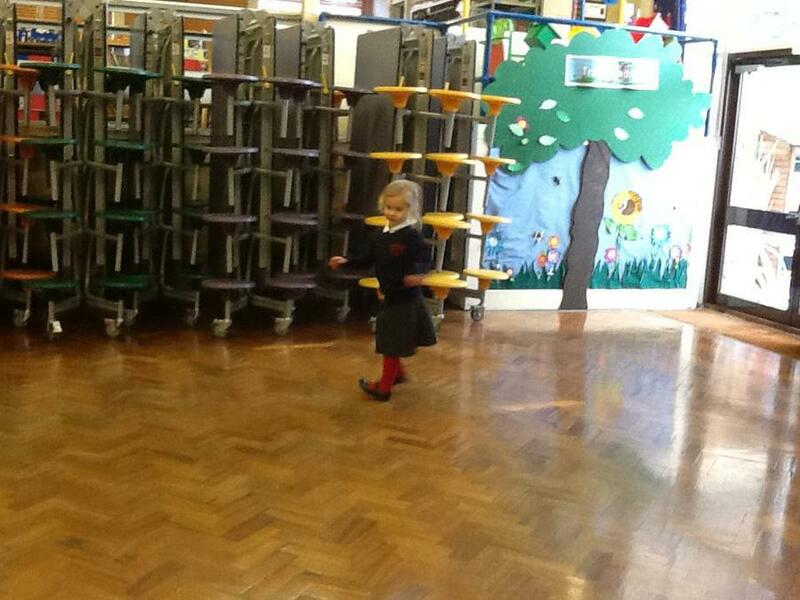 Welcome to the most magical place in school! 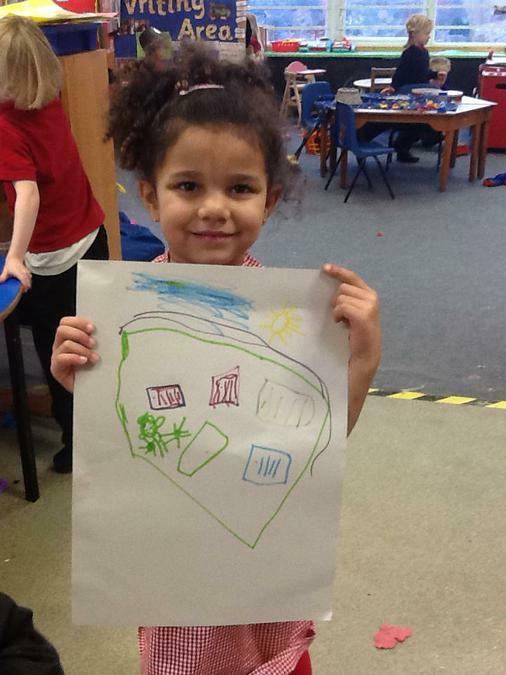 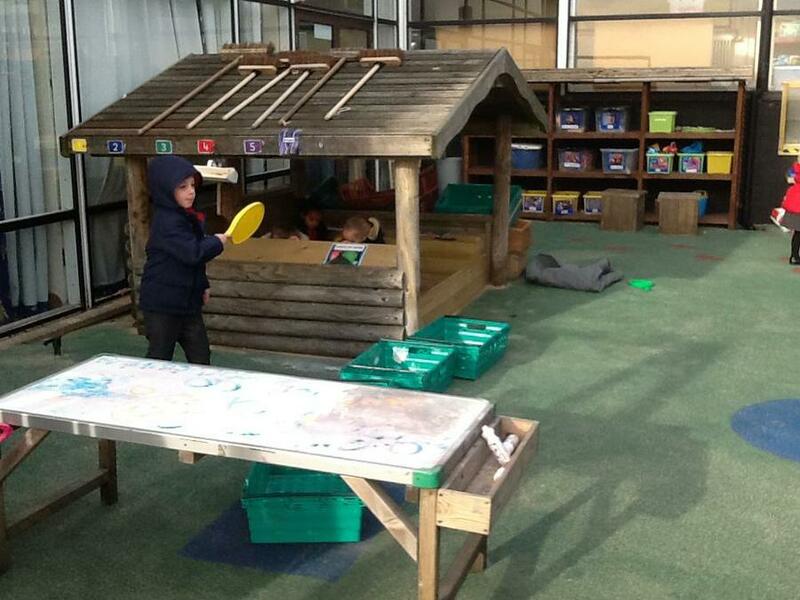 Foundation 2 is the home of the awesome Class 1 and Class 2. 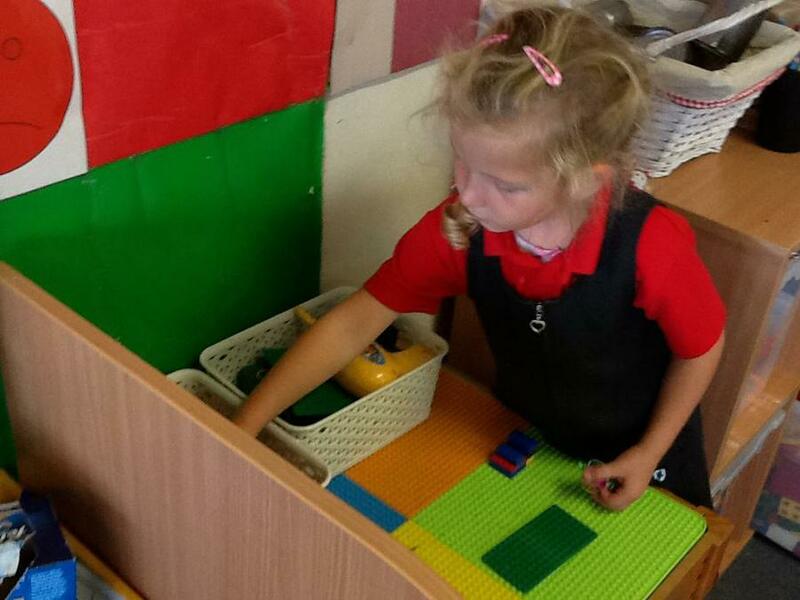 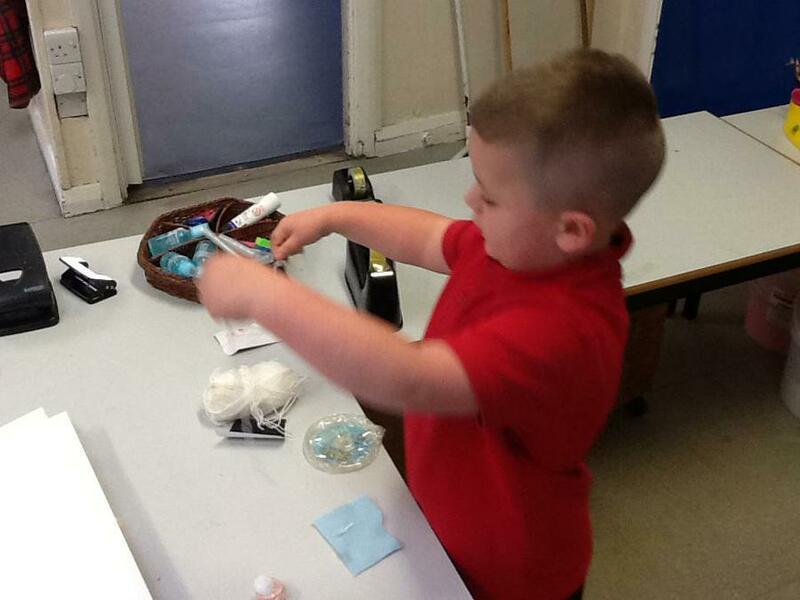 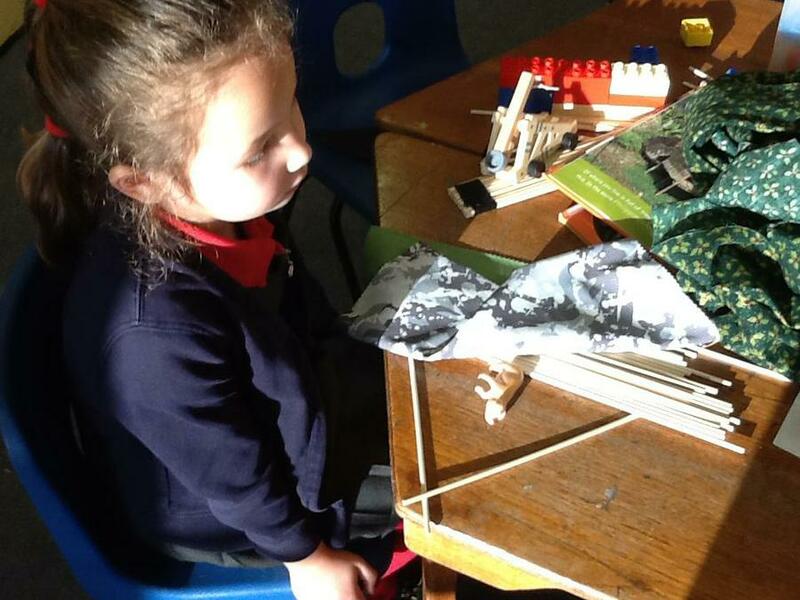 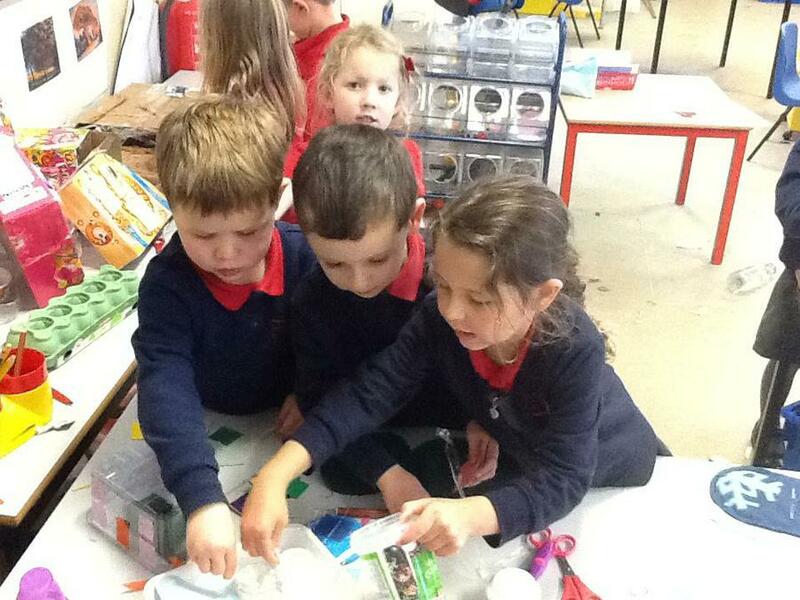 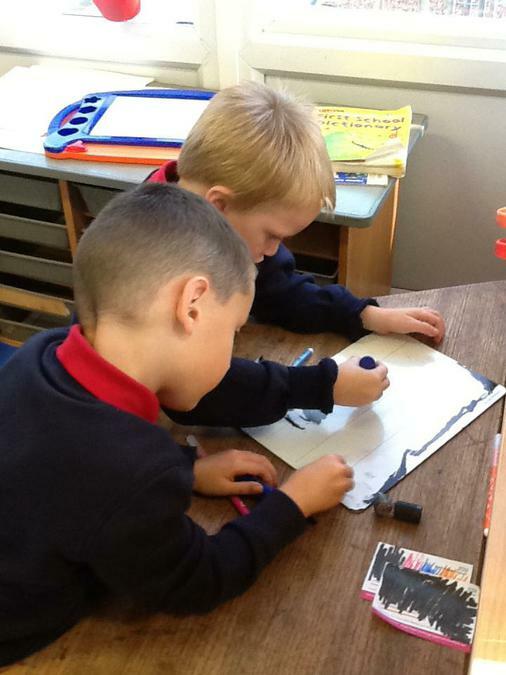 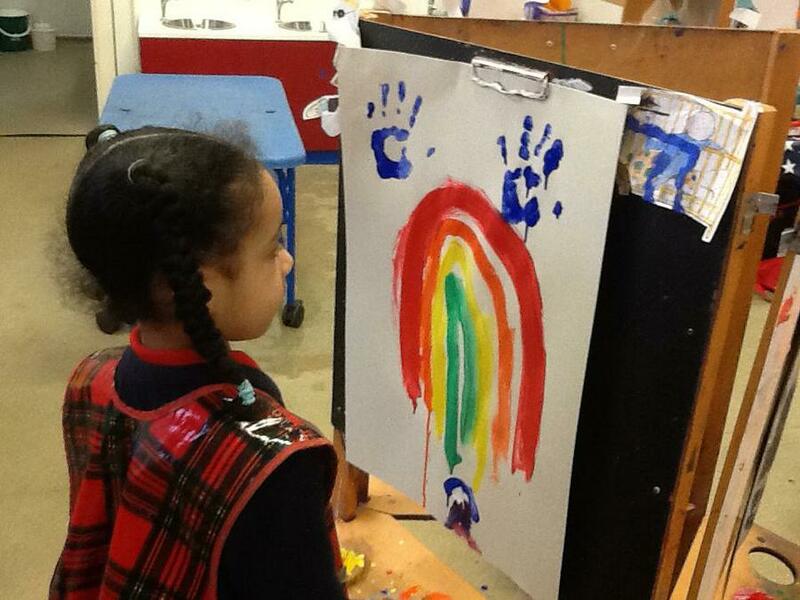 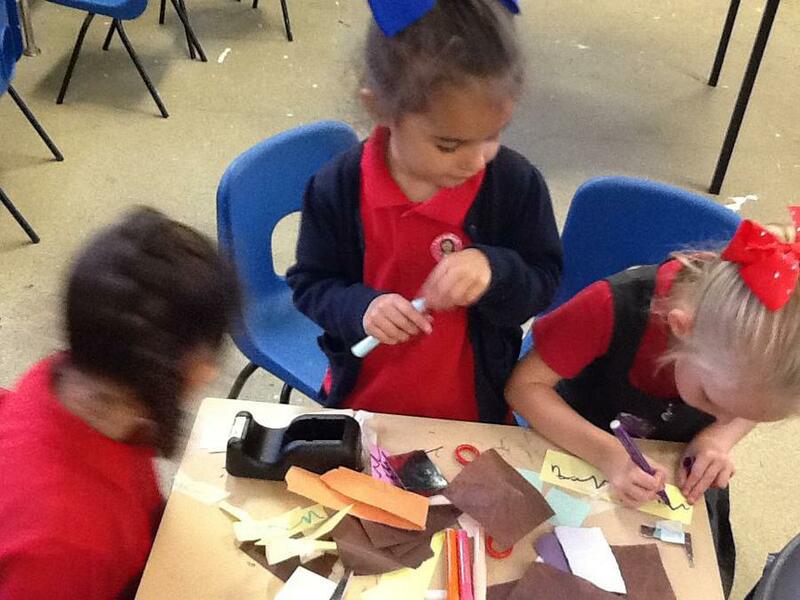 We don’t just learn here, we investigate, explore, create and discover. 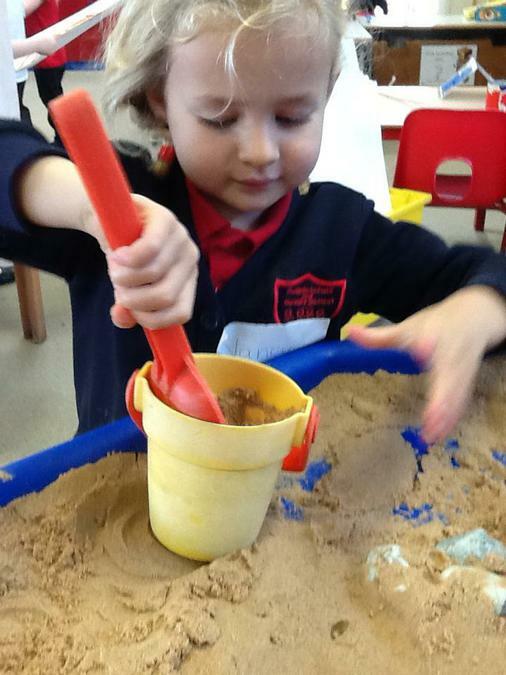 Everyday we have new adventures full of imagination and excitement…we travel to far off places, maybe even to where the wild things are or Peter Pan lives or to find what Goldilocks is up to now. 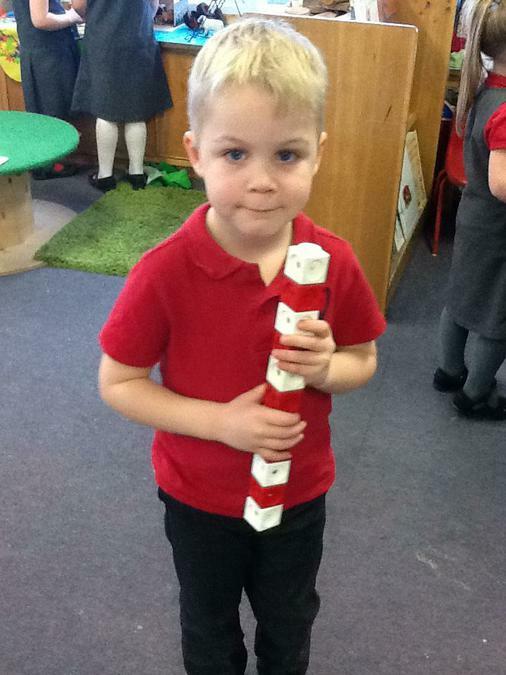 Keep your eyes on this page to see all our adventures and our amazing learning achievements because in F2 we really make learning child's play! 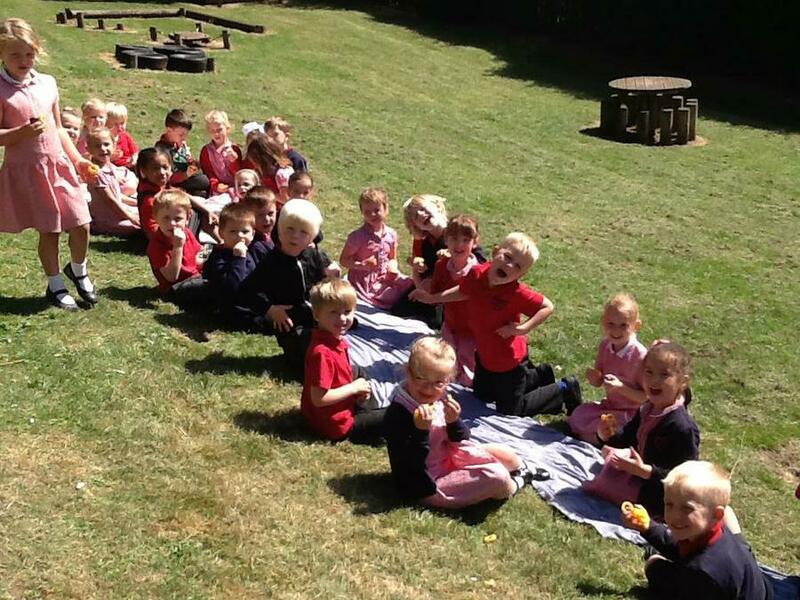 I don’t think I’ve ever seen a class so excited for a treat as class 2. 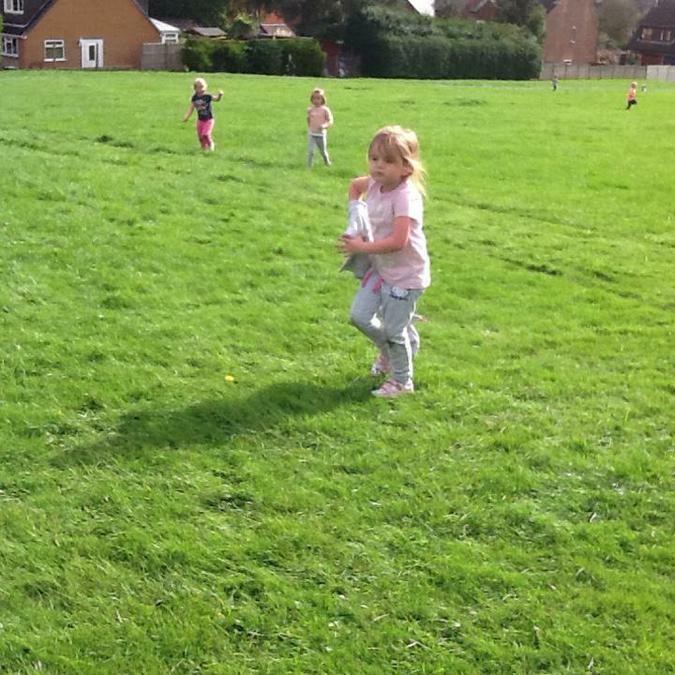 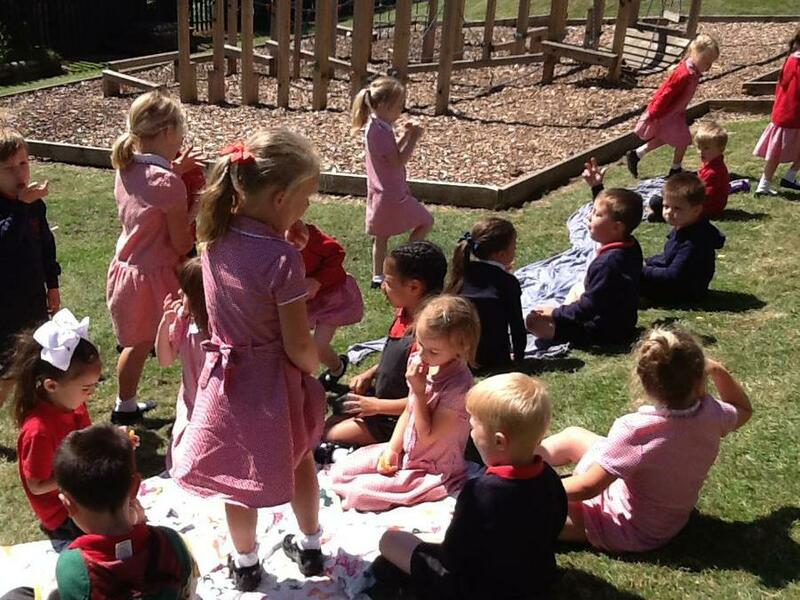 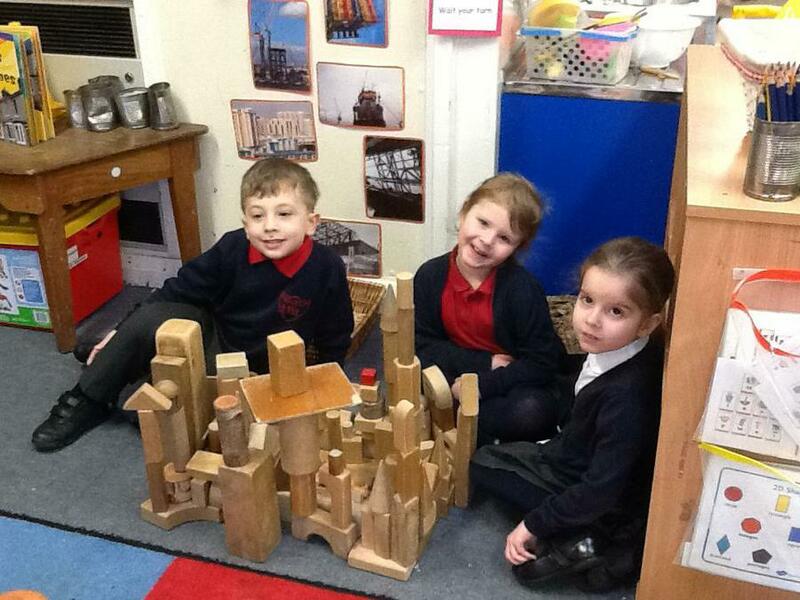 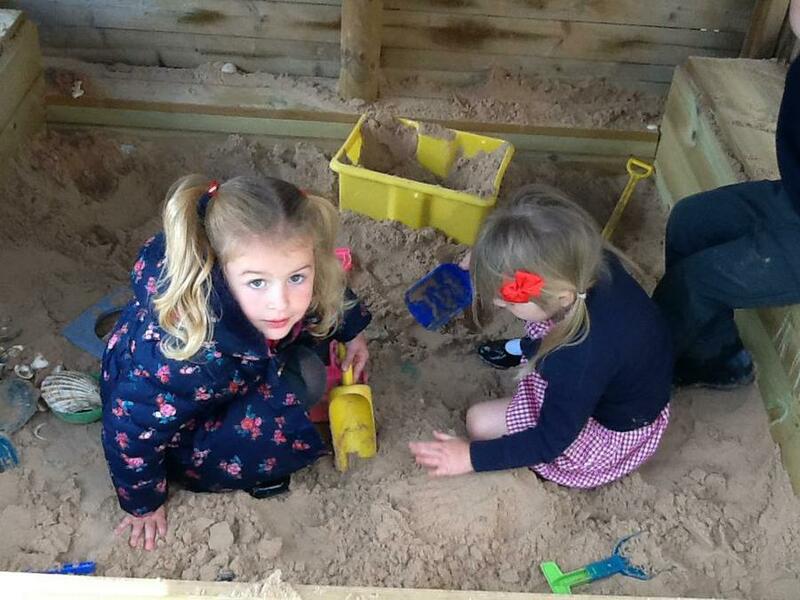 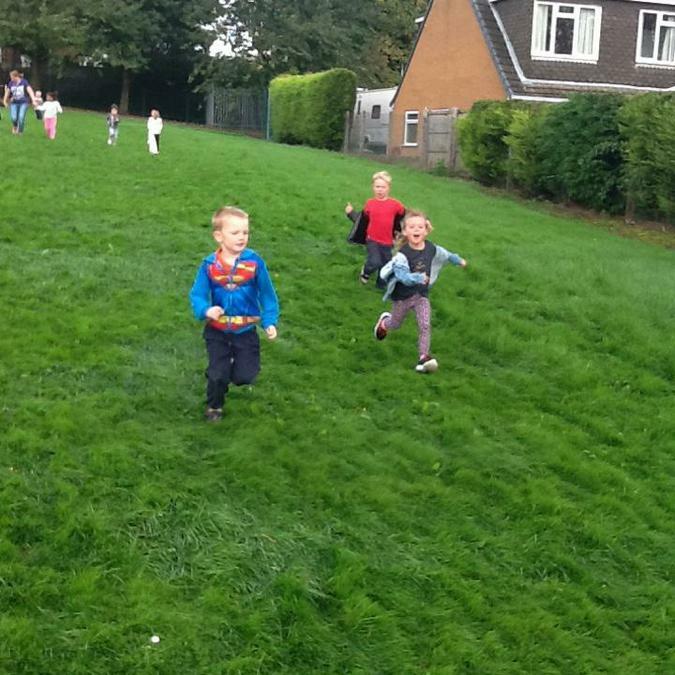 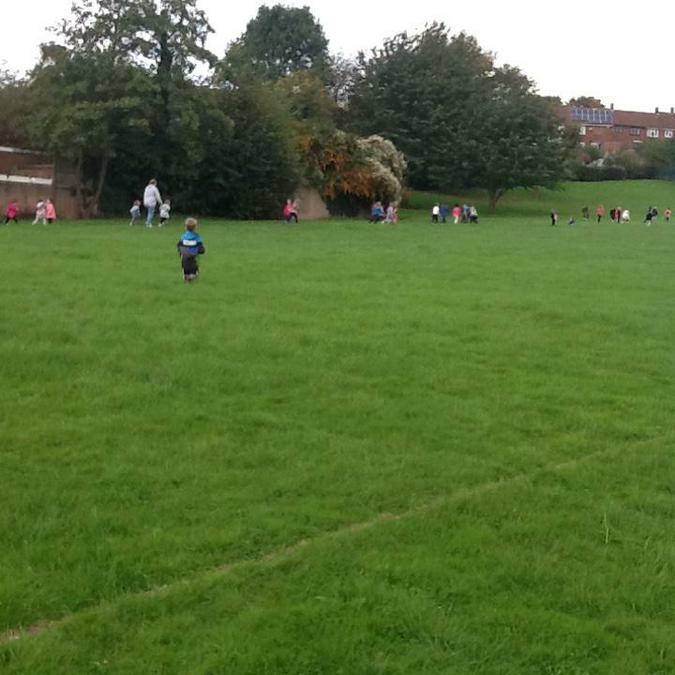 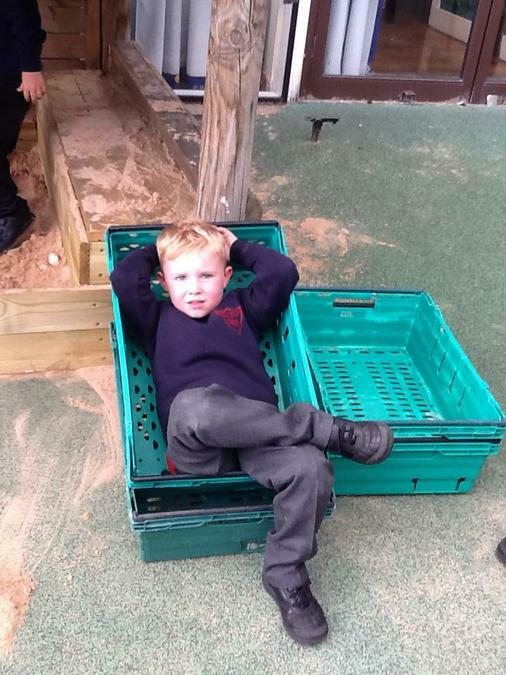 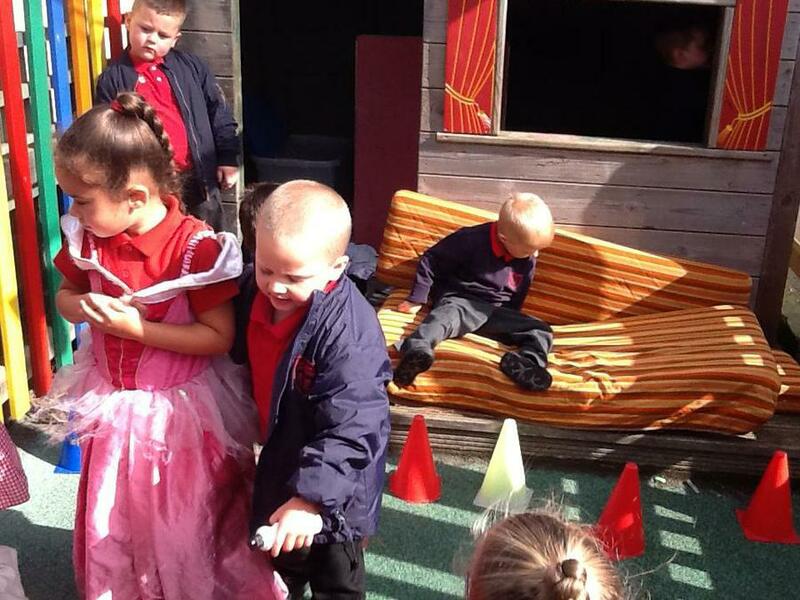 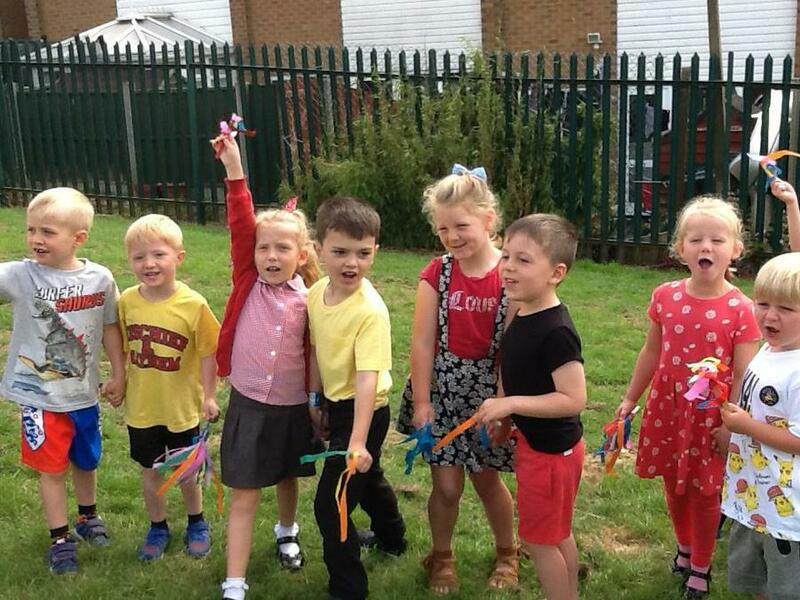 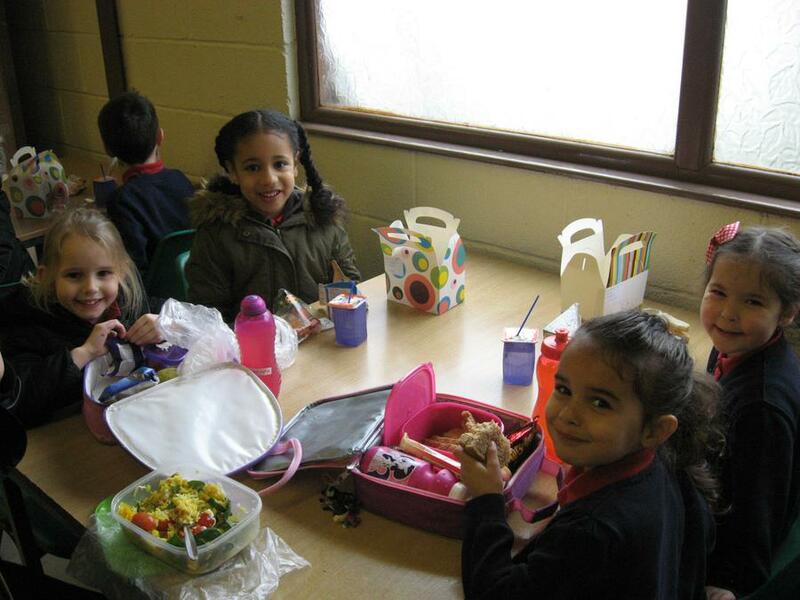 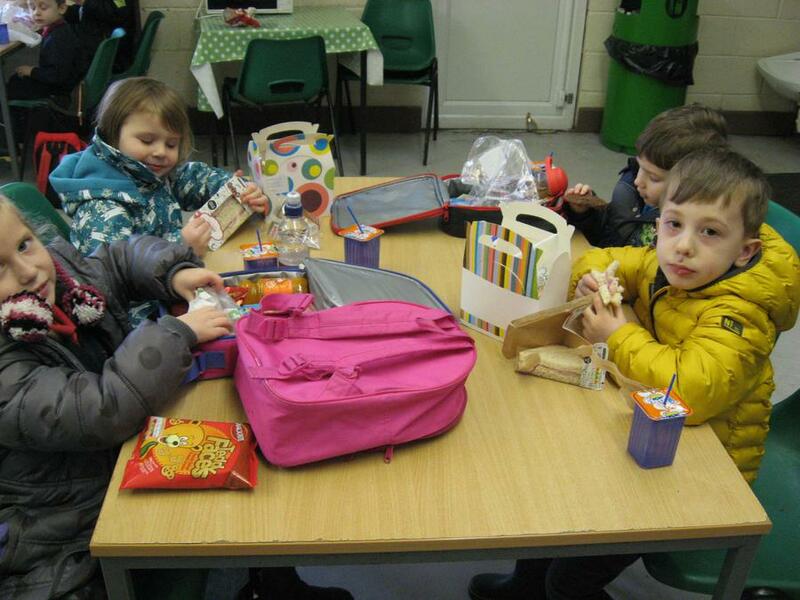 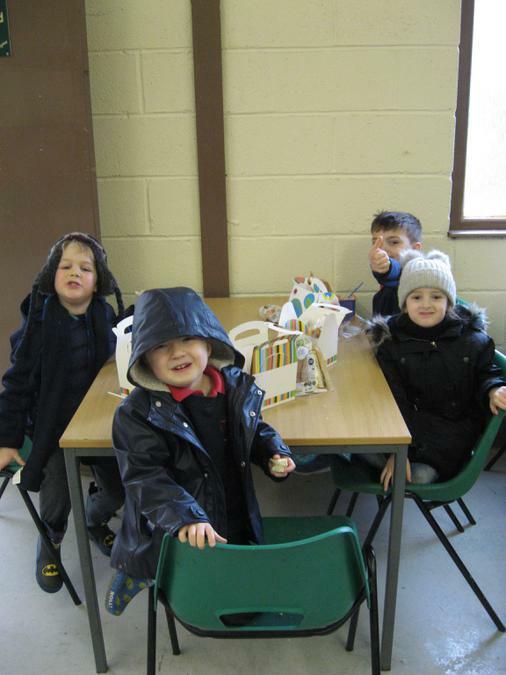 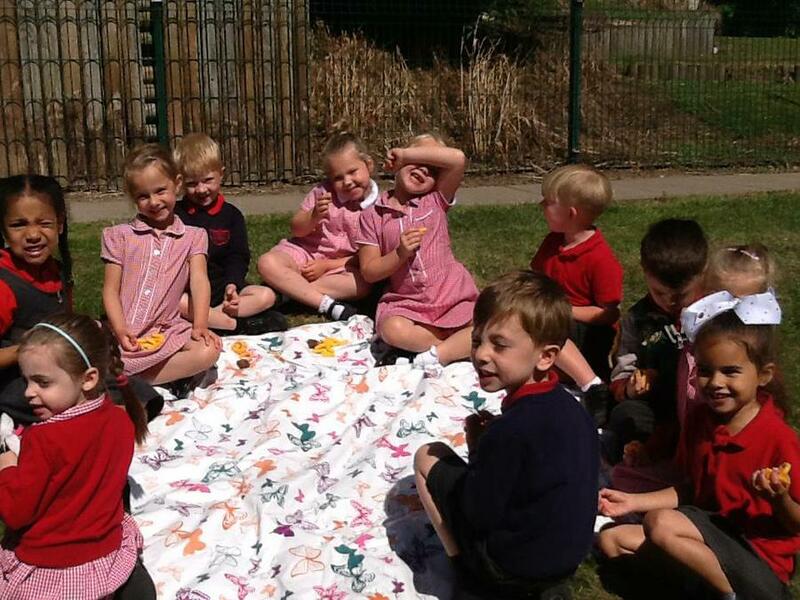 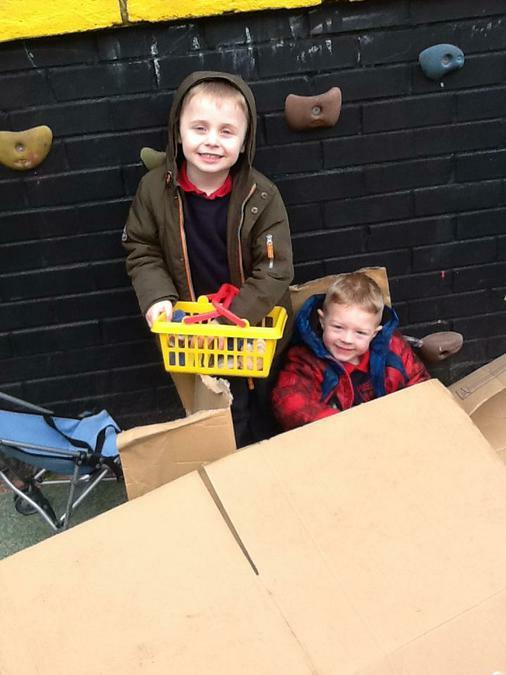 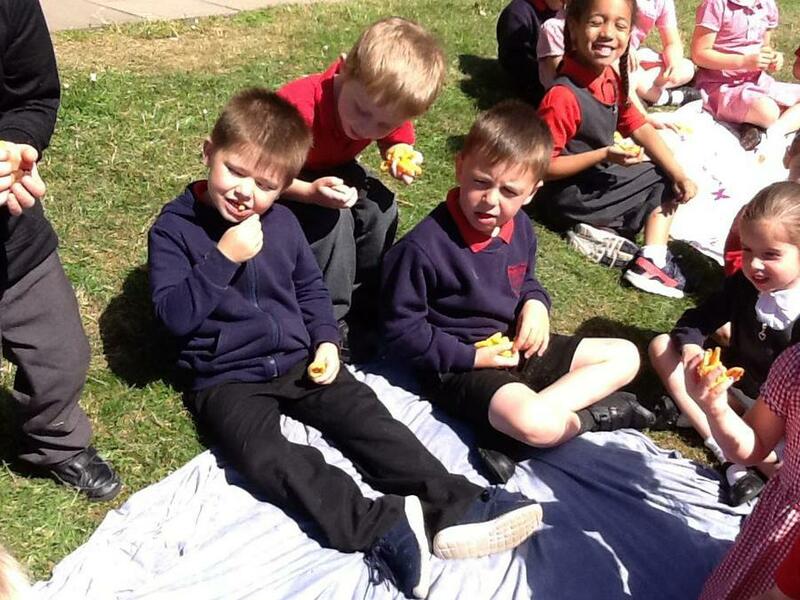 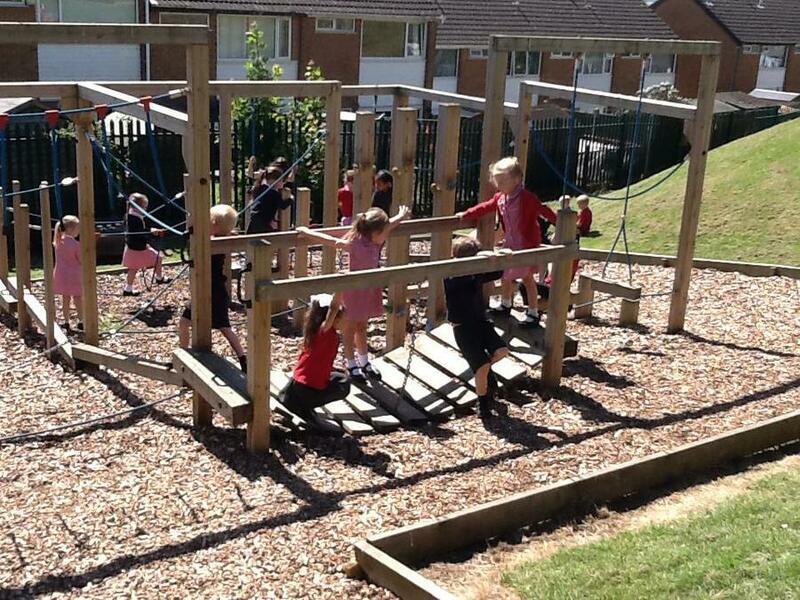 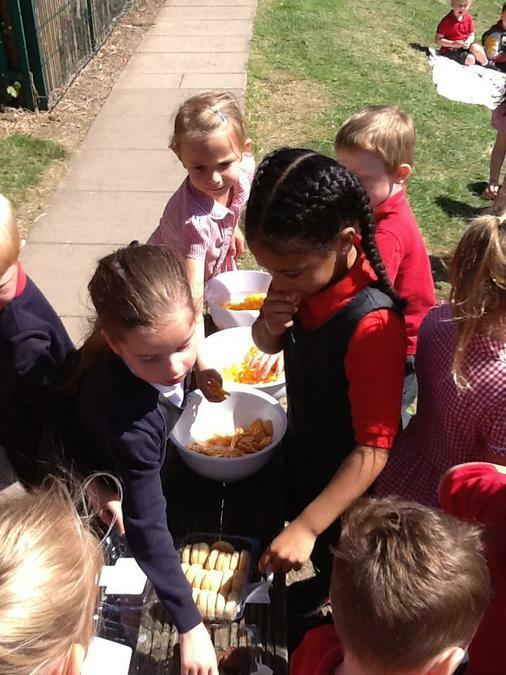 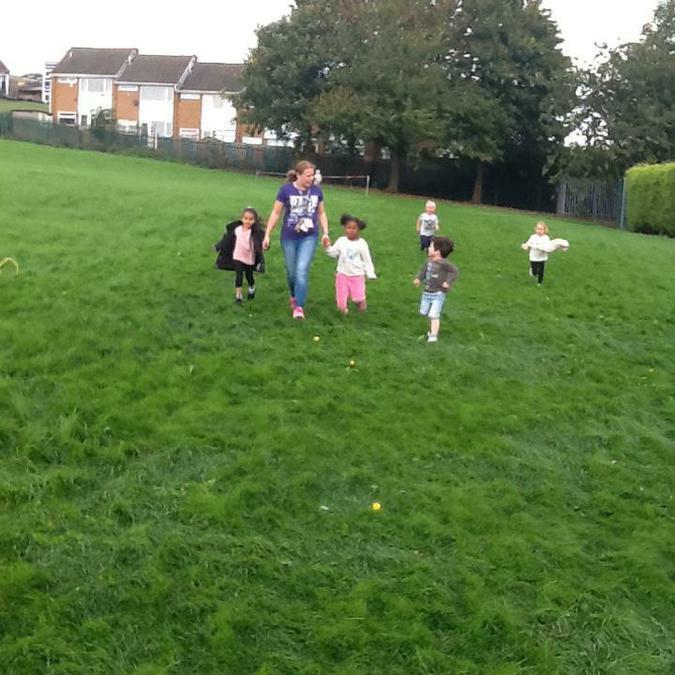 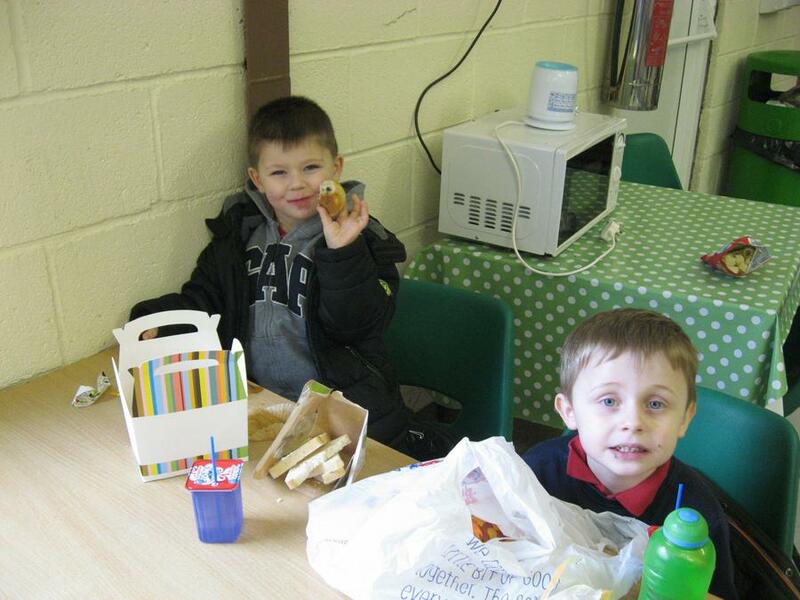 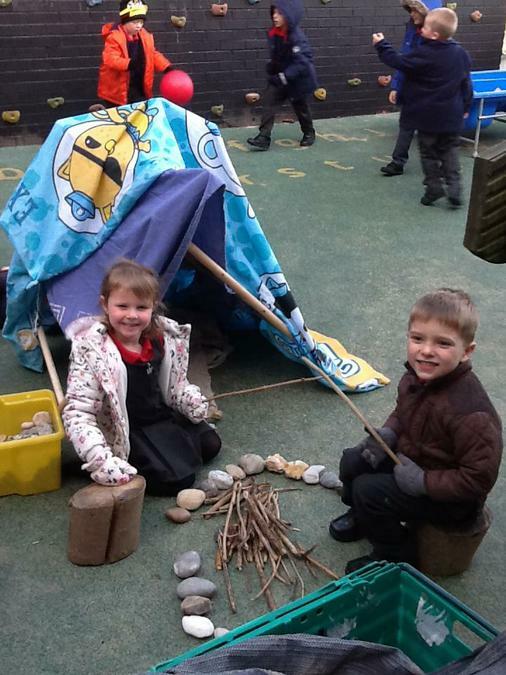 They voted to have a picnic on the adventure playground for winning the stars last week. 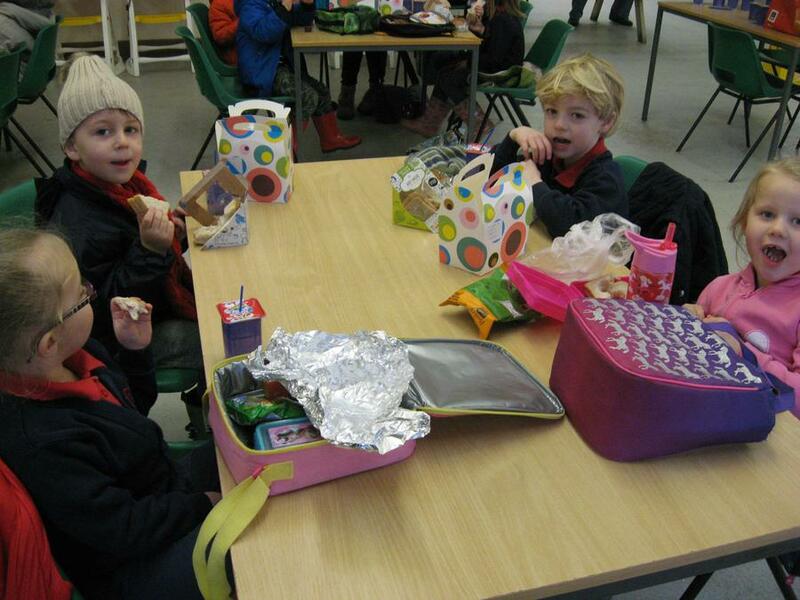 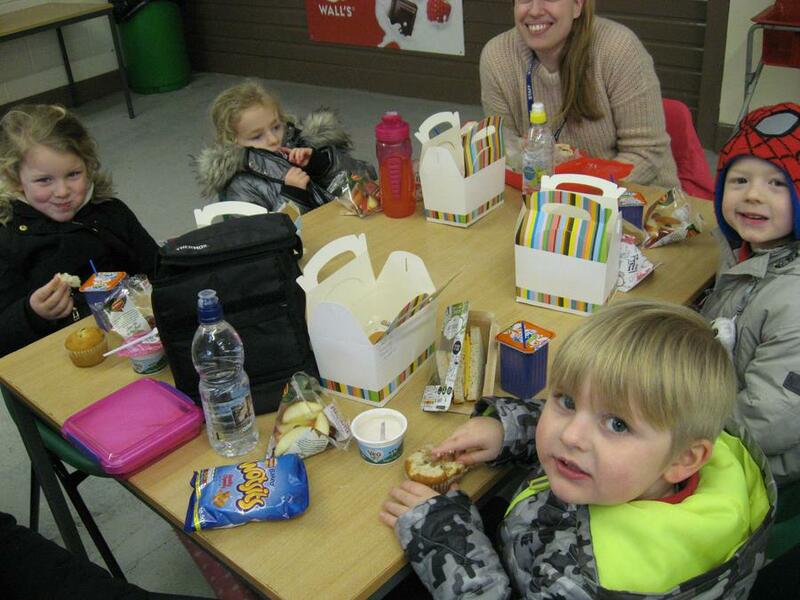 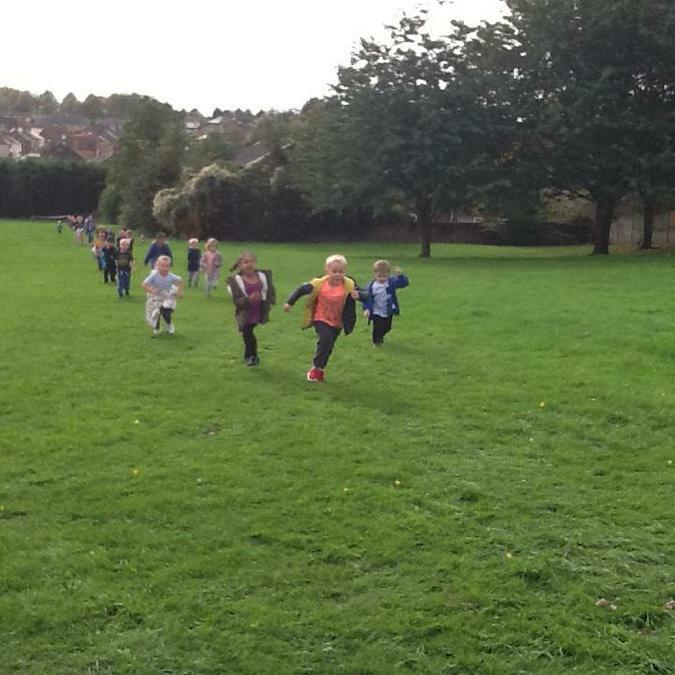 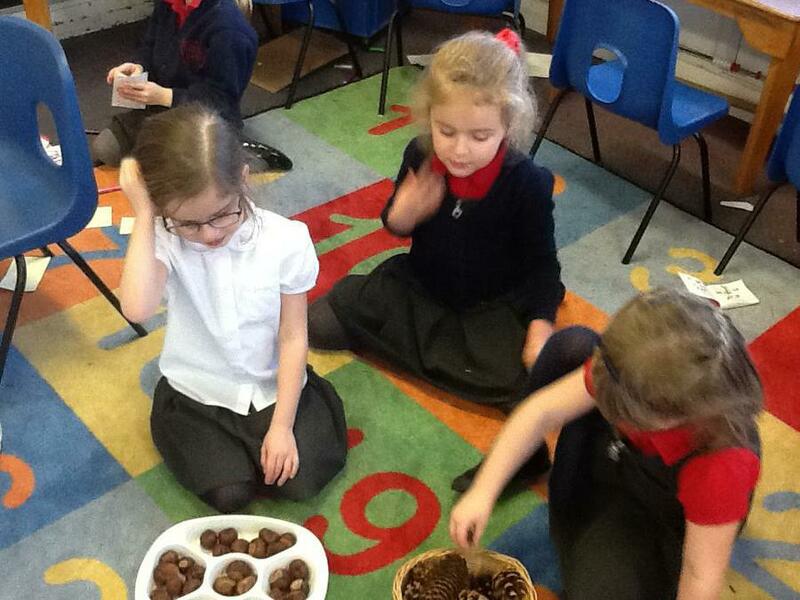 There were crisps, cake and biscuits and everyone has a fantastic time! 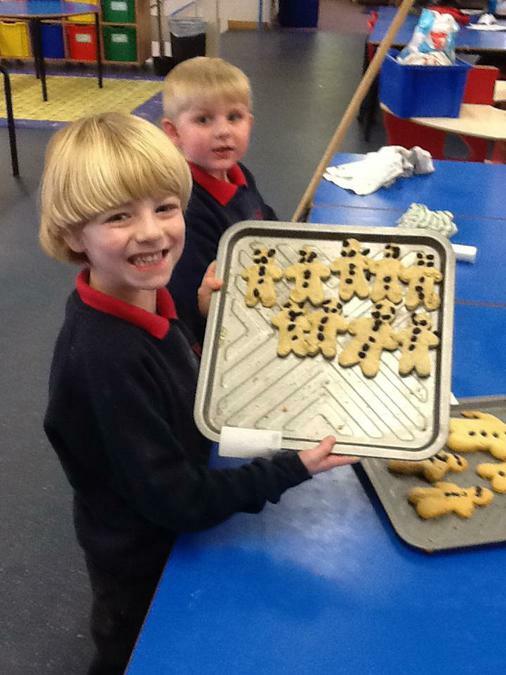 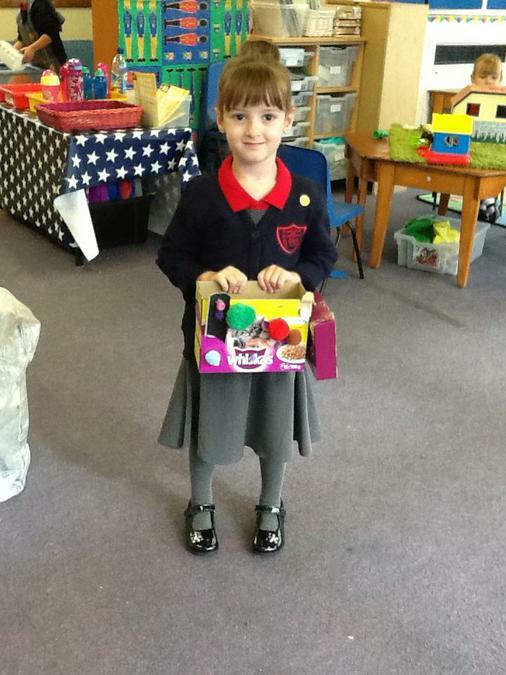 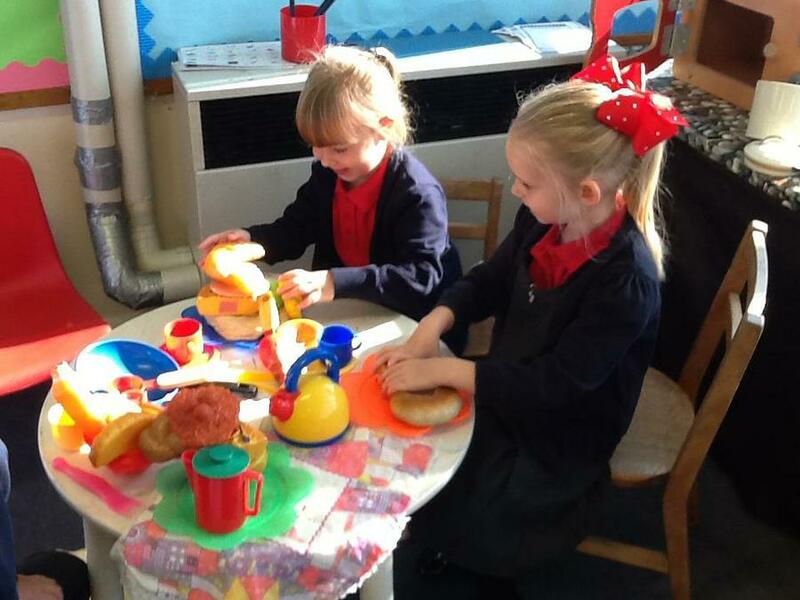 Well done class 2 for working so hard, you deserved your treat. 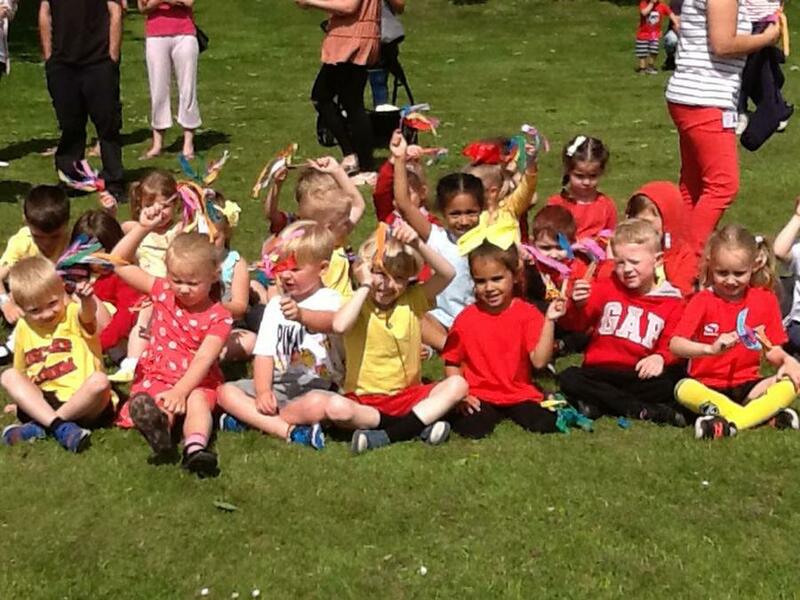 What a beautiful day for a carnival! 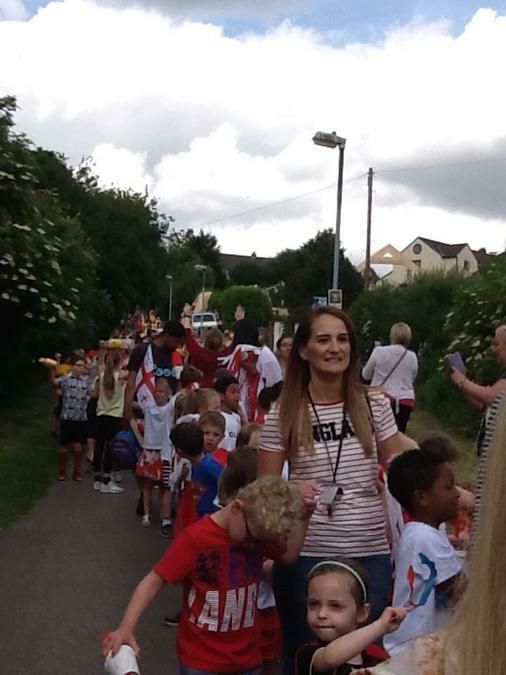 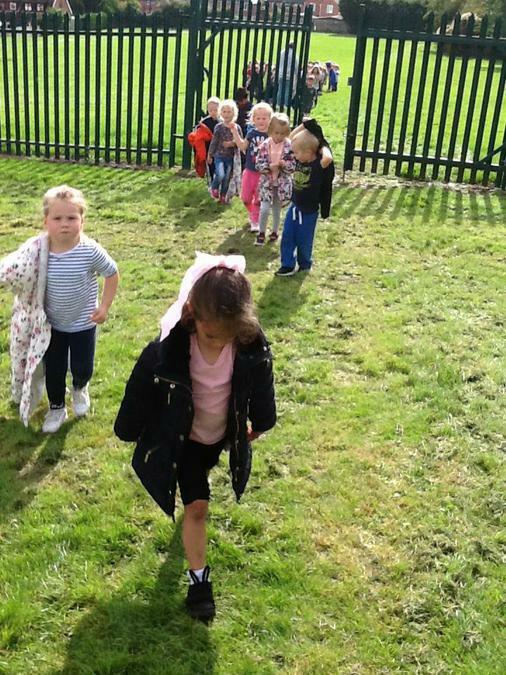 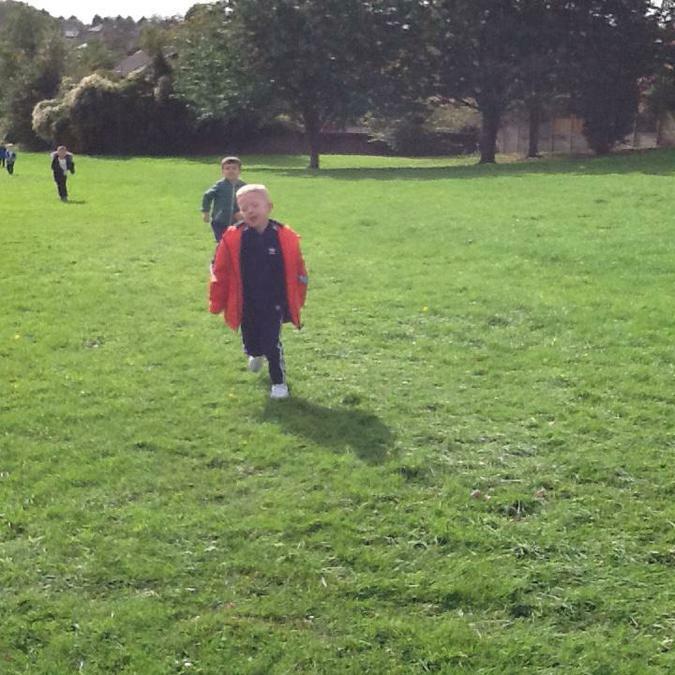 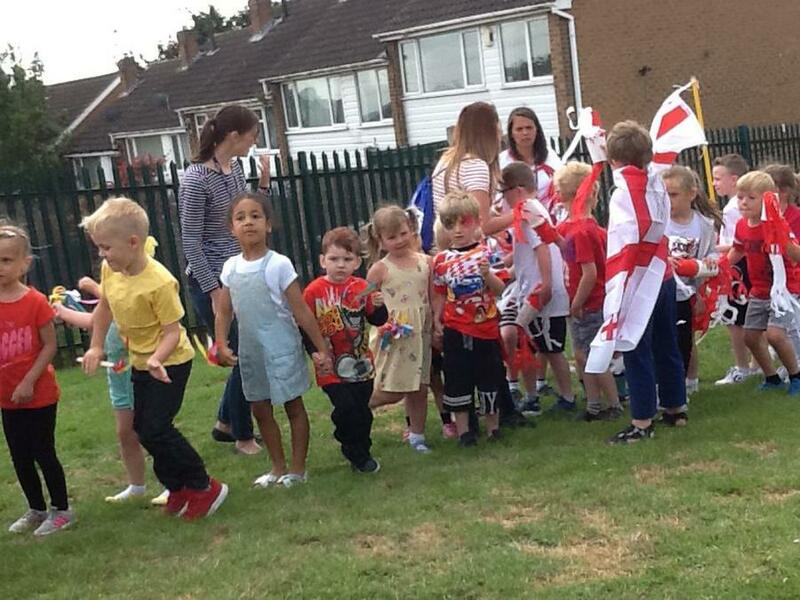 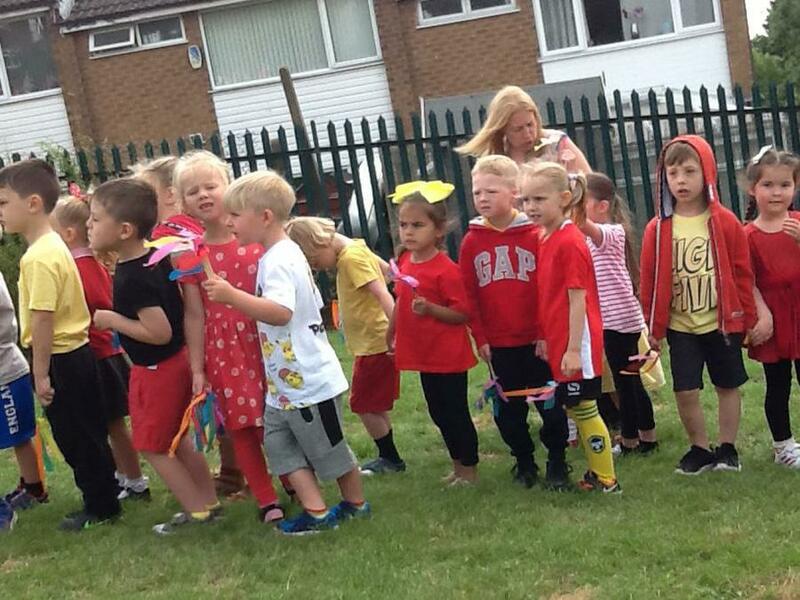 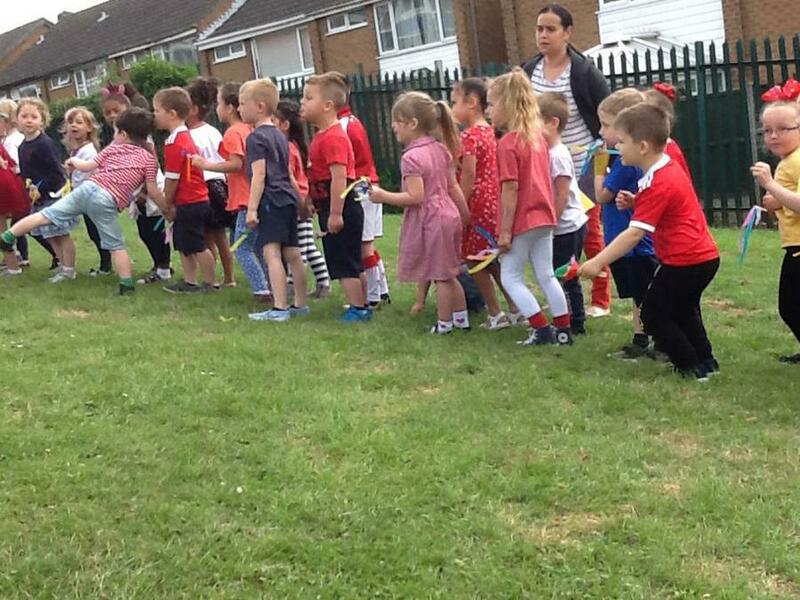 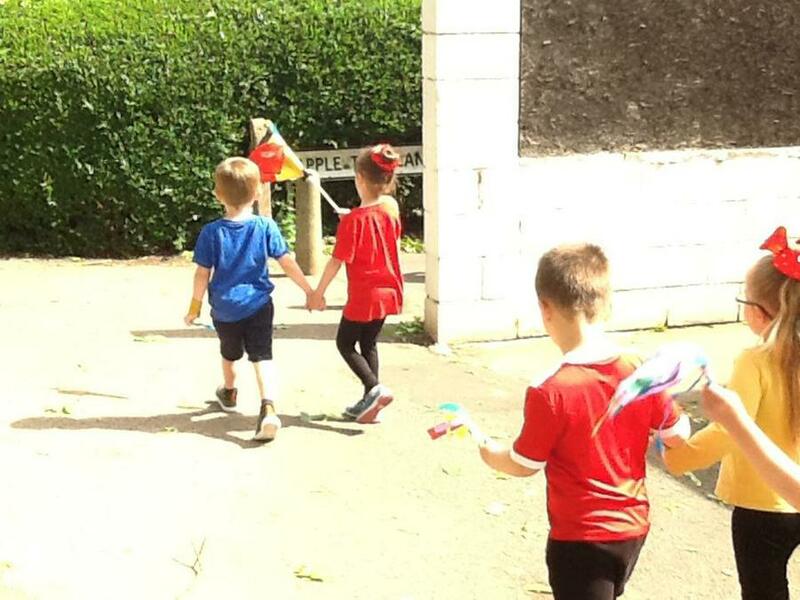 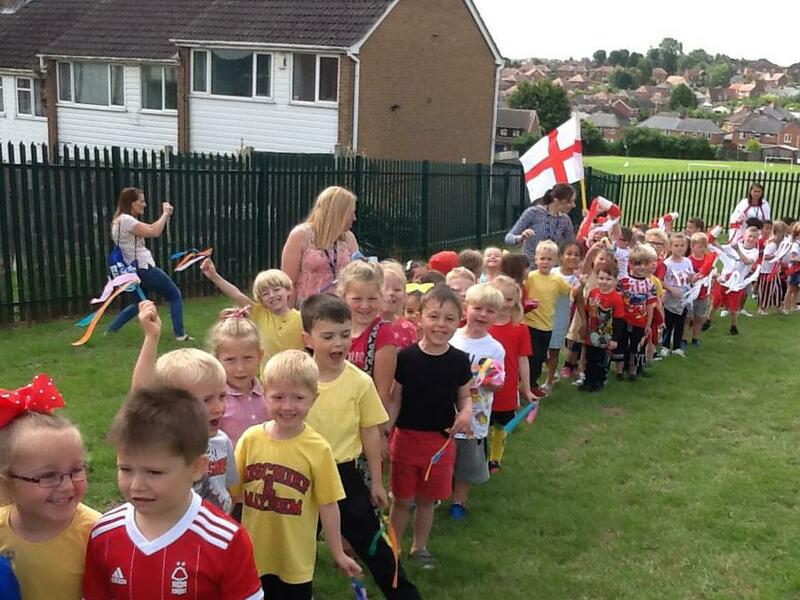 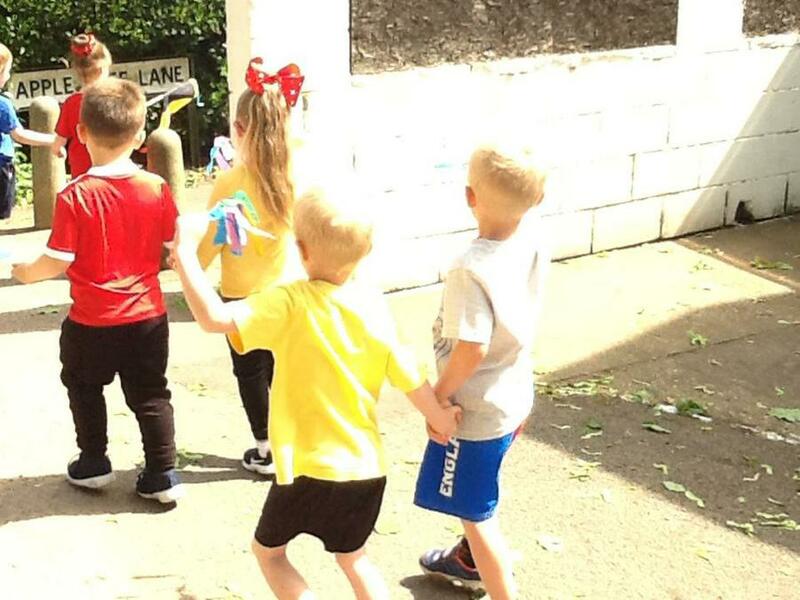 Class 1 and 2 loved walking around the community, seeing all the other children from different schools and waving at the grown-ups. 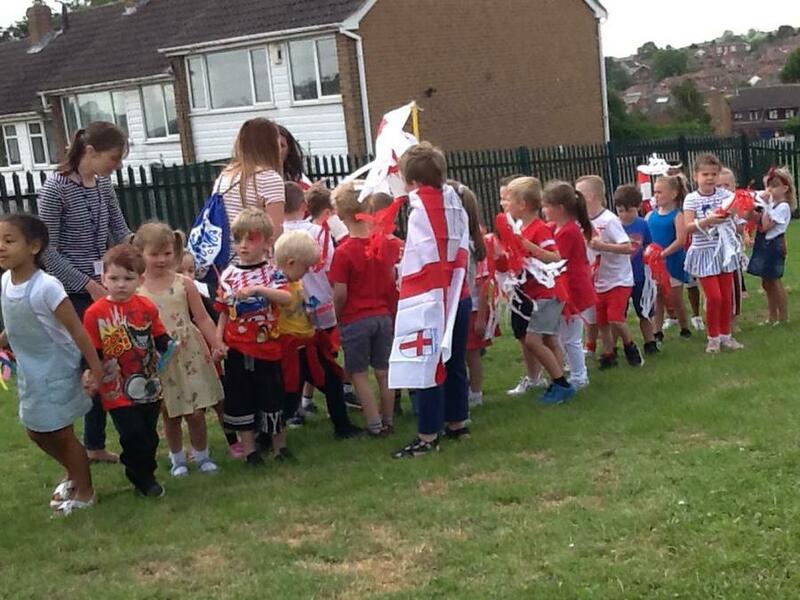 All of this topped off by watching mini matches of football and cheering on Phoenix. 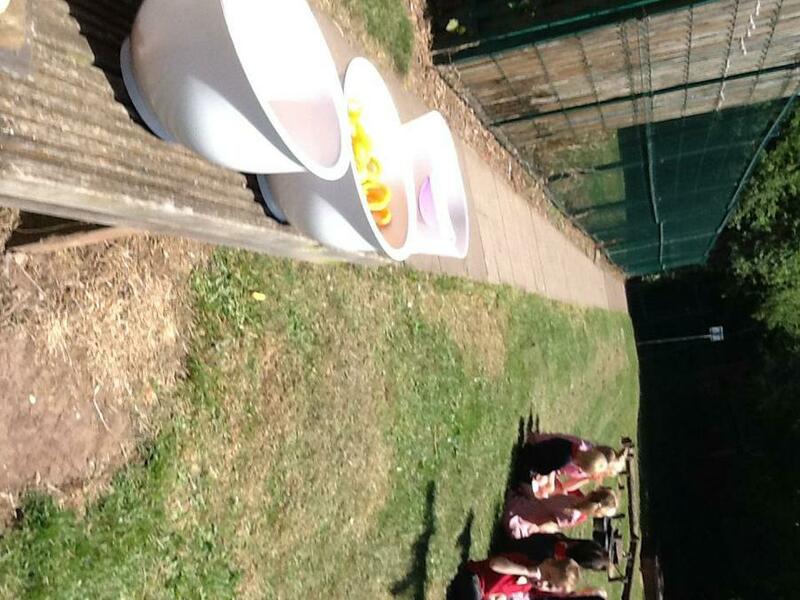 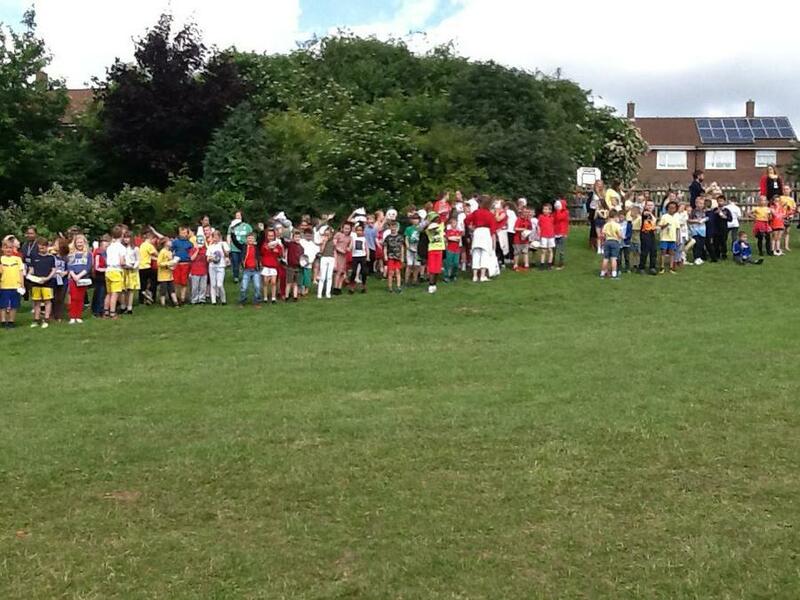 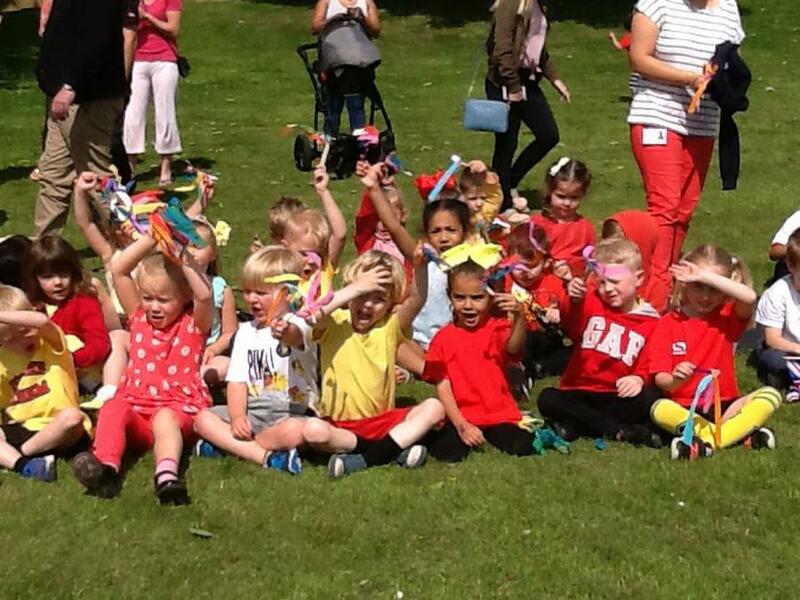 A big thank you to all the parents who came and joined us in the sun. 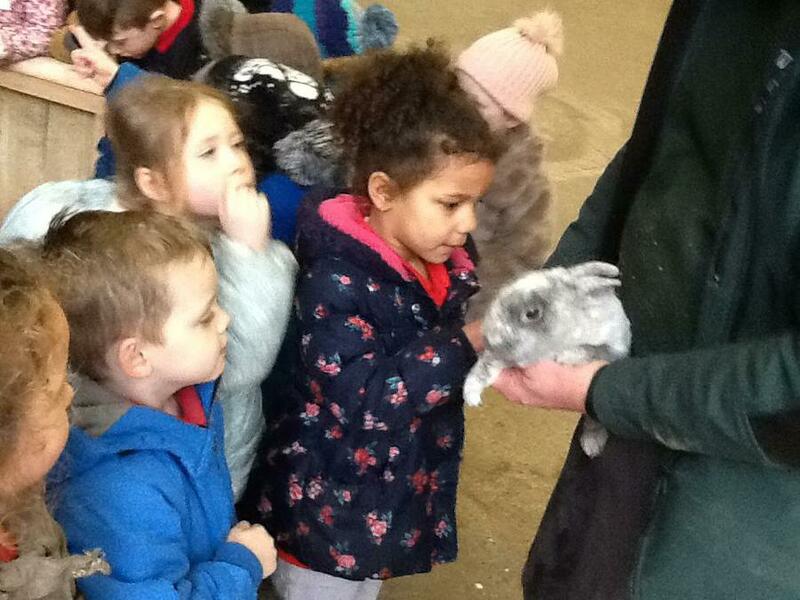 All the fun of the FARM! 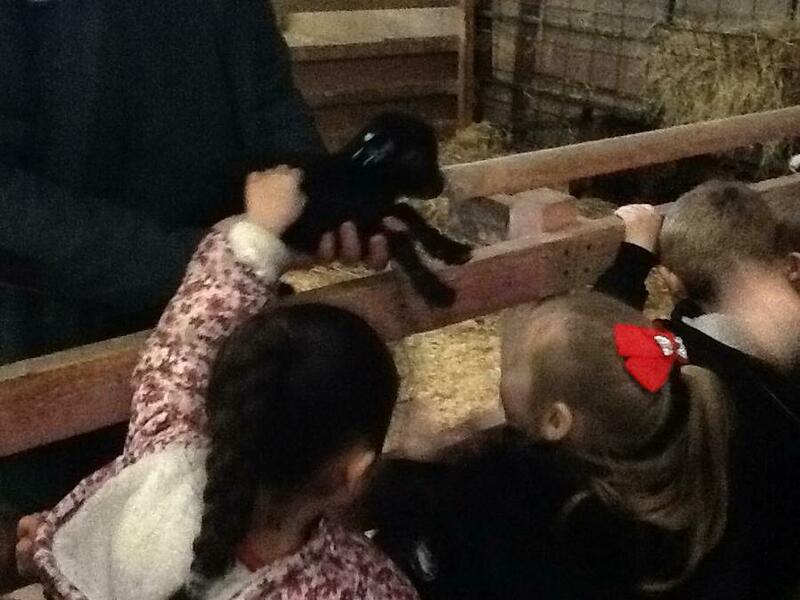 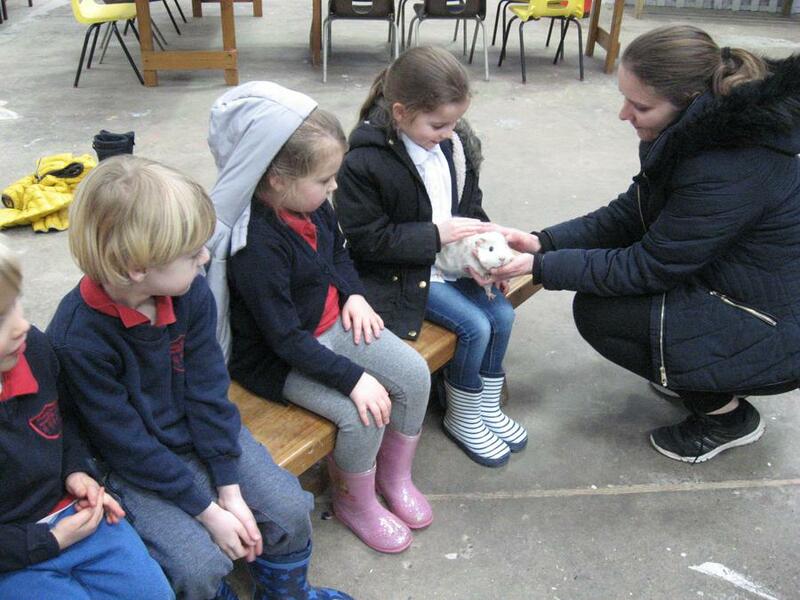 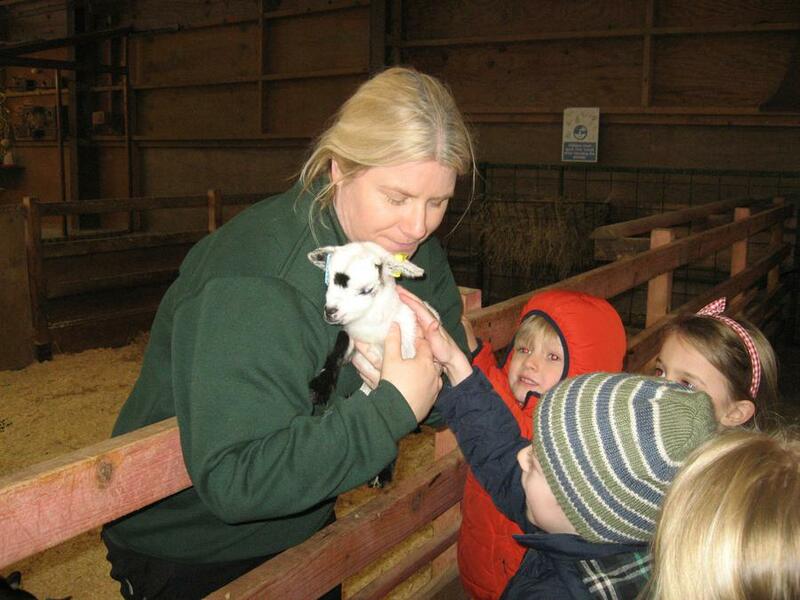 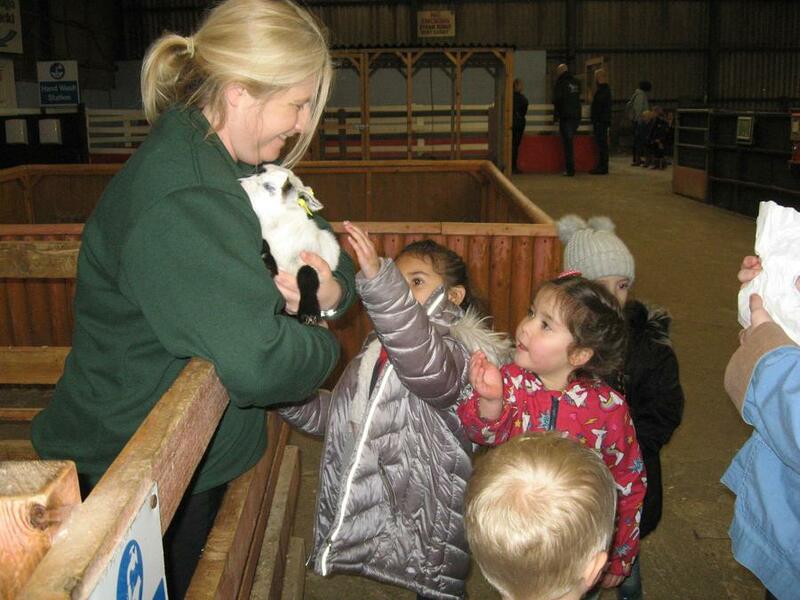 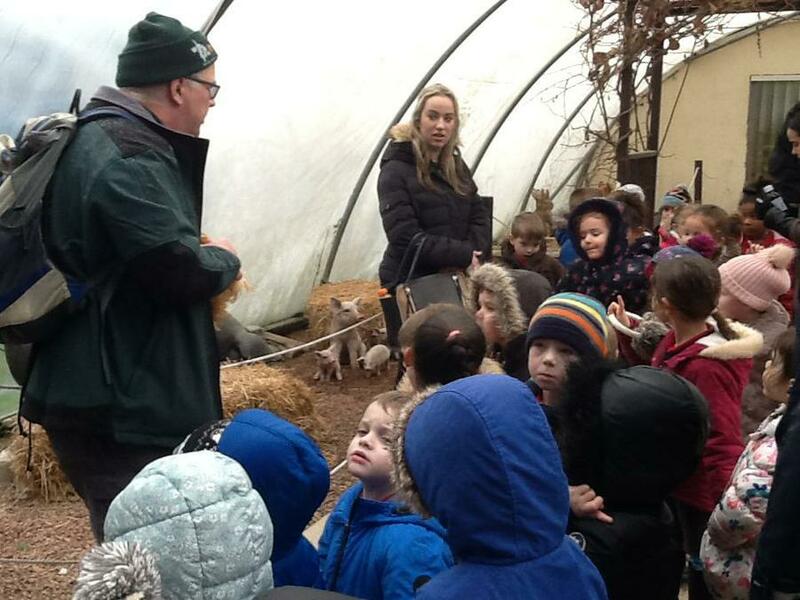 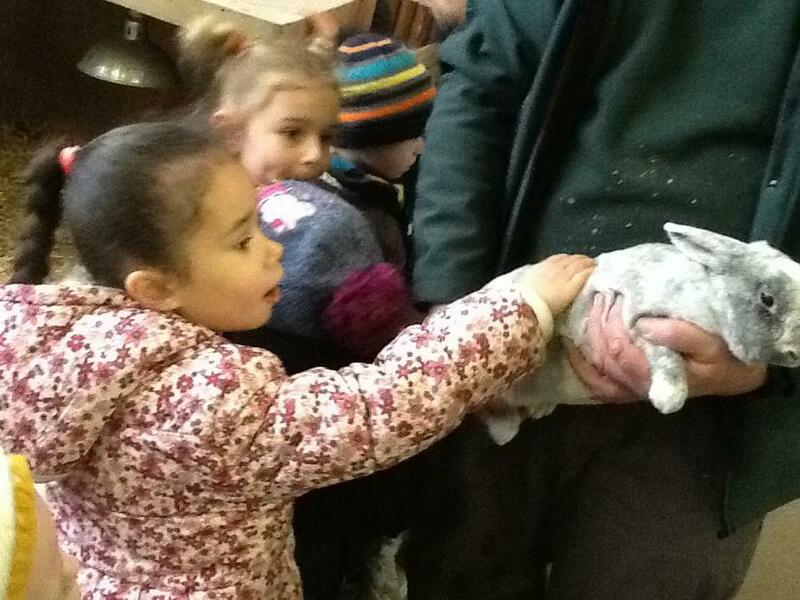 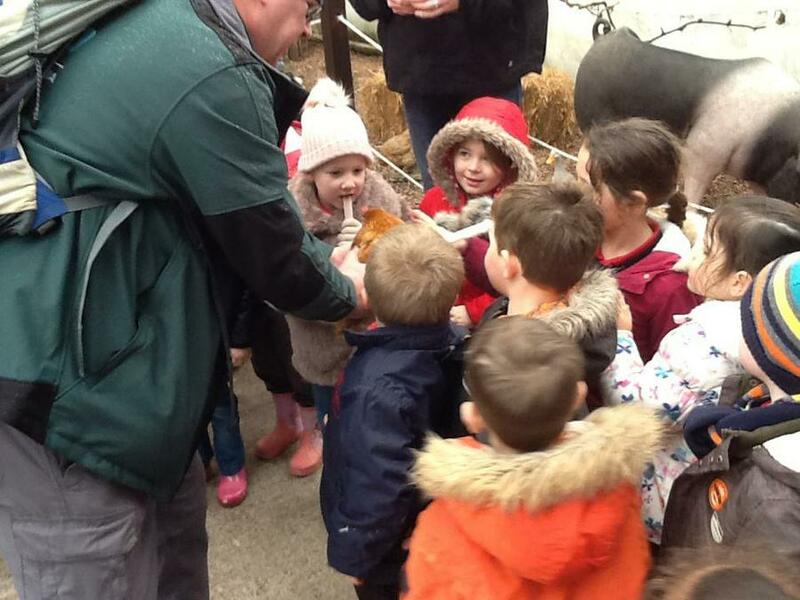 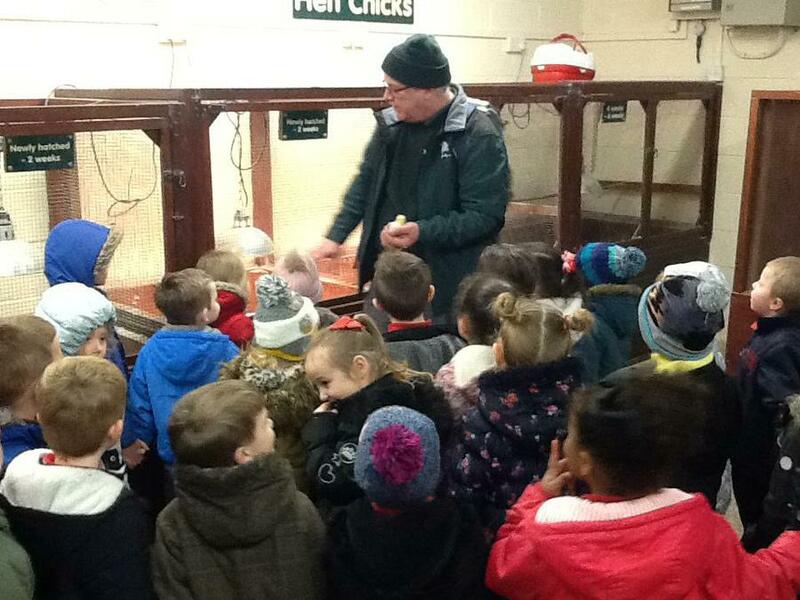 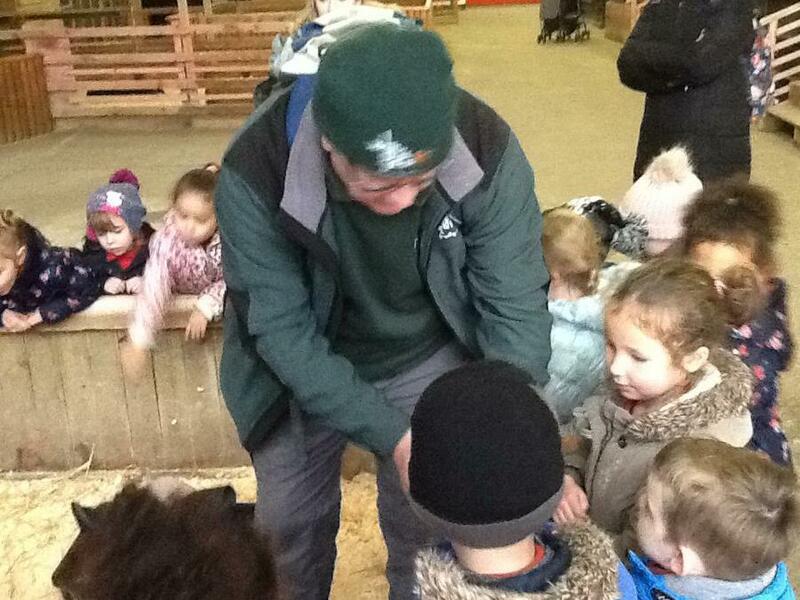 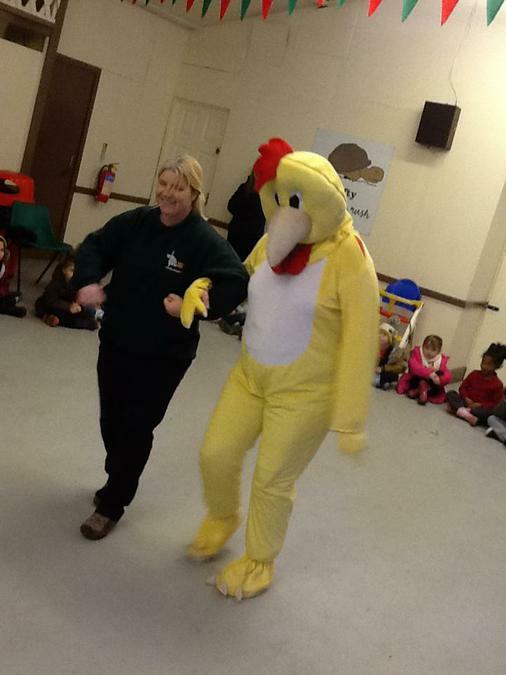 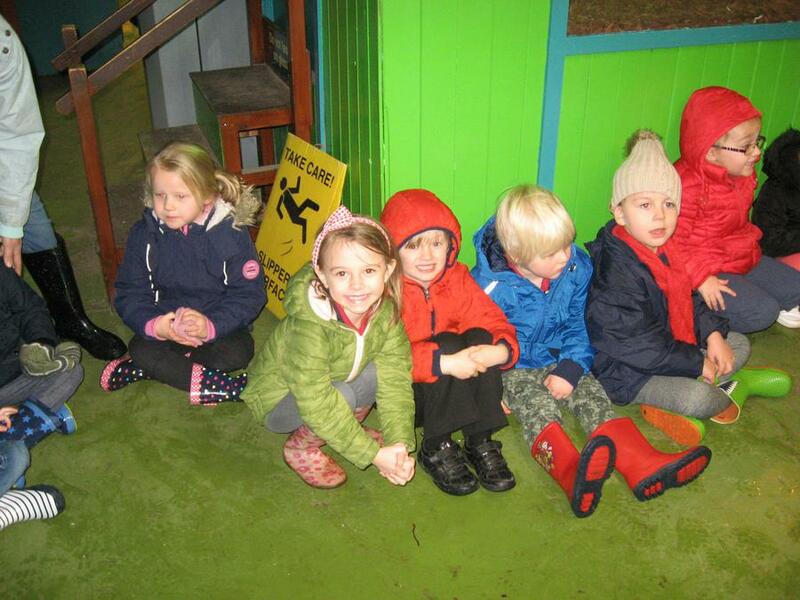 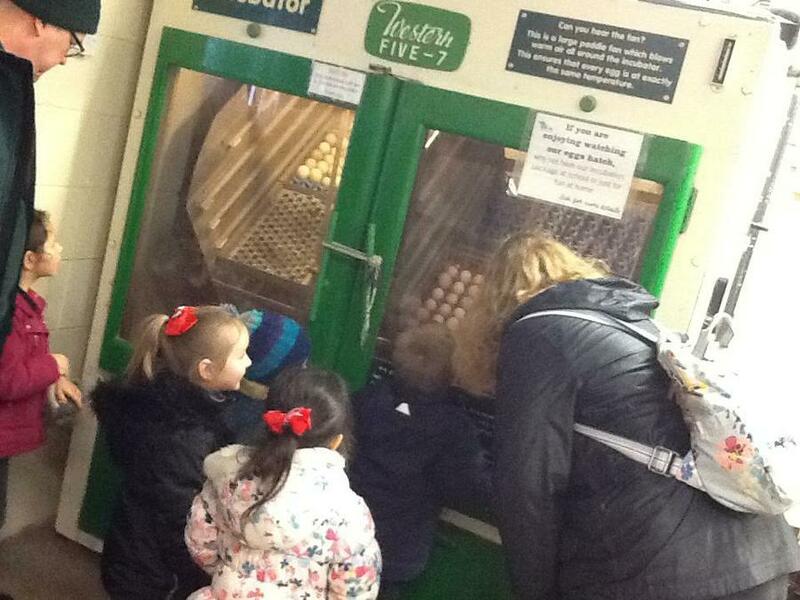 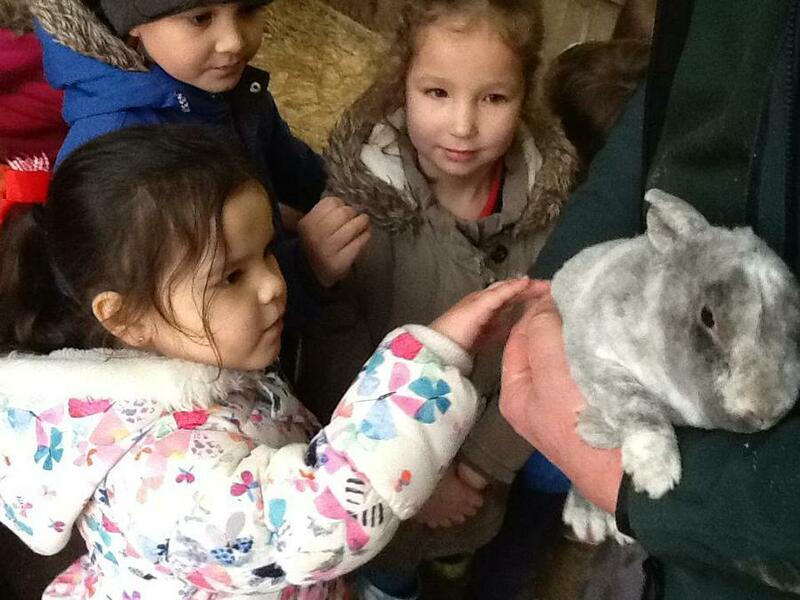 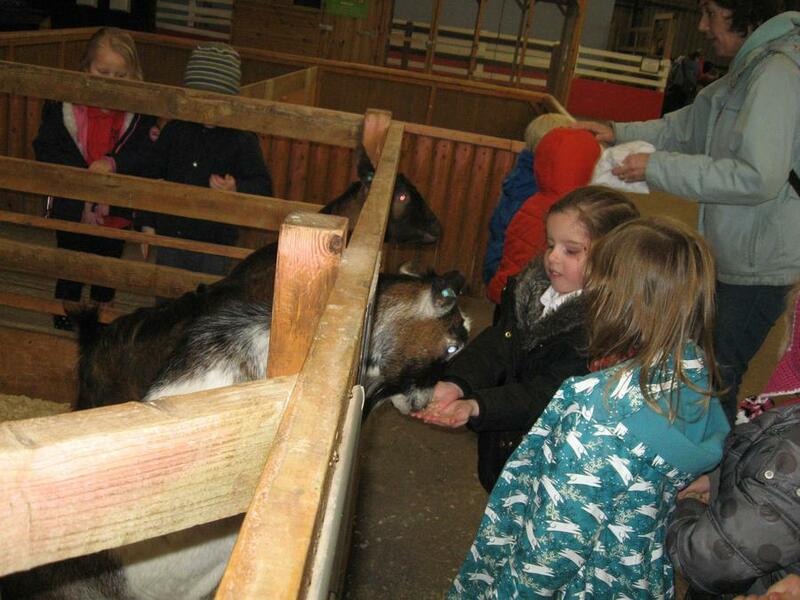 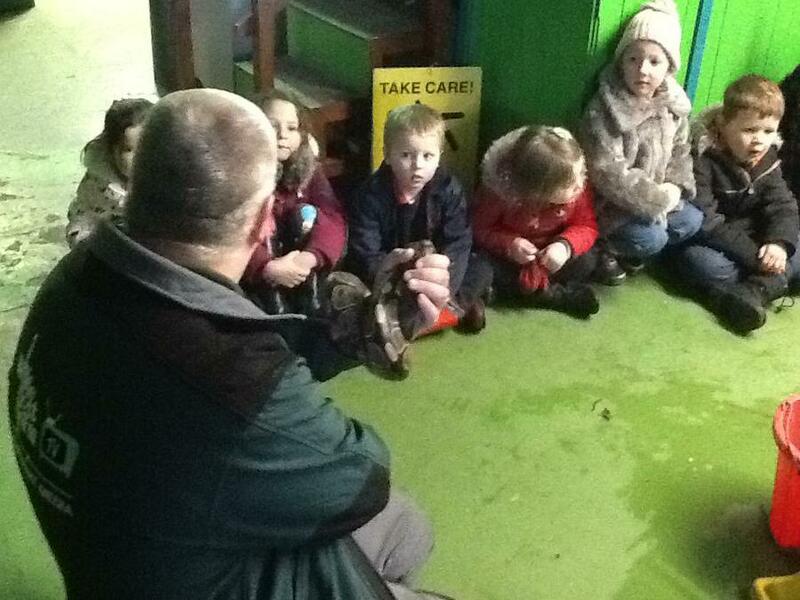 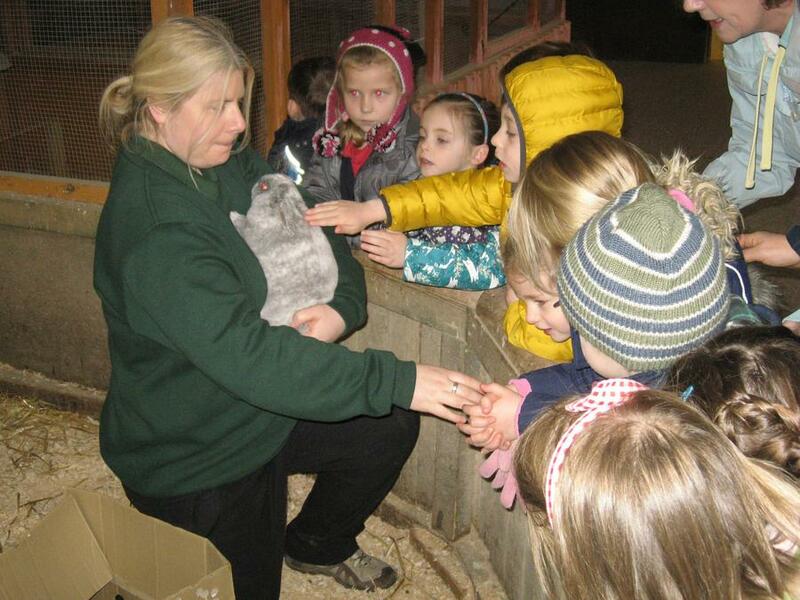 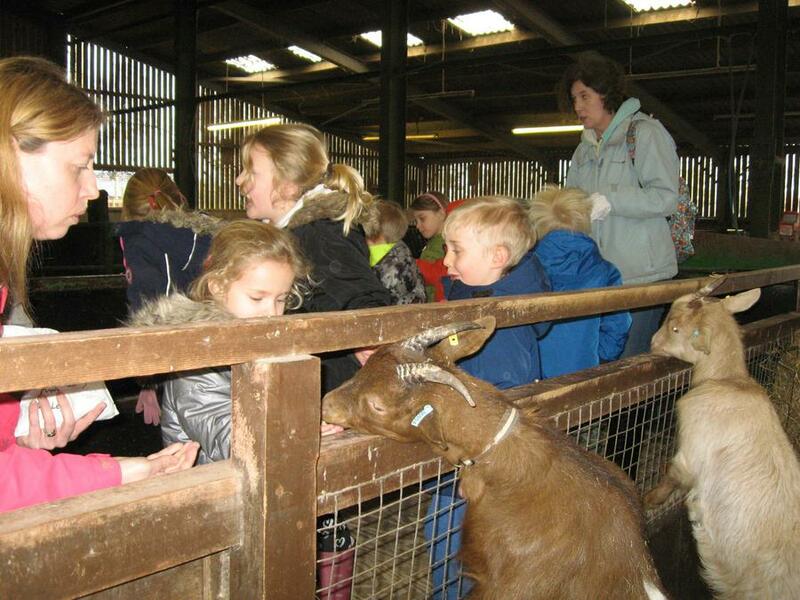 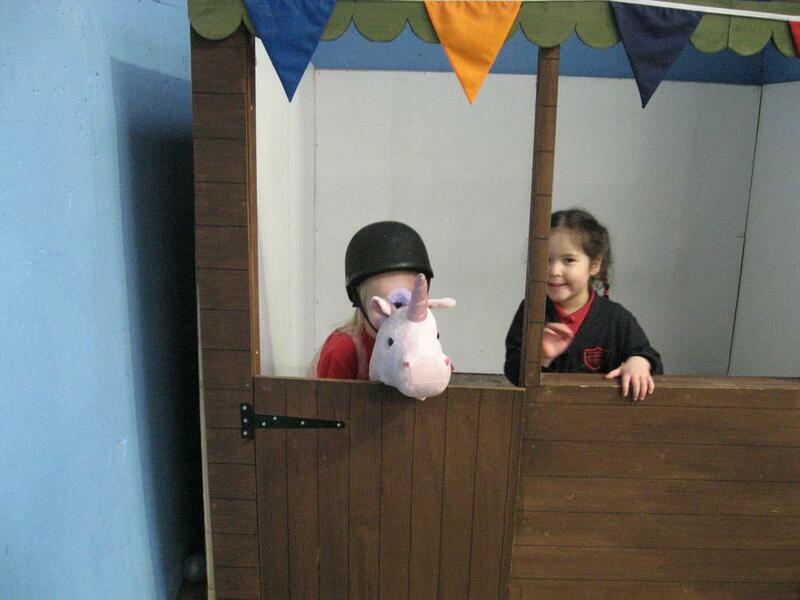 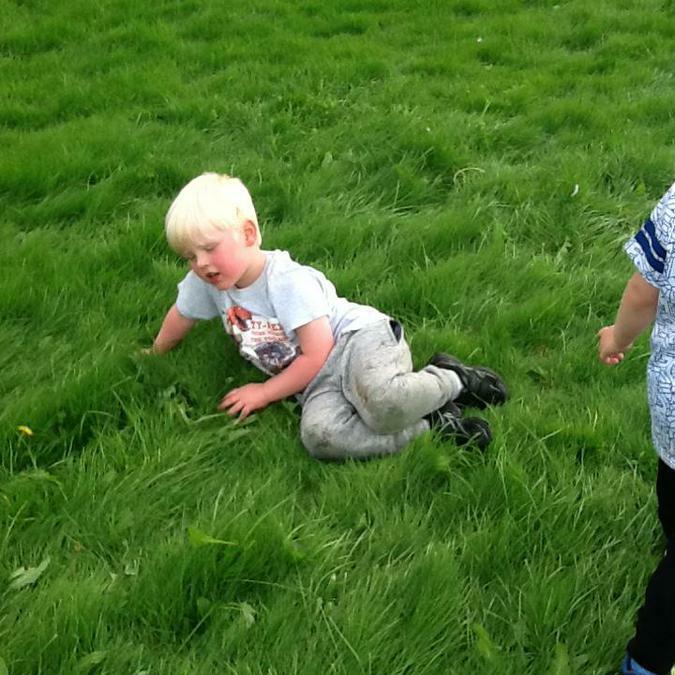 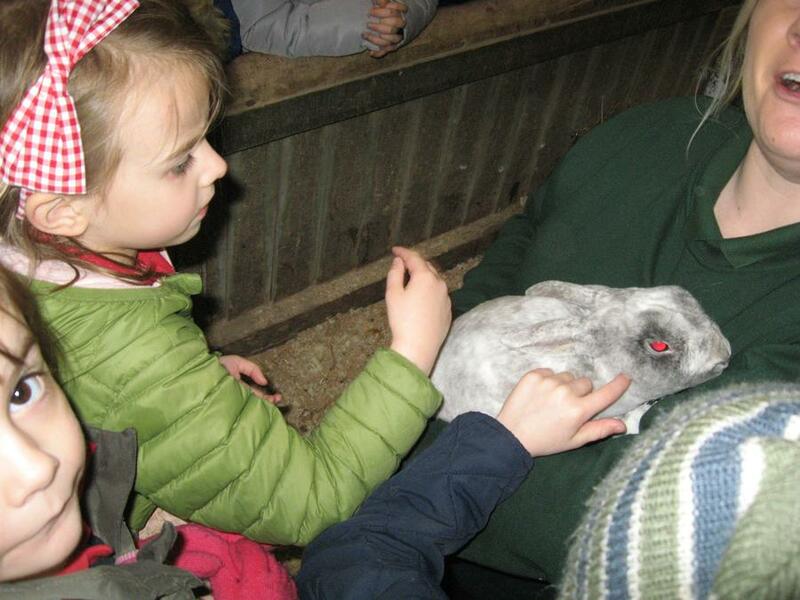 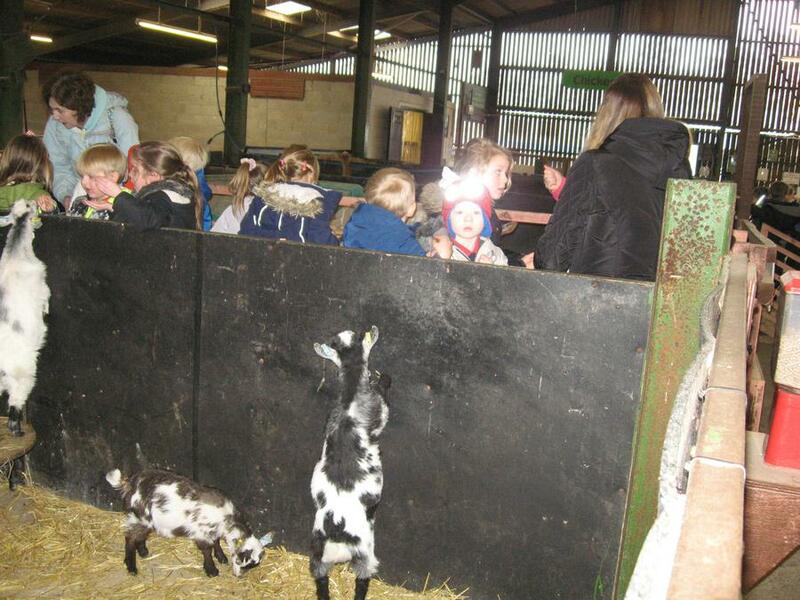 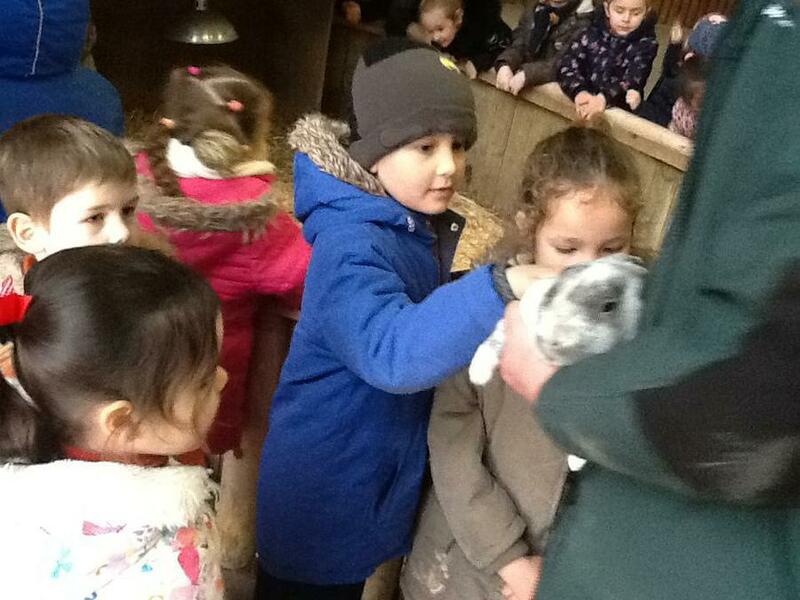 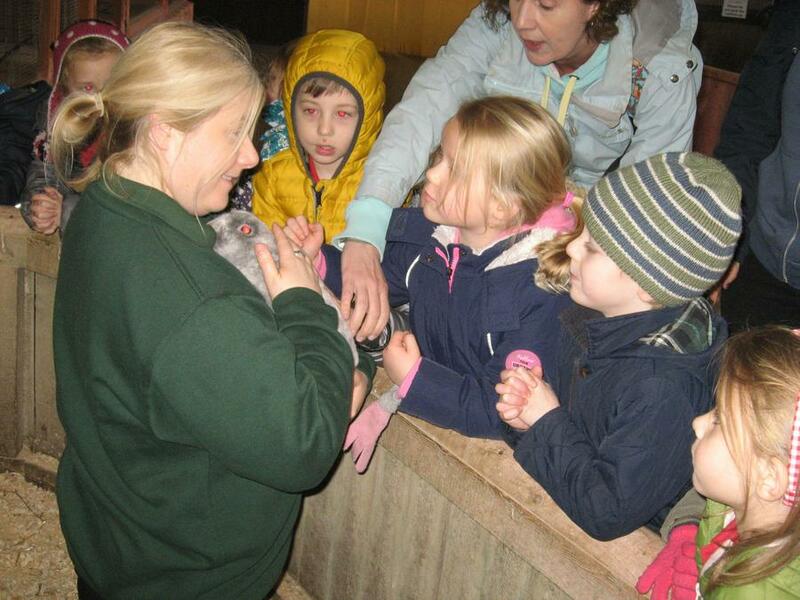 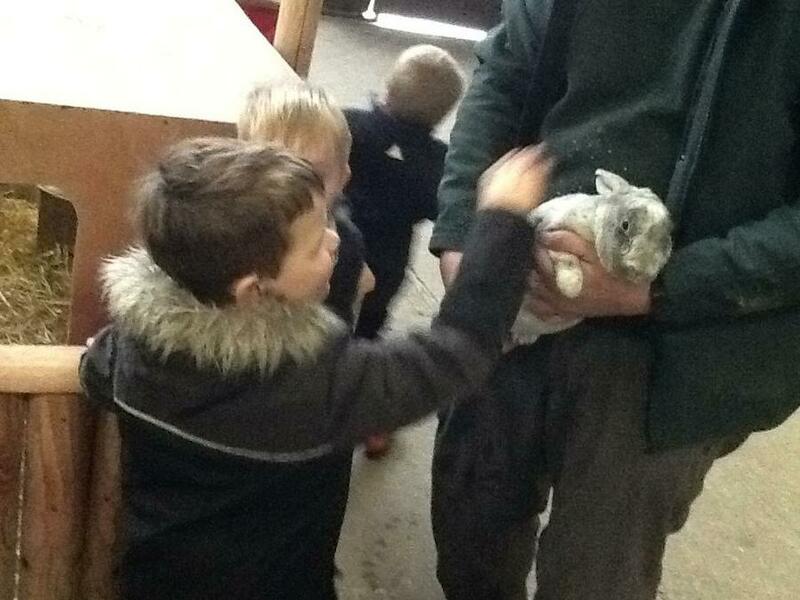 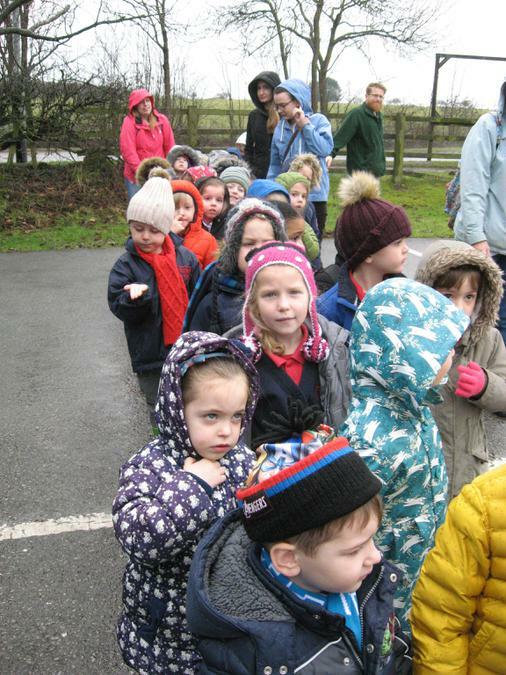 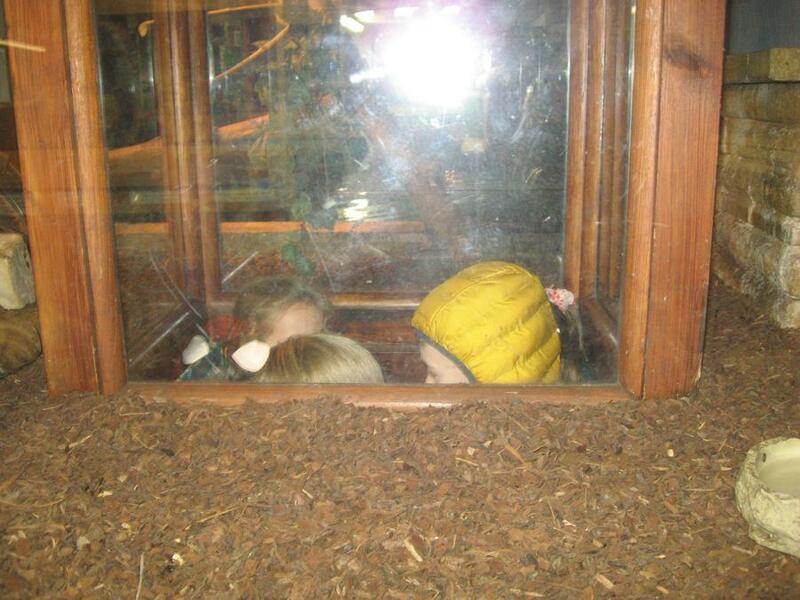 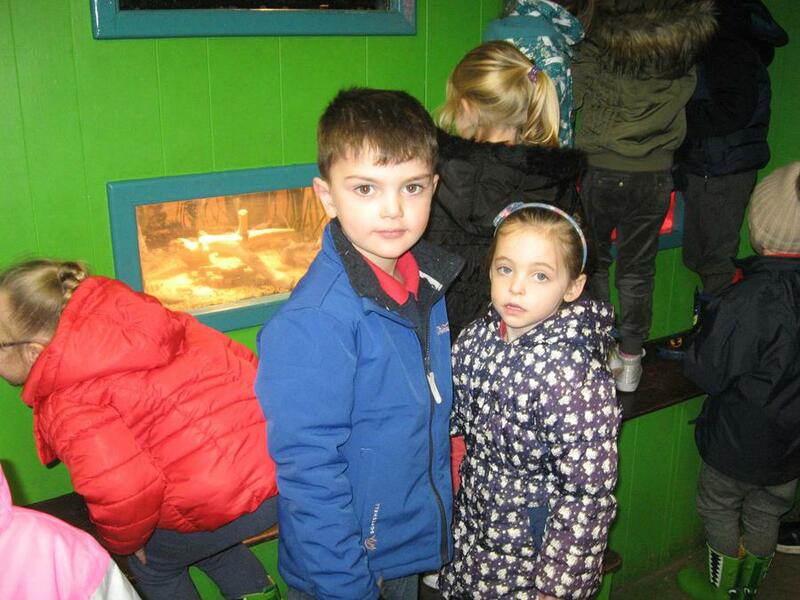 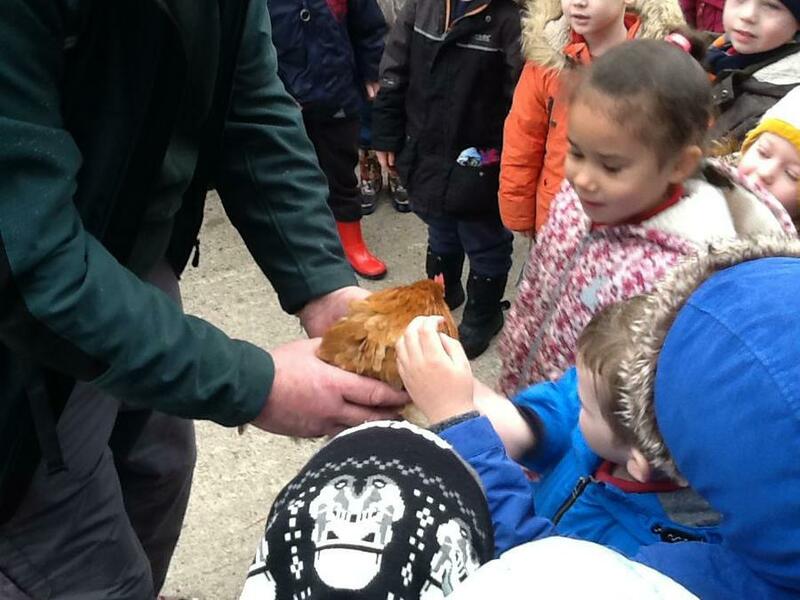 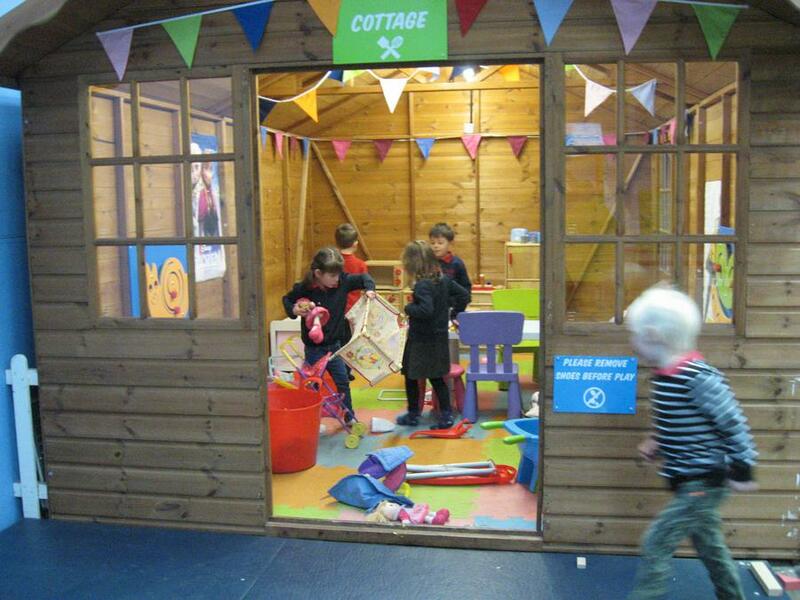 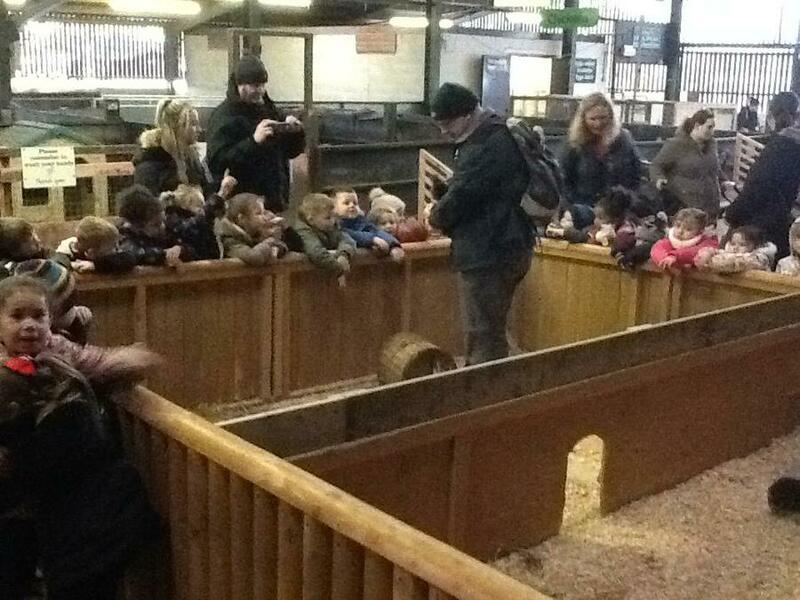 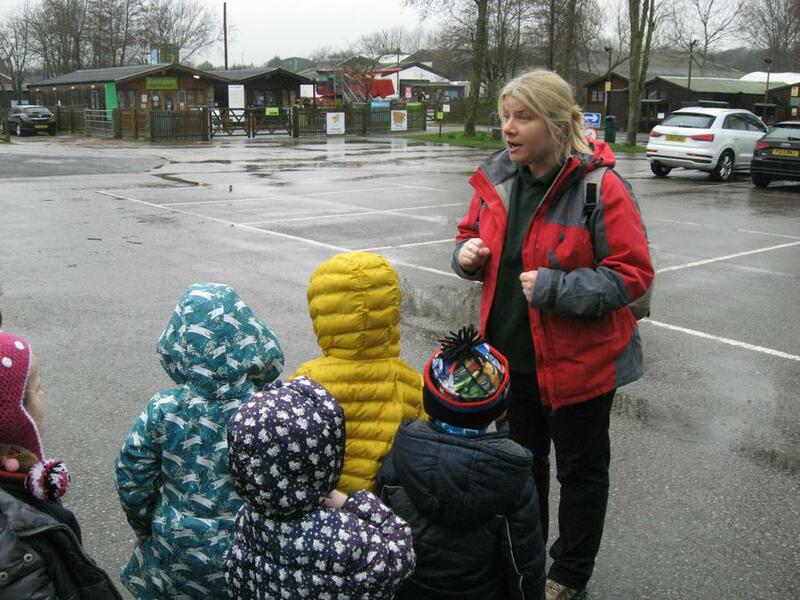 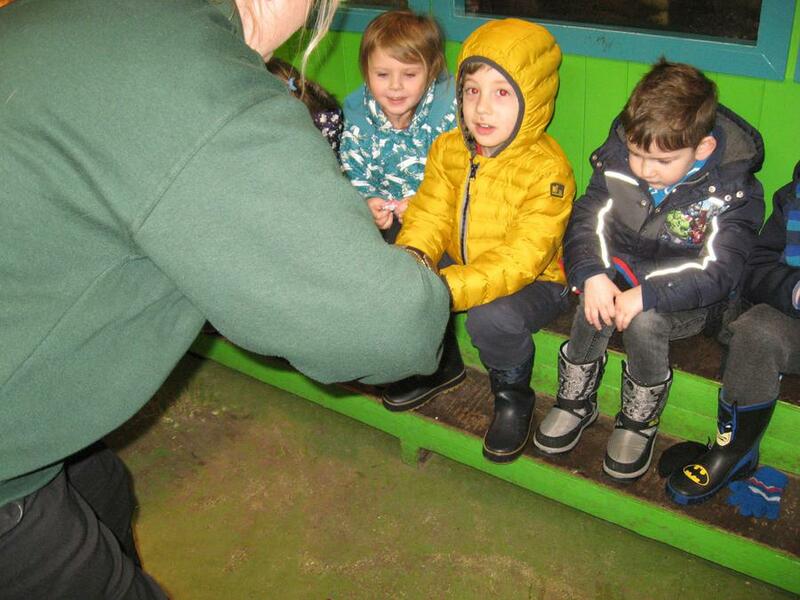 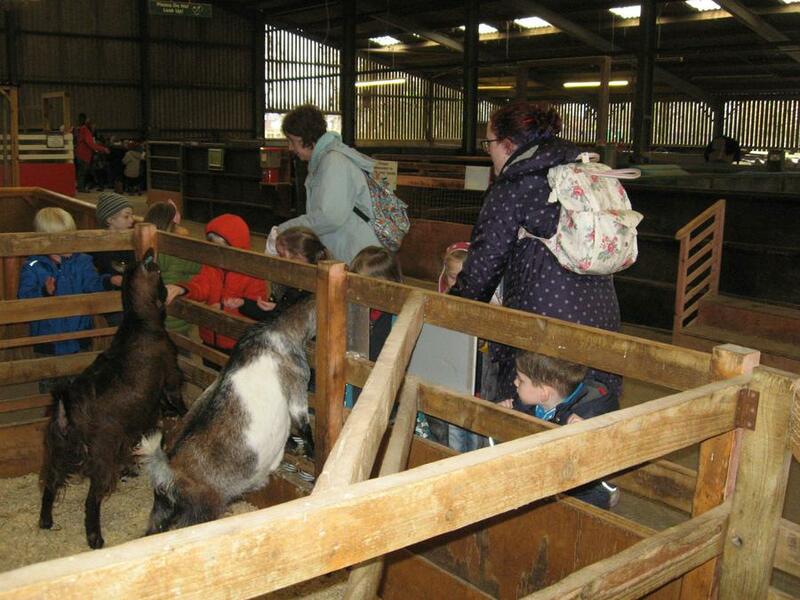 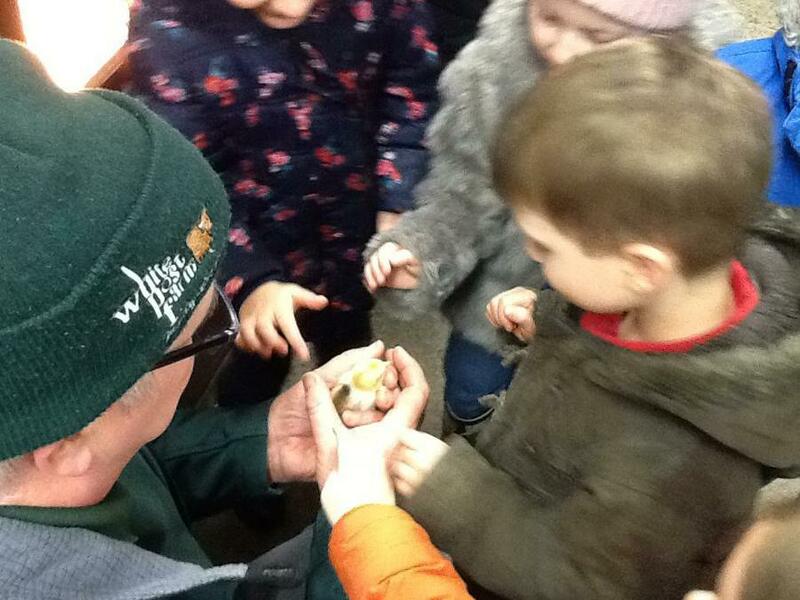 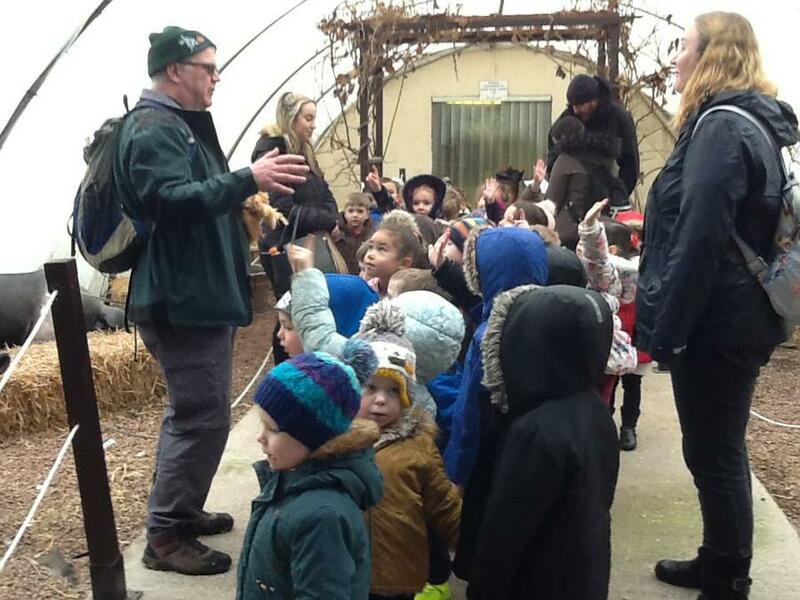 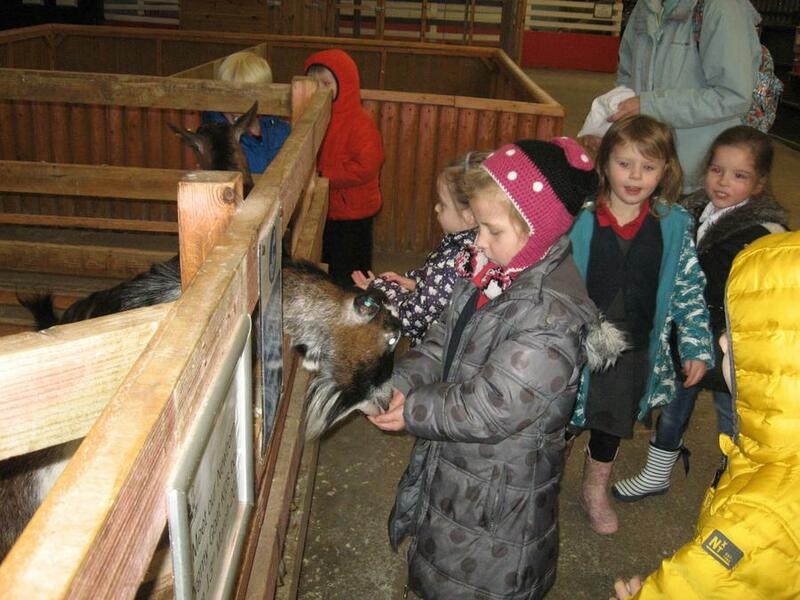 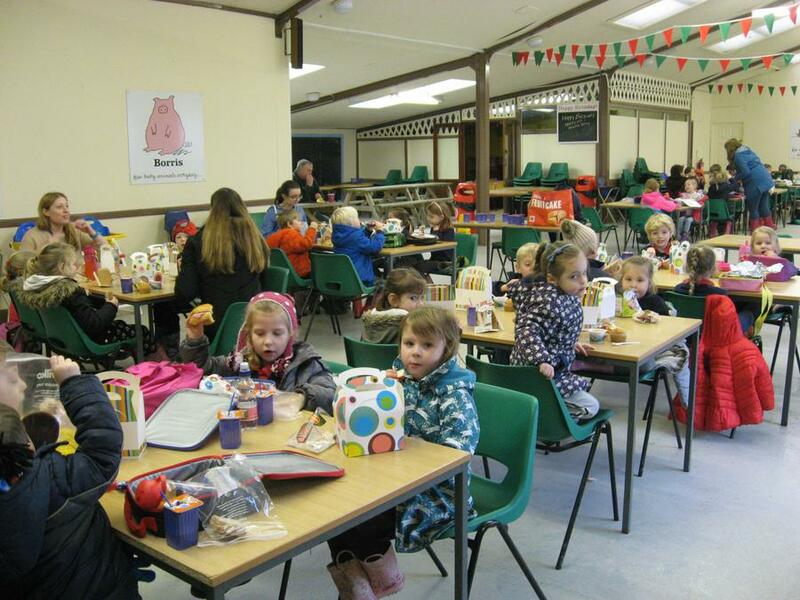 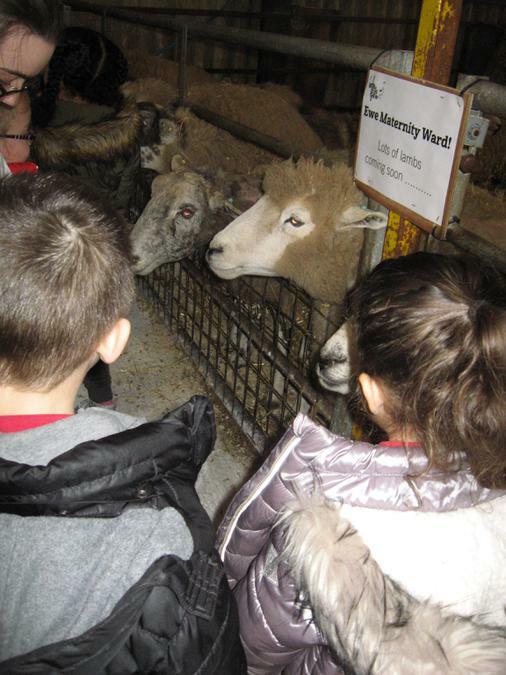 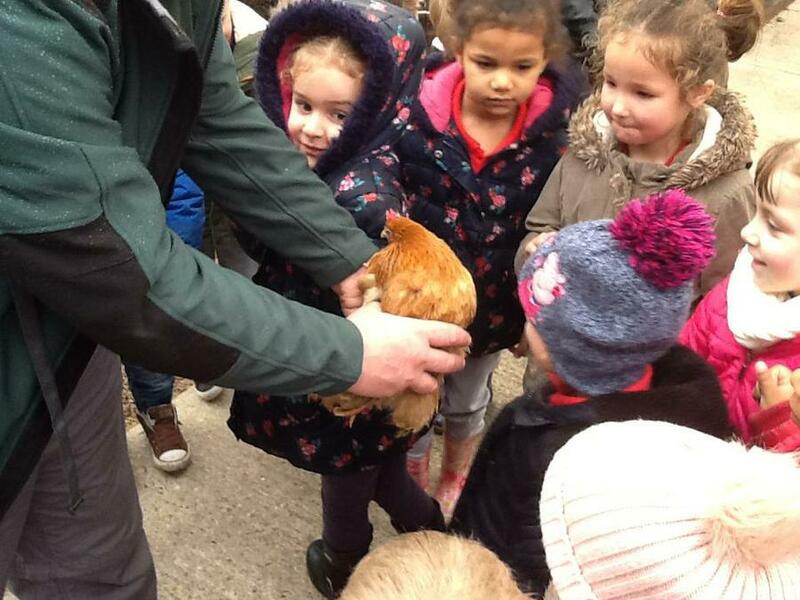 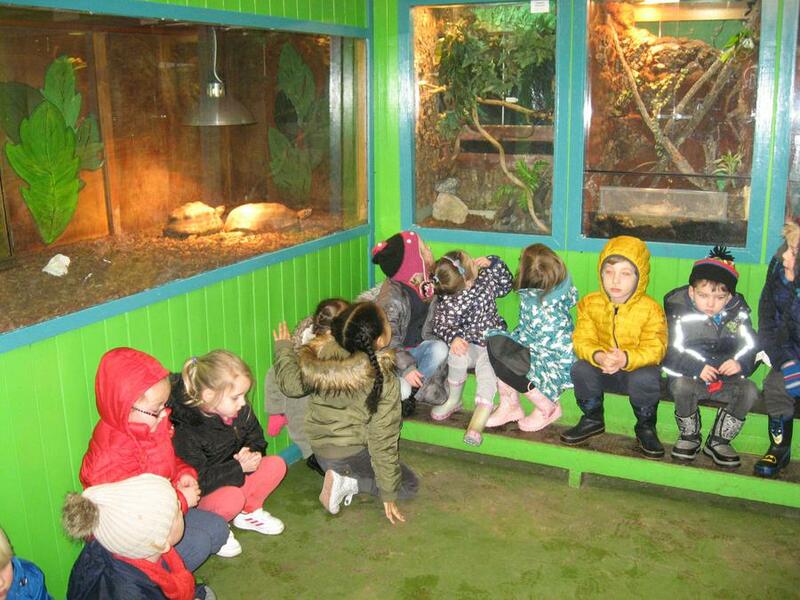 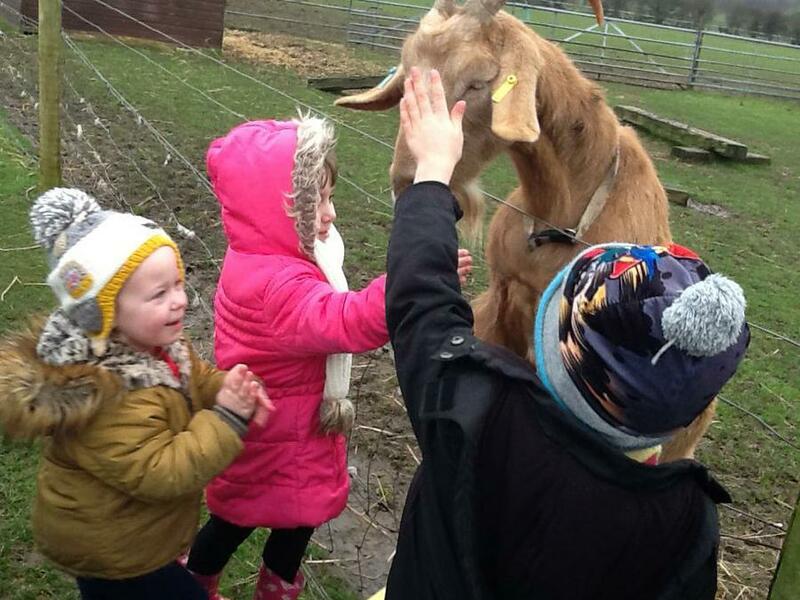 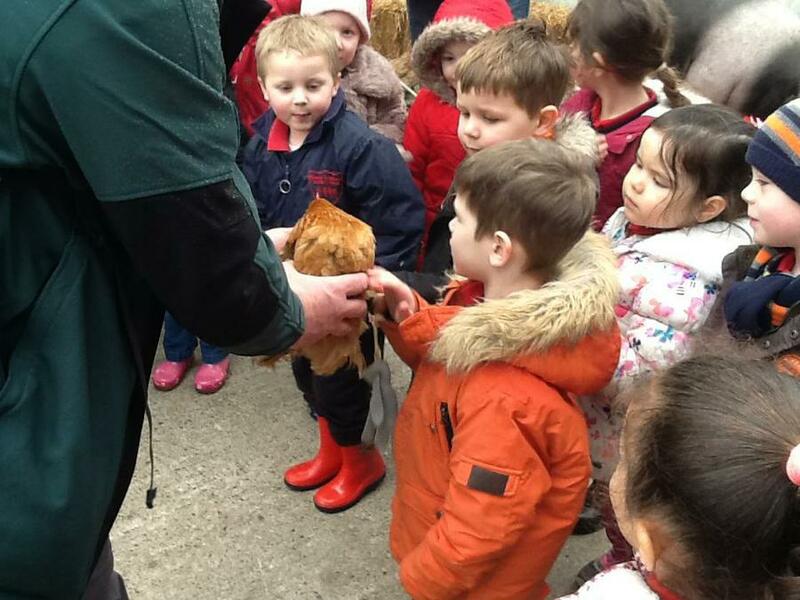 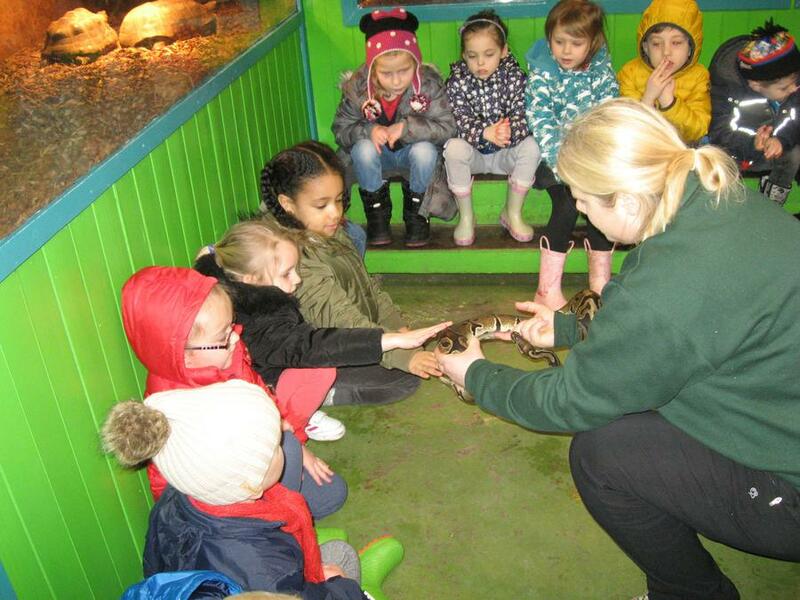 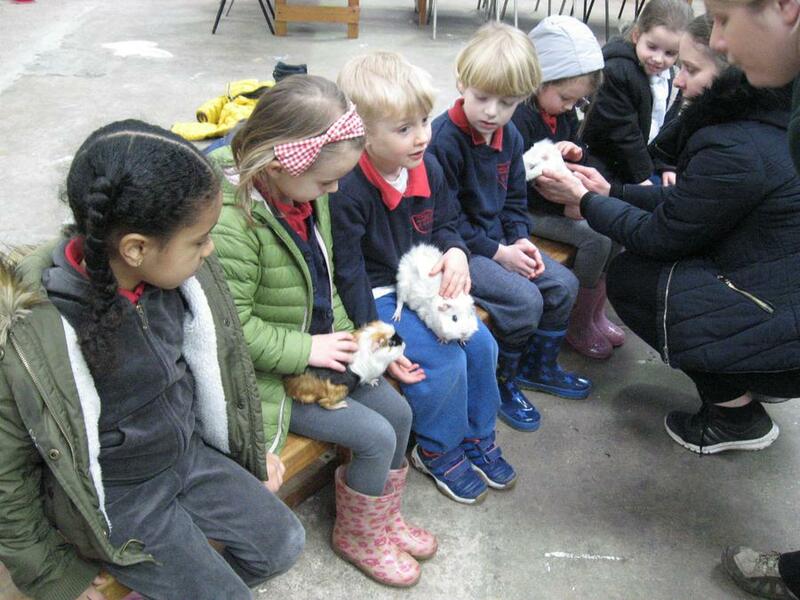 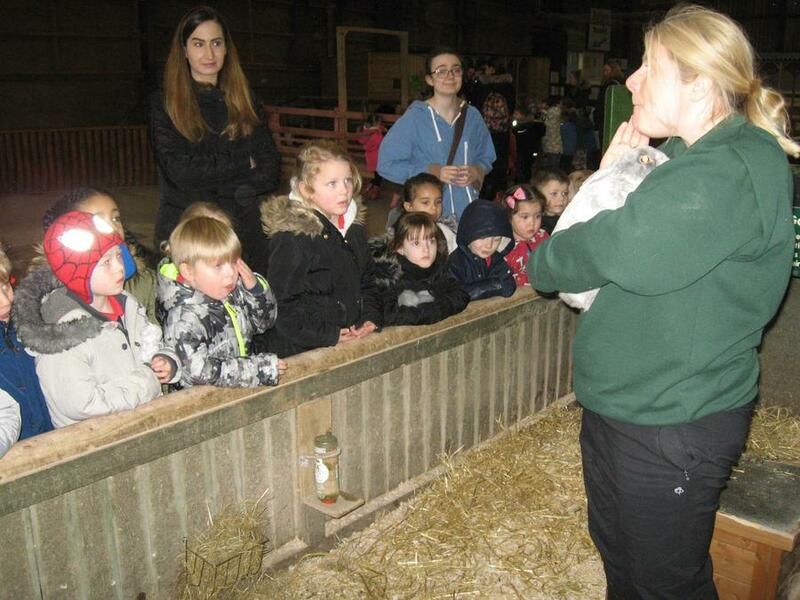 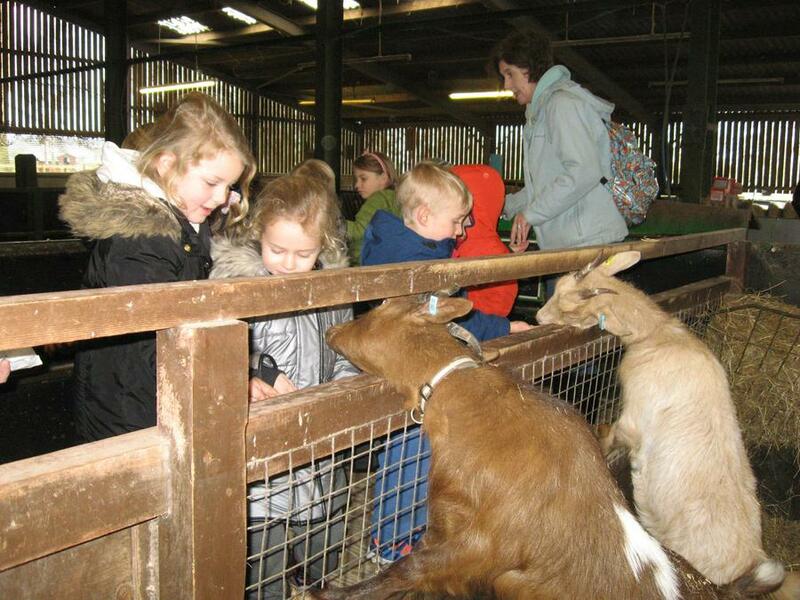 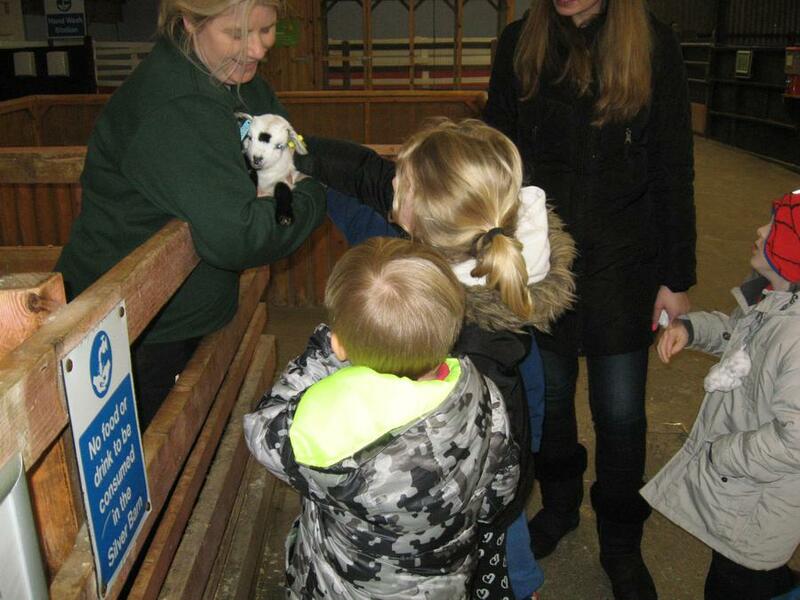 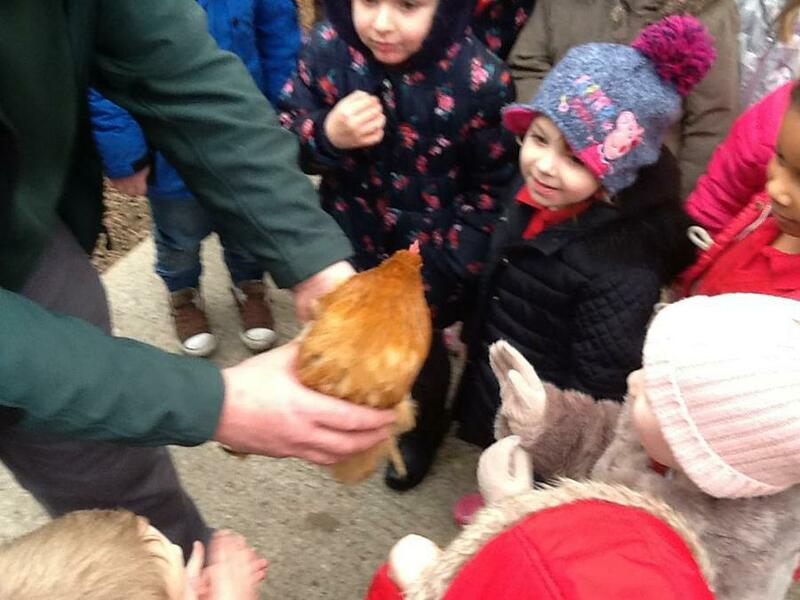 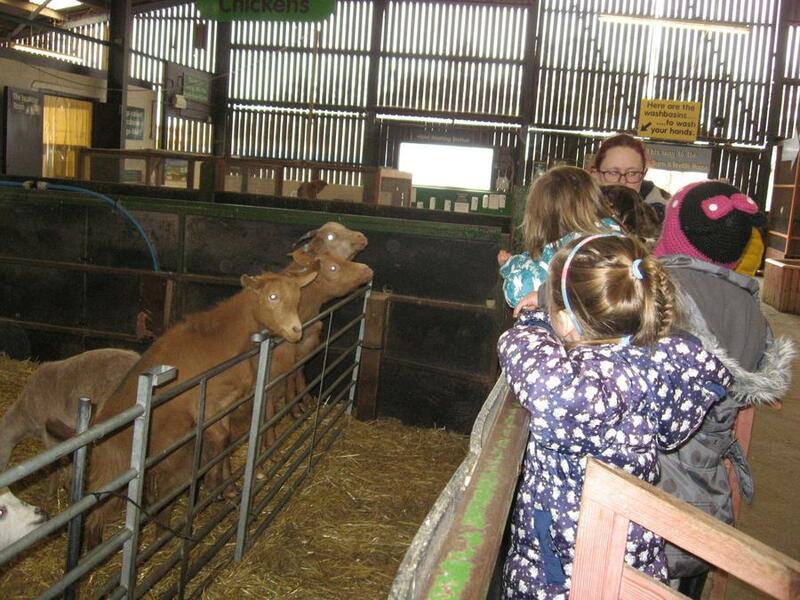 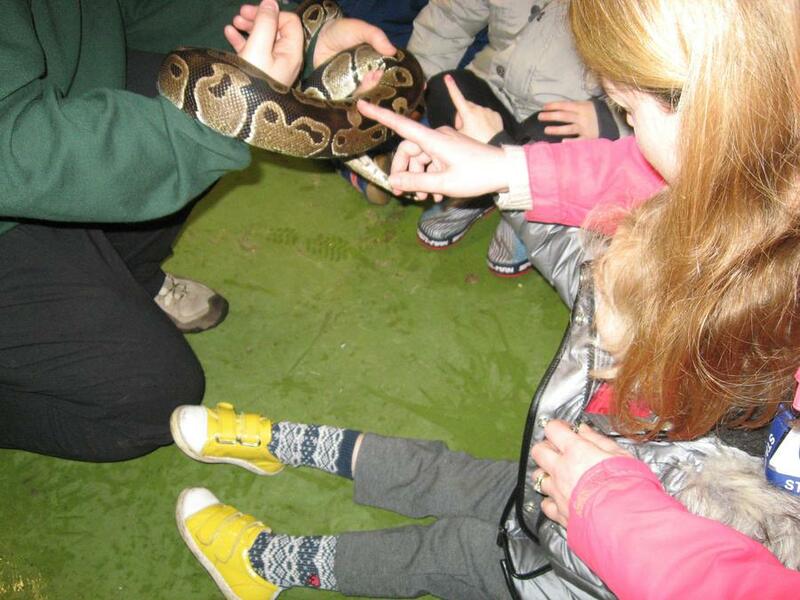 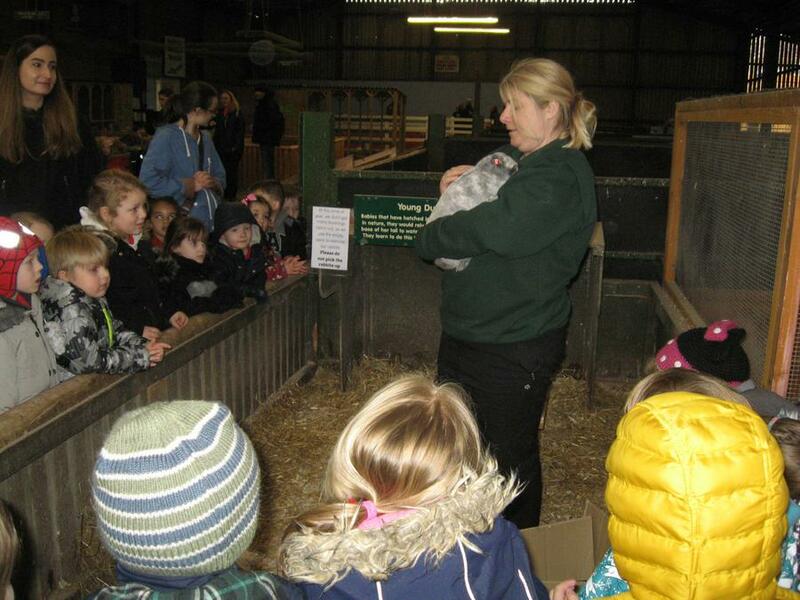 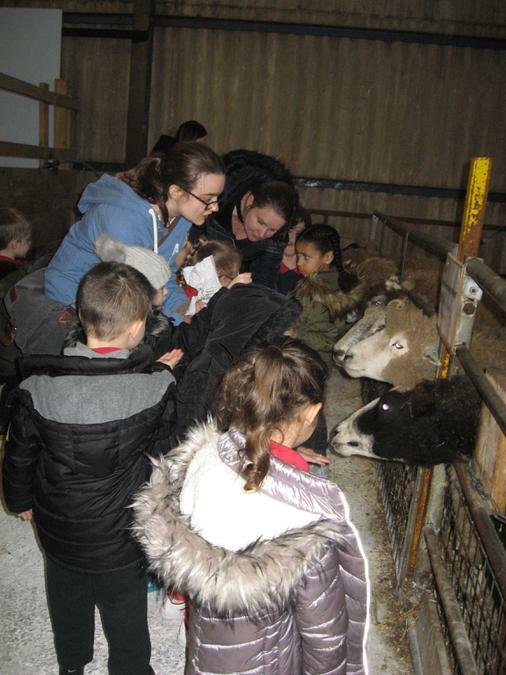 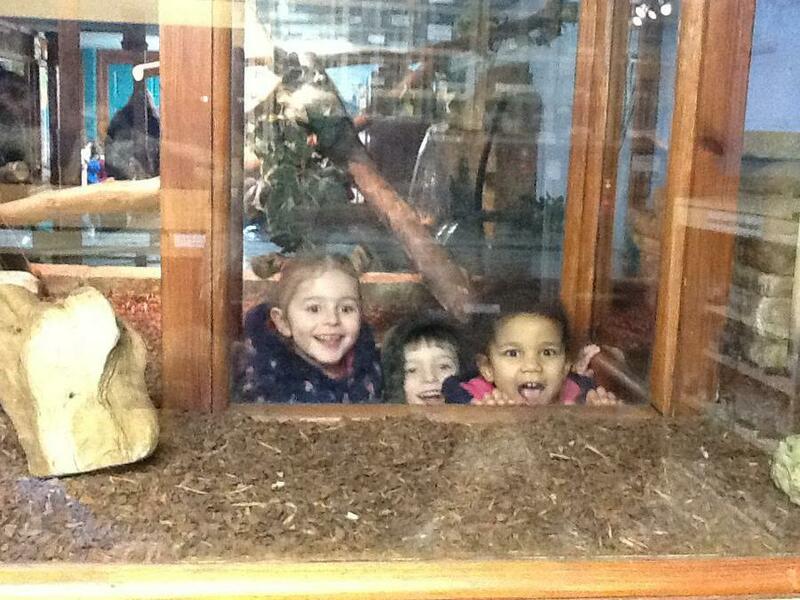 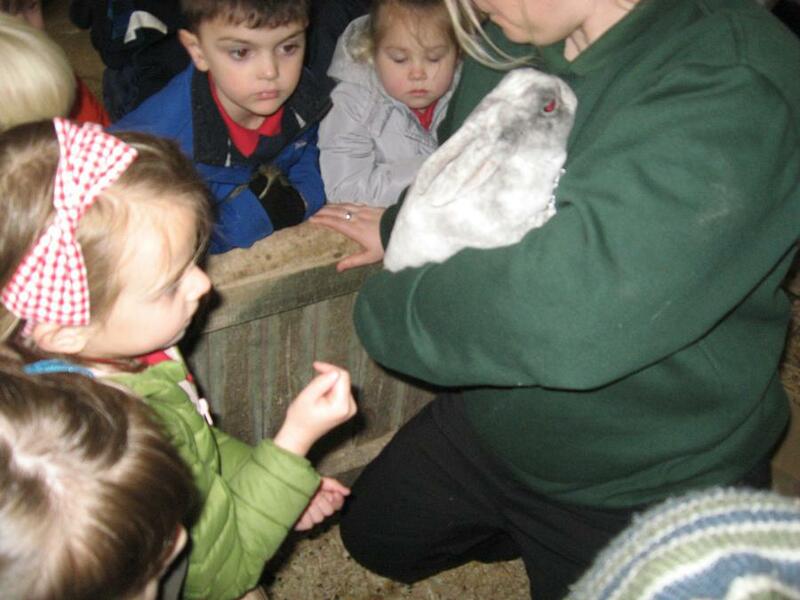 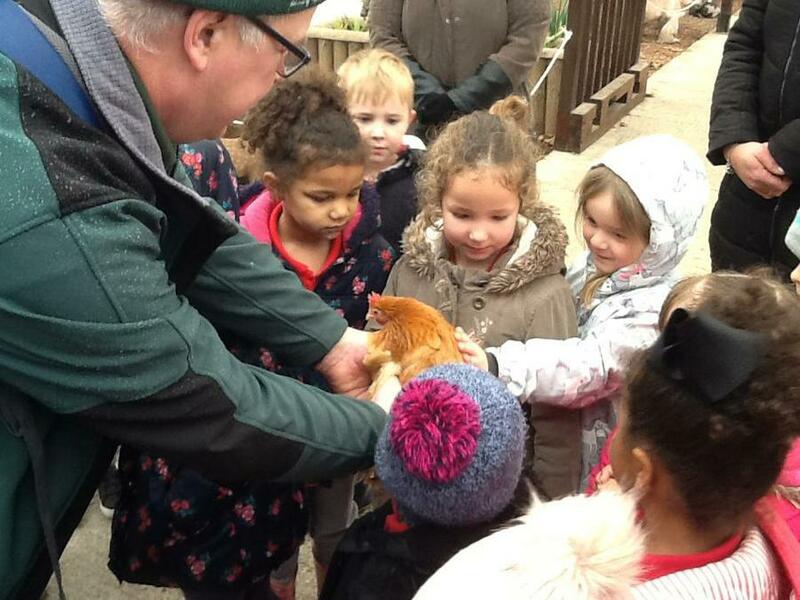 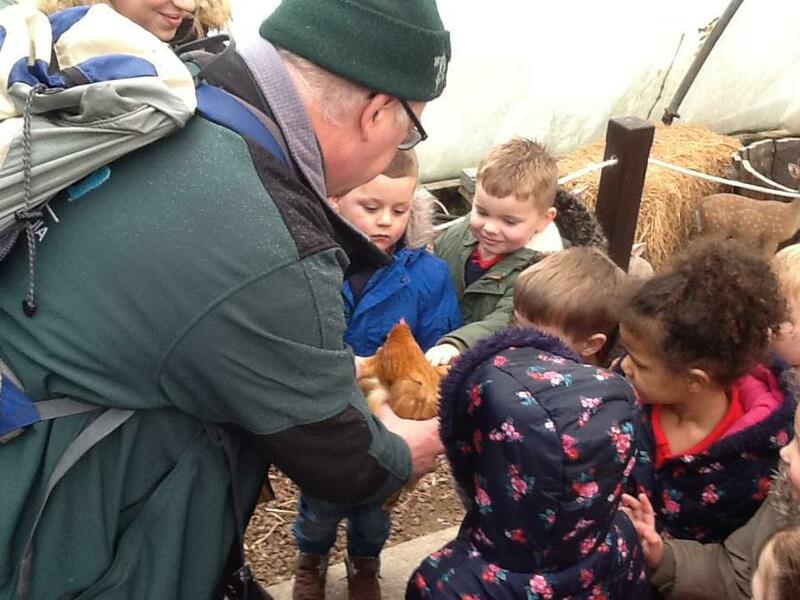 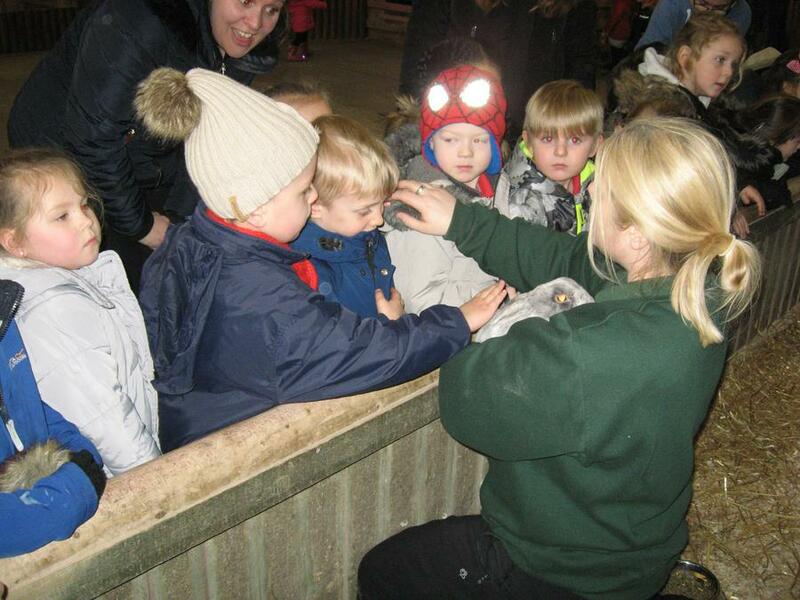 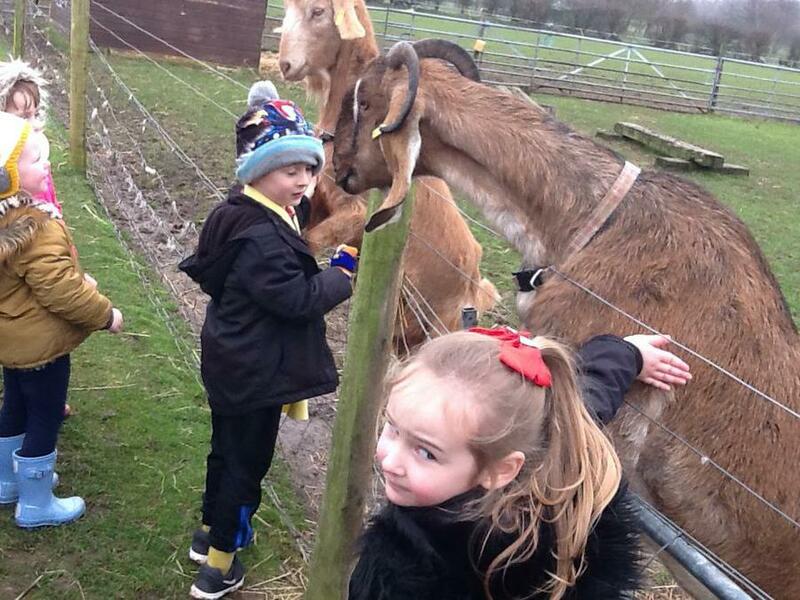 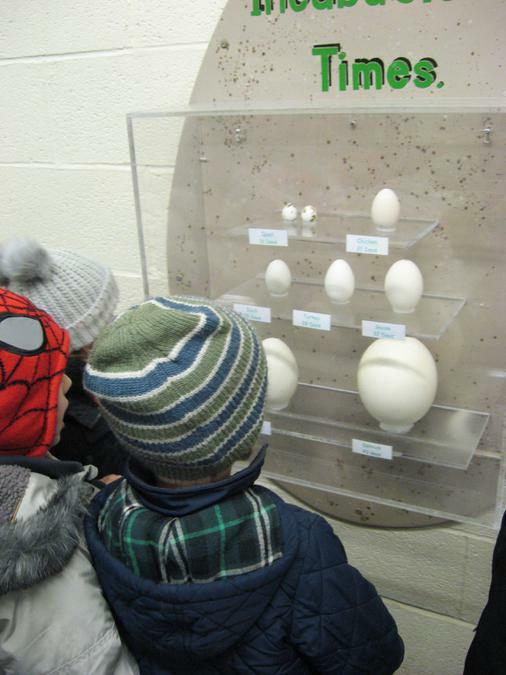 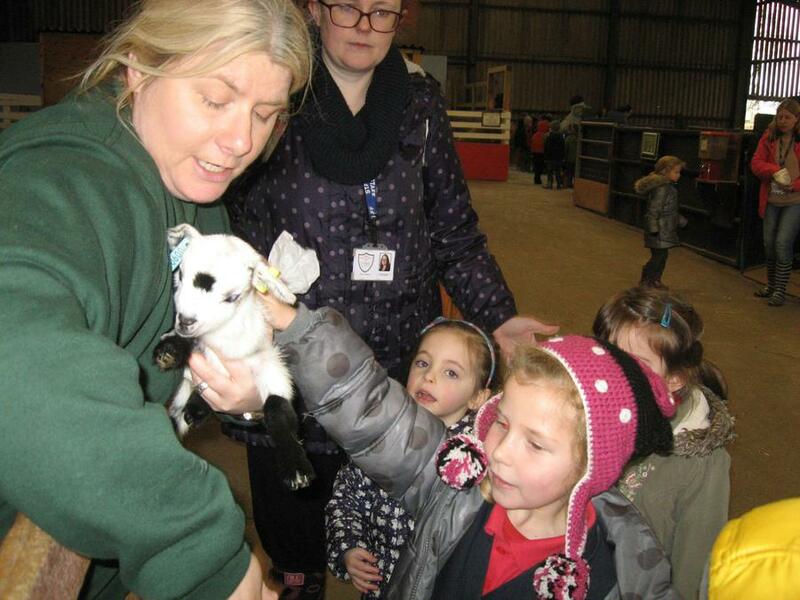 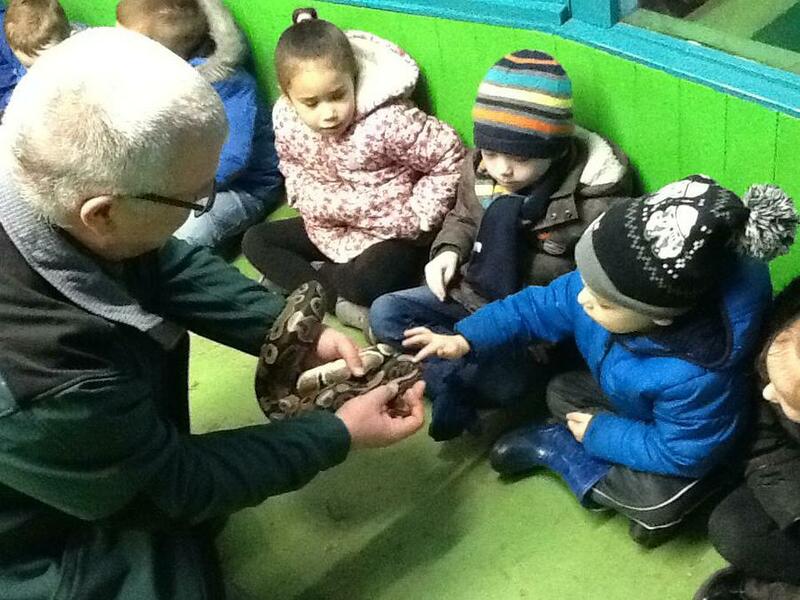 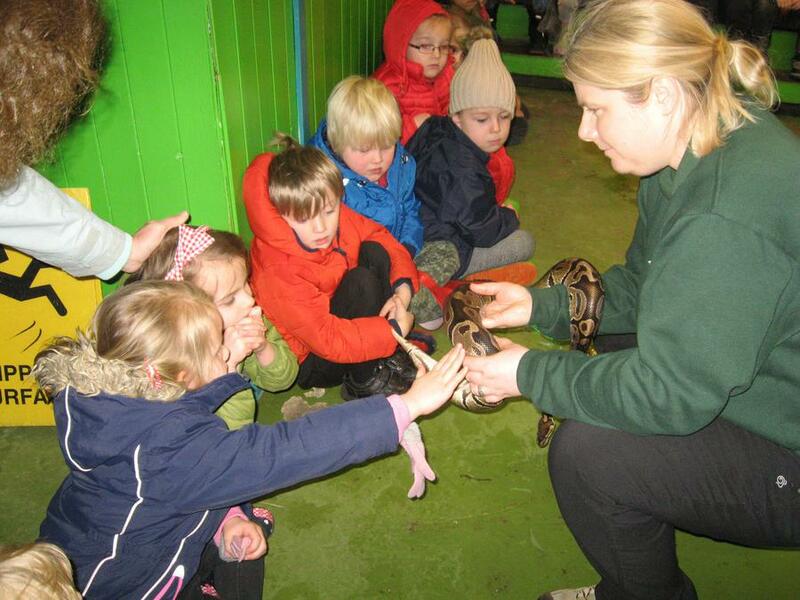 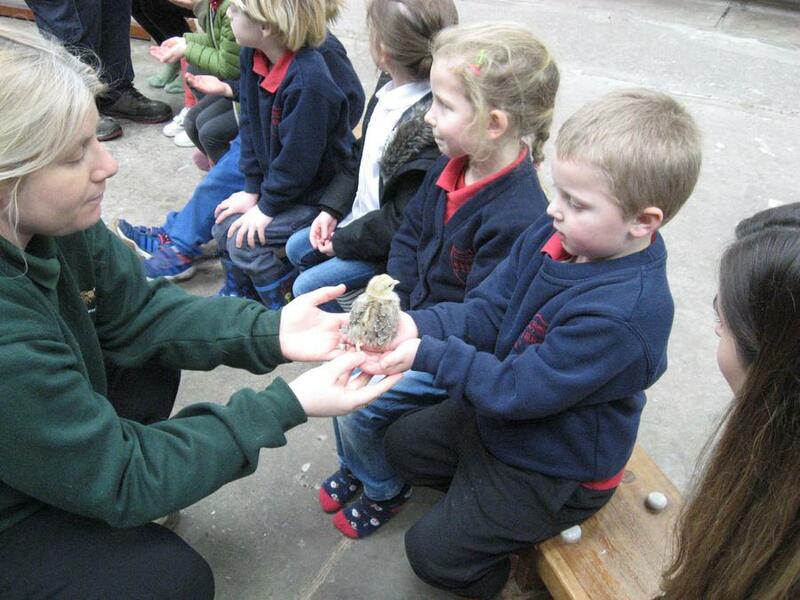 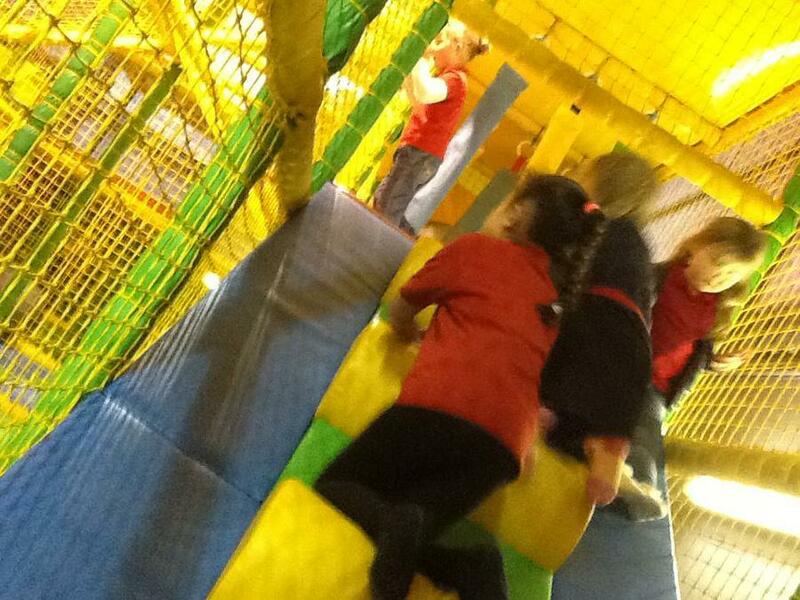 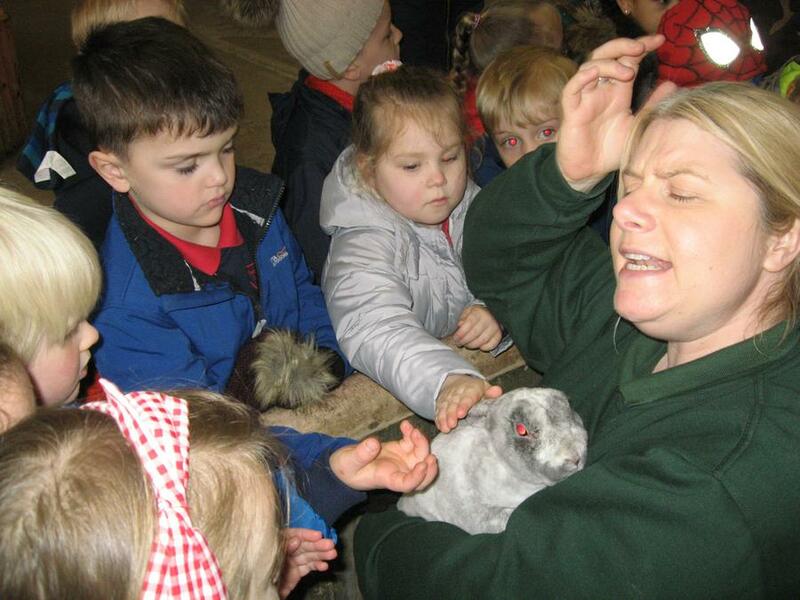 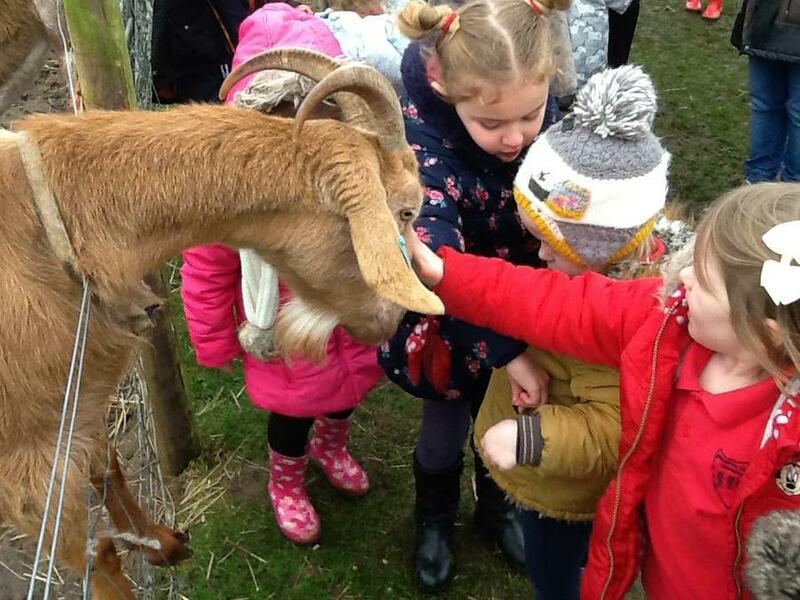 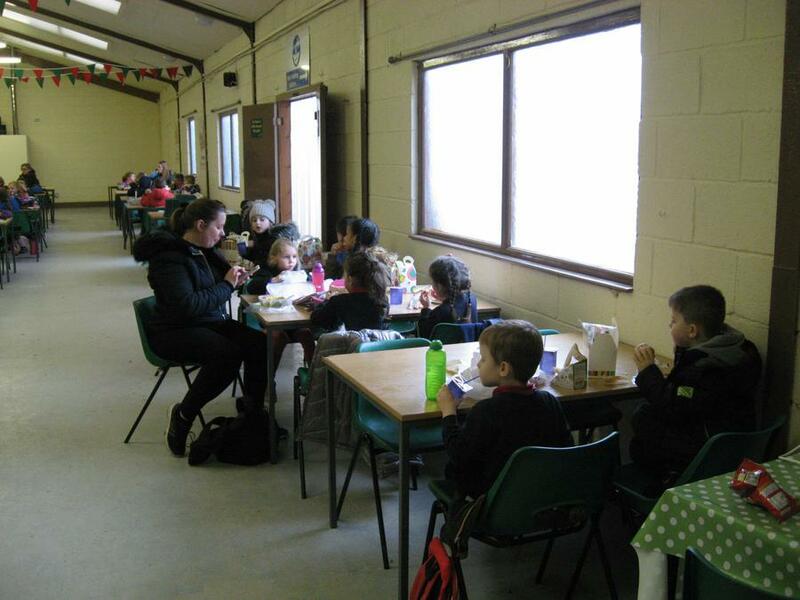 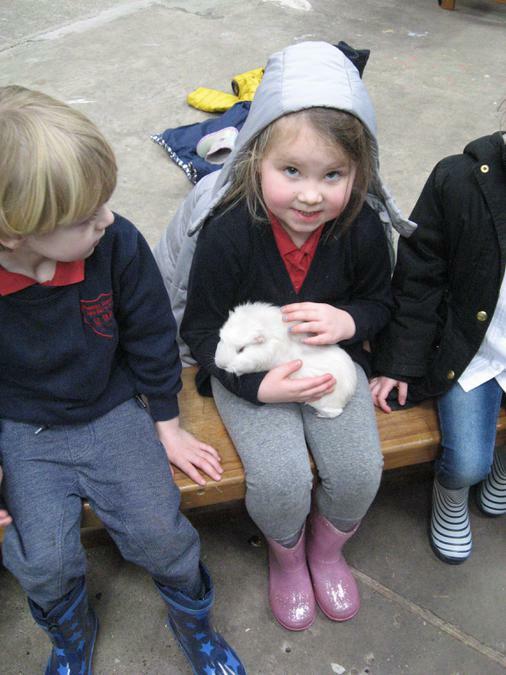 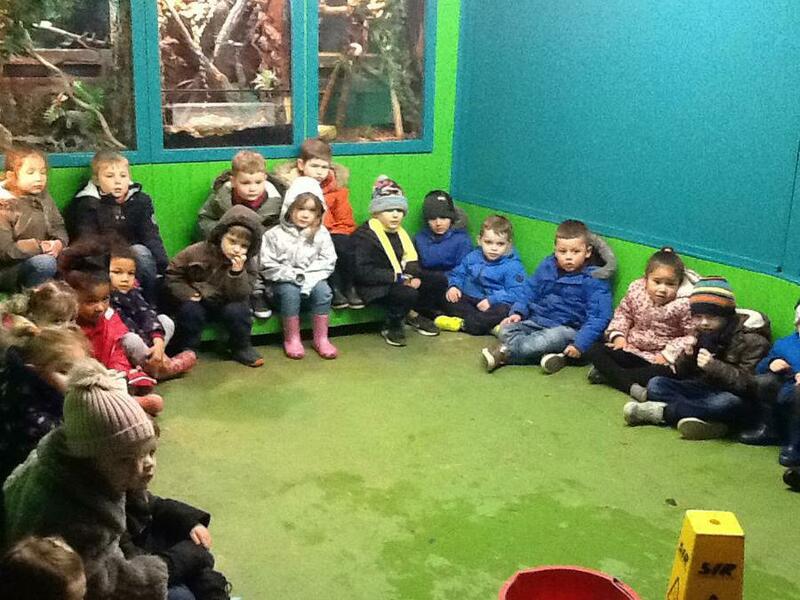 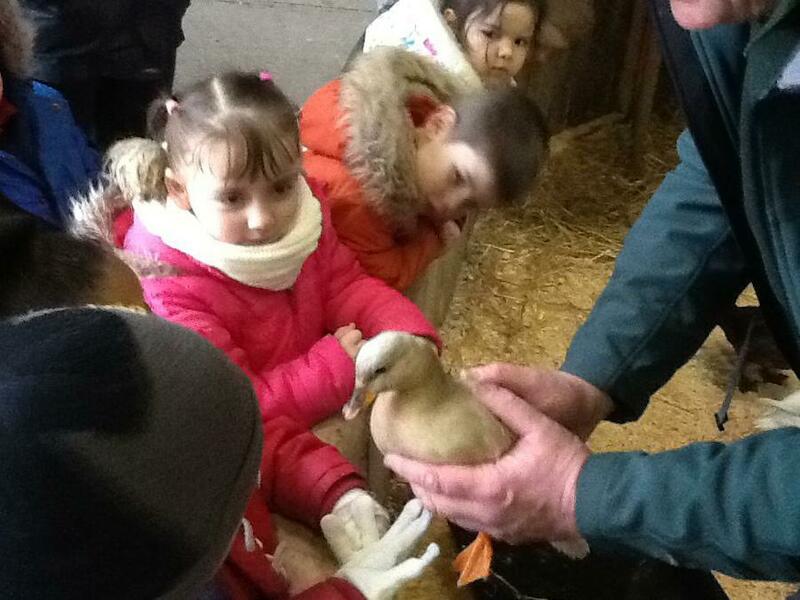 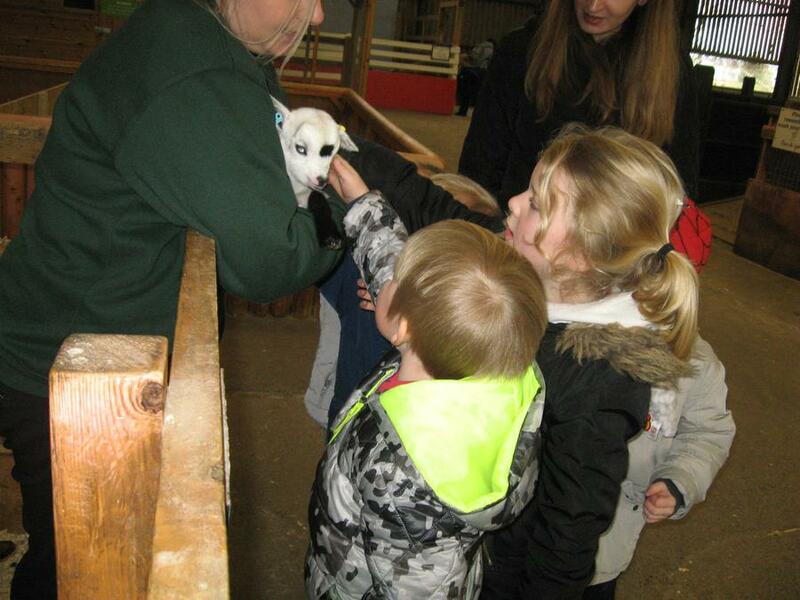 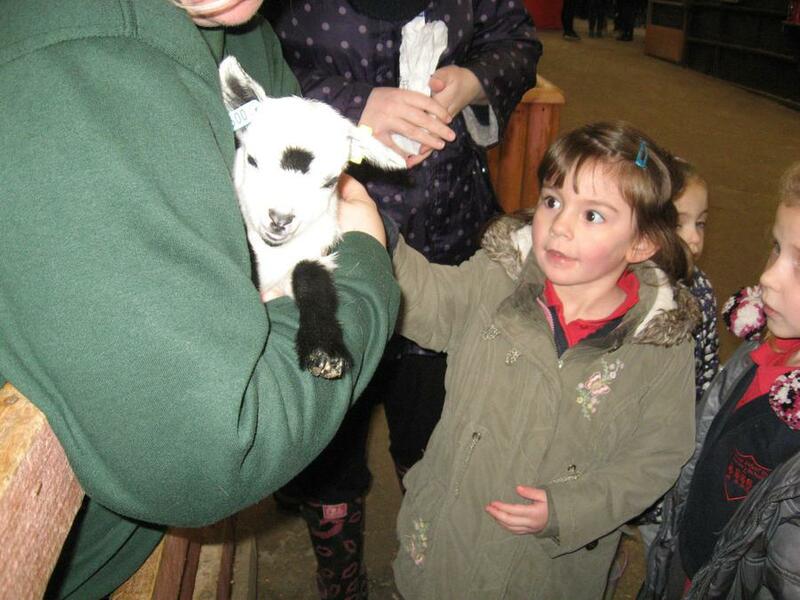 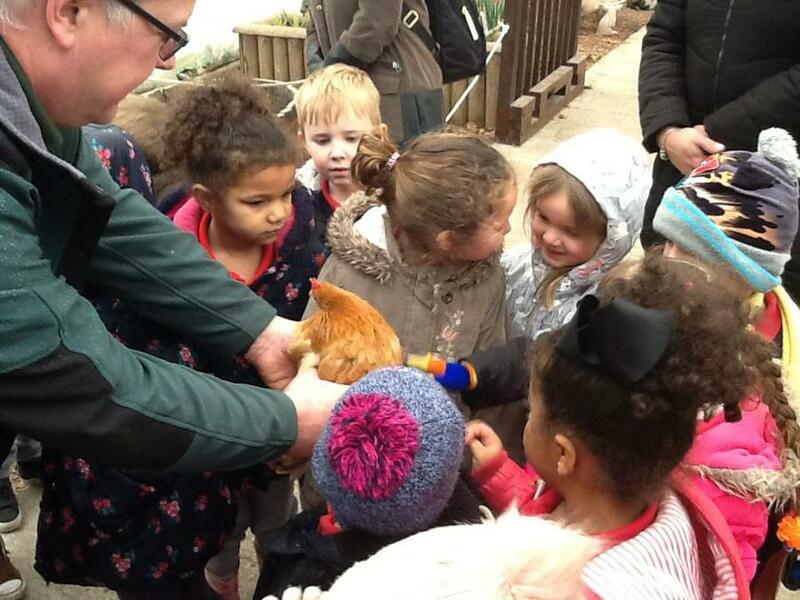 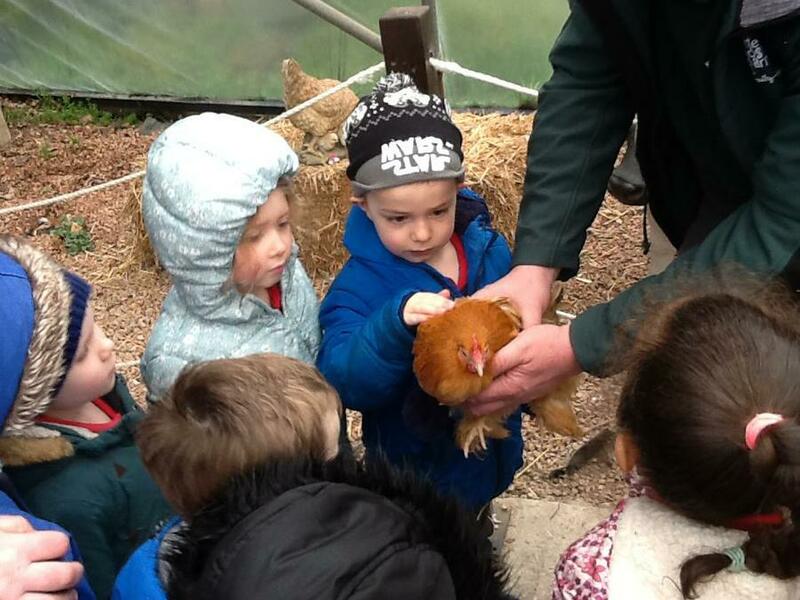 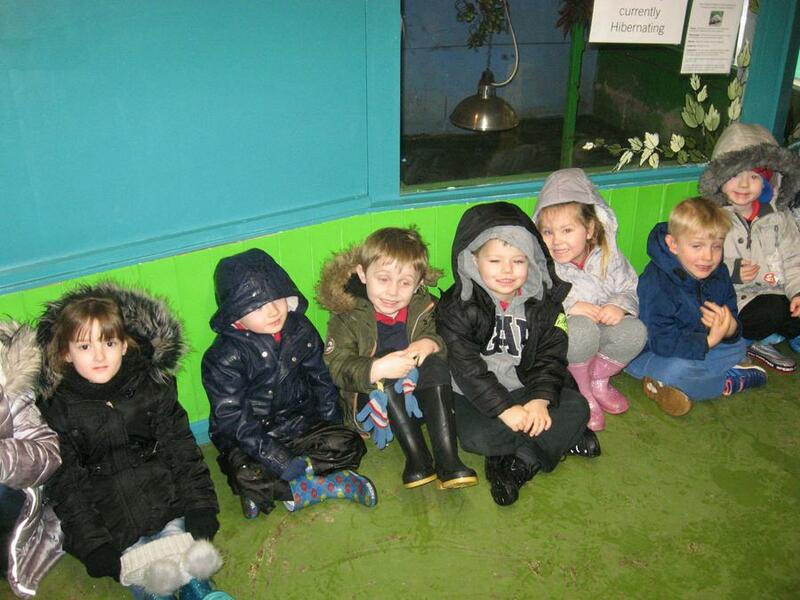 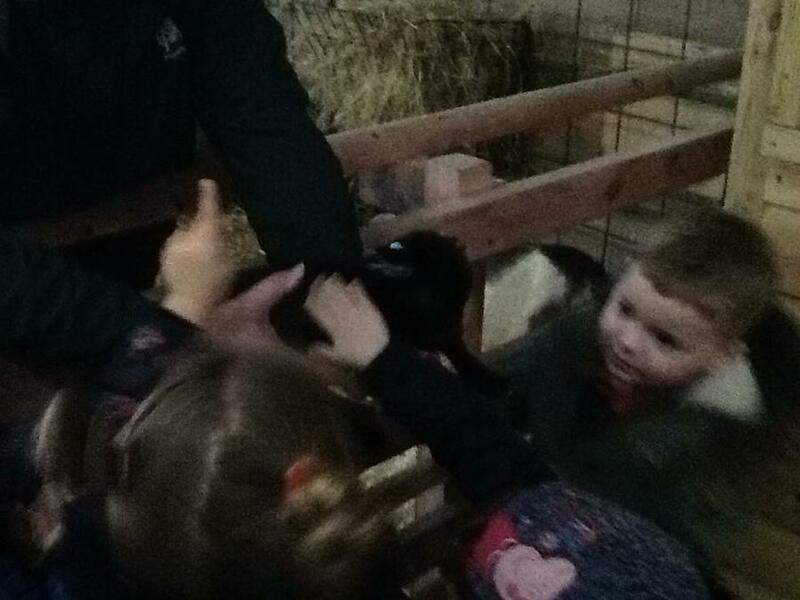 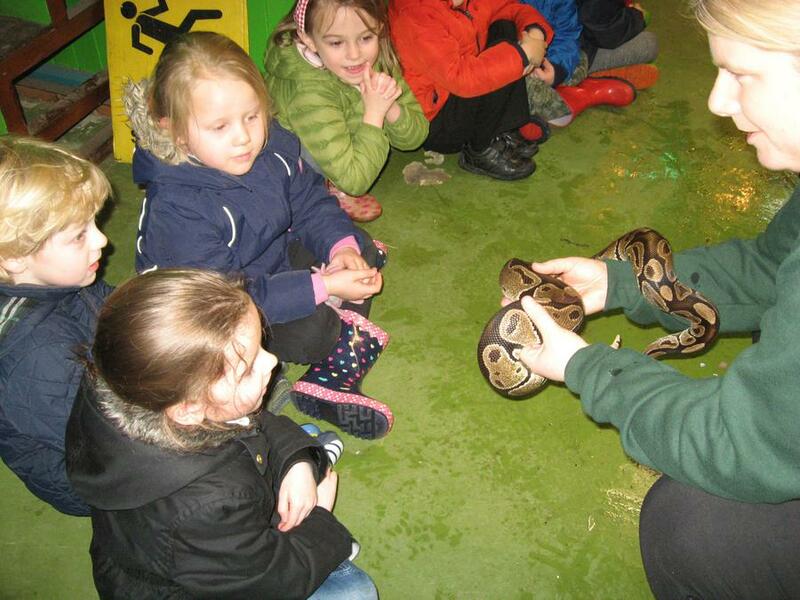 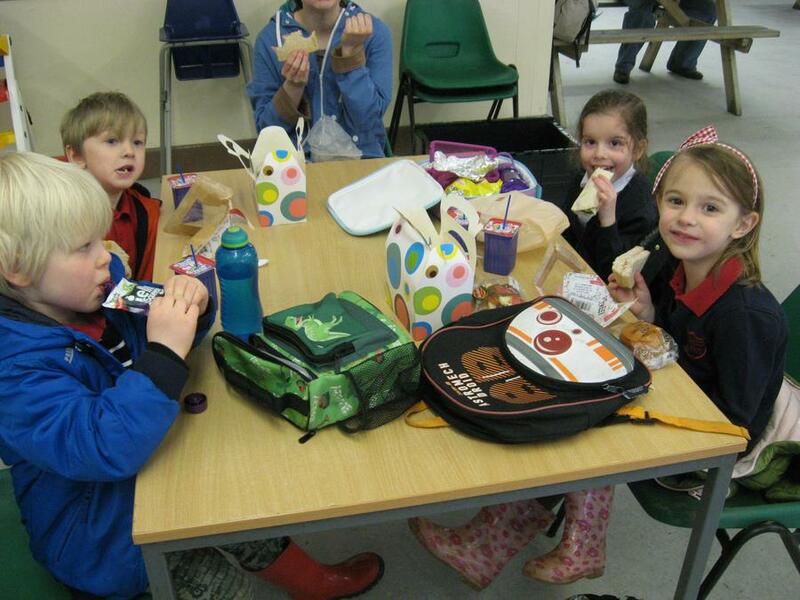 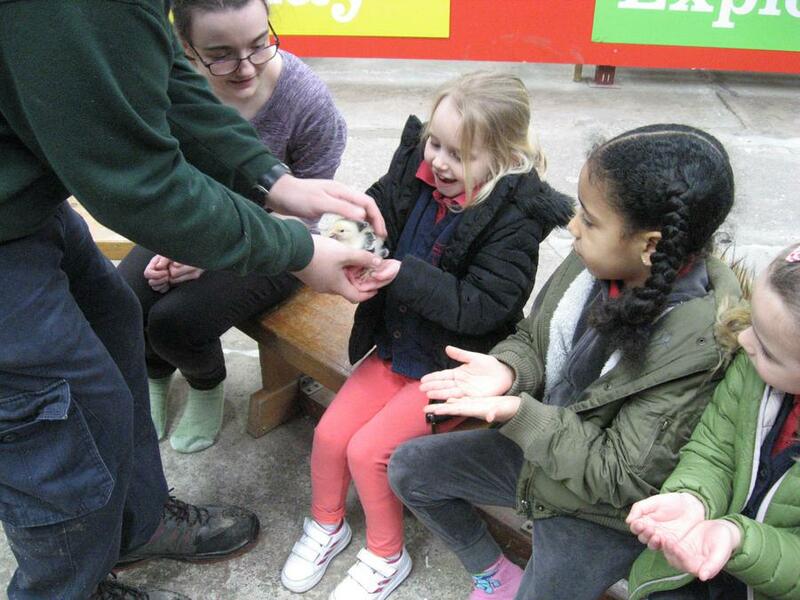 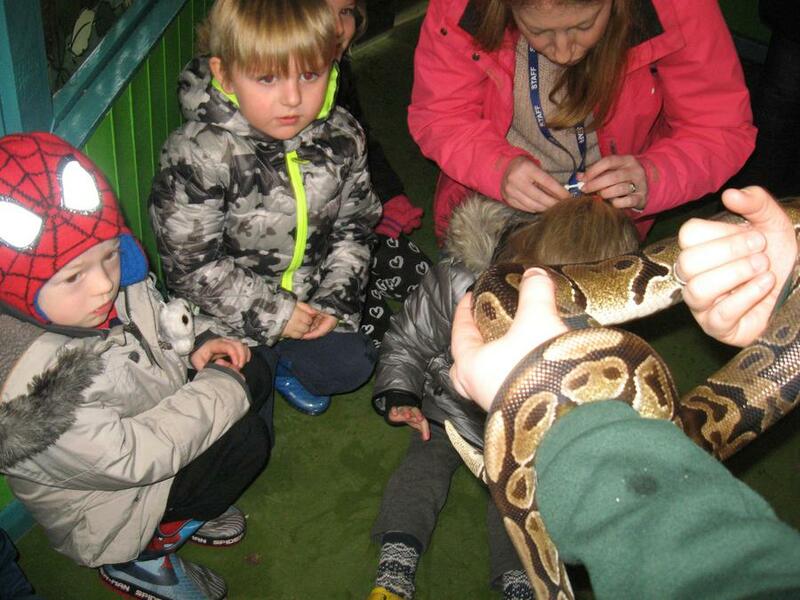 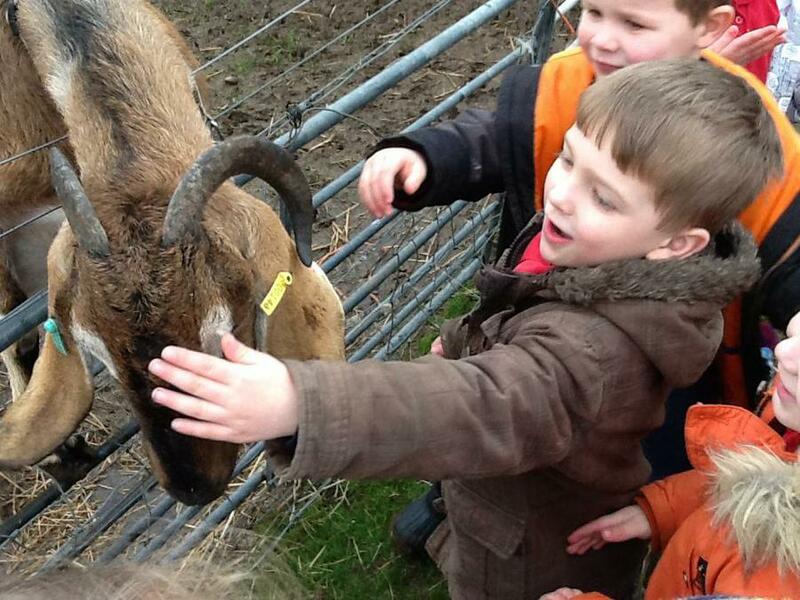 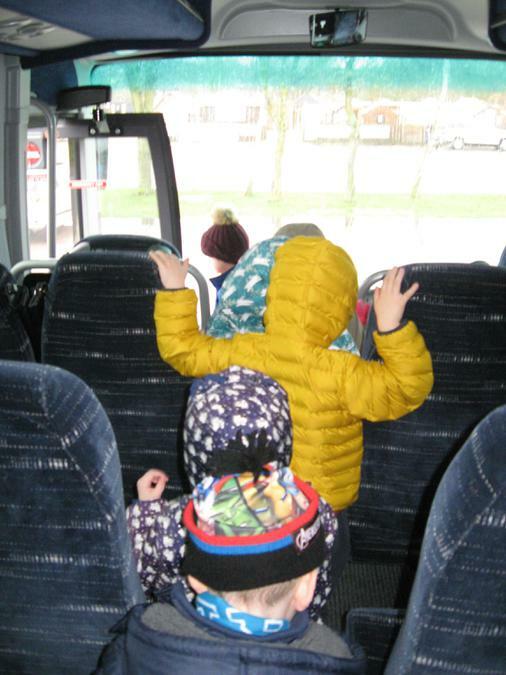 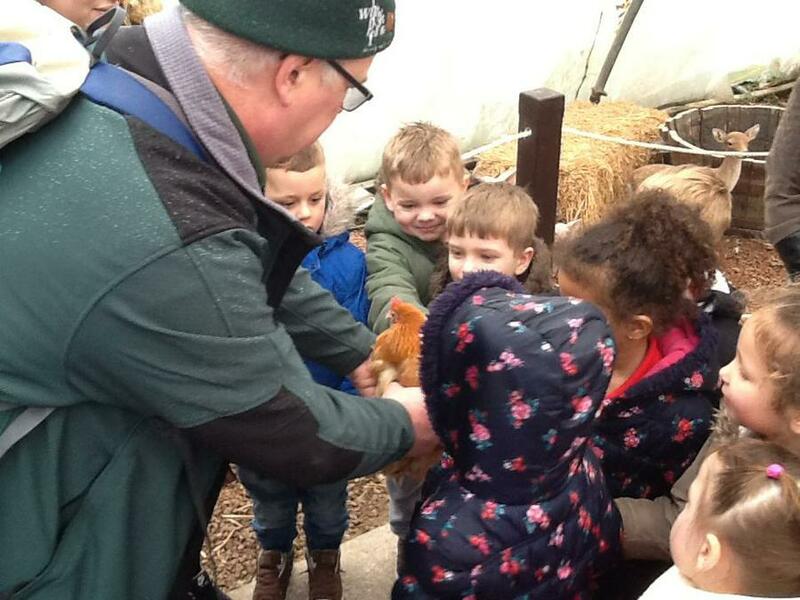 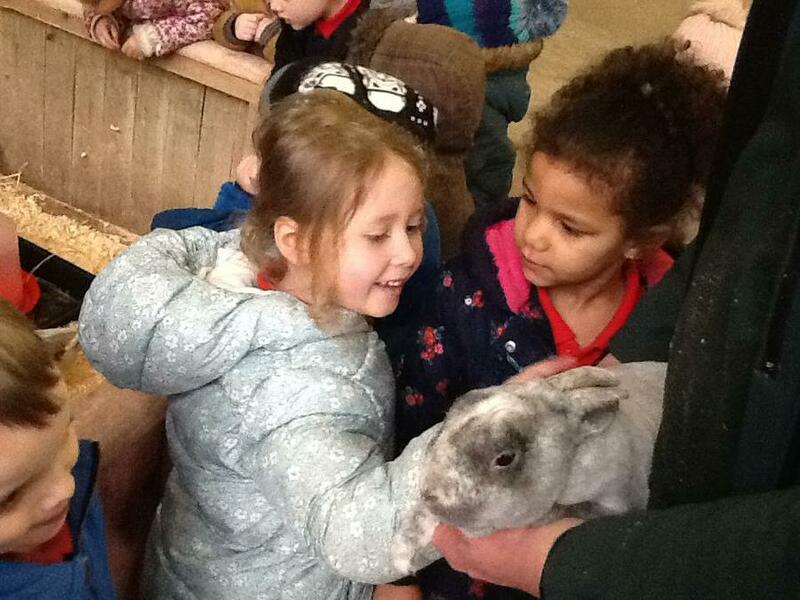 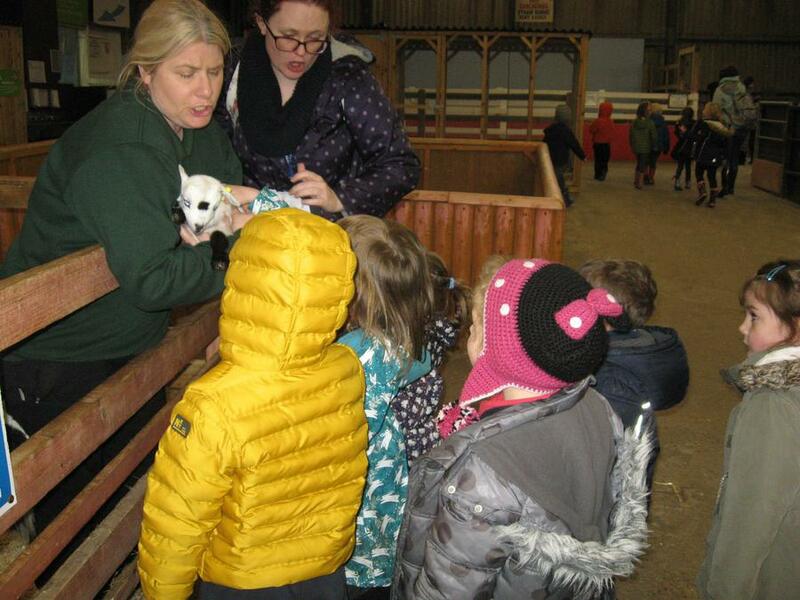 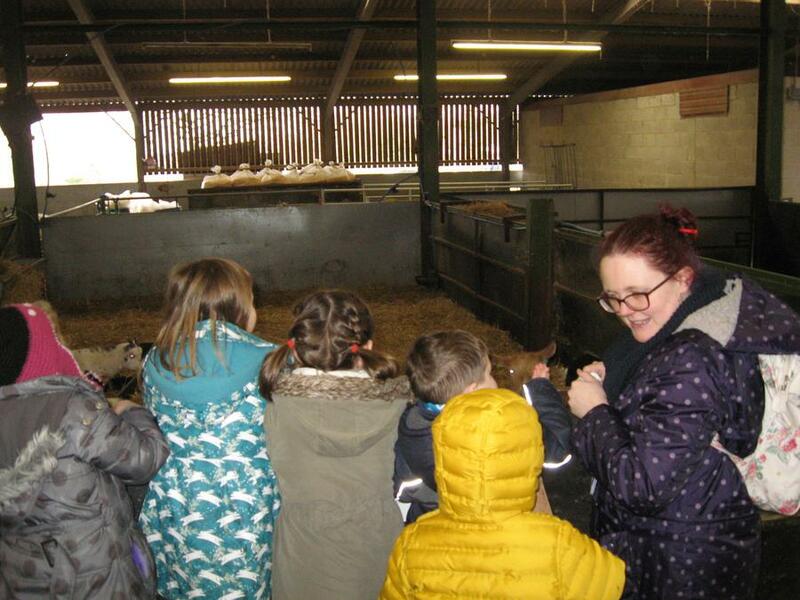 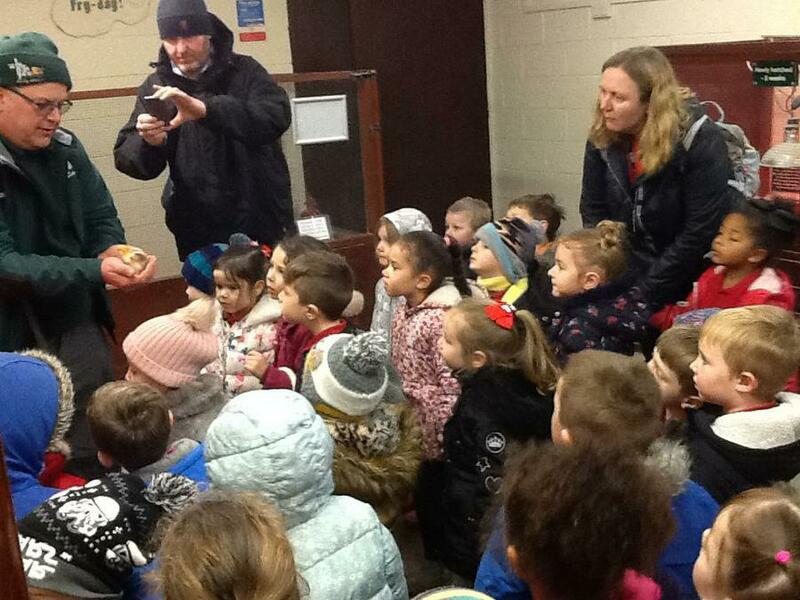 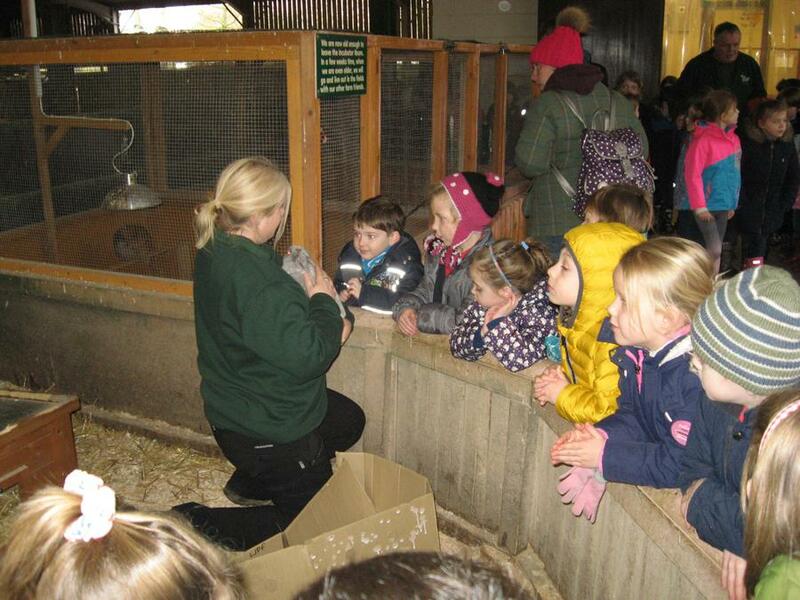 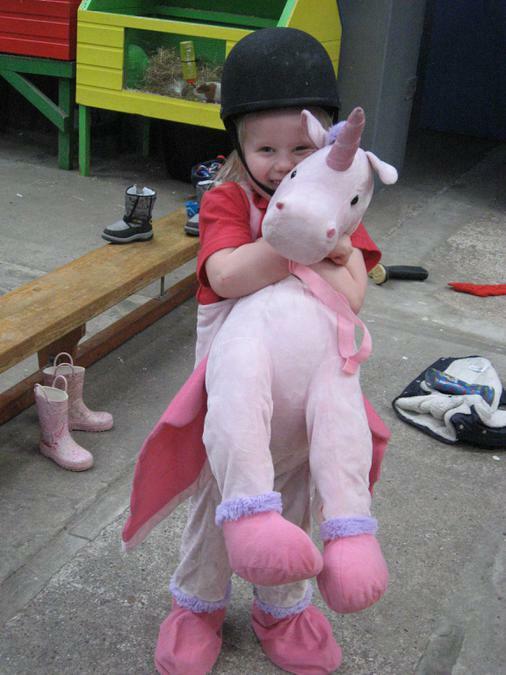 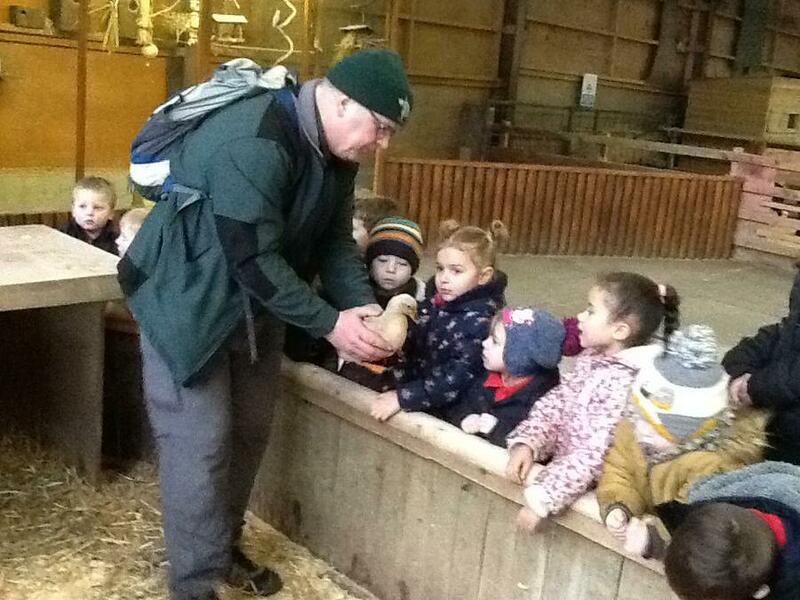 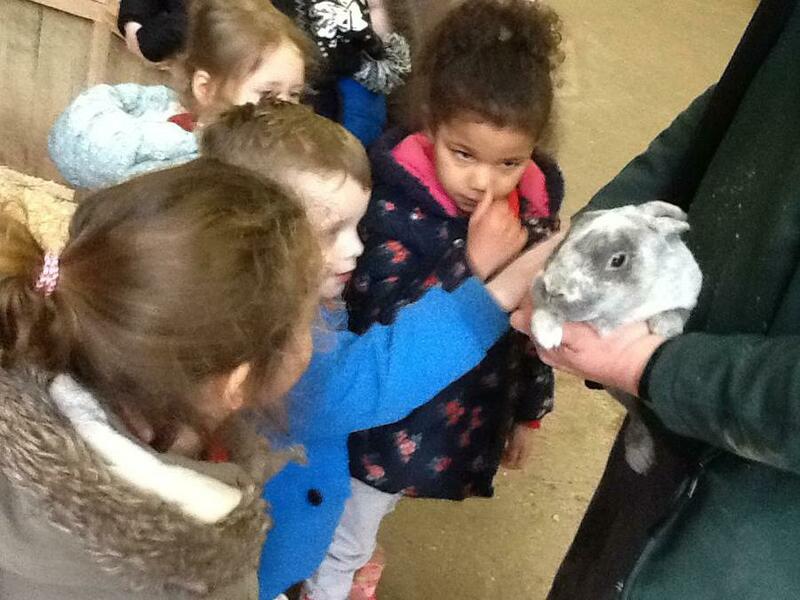 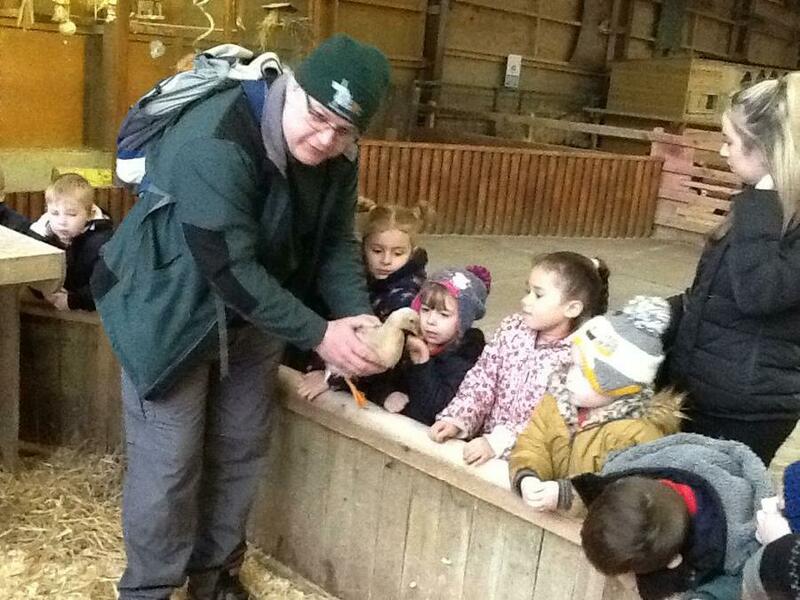 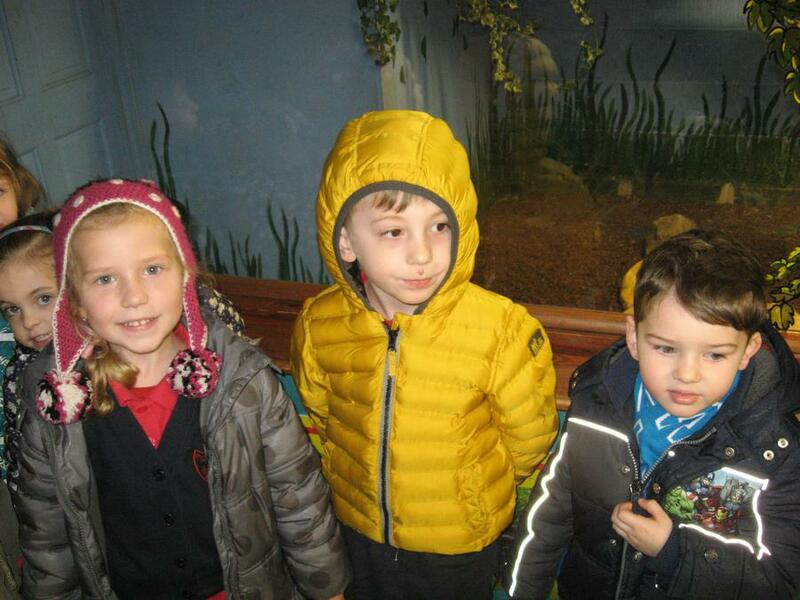 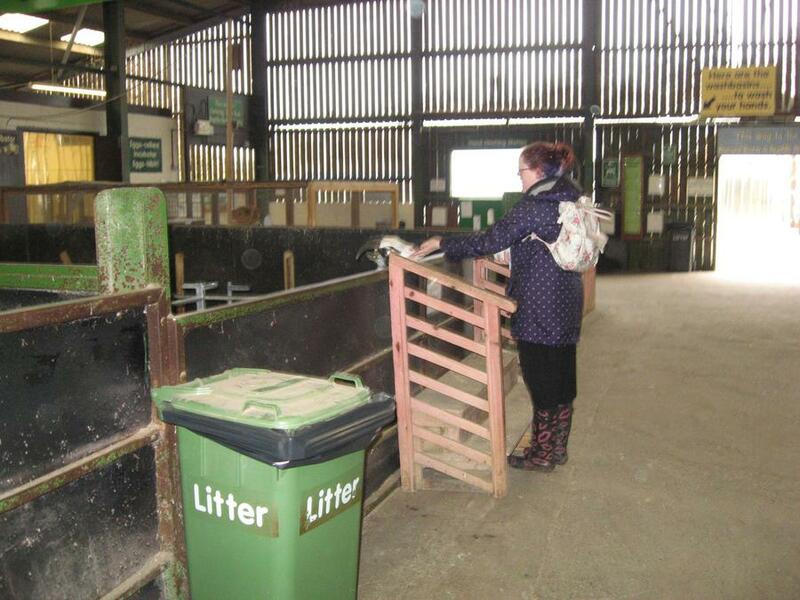 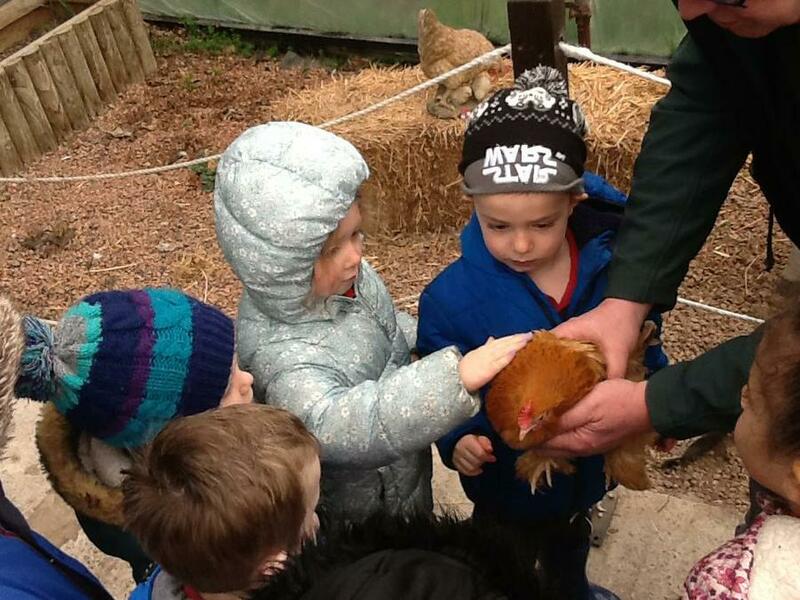 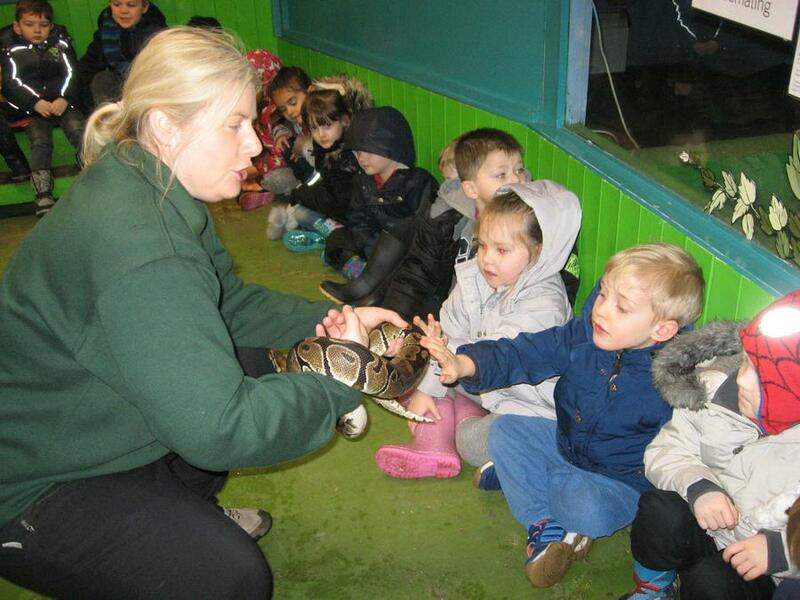 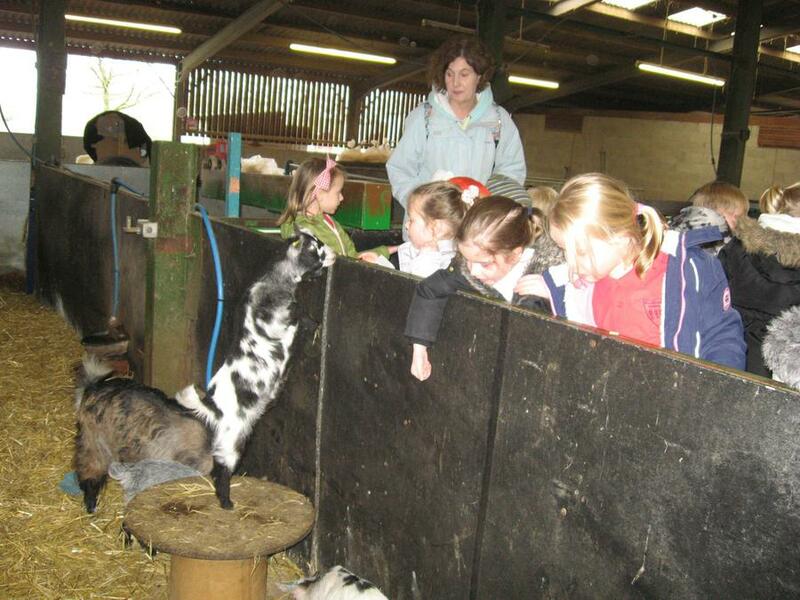 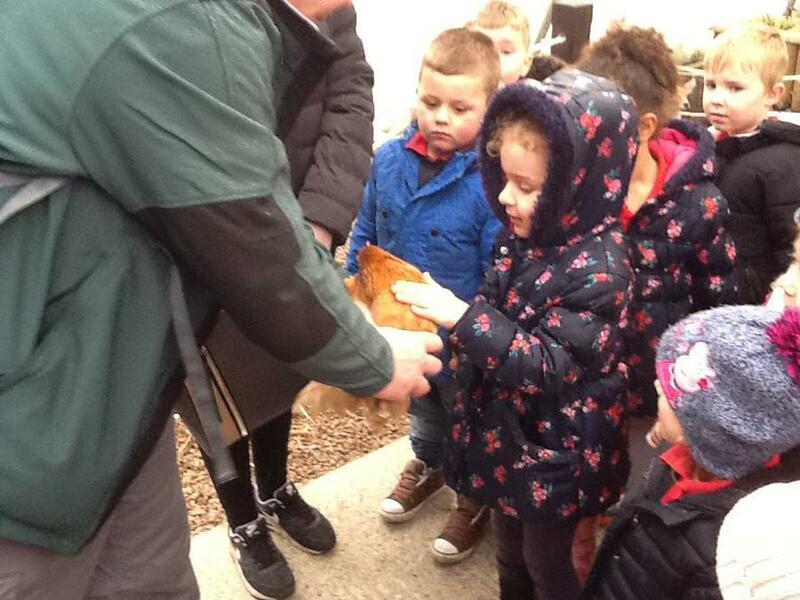 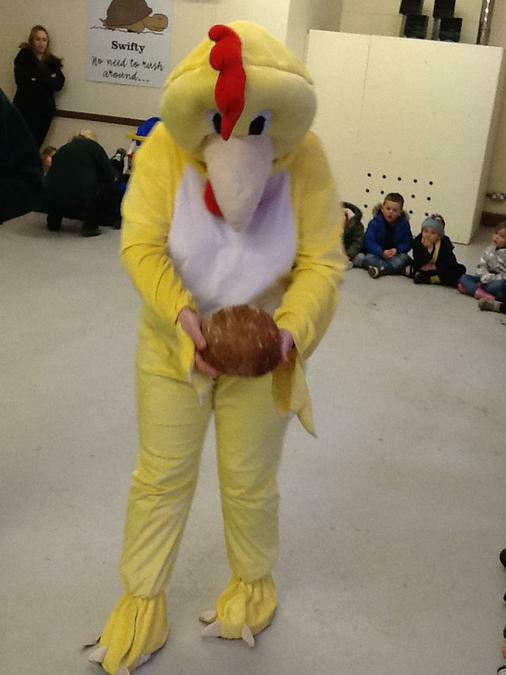 On the 15th March Class 1 and 2 went on a great adventure to White Post Farm. 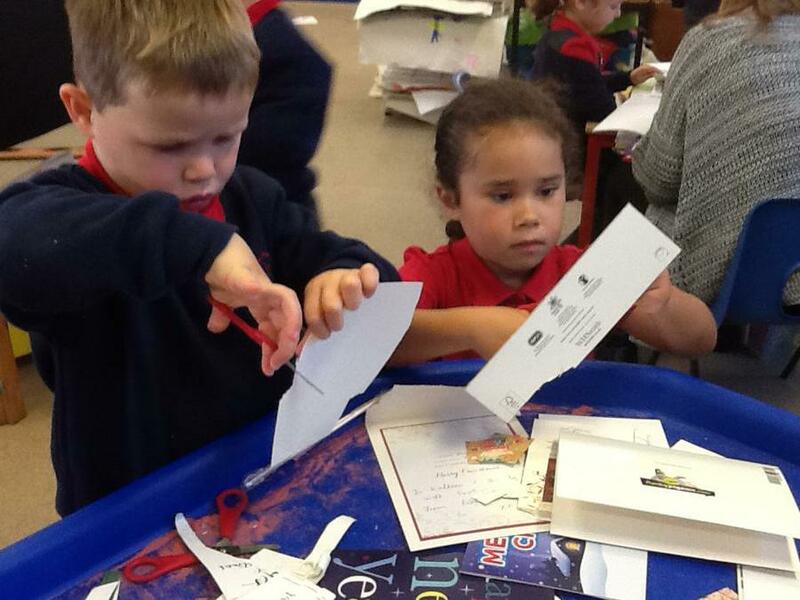 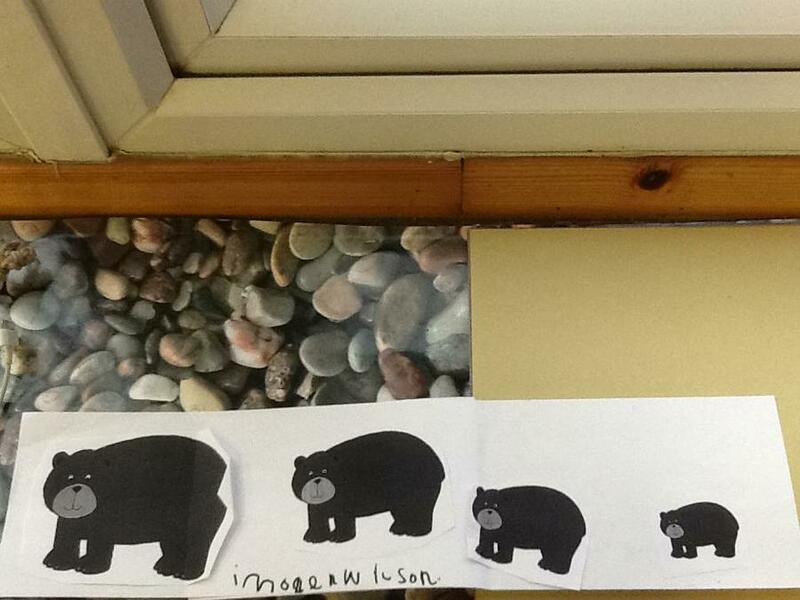 We went on a mission to find all the characters from the story, The Little Red Hen. 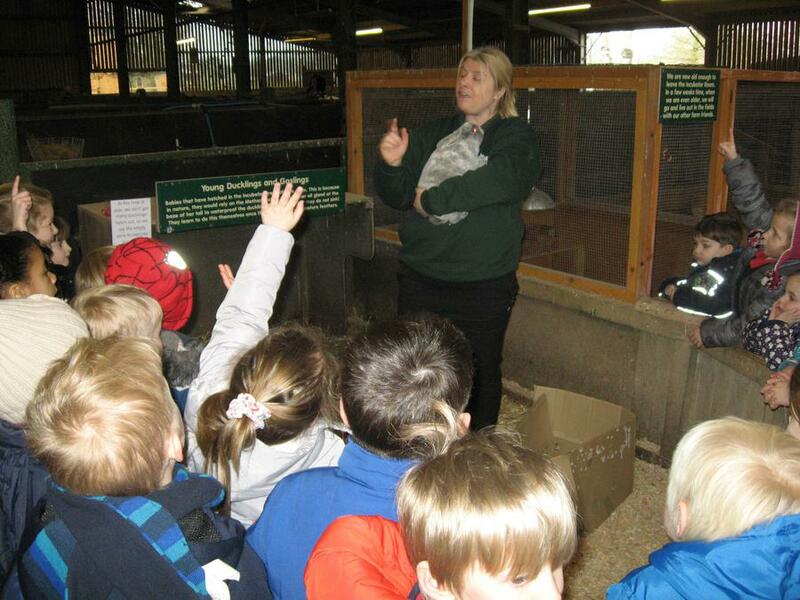 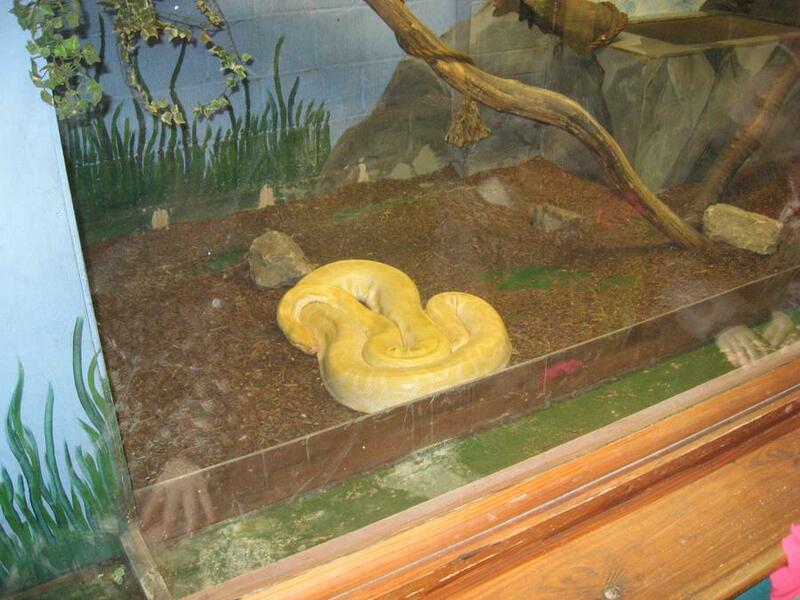 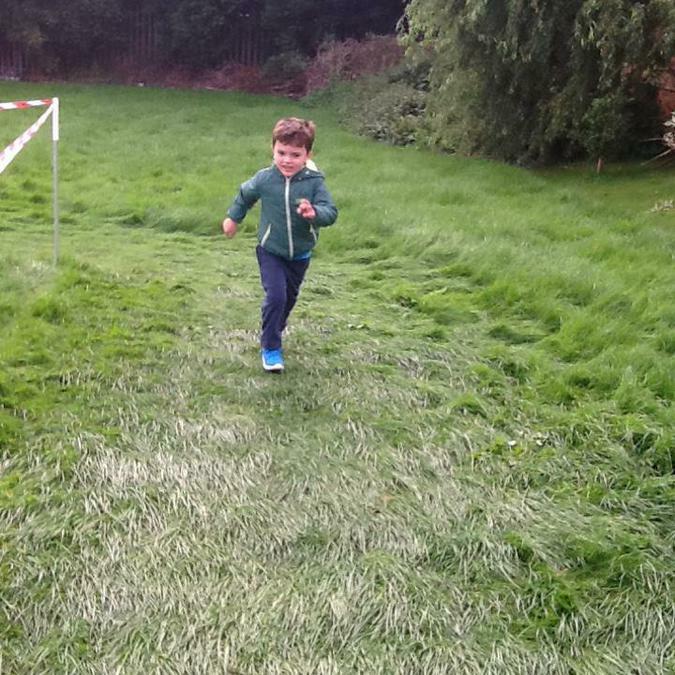 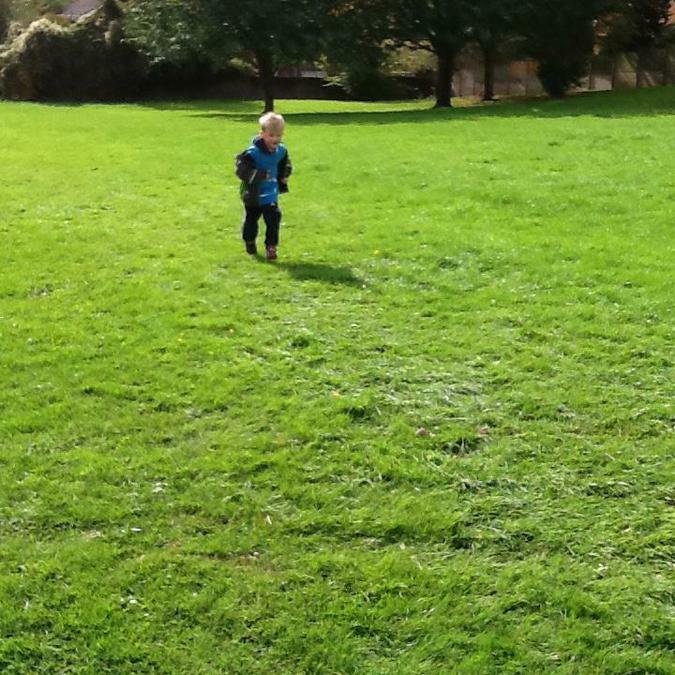 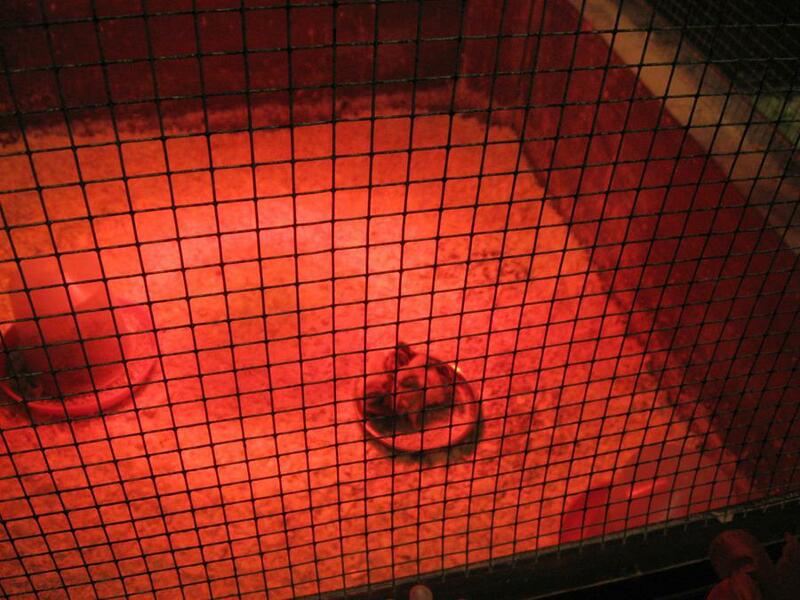 We found snakes, tortoises, lizards, fish, rabbits, chicks, lambs, sheep, goats, kids, cows and hens! 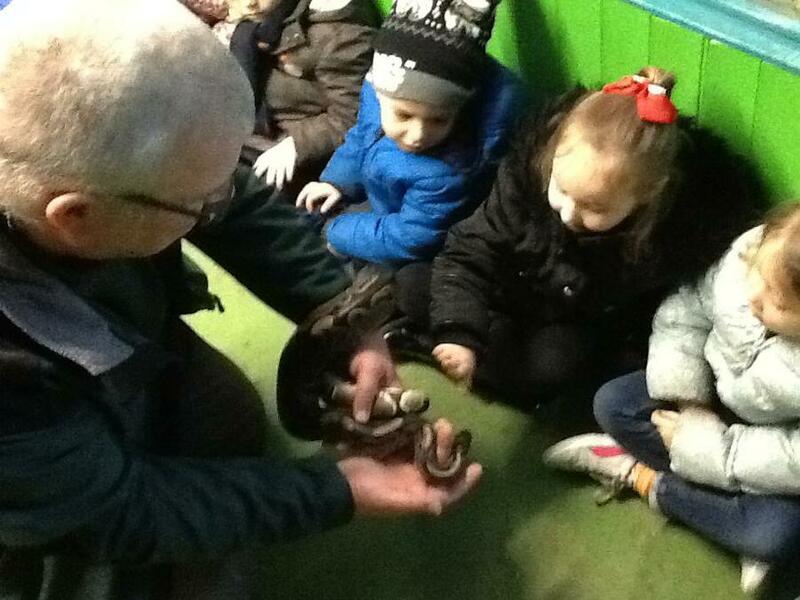 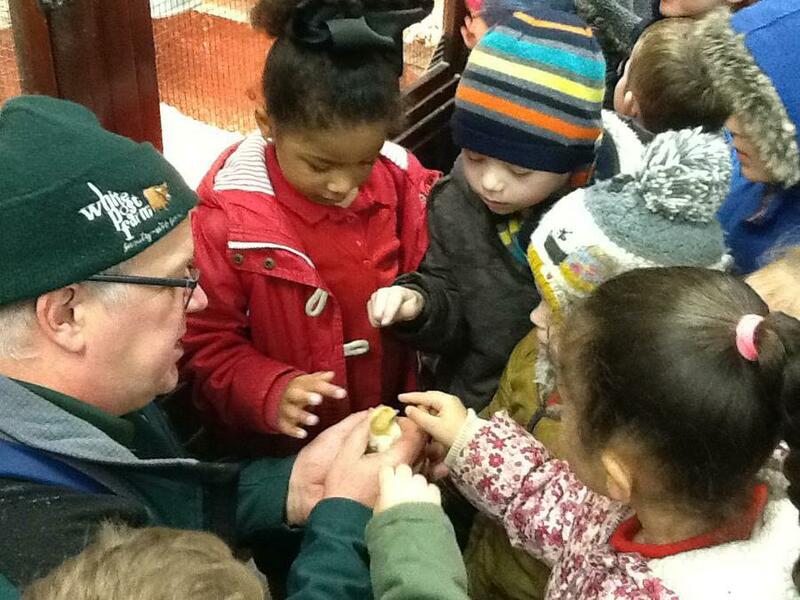 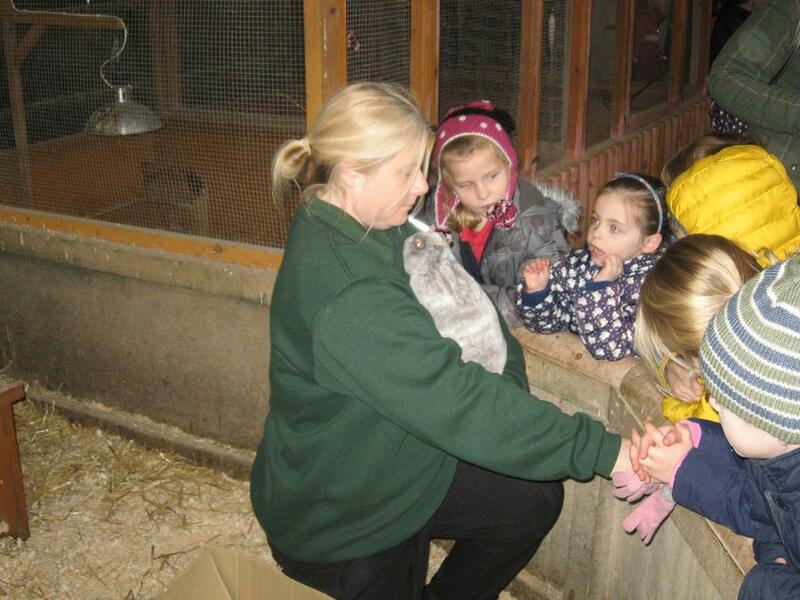 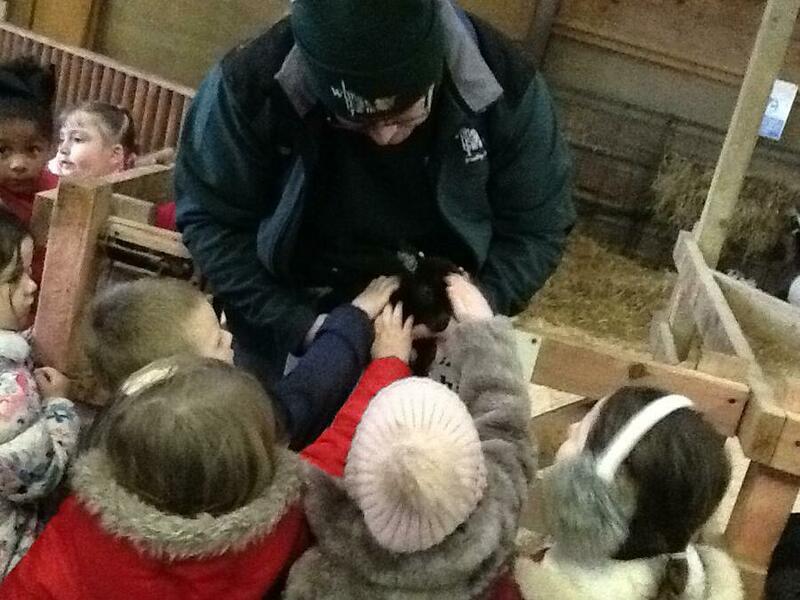 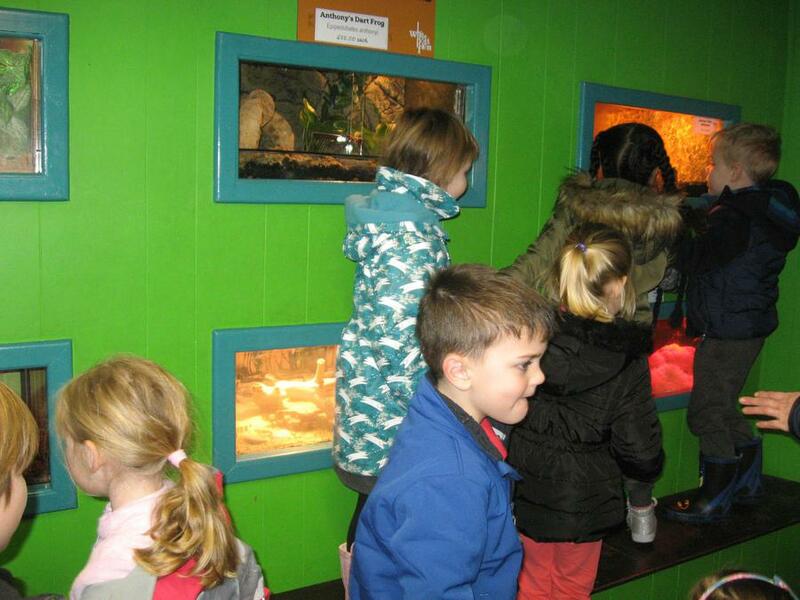 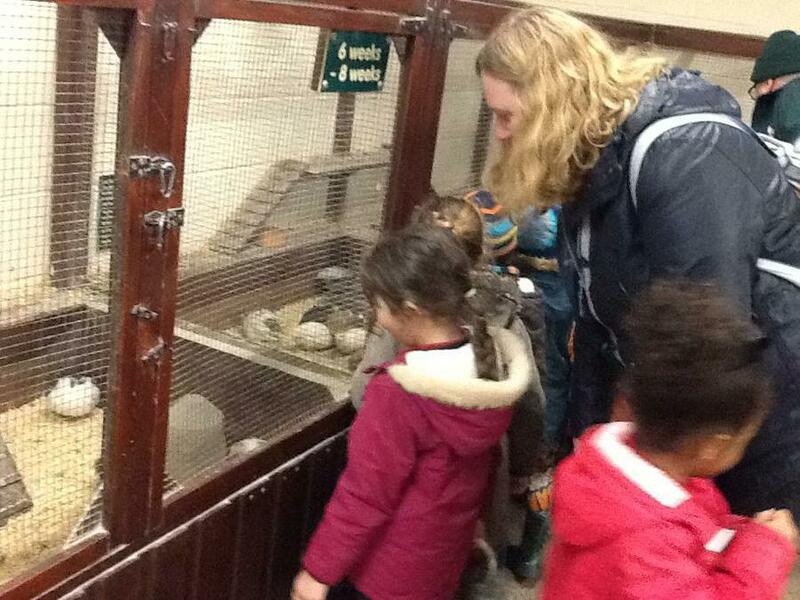 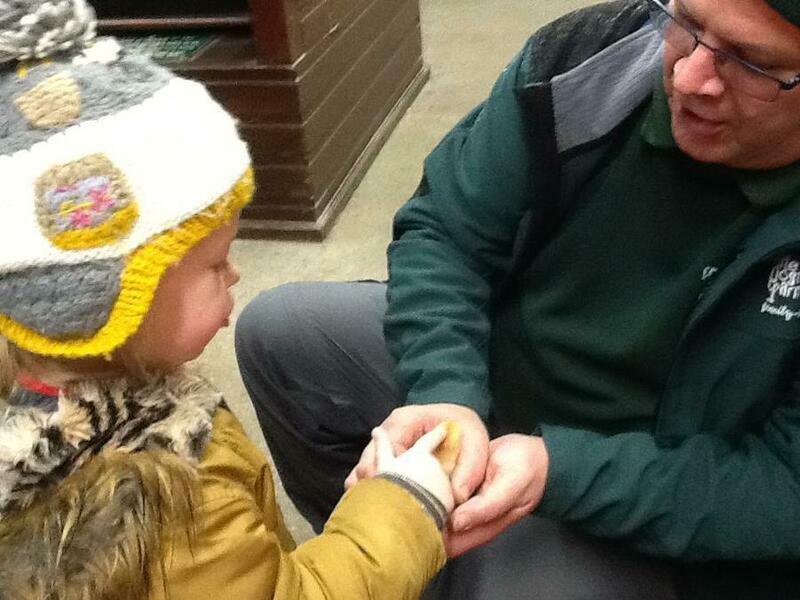 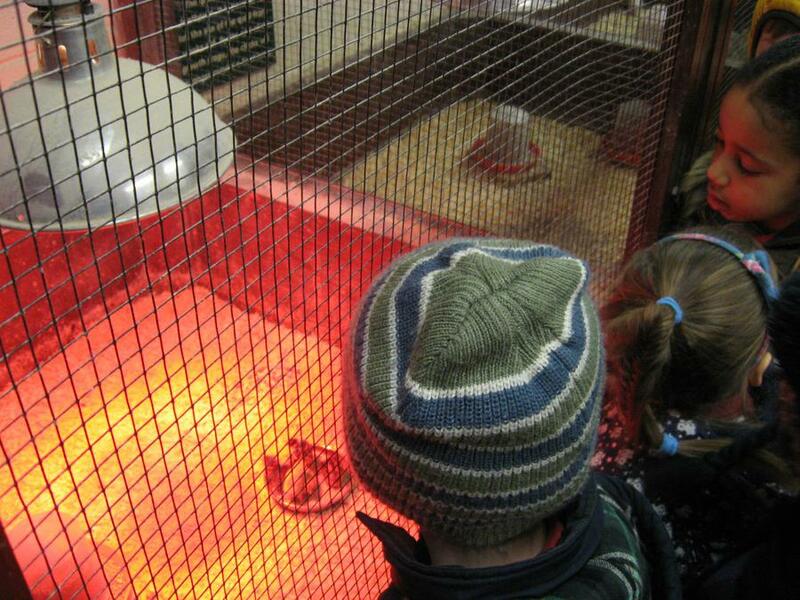 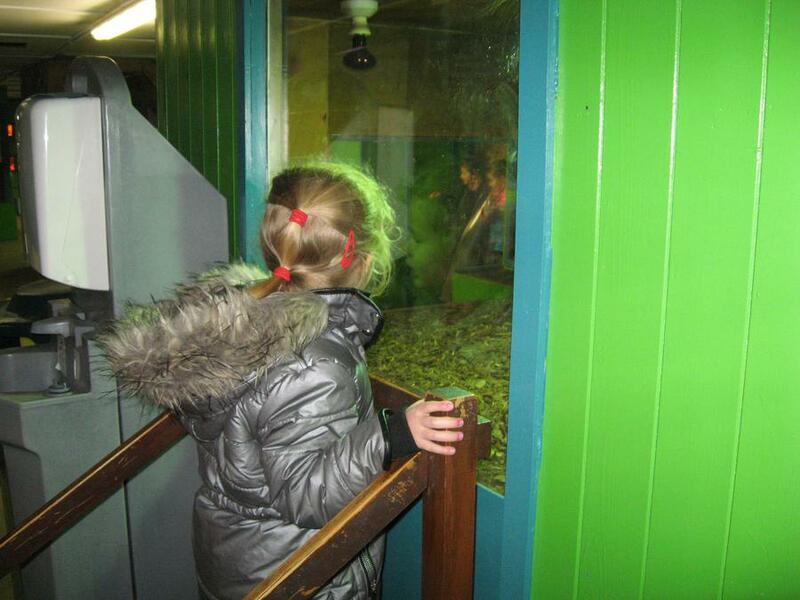 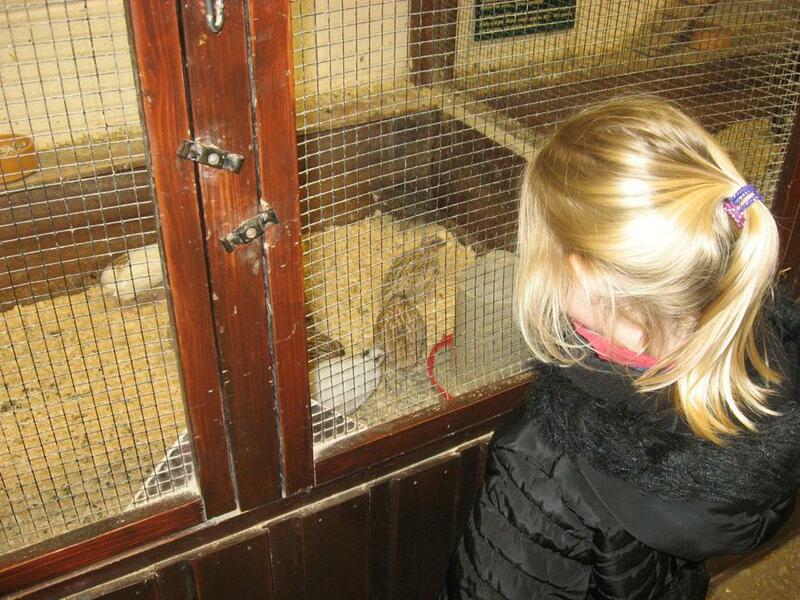 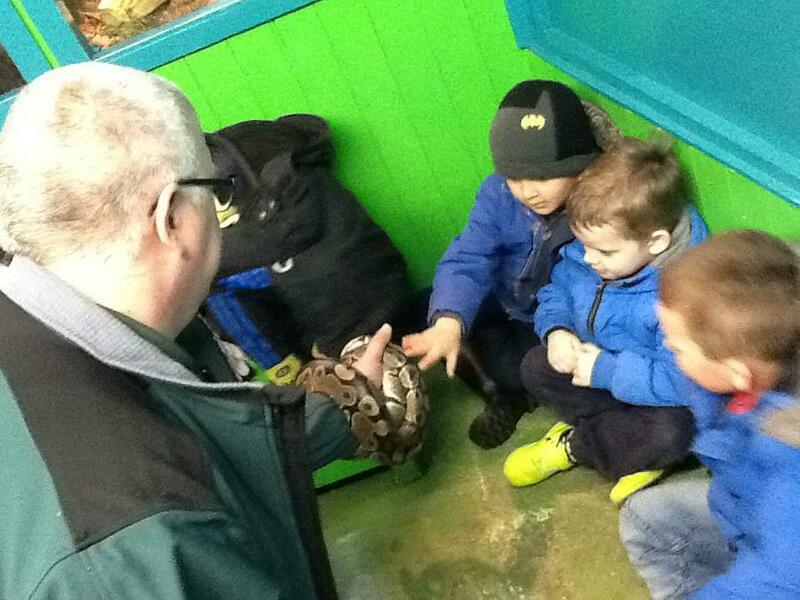 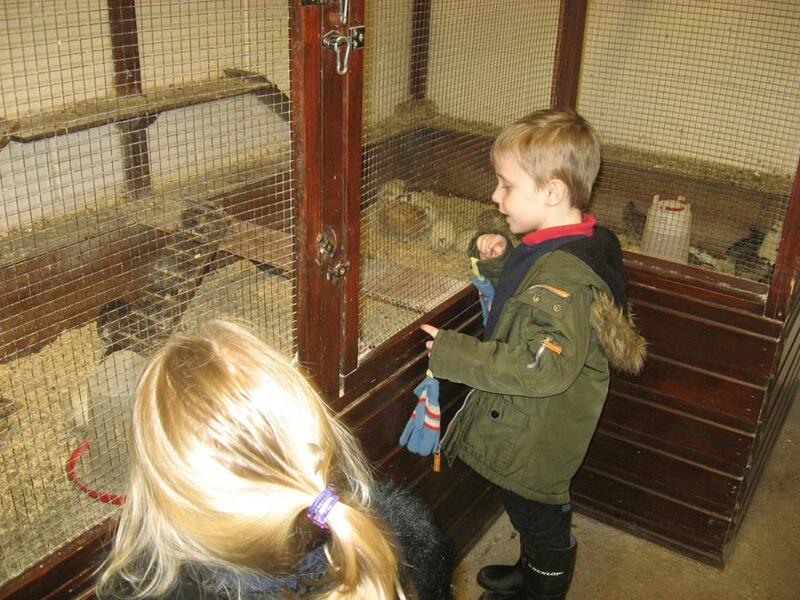 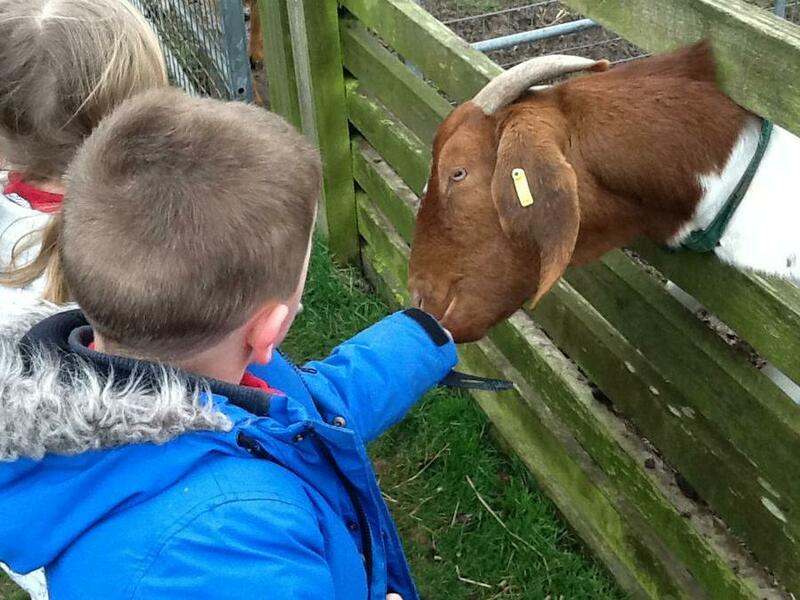 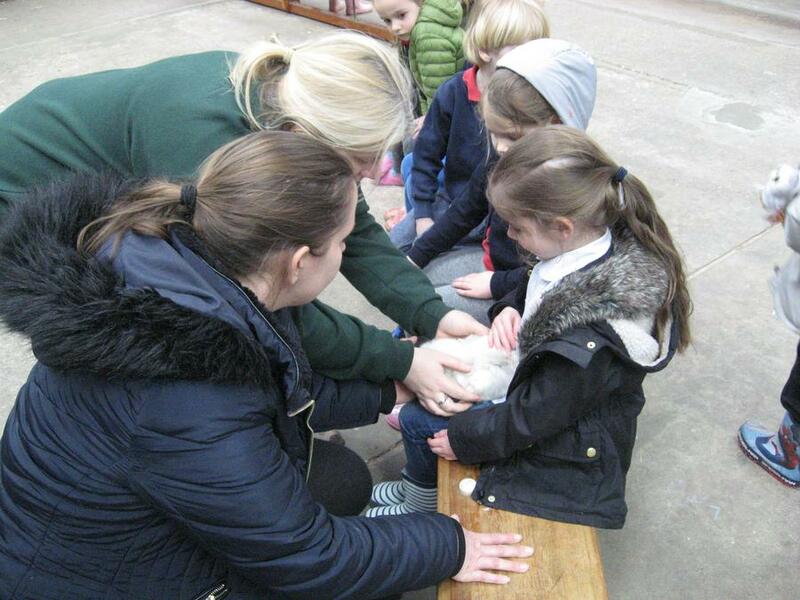 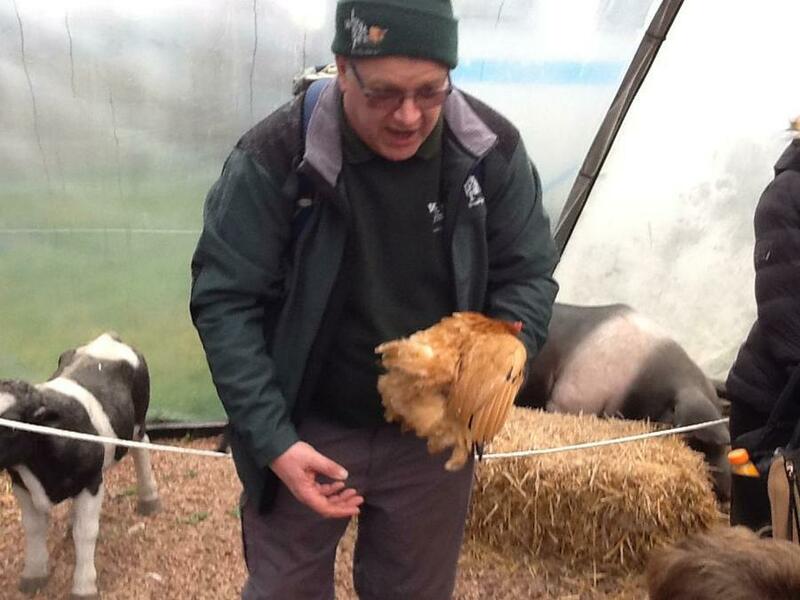 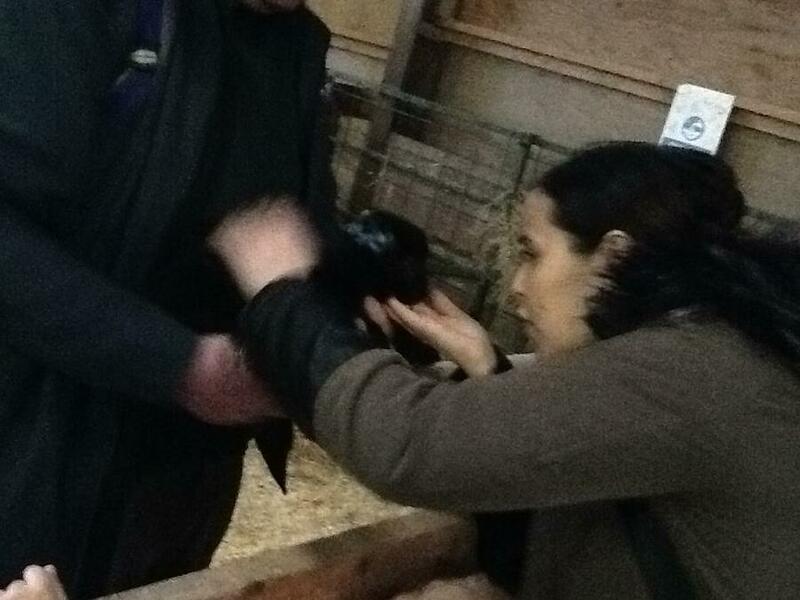 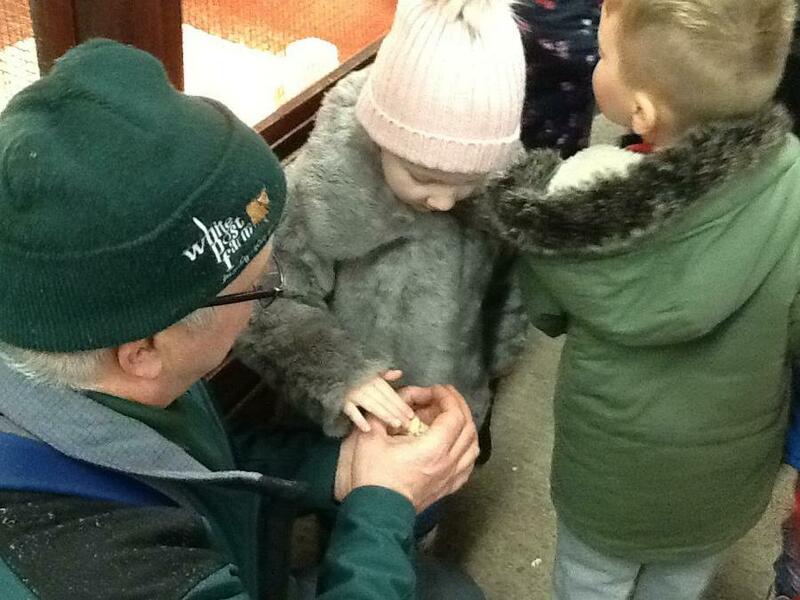 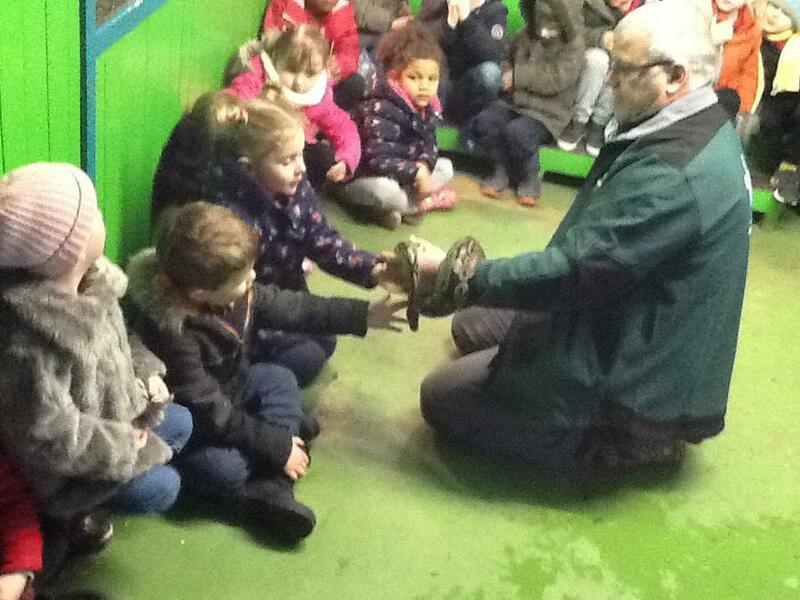 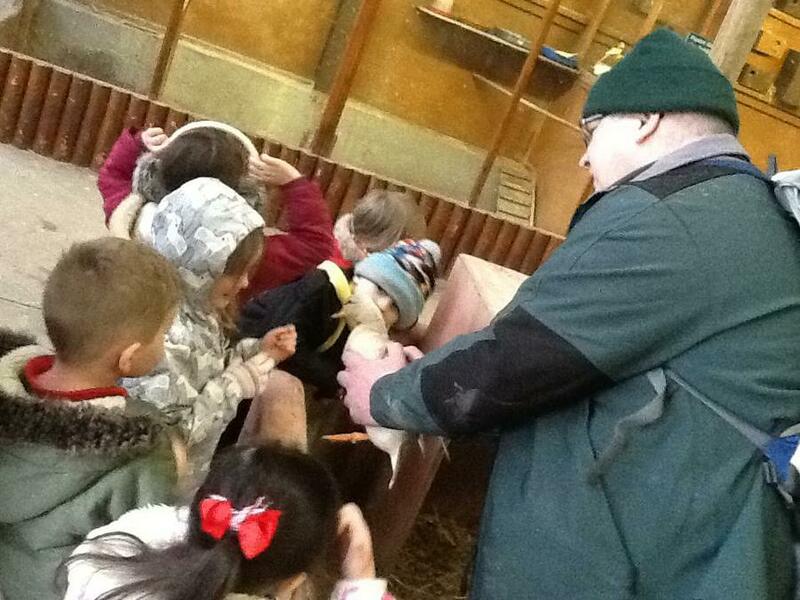 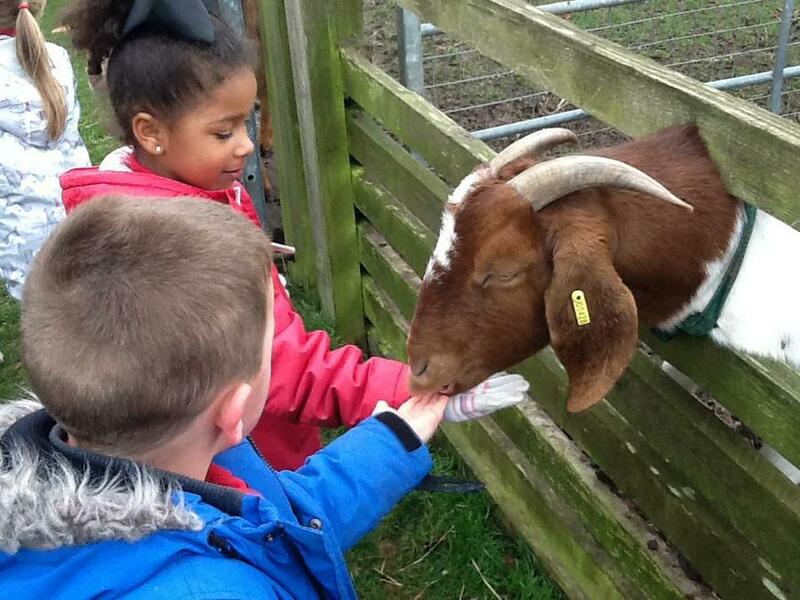 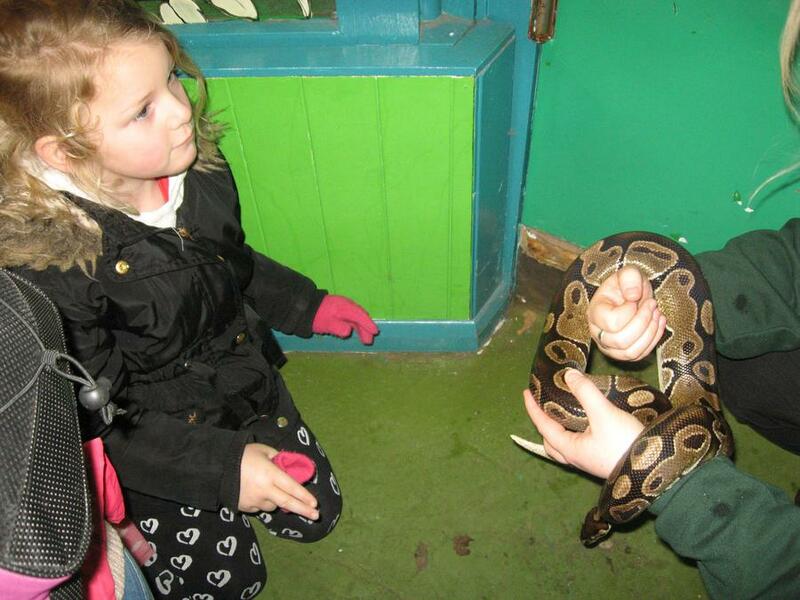 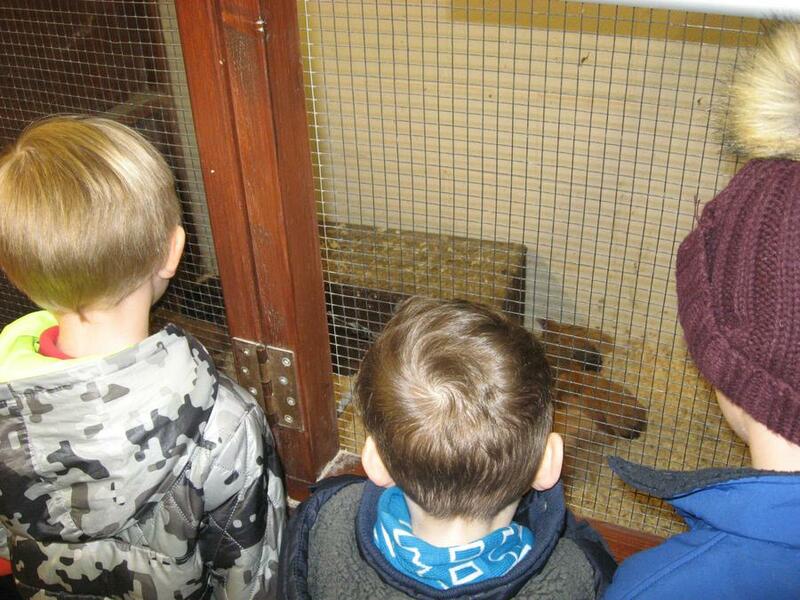 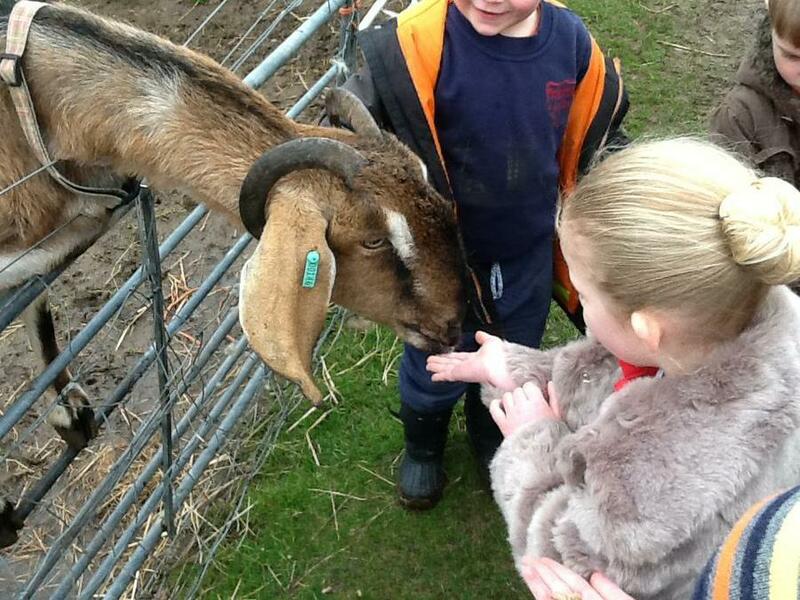 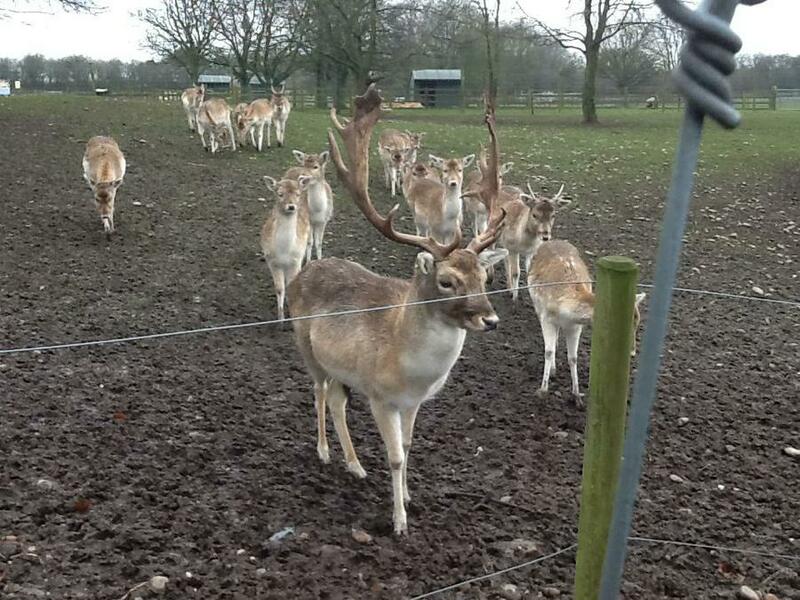 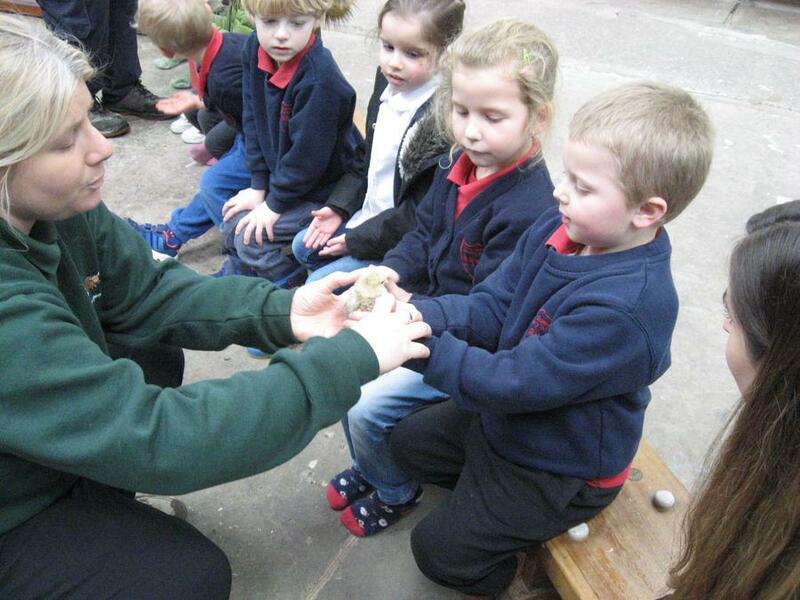 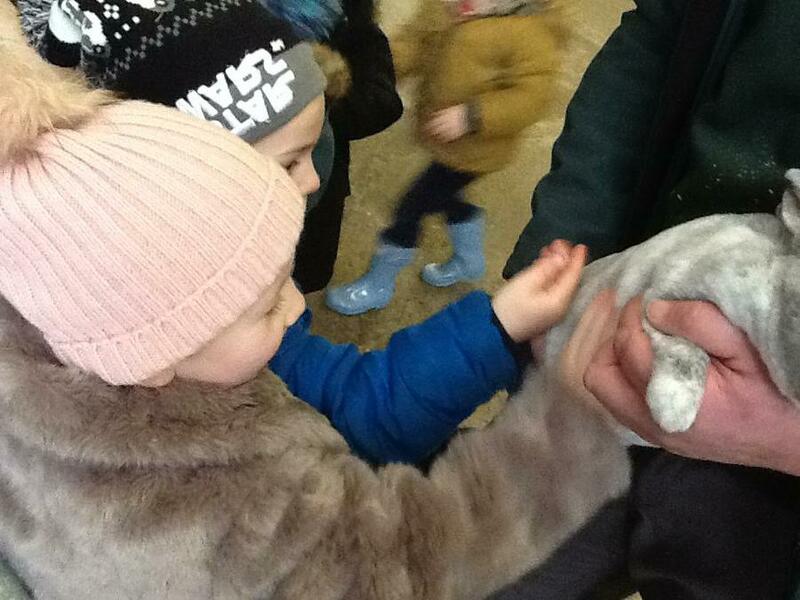 We LOVED seeing, stroking and even feeding the animals. 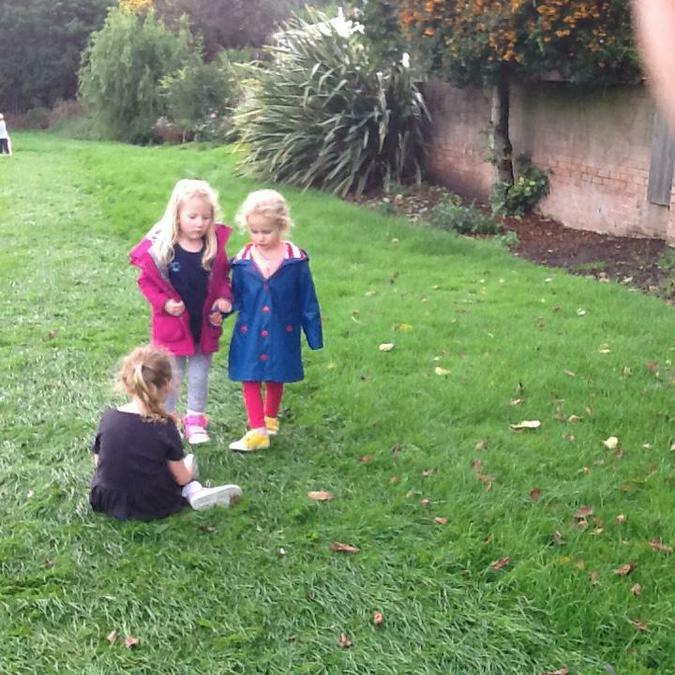 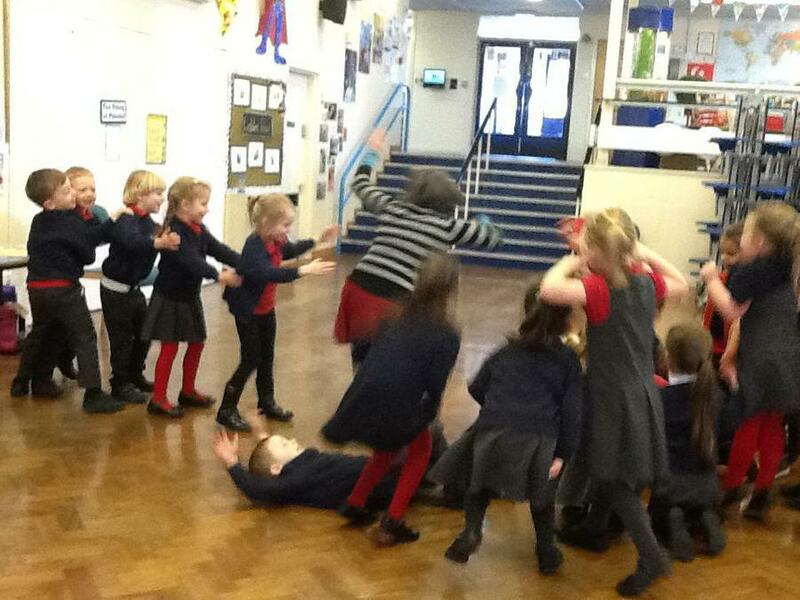 At the end of the day we all worked together to act out the story. 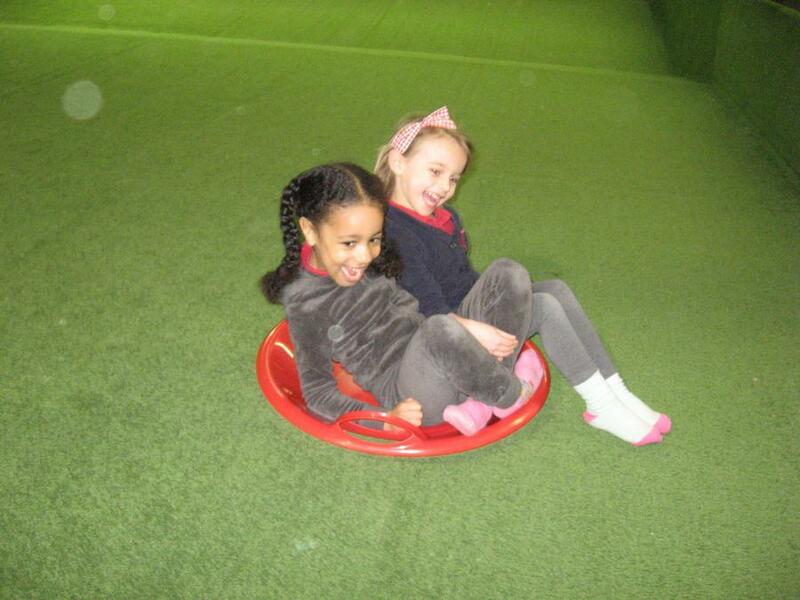 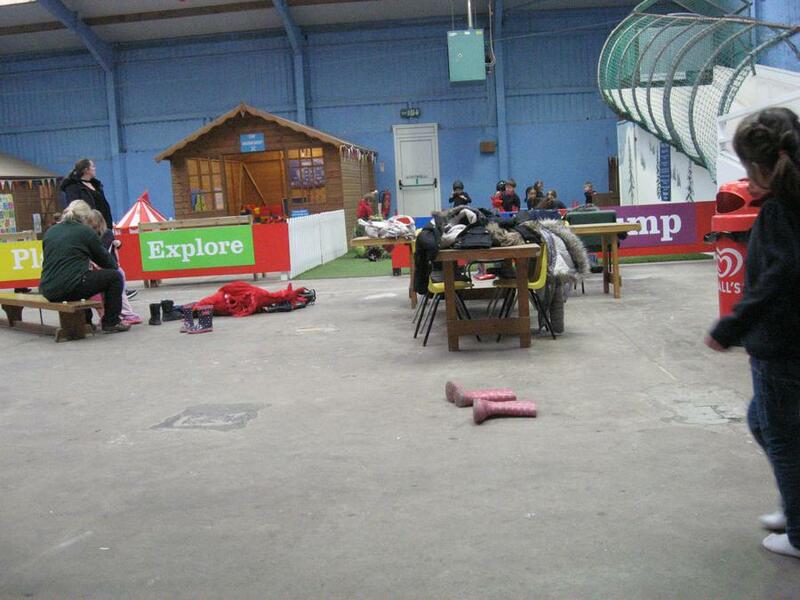 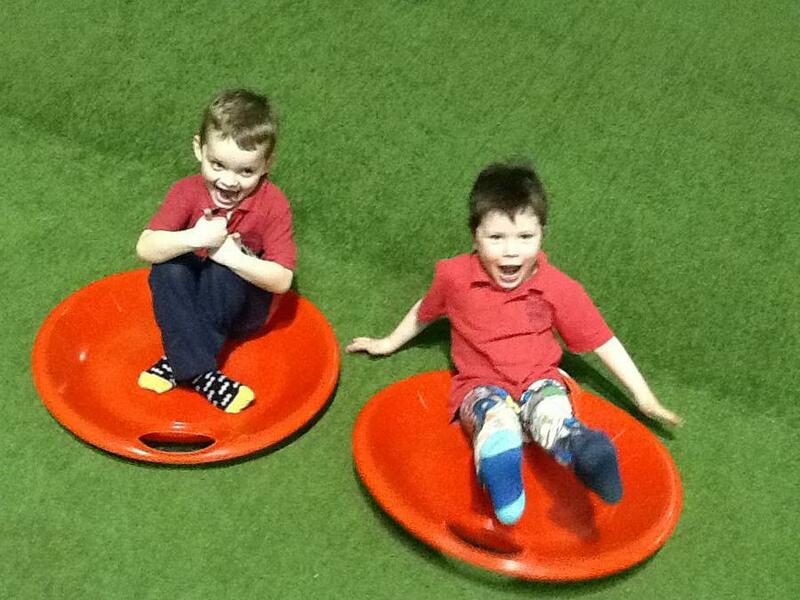 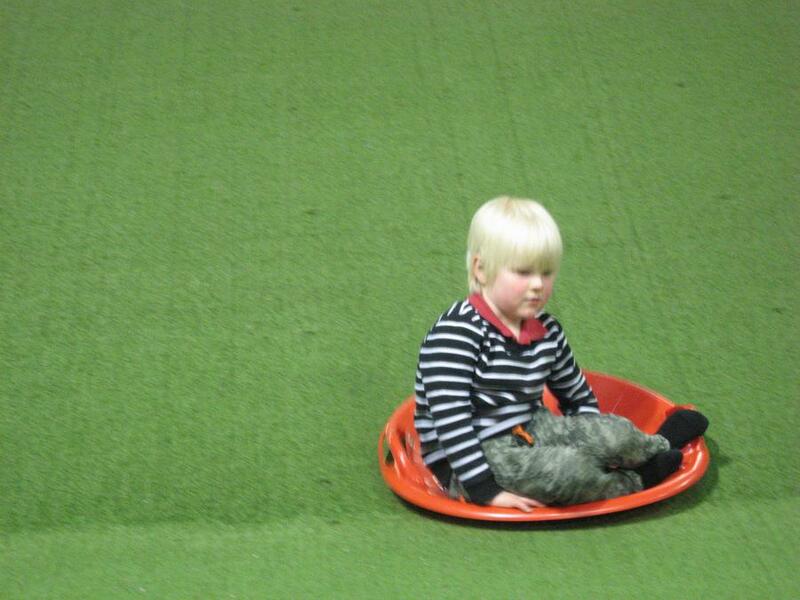 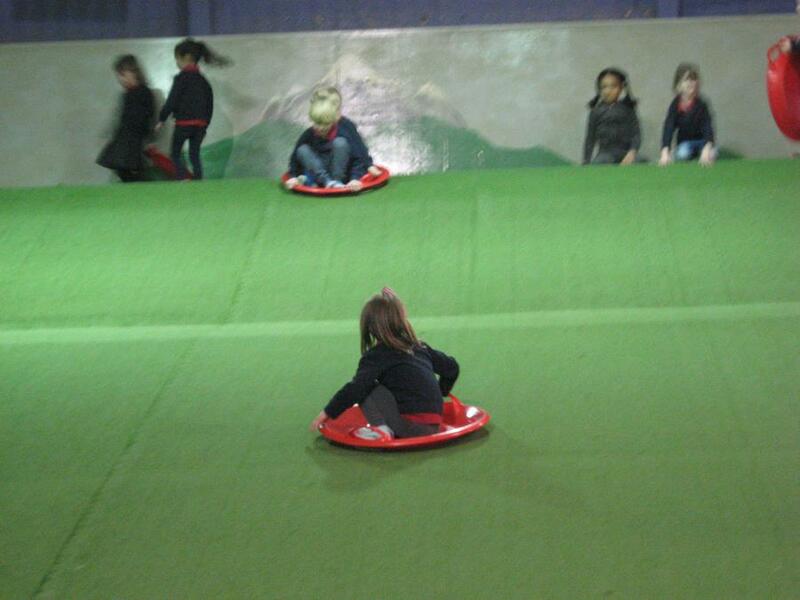 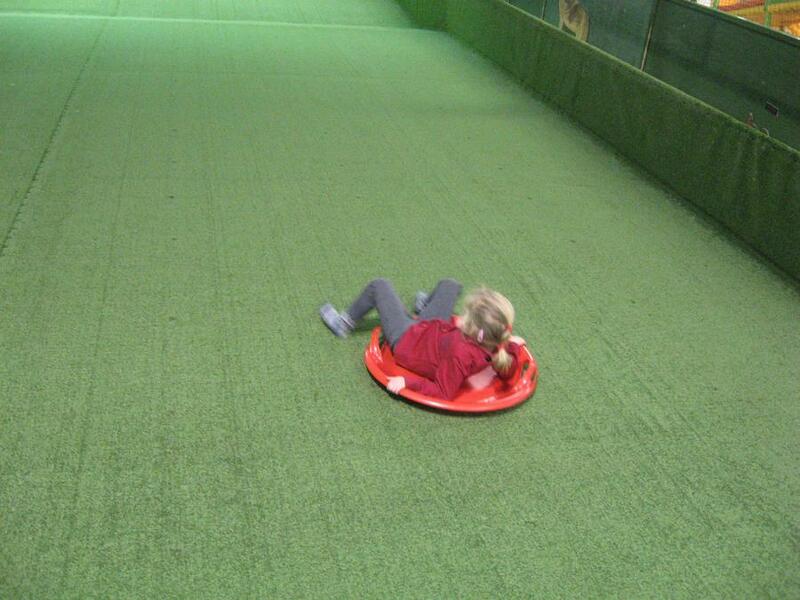 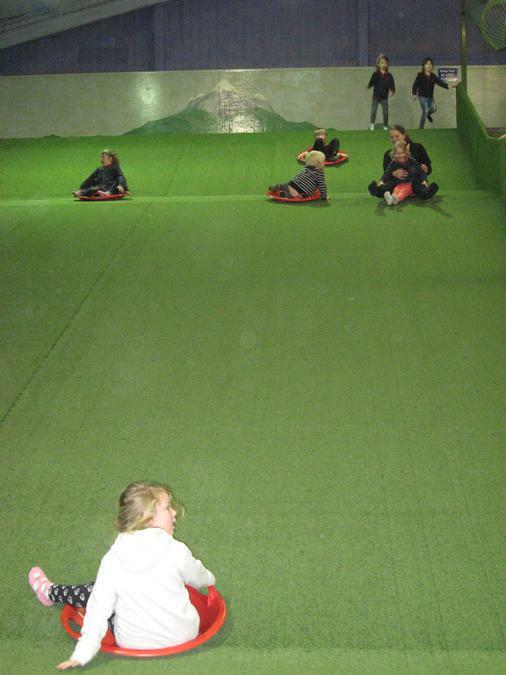 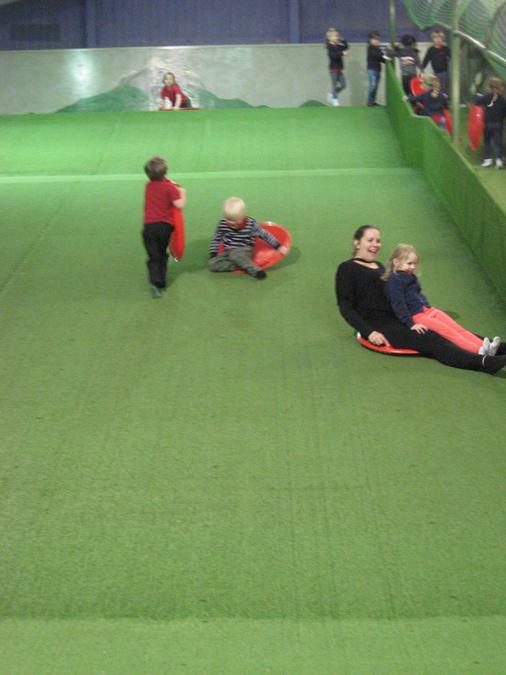 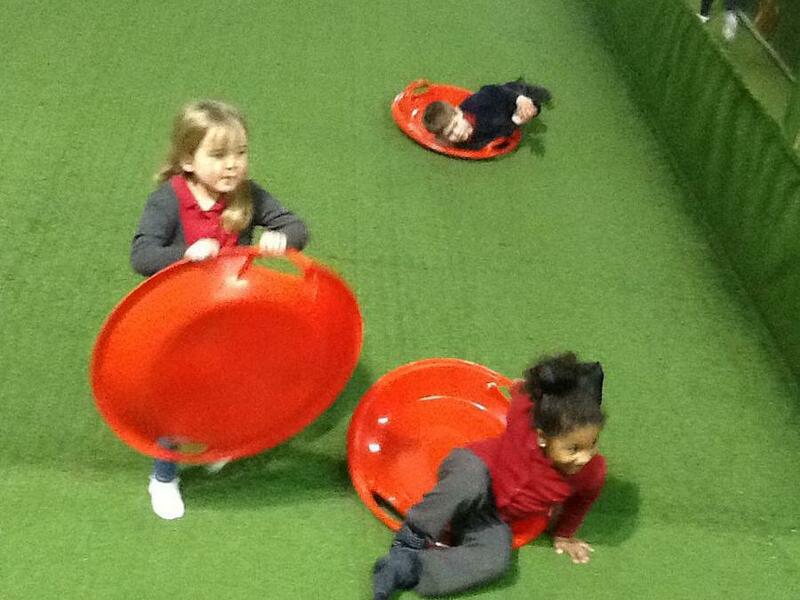 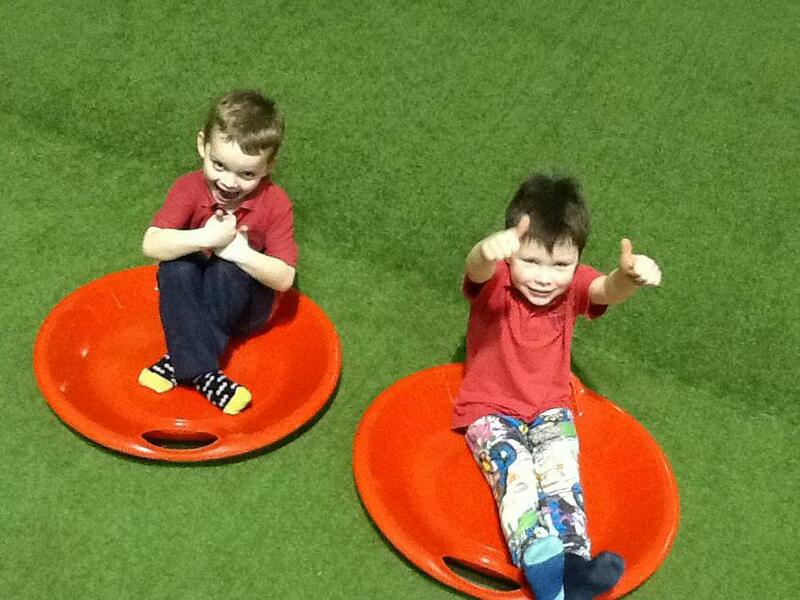 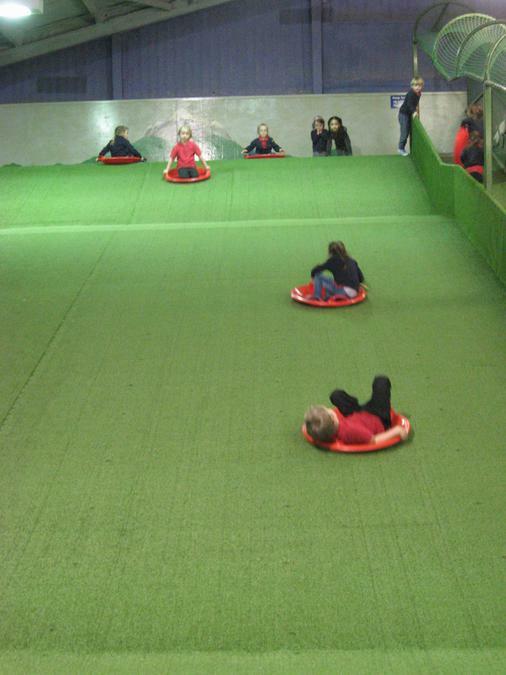 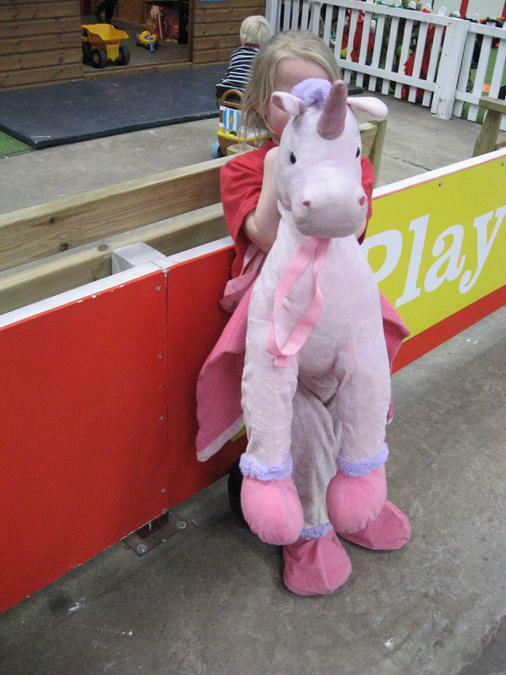 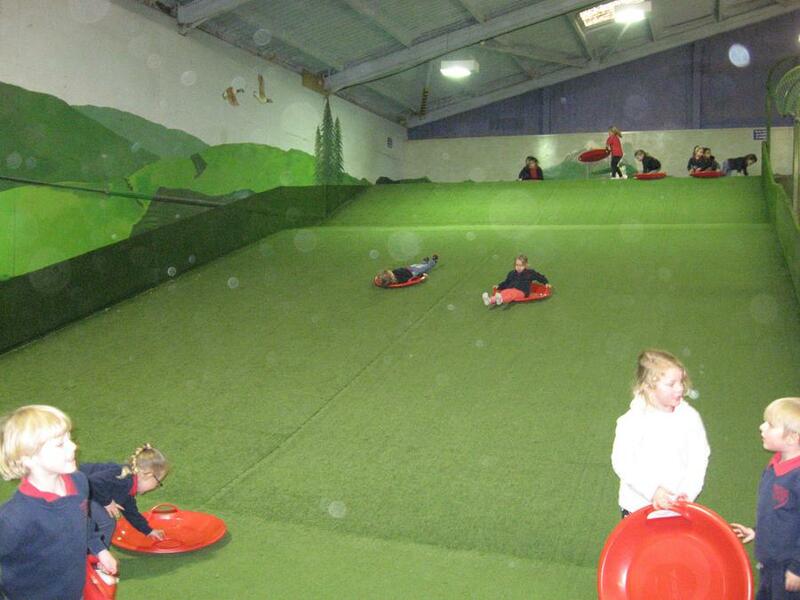 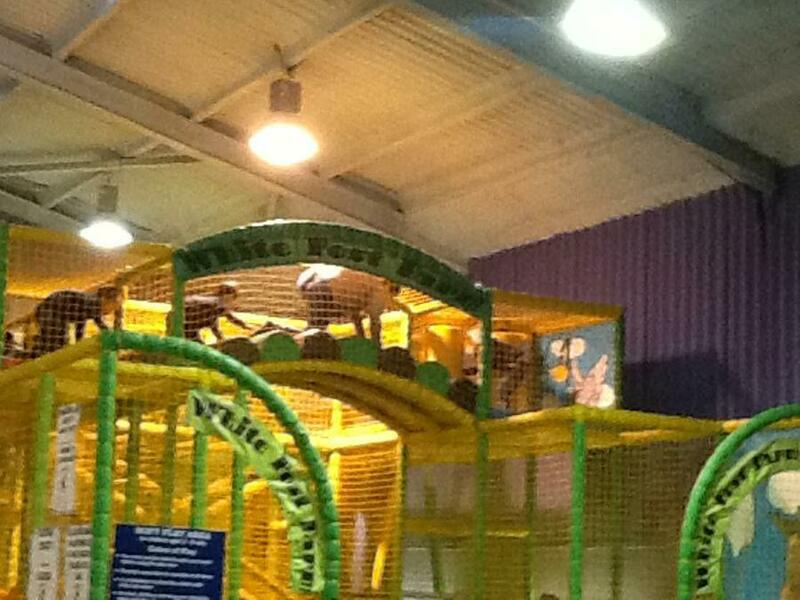 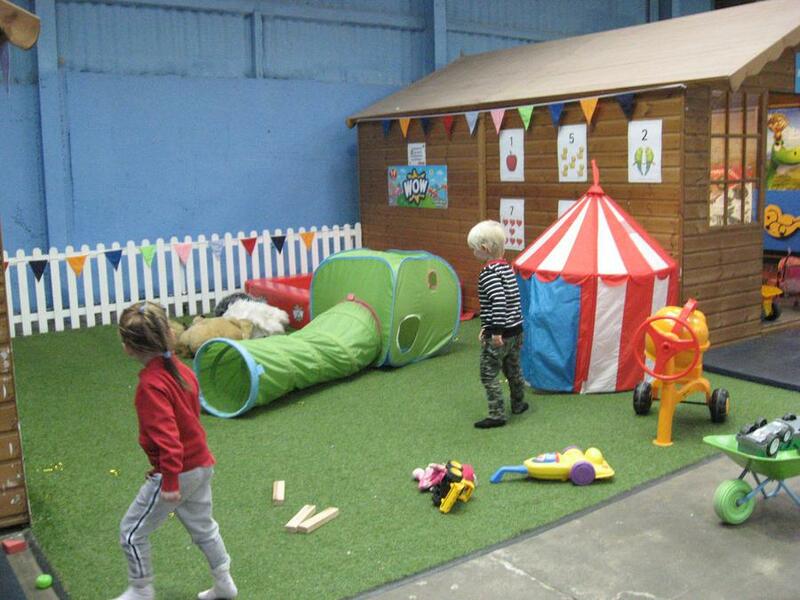 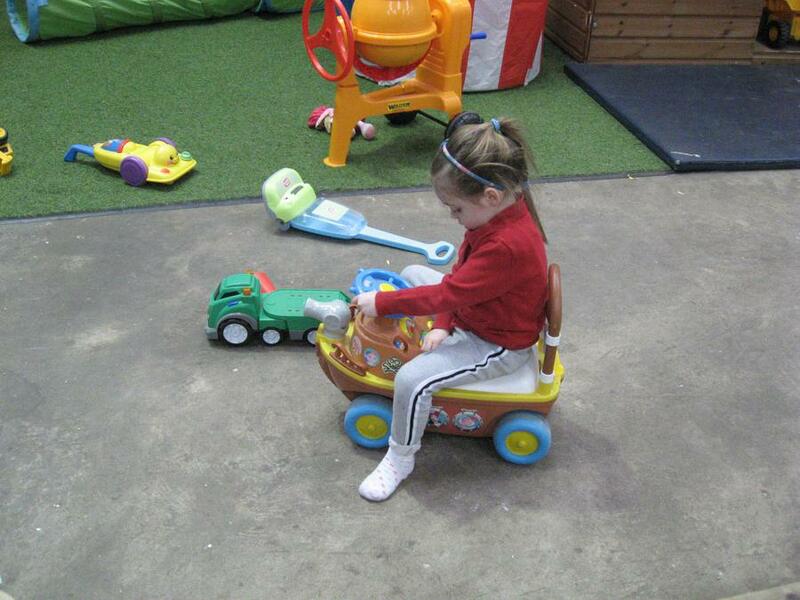 We even had time to play on their indoor sledging hill along with the other things in the play barn. 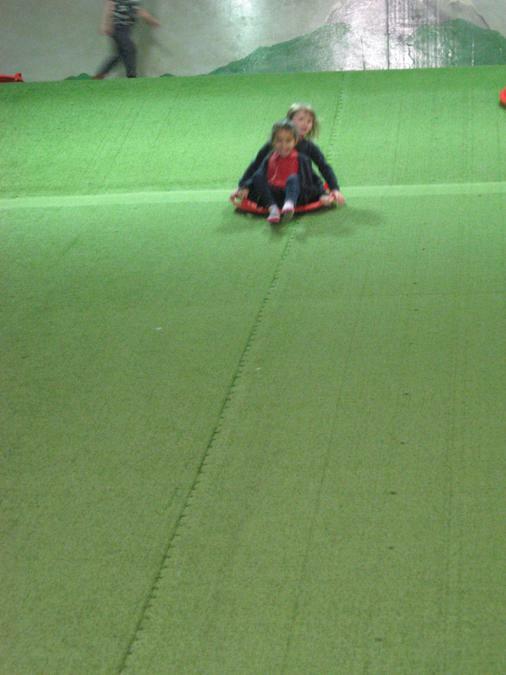 We had the most amazing day!! 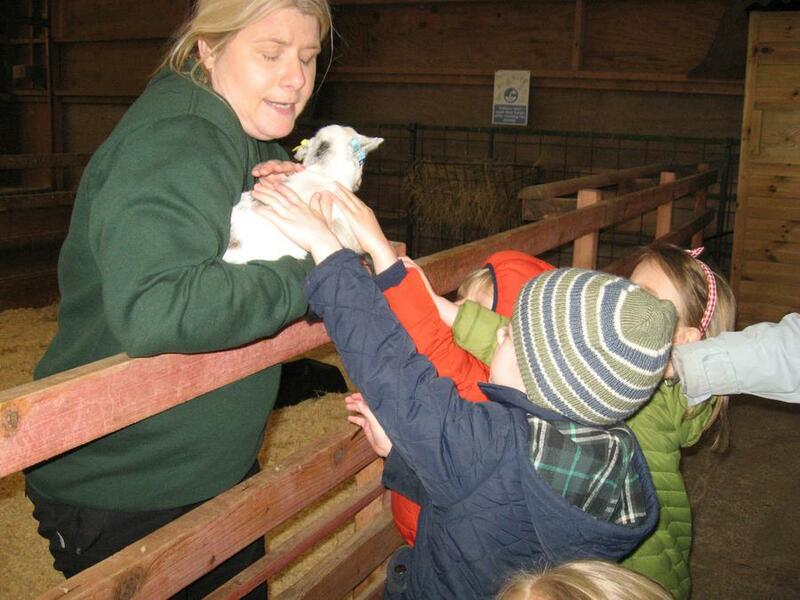 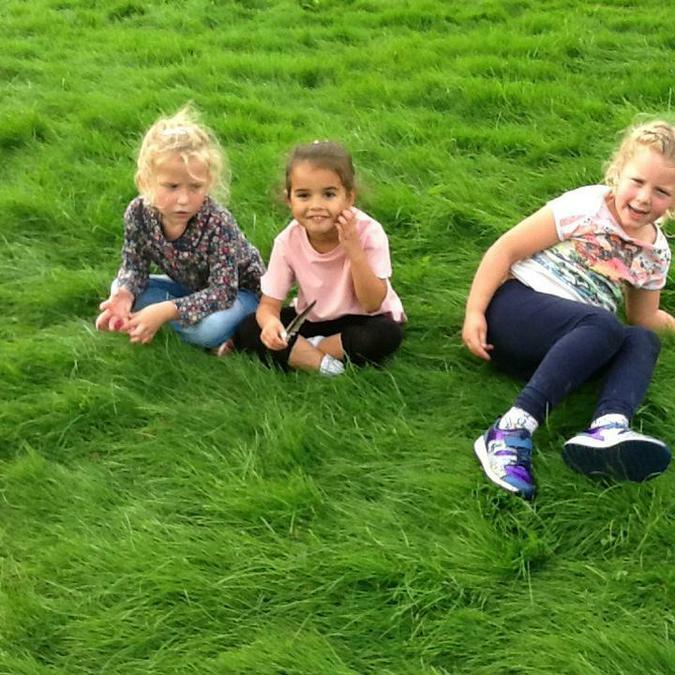 Class 1 and 2 had so much fun at White Post farm. 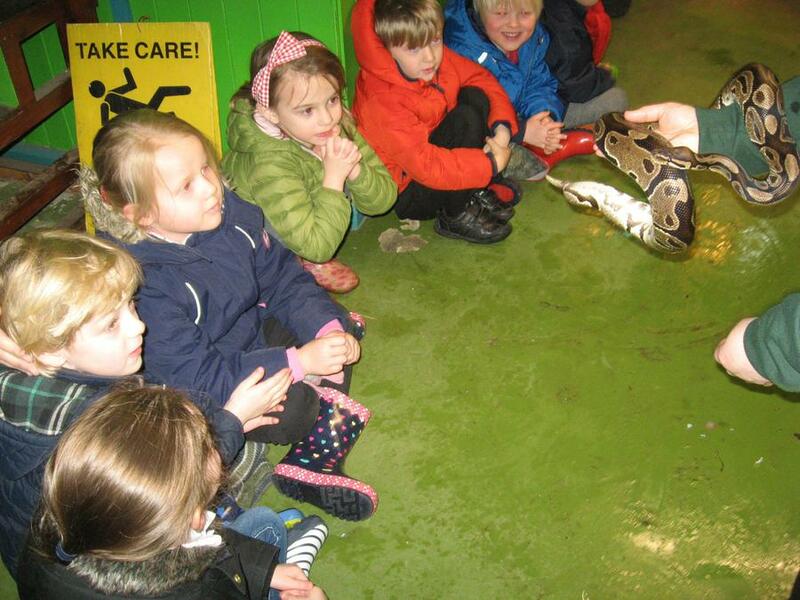 Take a look at all the exciting experiences we shared together. 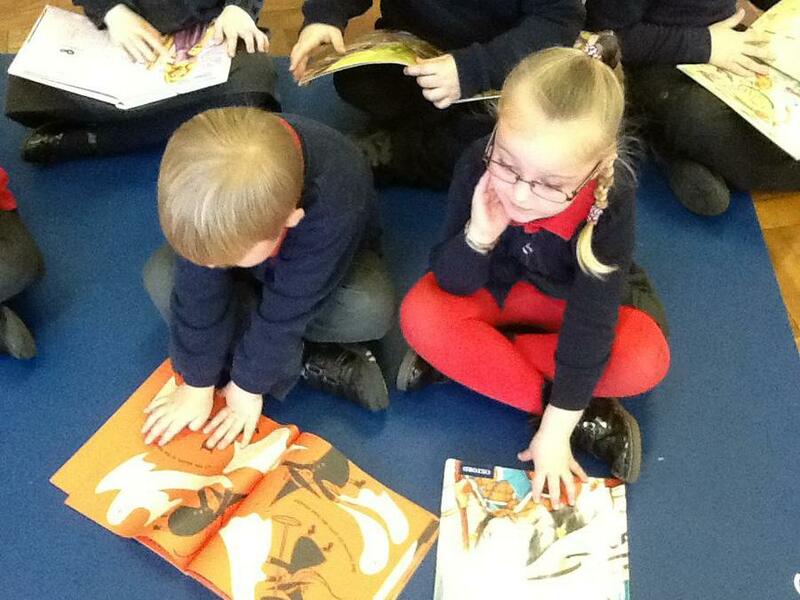 We had so much fun during book Week in F2 ! 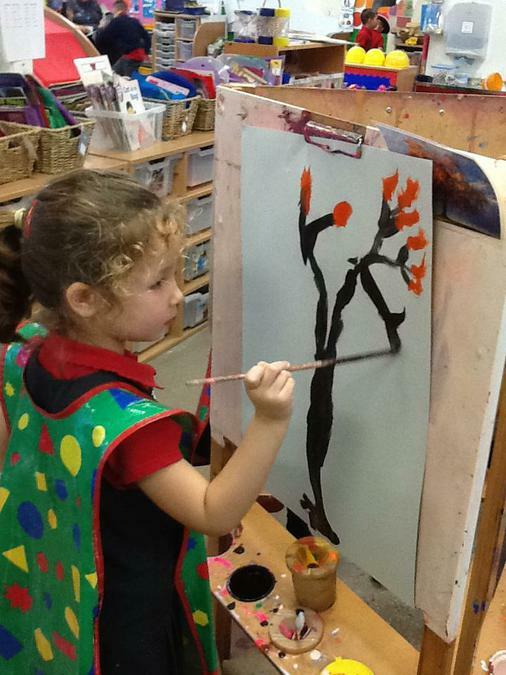 We enjoyed having Dreamtime Aboriginal workshops. 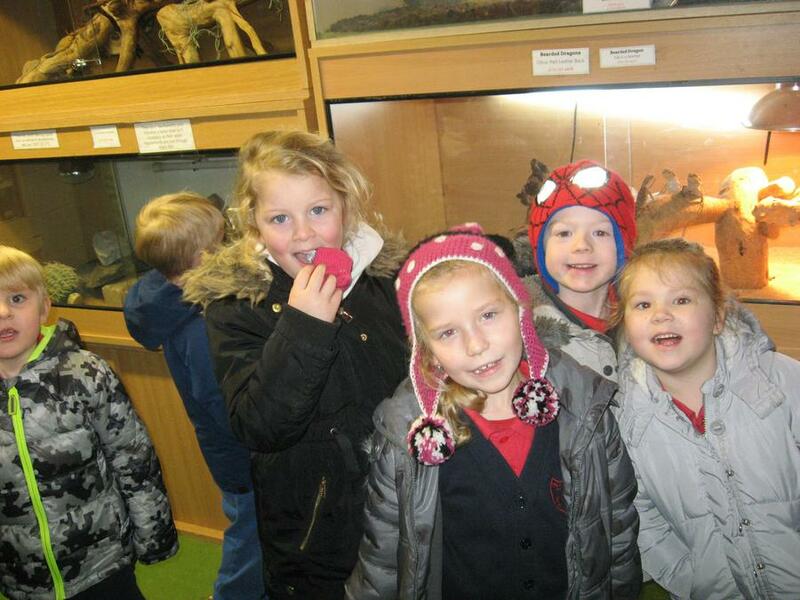 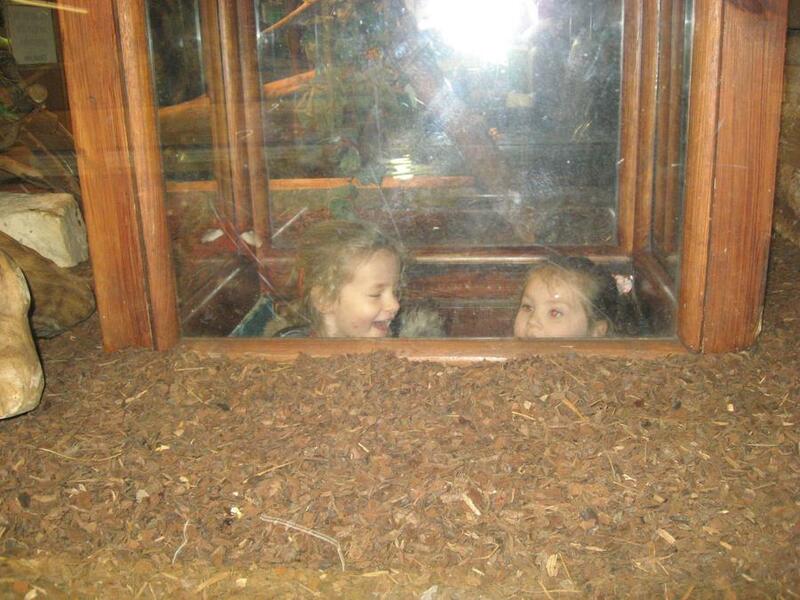 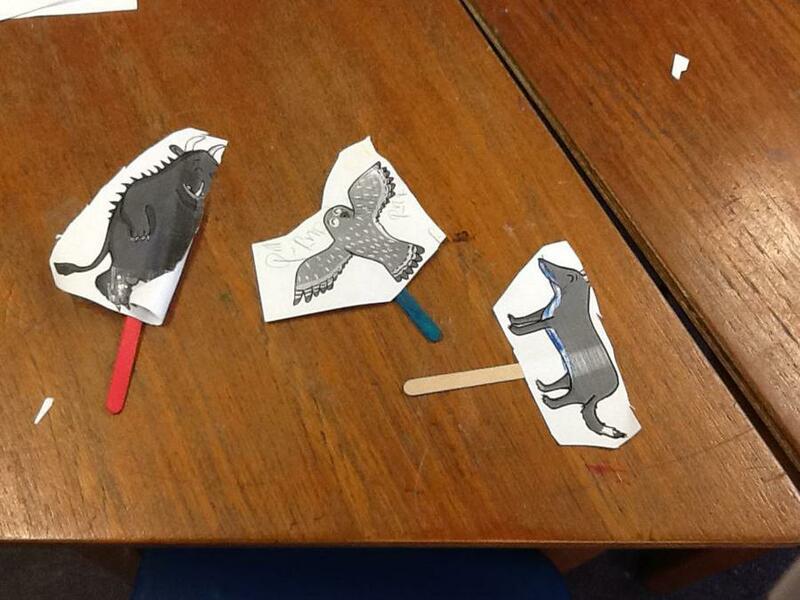 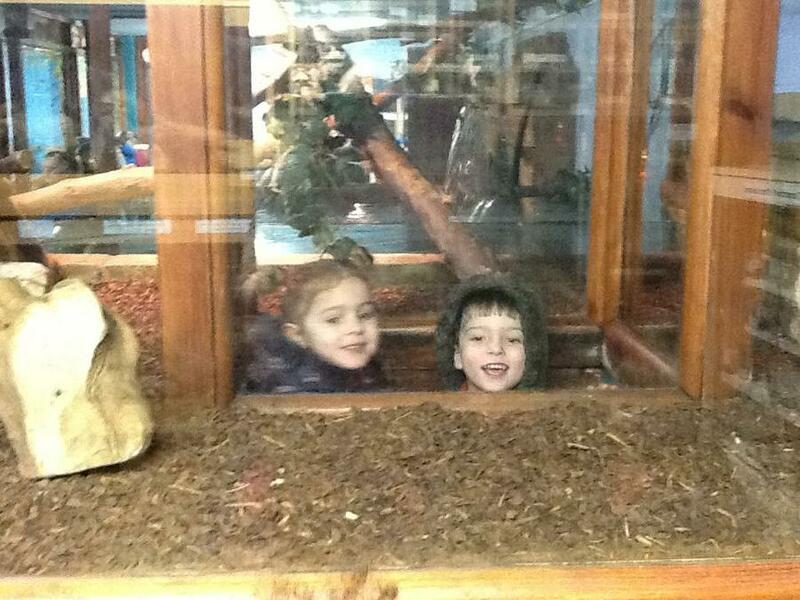 Here we learnt all about Australian animals. 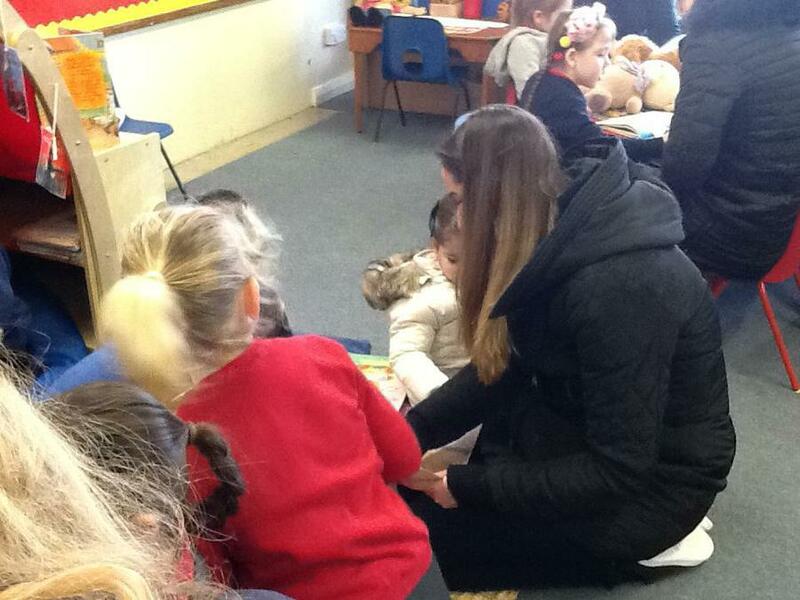 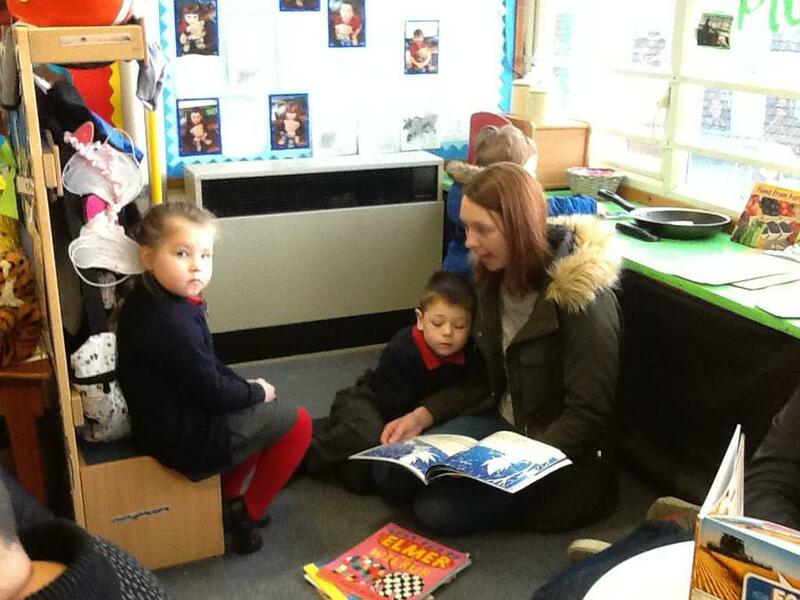 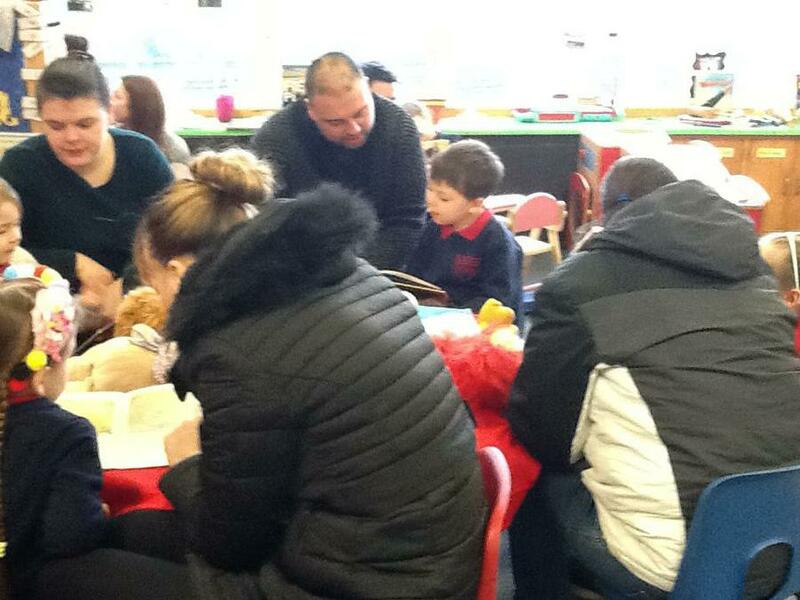 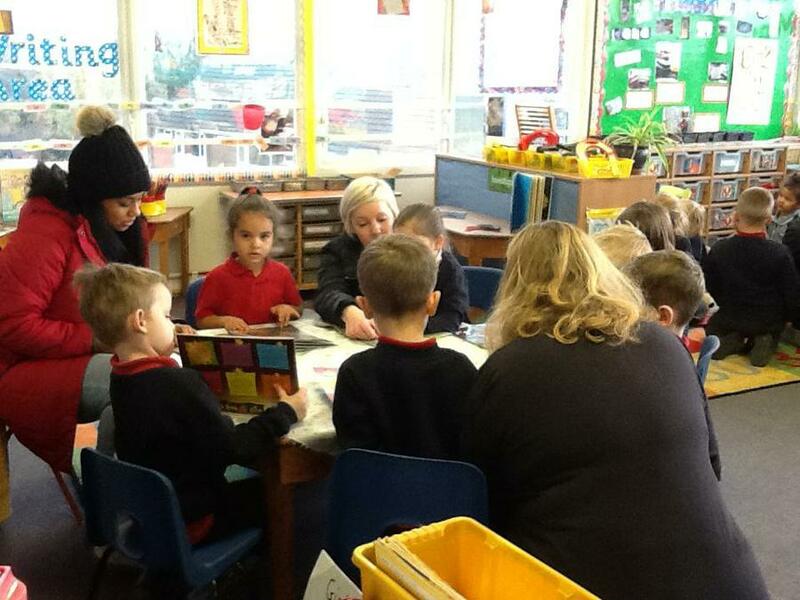 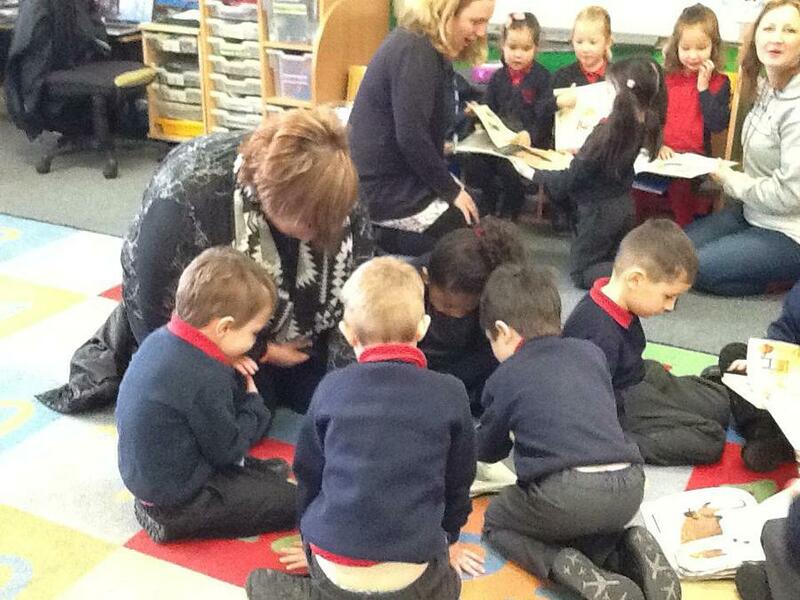 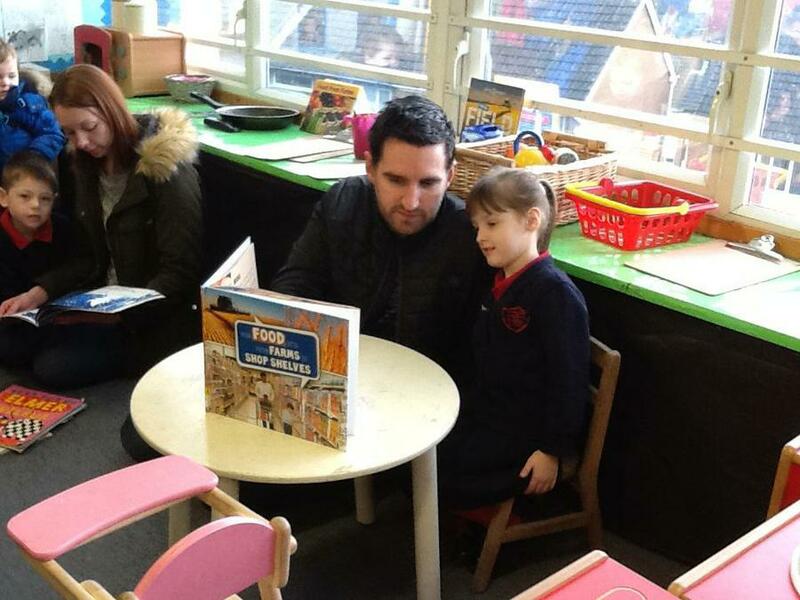 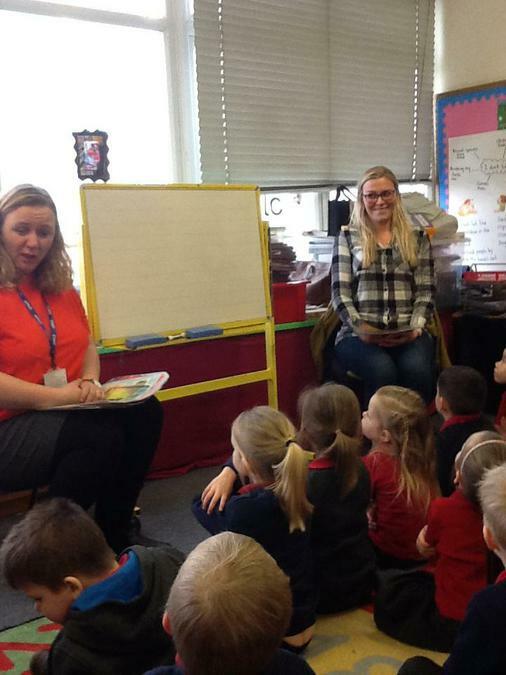 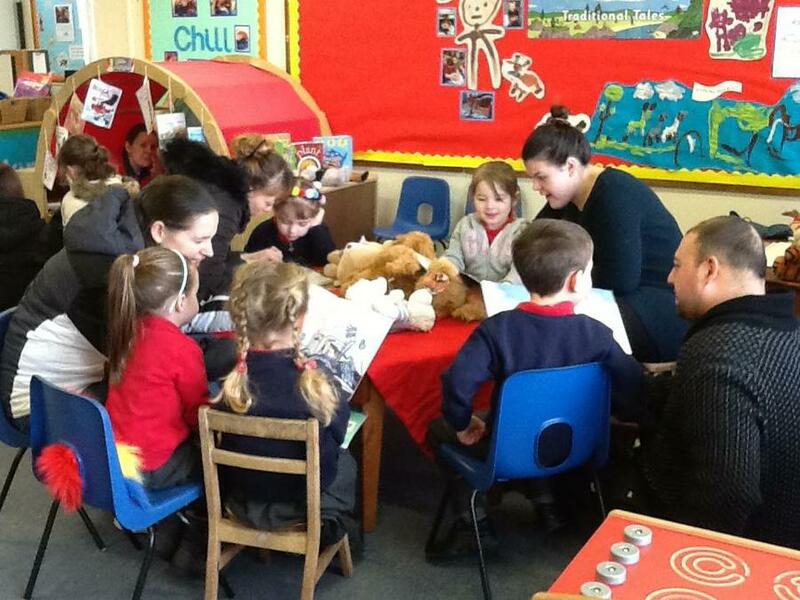 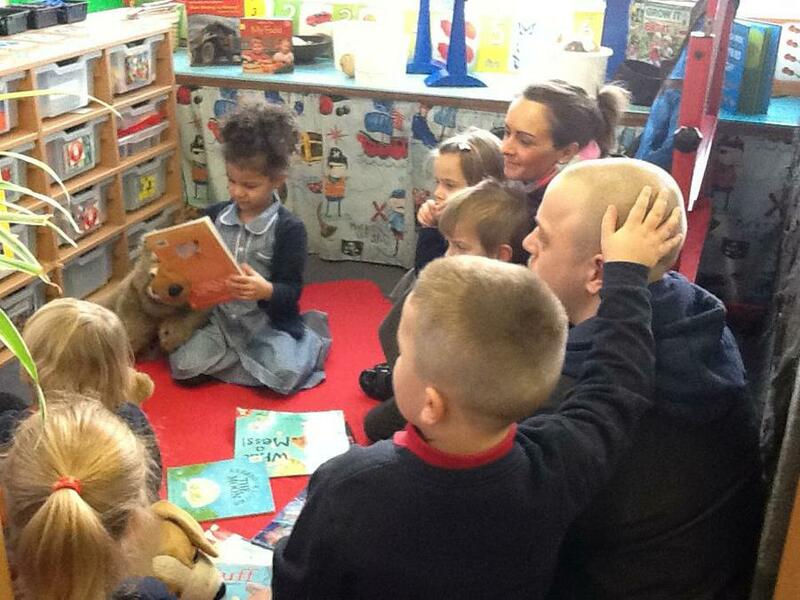 One morning parents came into F2 and shared stories with the children. 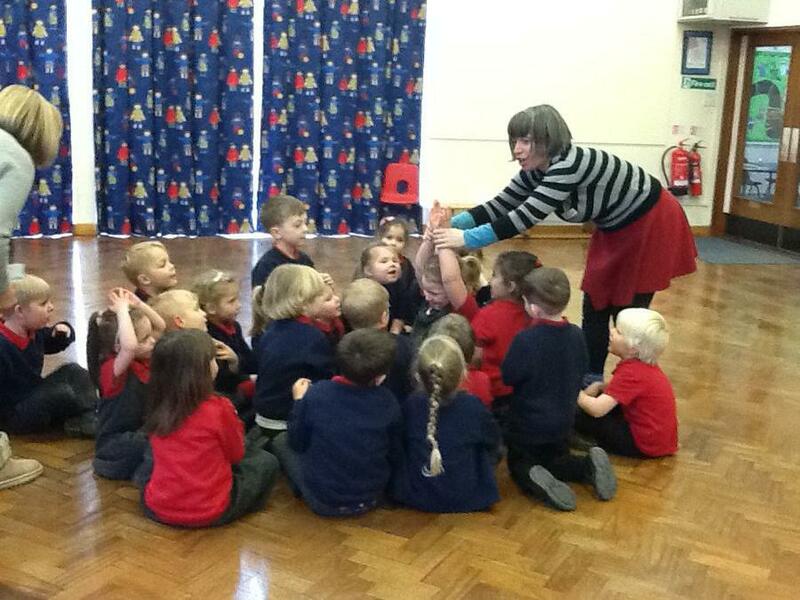 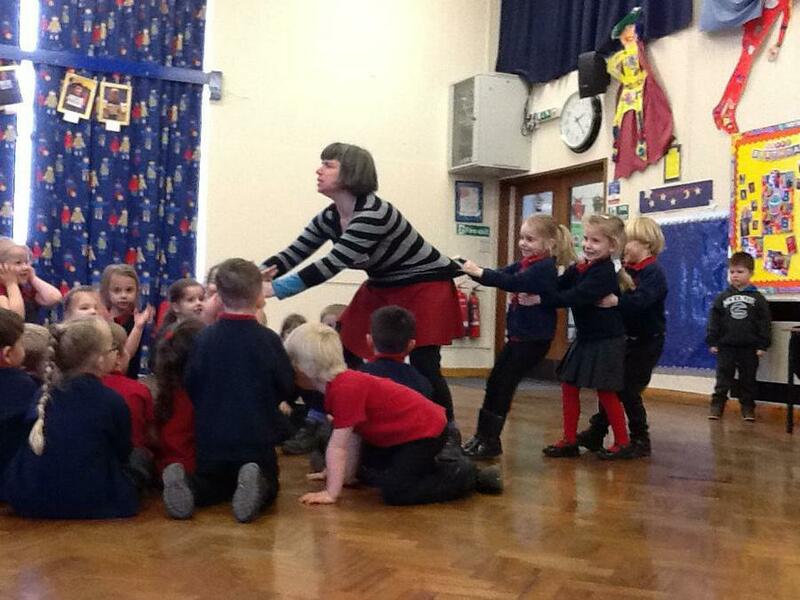 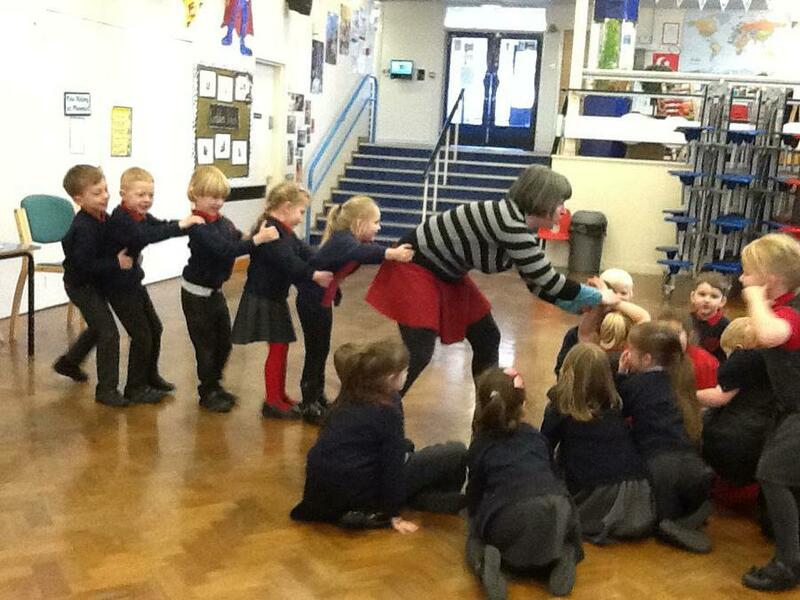 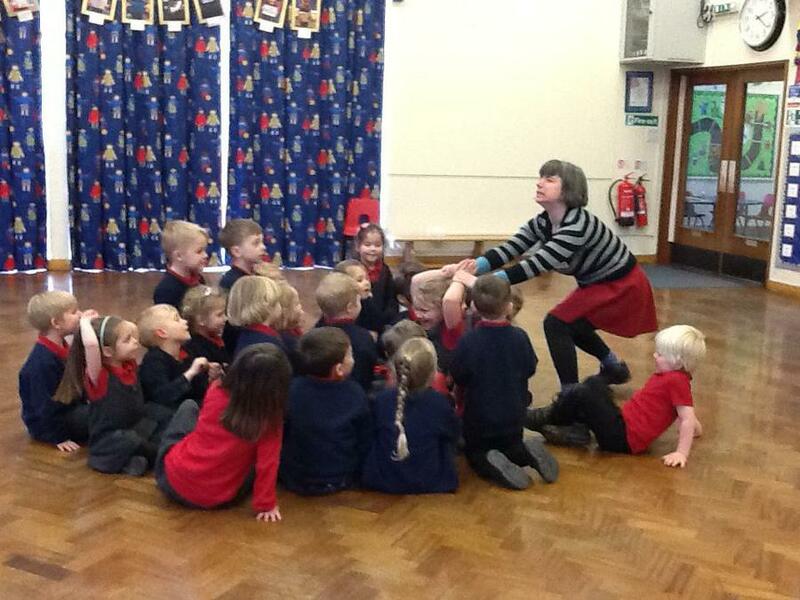 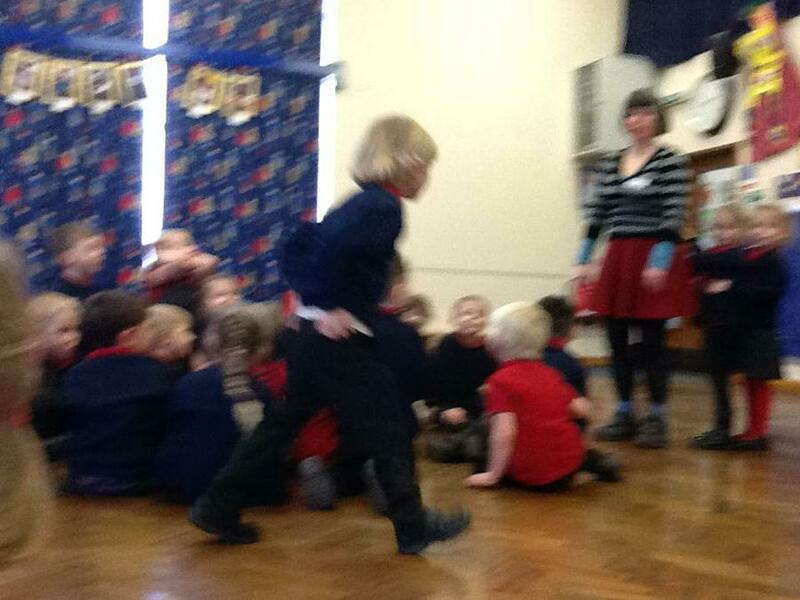 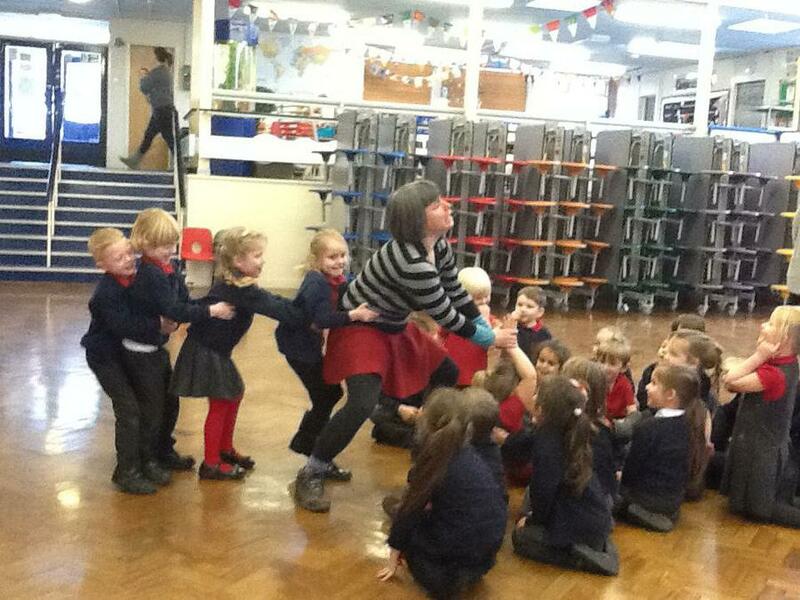 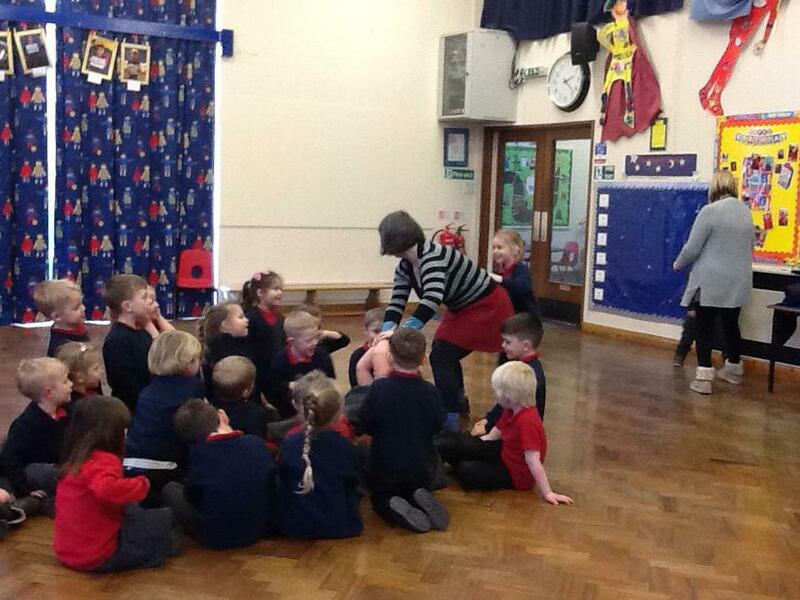 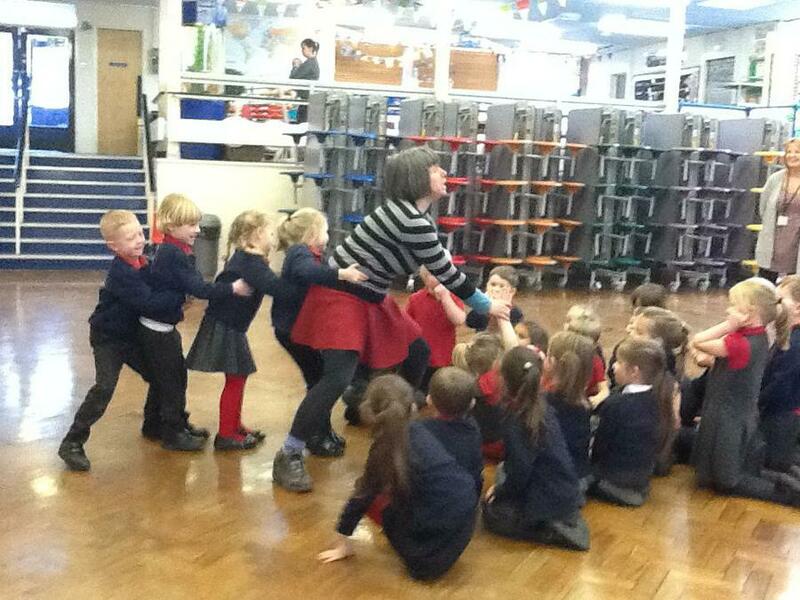 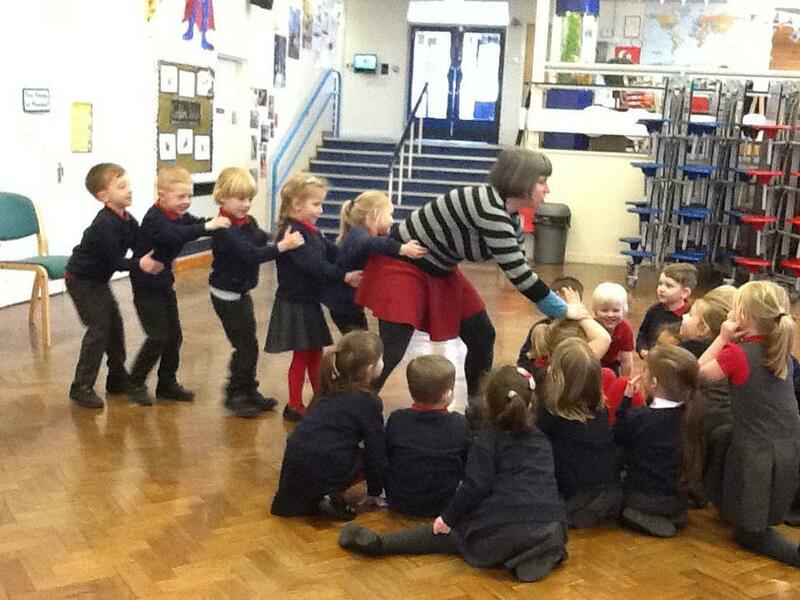 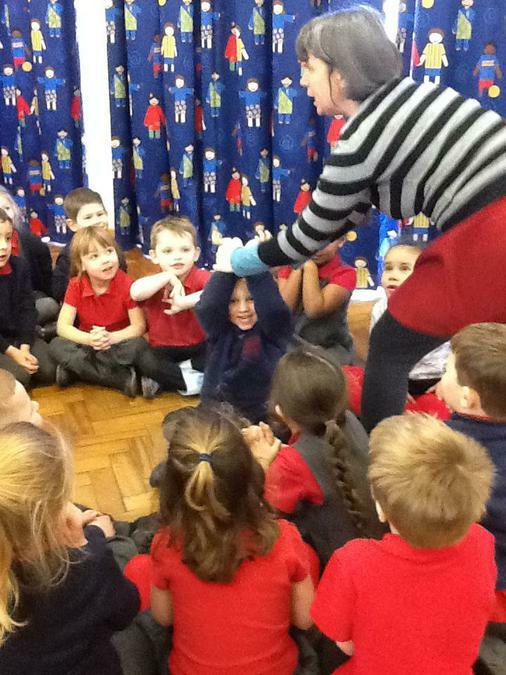 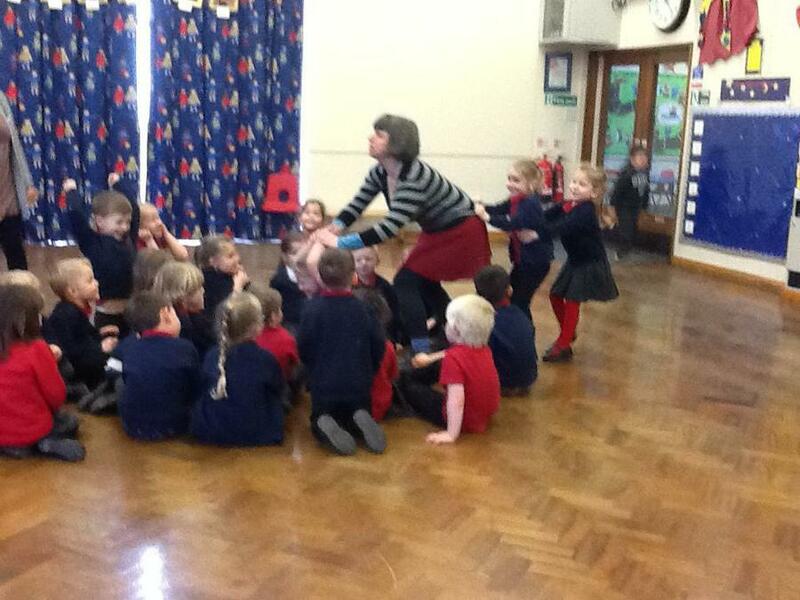 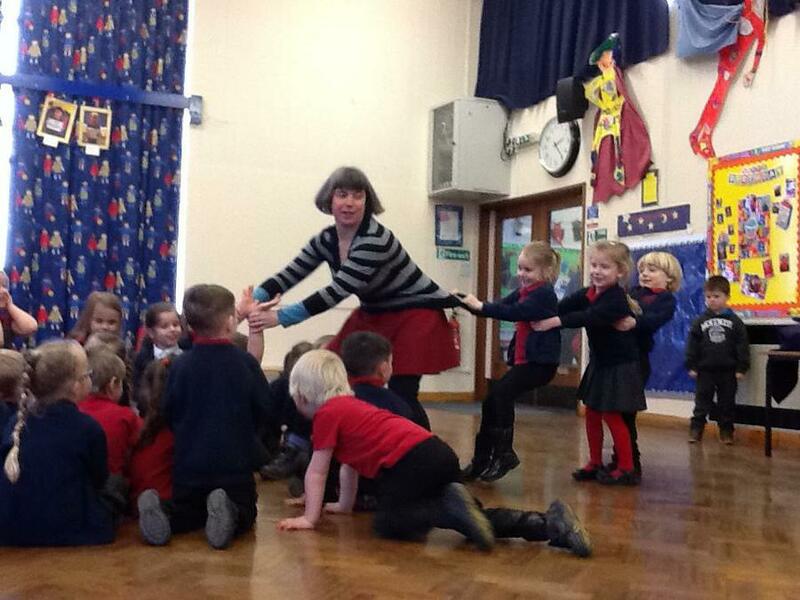 We had Sprouts drama group come in and re-told our story of the week using the characters from the book. 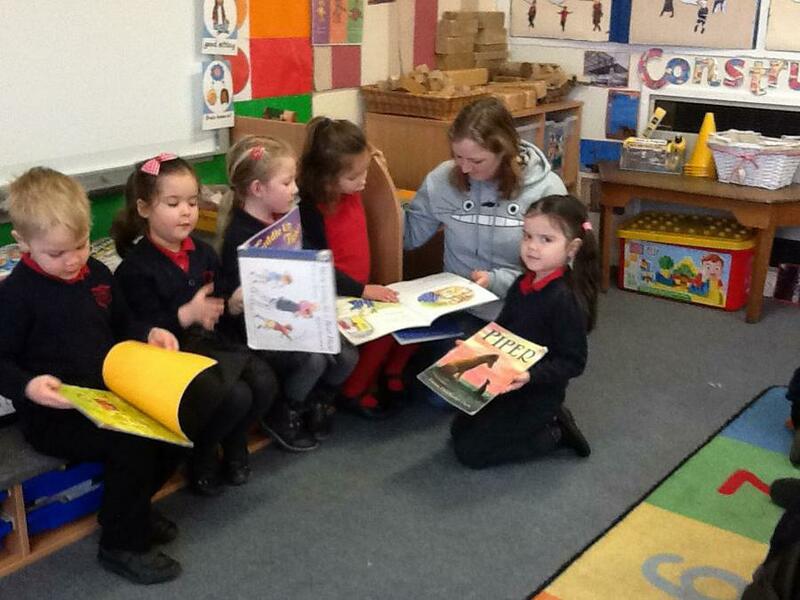 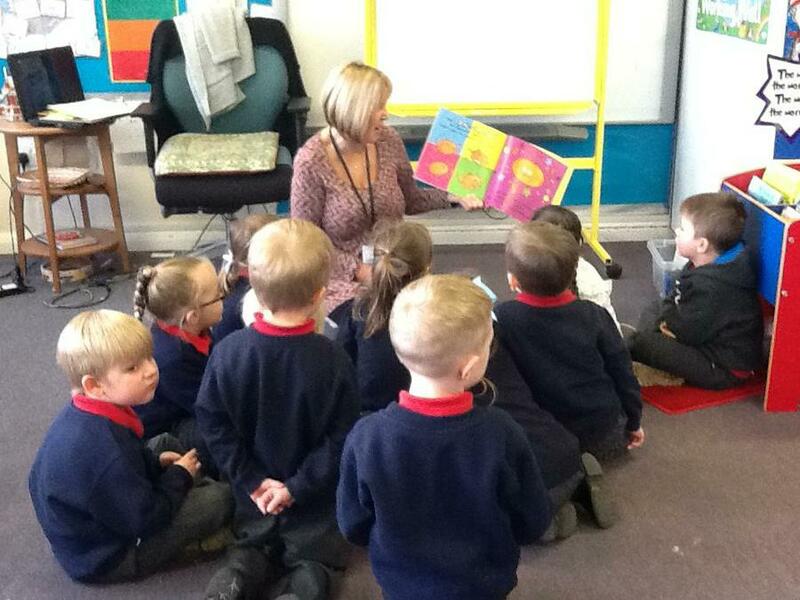 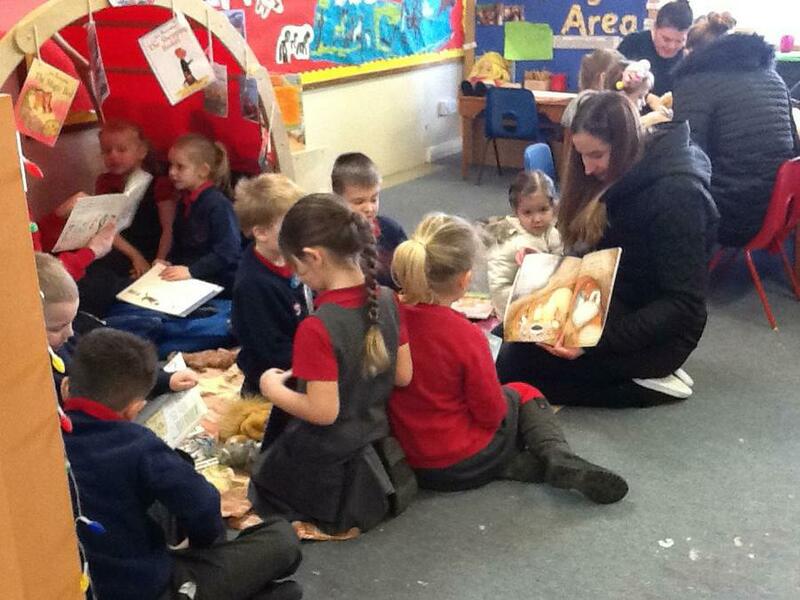 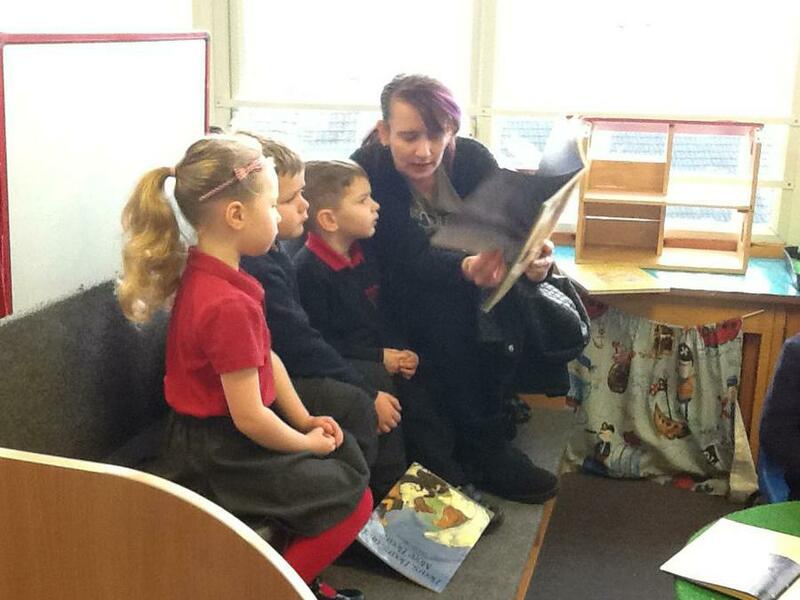 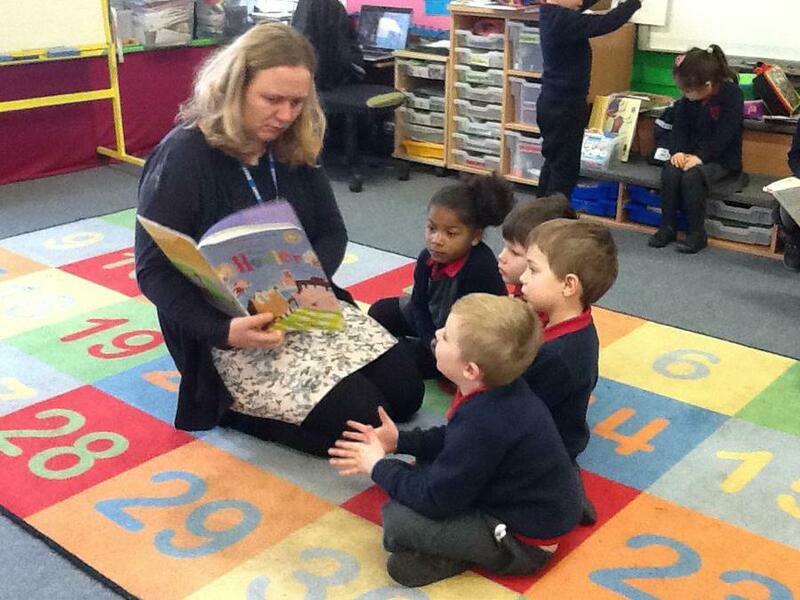 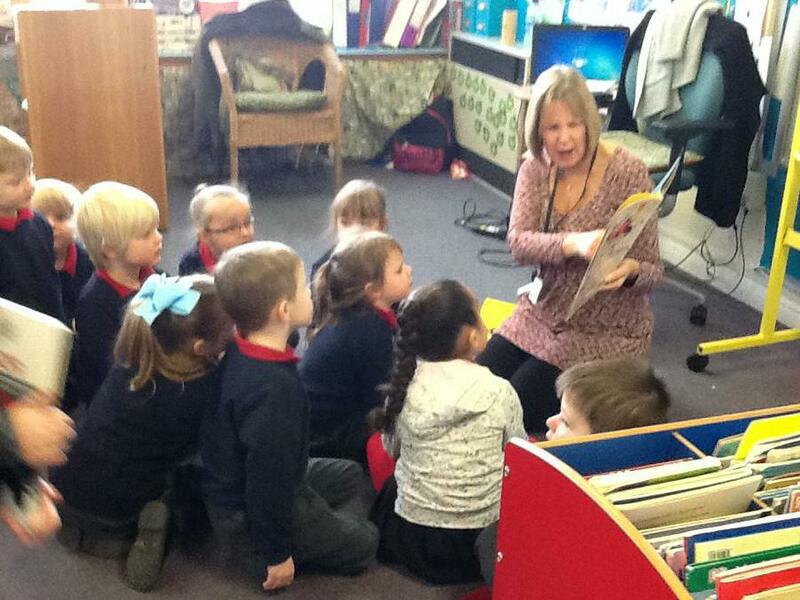 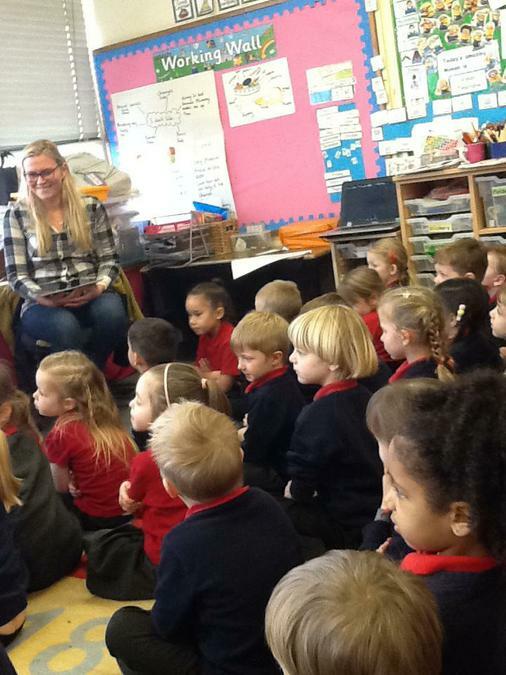 We also had a bilingual story read to all the children in F2. 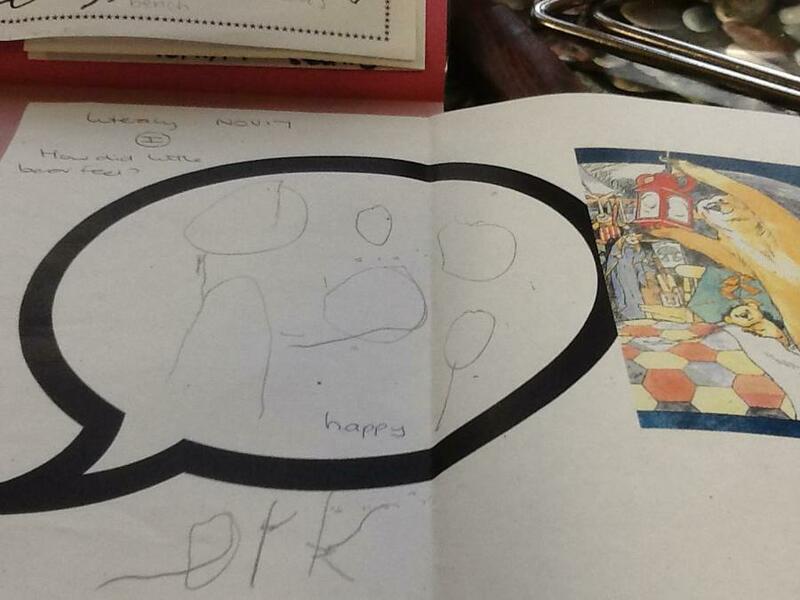 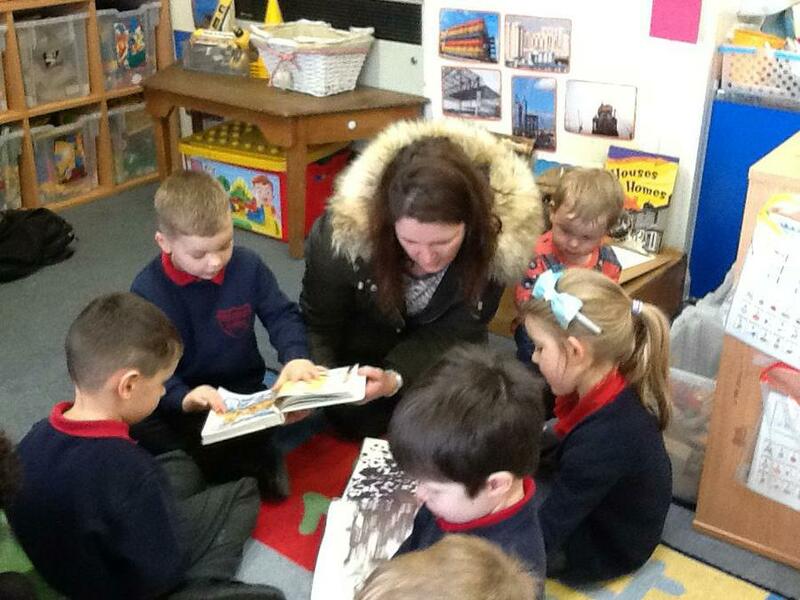 We read a different version of the Enormous Turnip in English and in Polish! 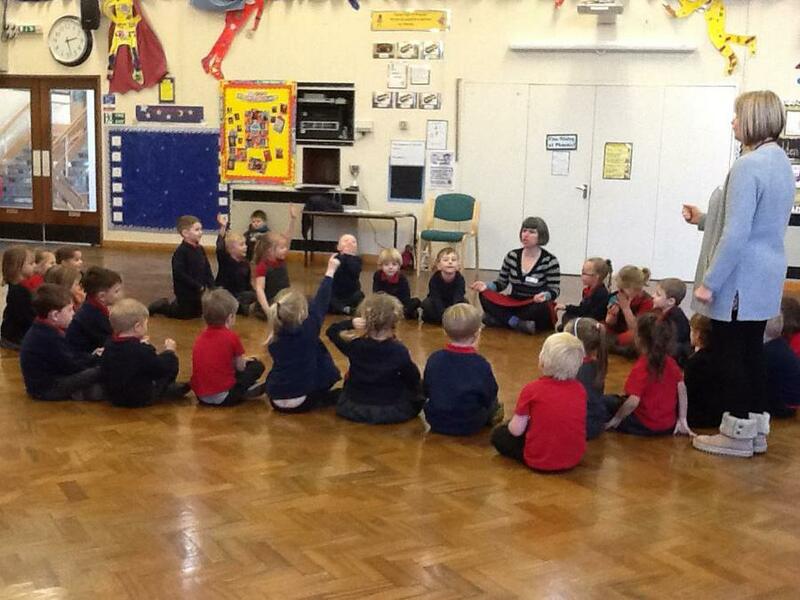 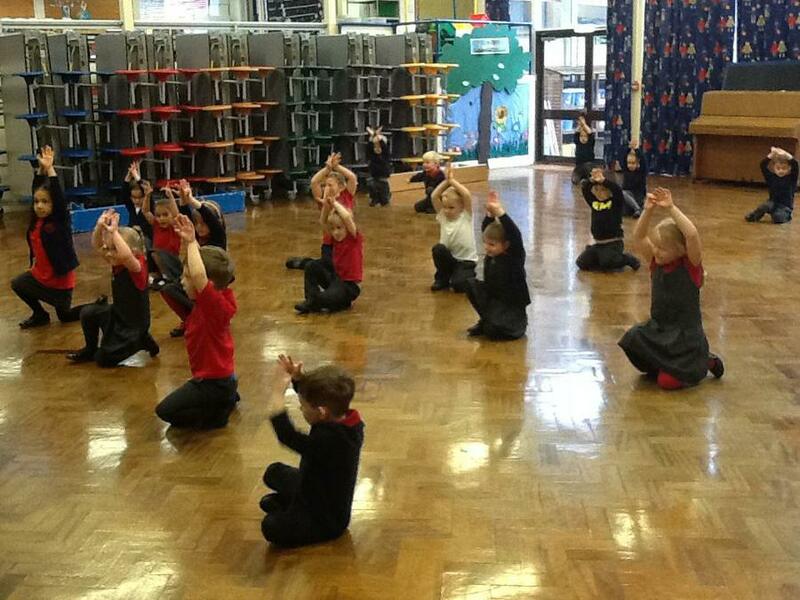 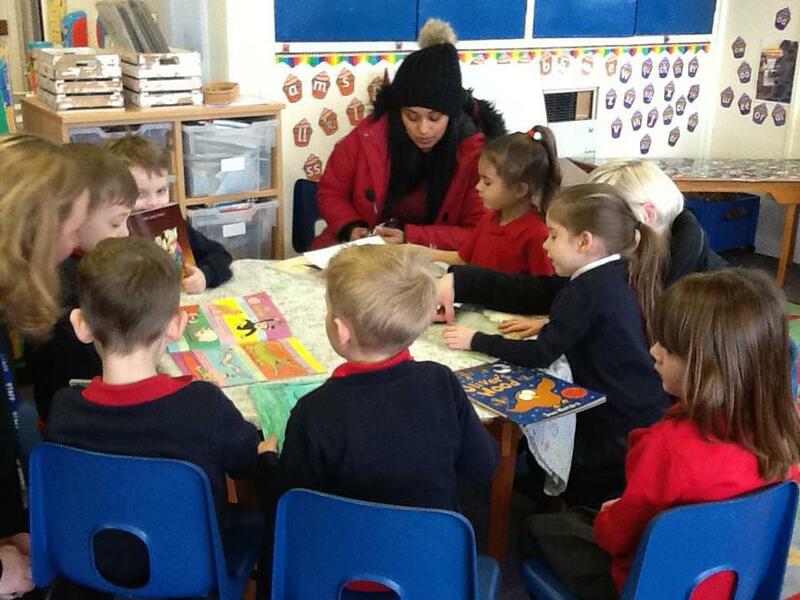 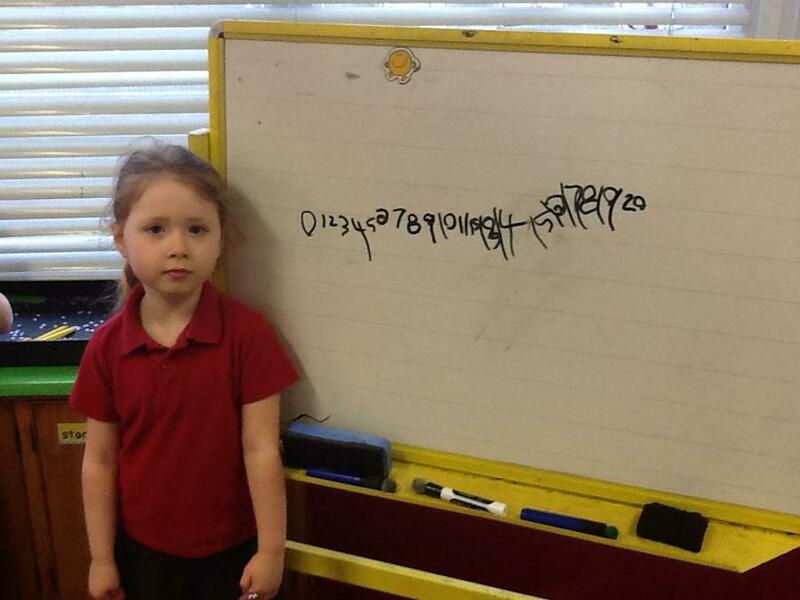 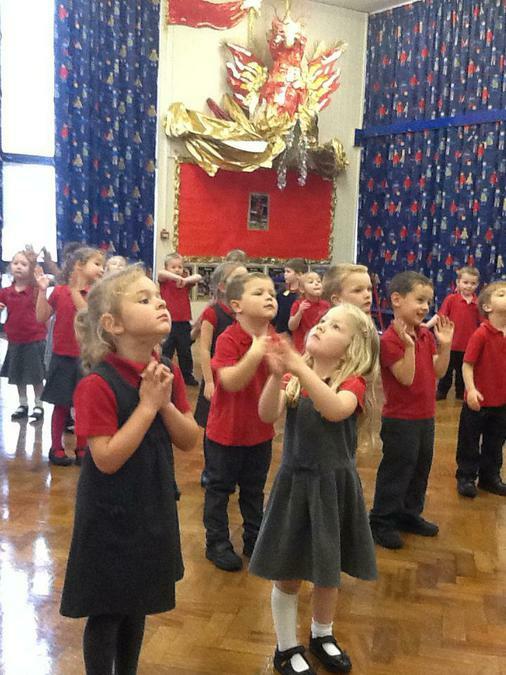 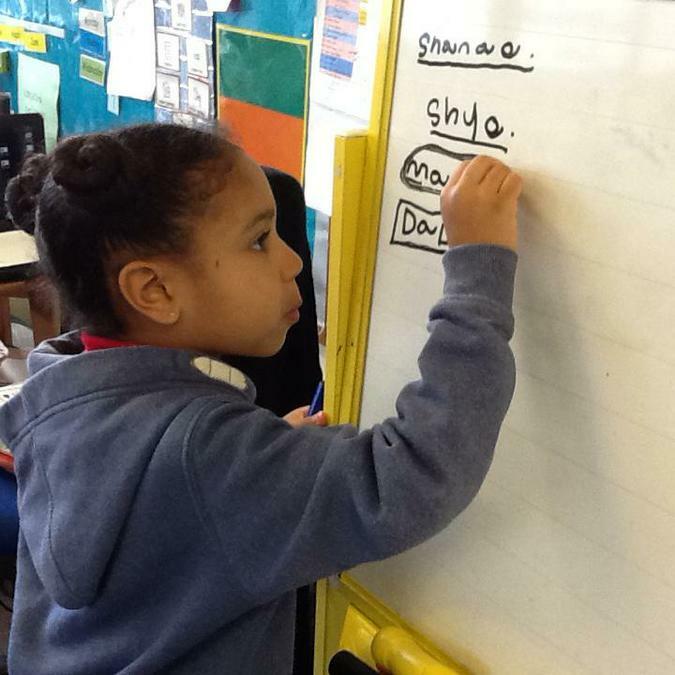 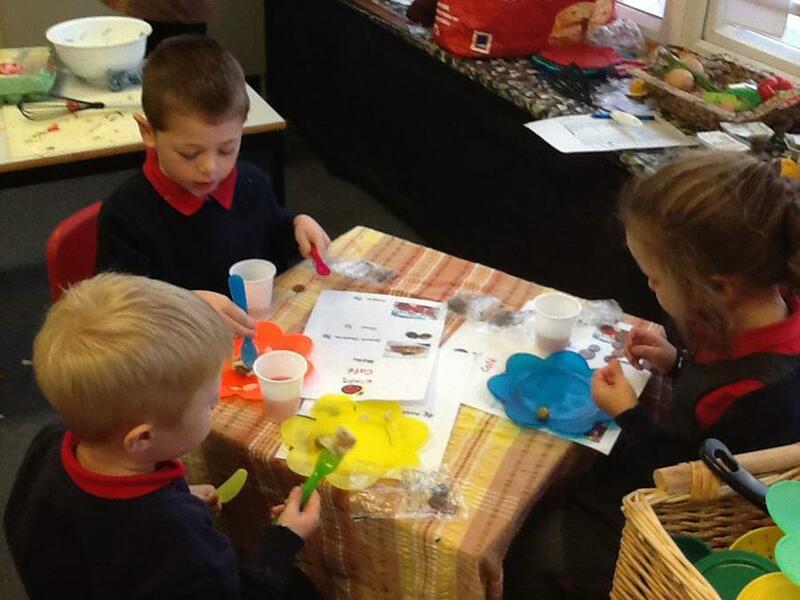 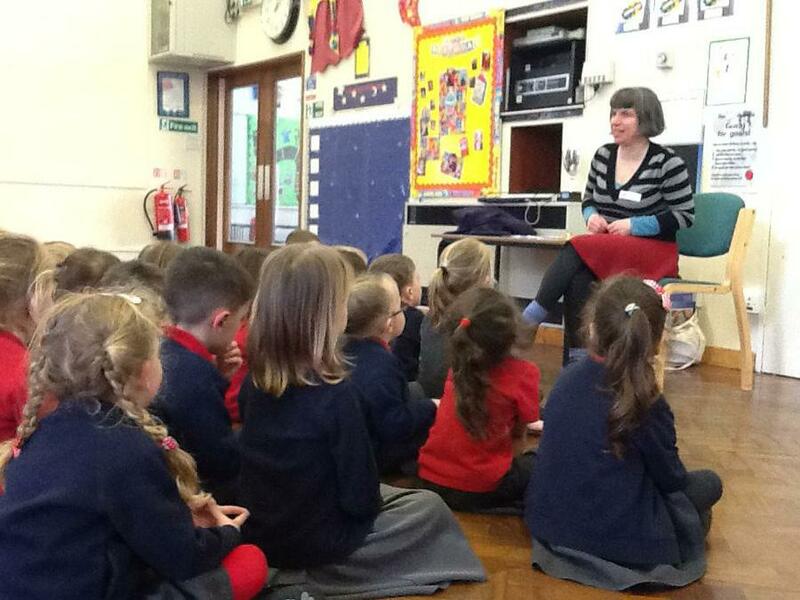 The children were fasinated and so engaged and listened well to the different languages. 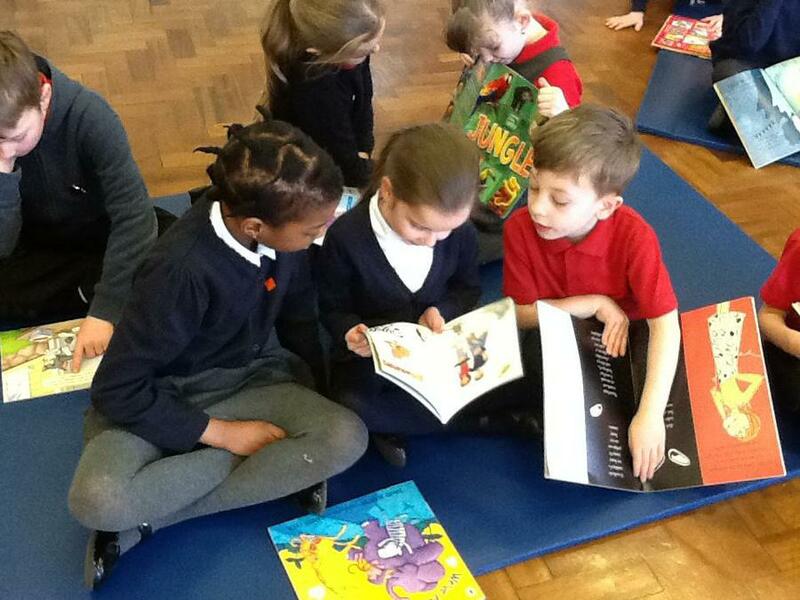 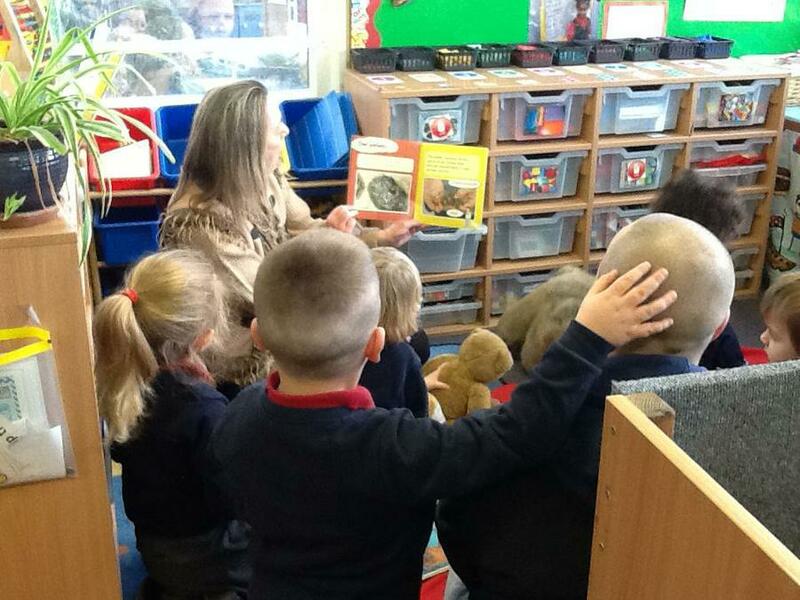 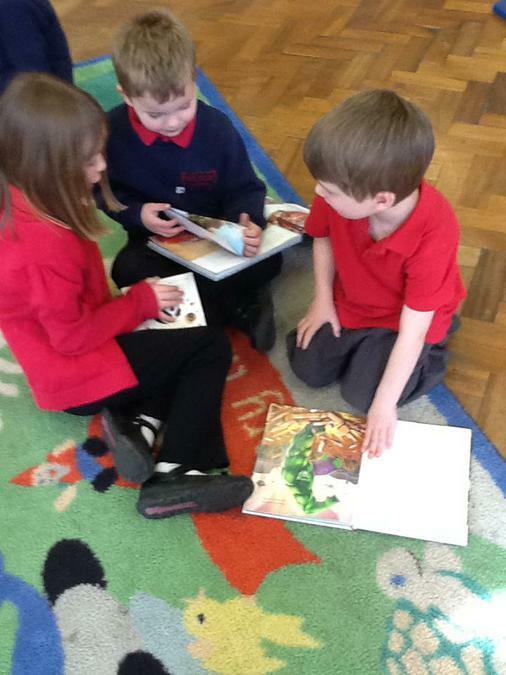 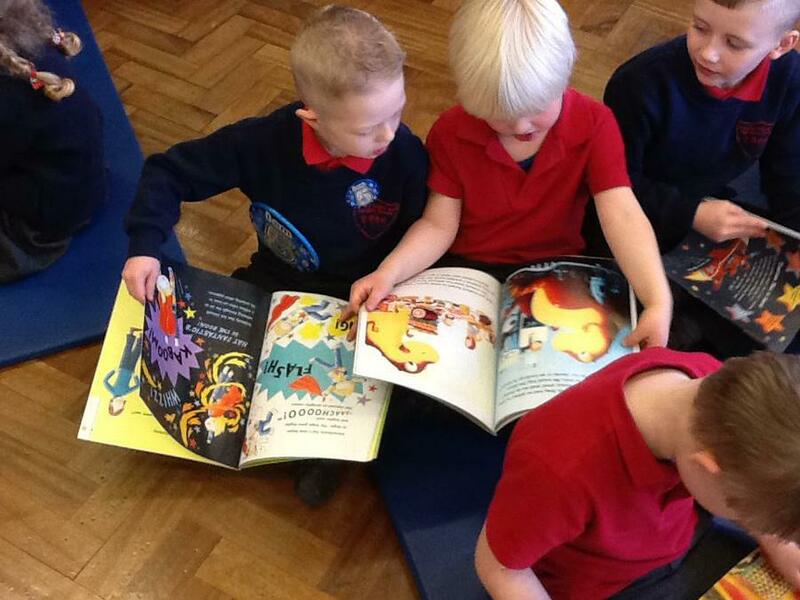 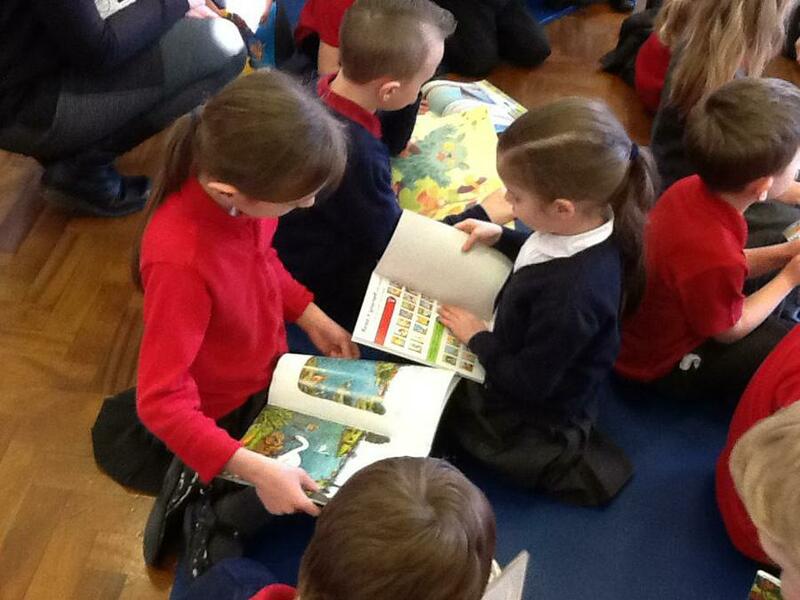 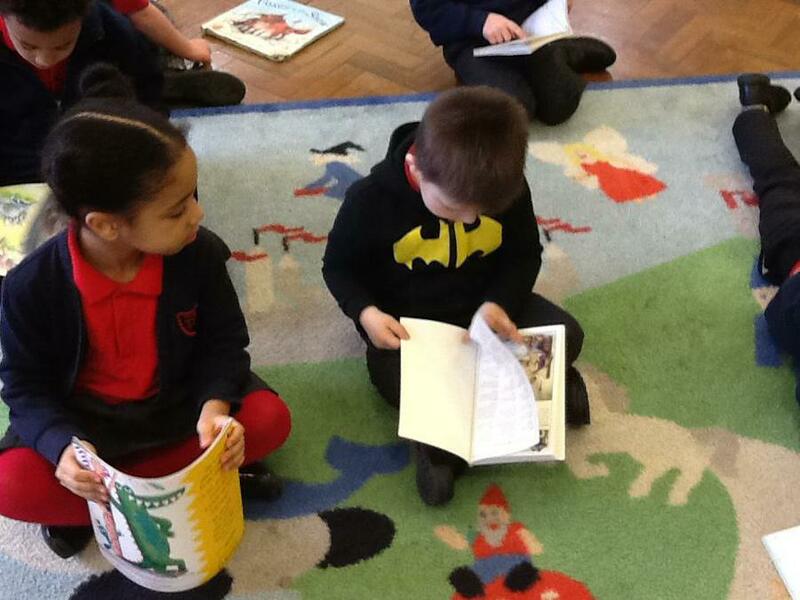 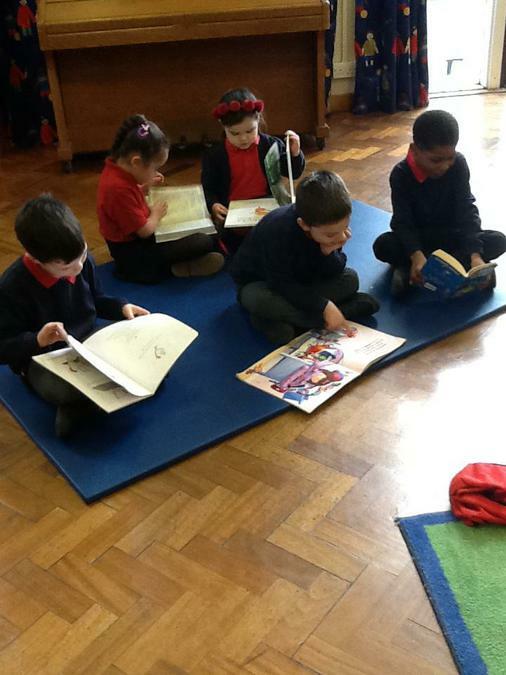 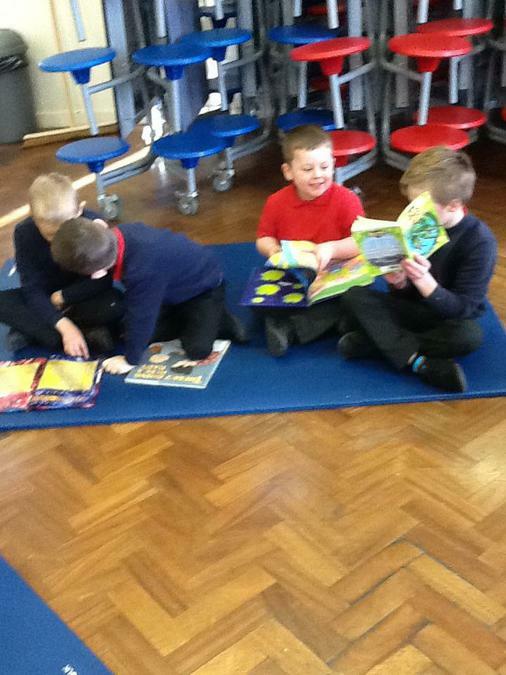 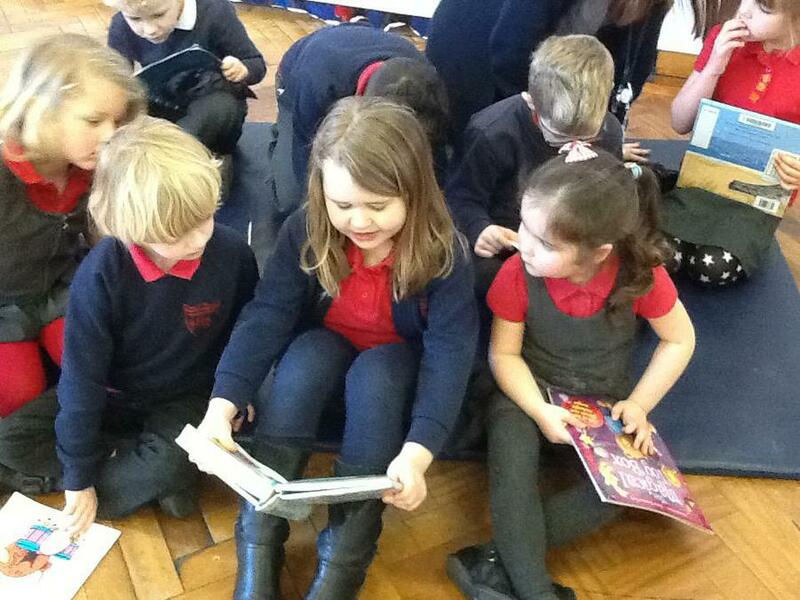 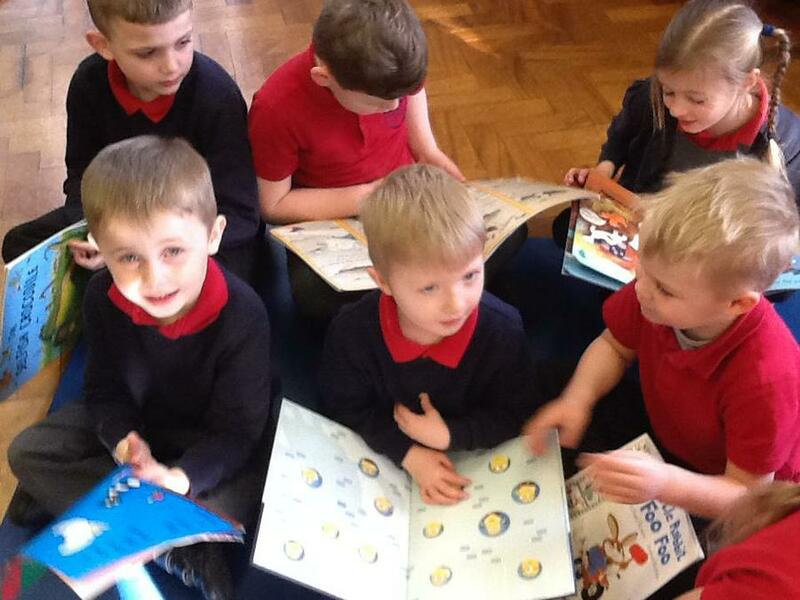 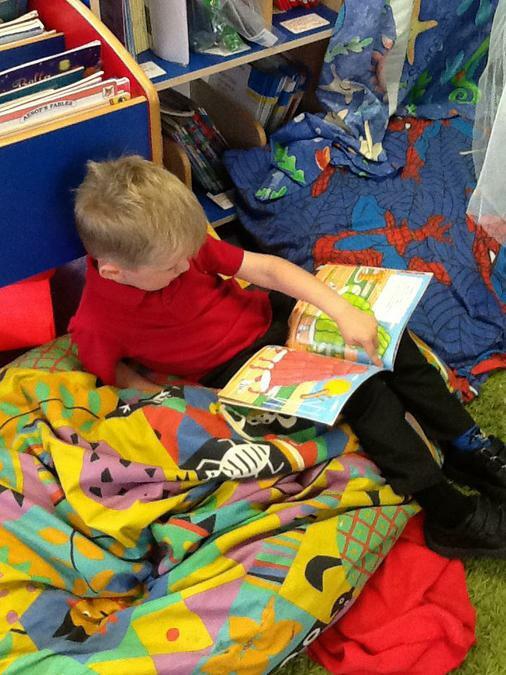 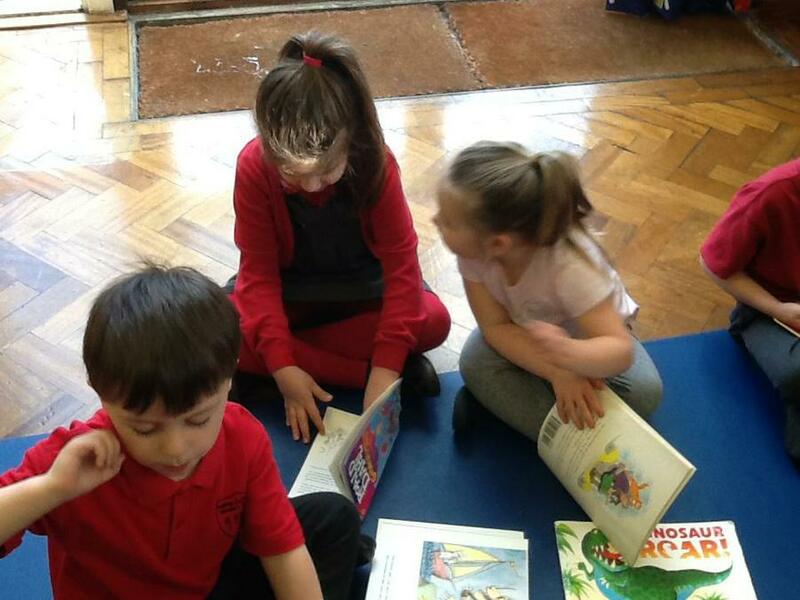 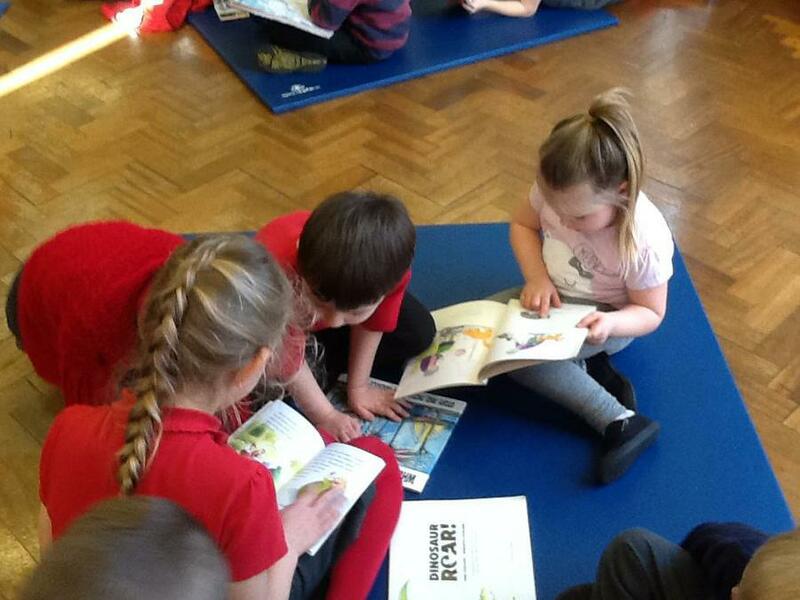 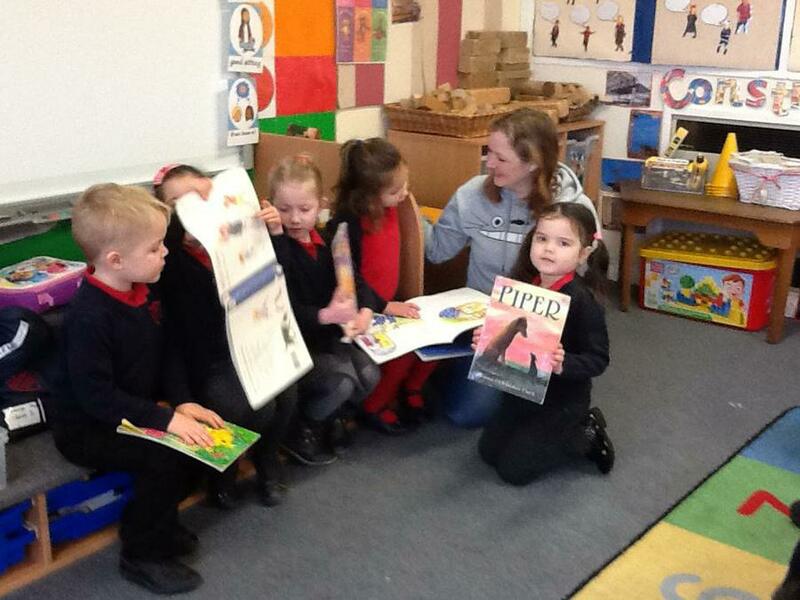 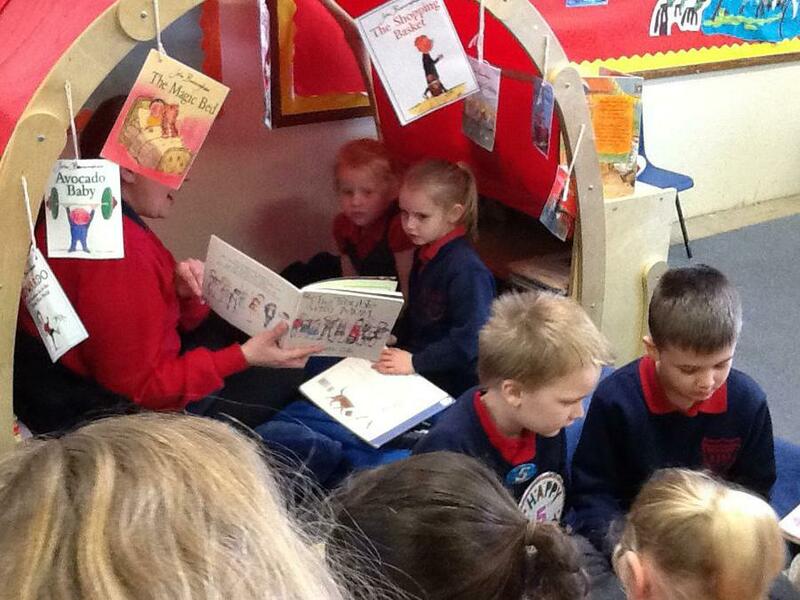 When we came back to school after the snow we all got given a book to read at home. 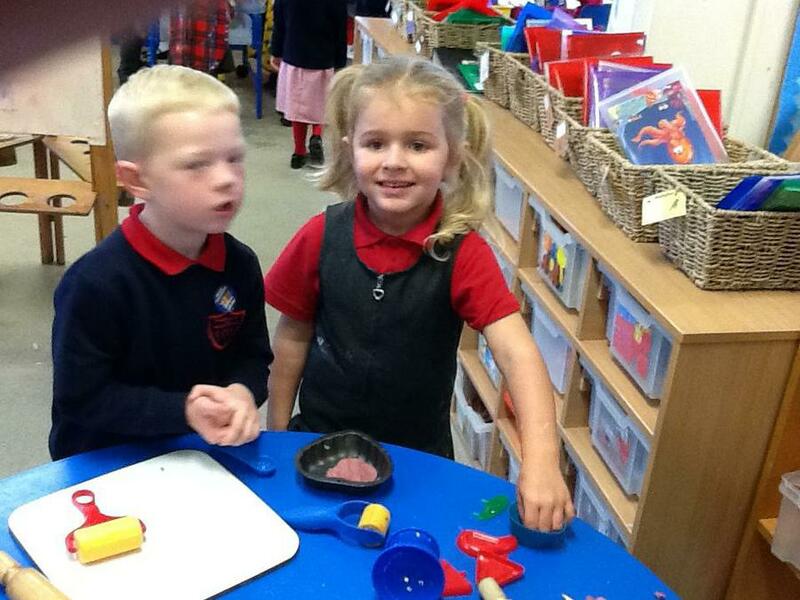 What a busy week we had ! 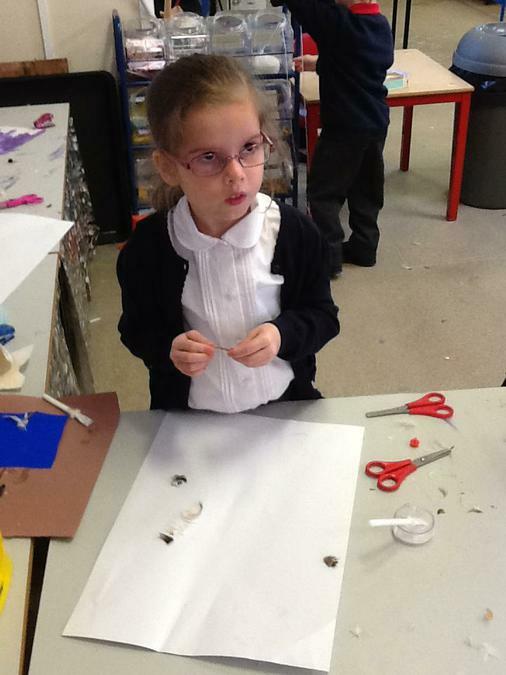 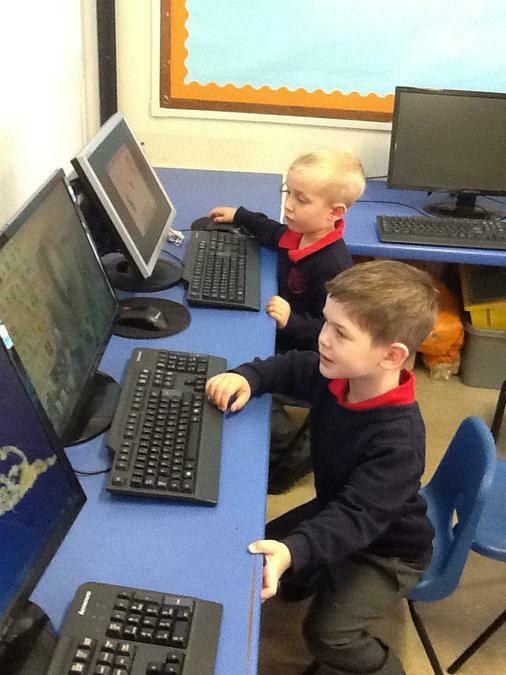 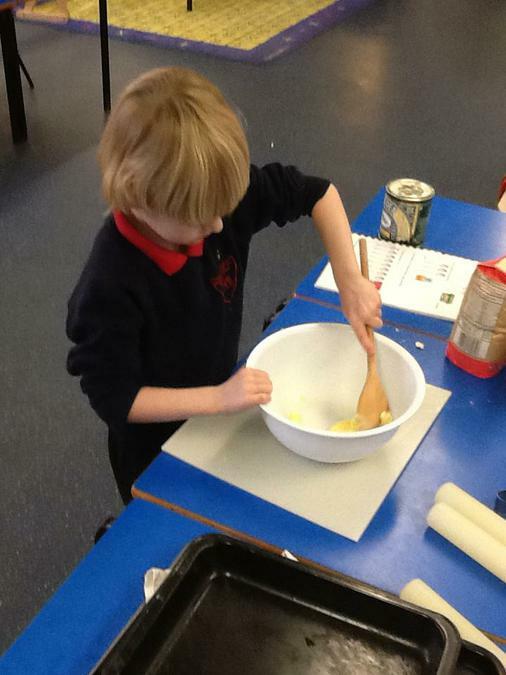 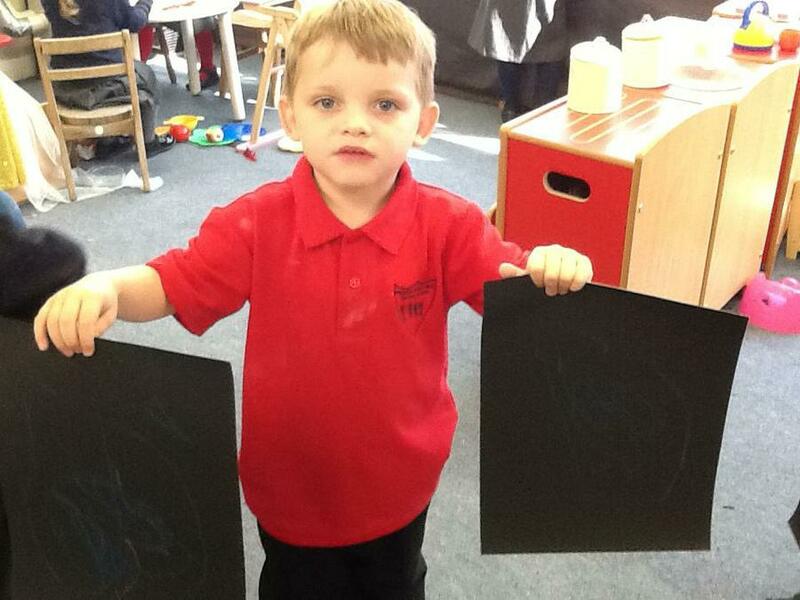 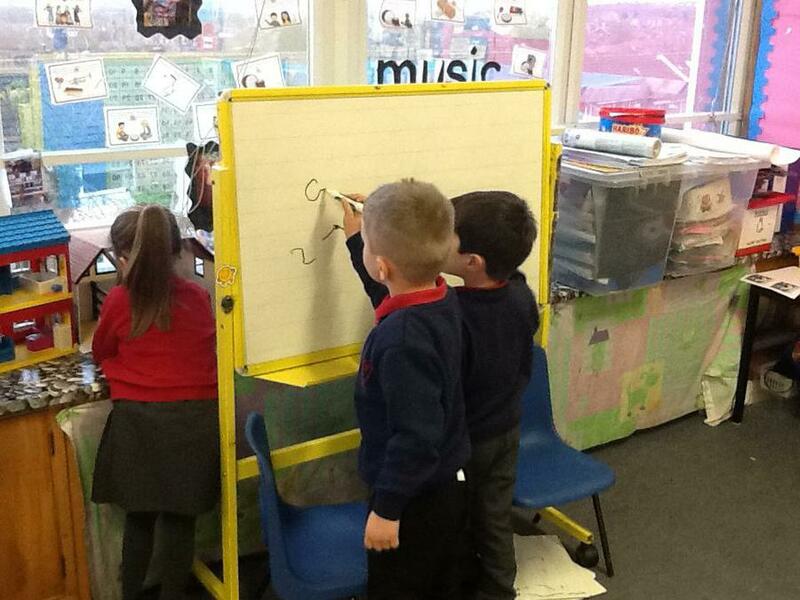 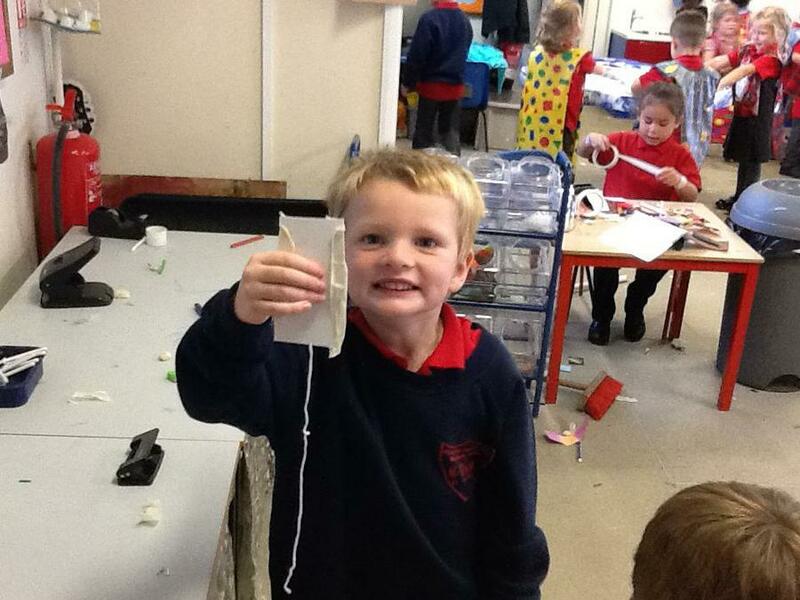 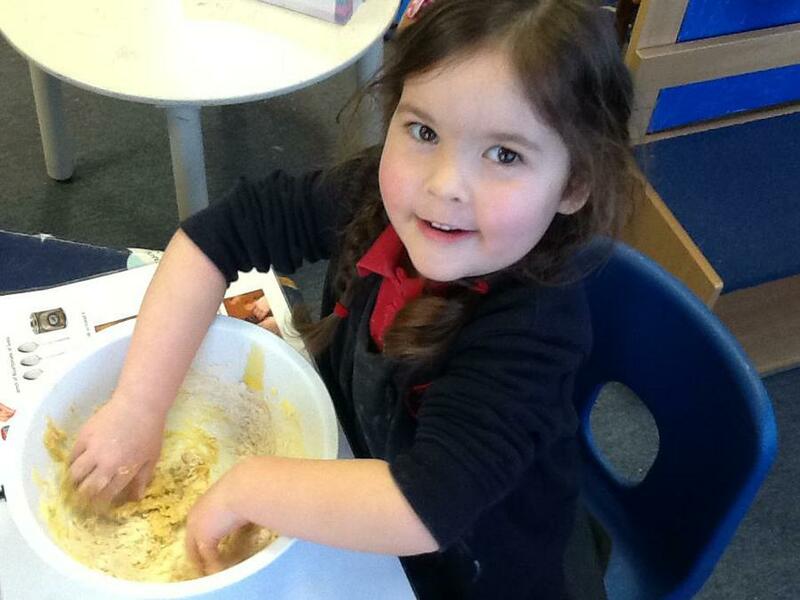 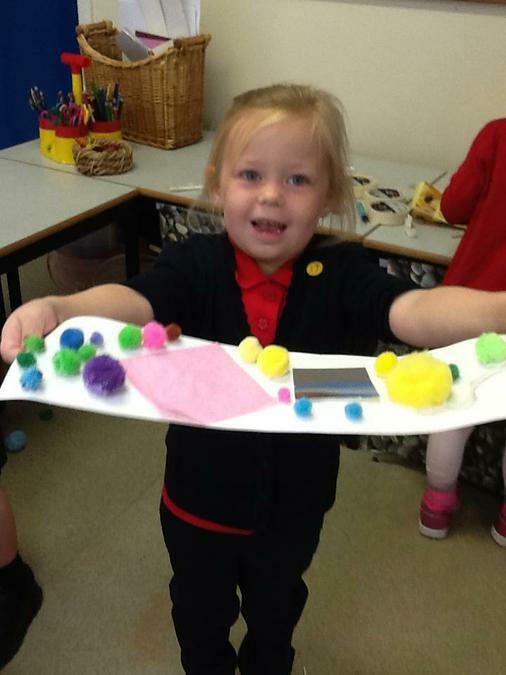 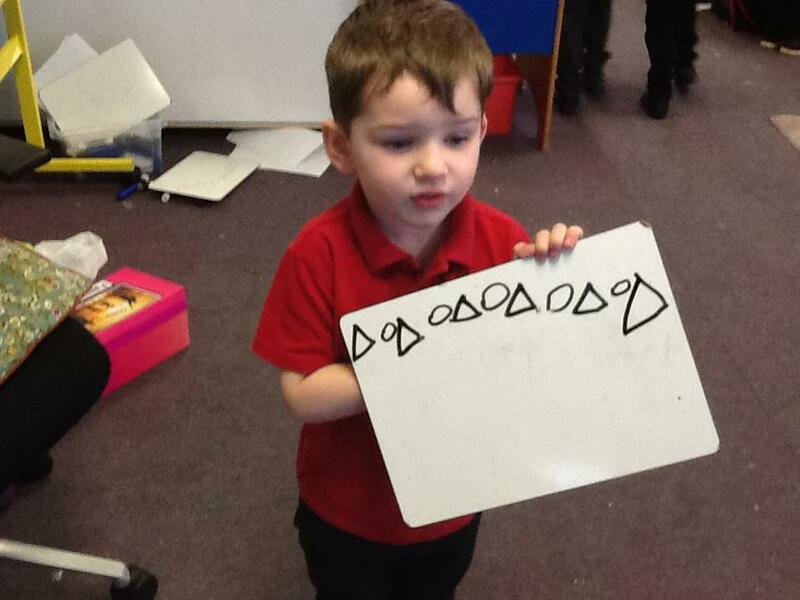 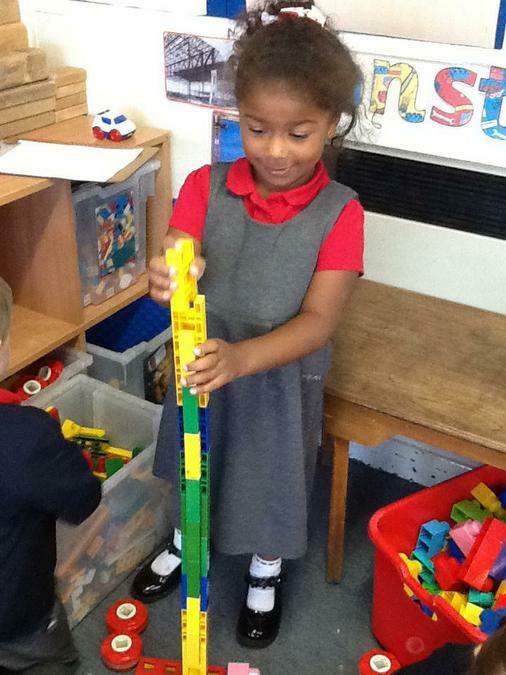 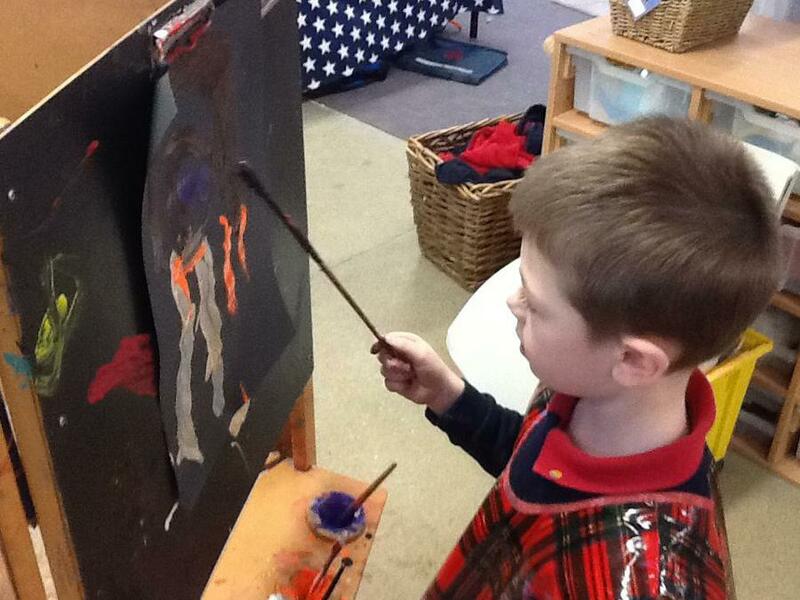 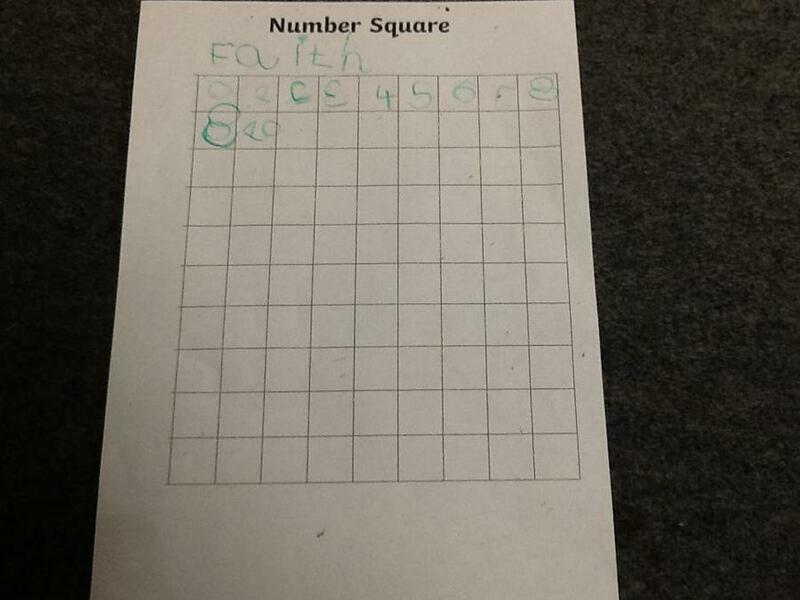 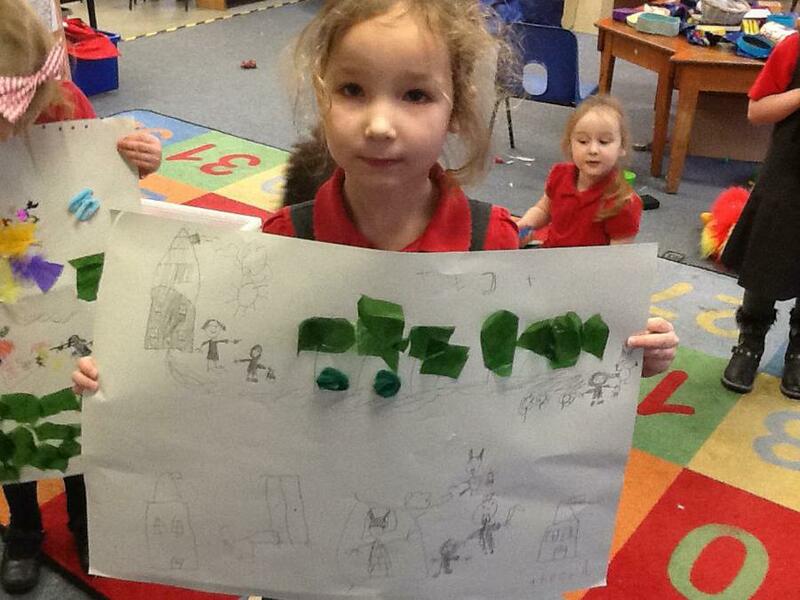 Look on our website to see what other exciting things we do in F2. 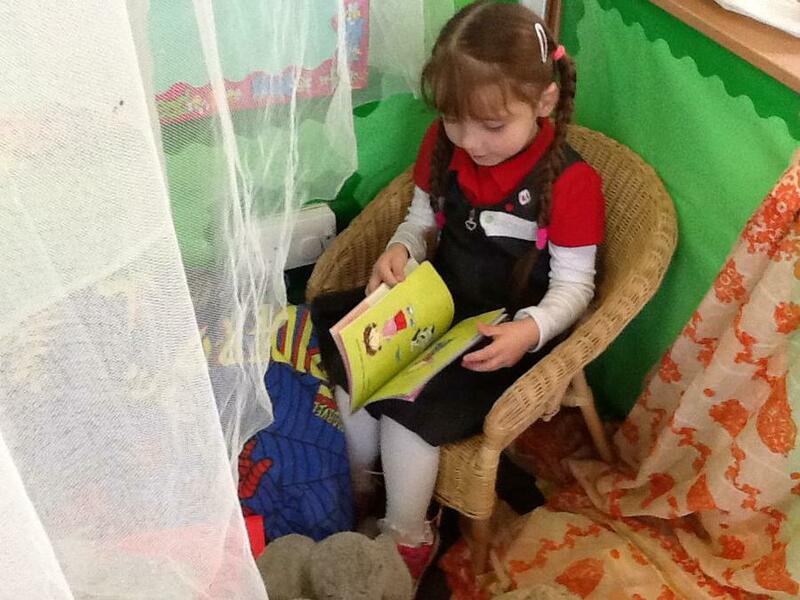 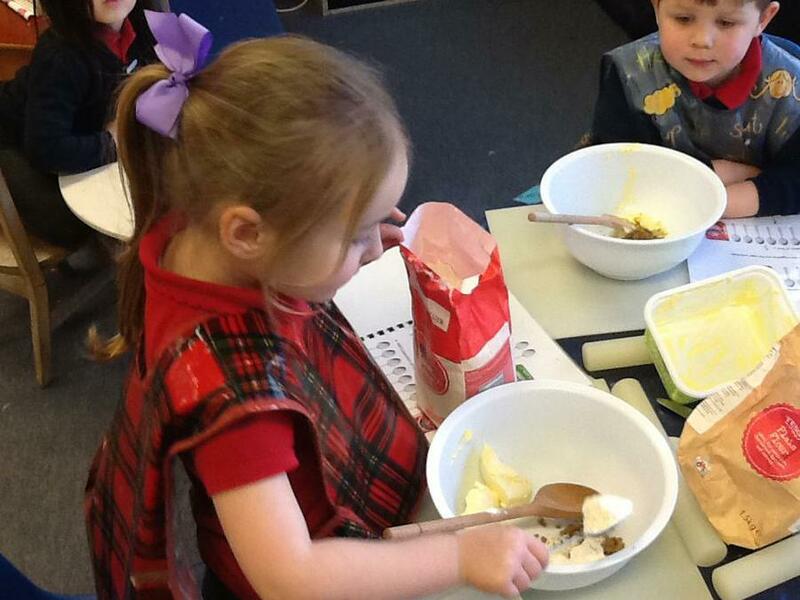 Book week Fun in F2. 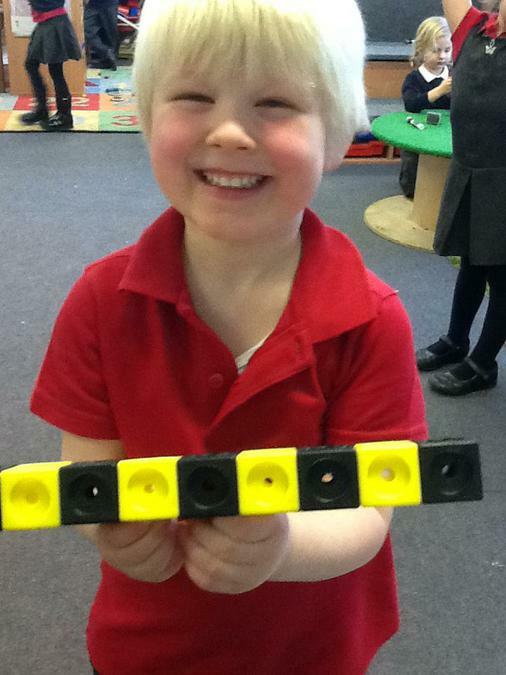 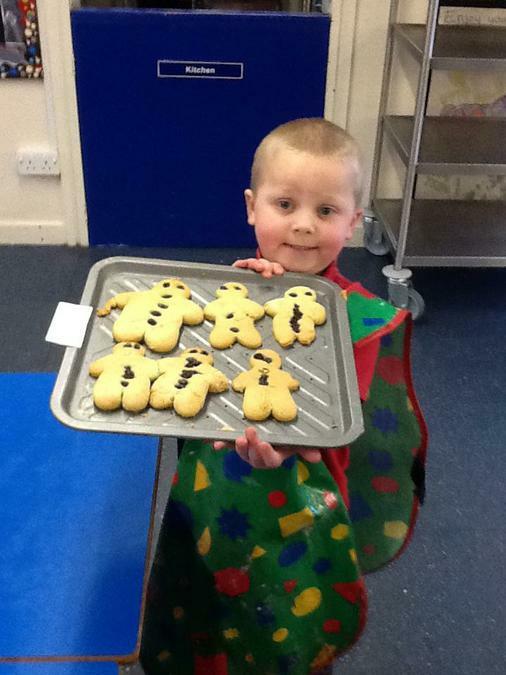 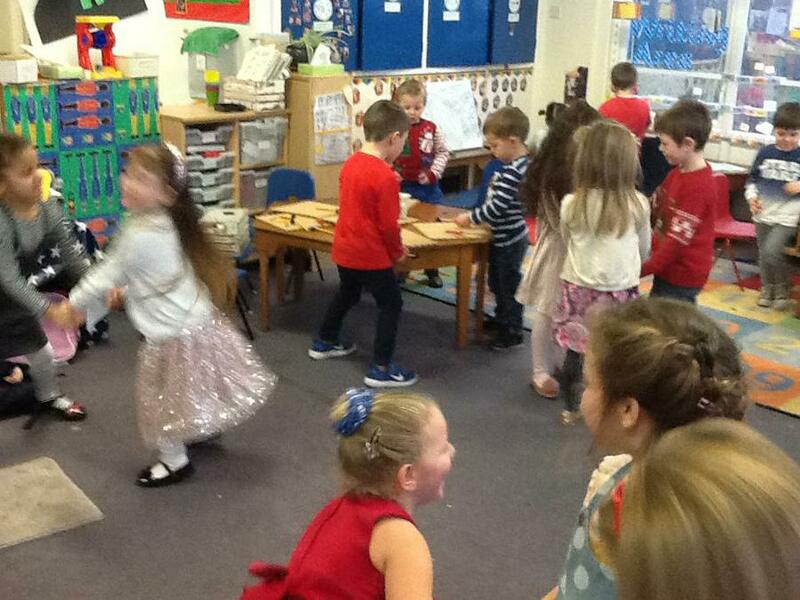 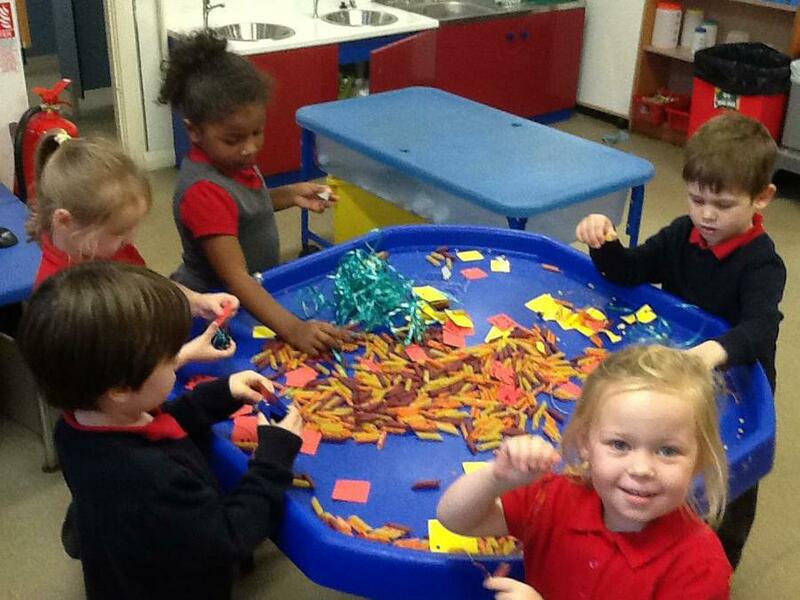 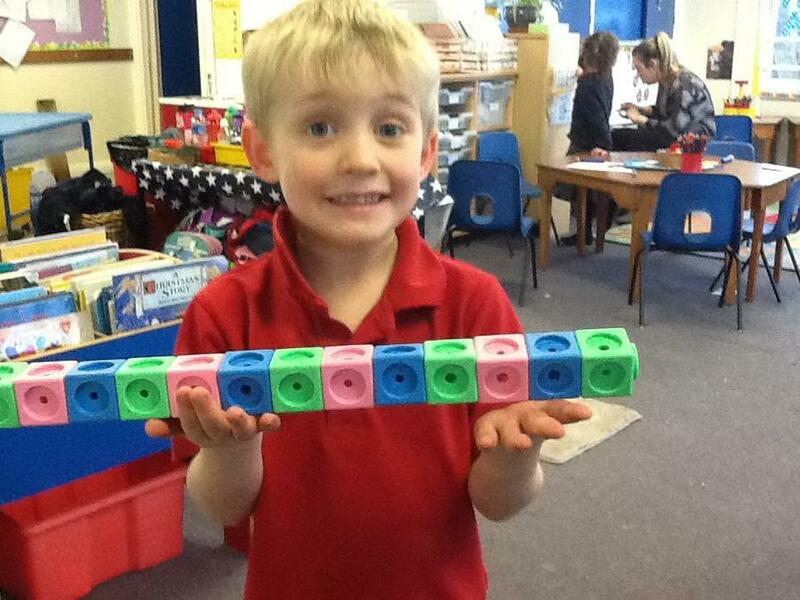 Look at all the fun we have been having in F2 this half term. 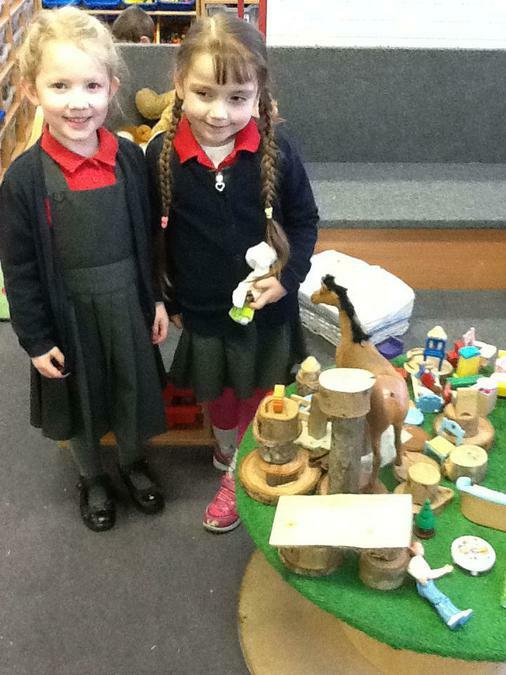 We have been learning all about traditional tales.The children have been building, making, exploring and creating in the Foundation Stage. 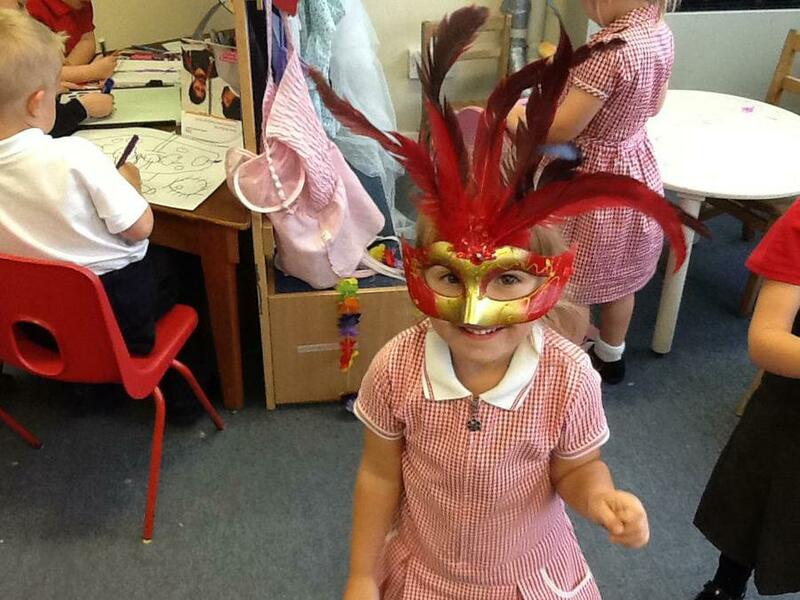 Take a look at our wonderful experiences. 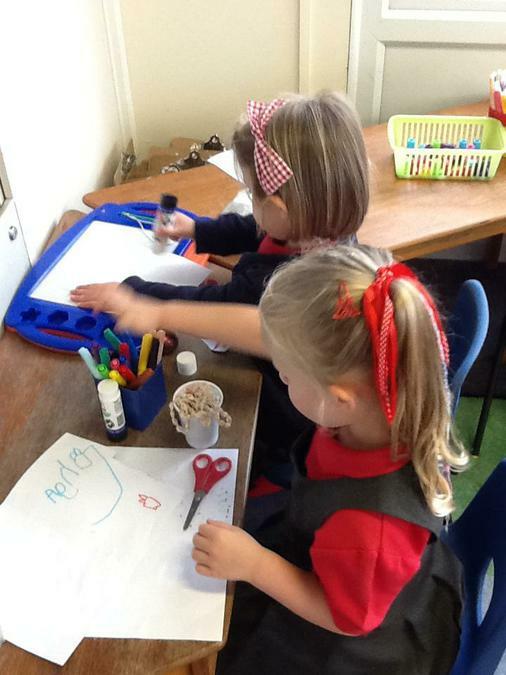 A little reminder of the Brillant Beginnings letter that we sent home at the end of term! 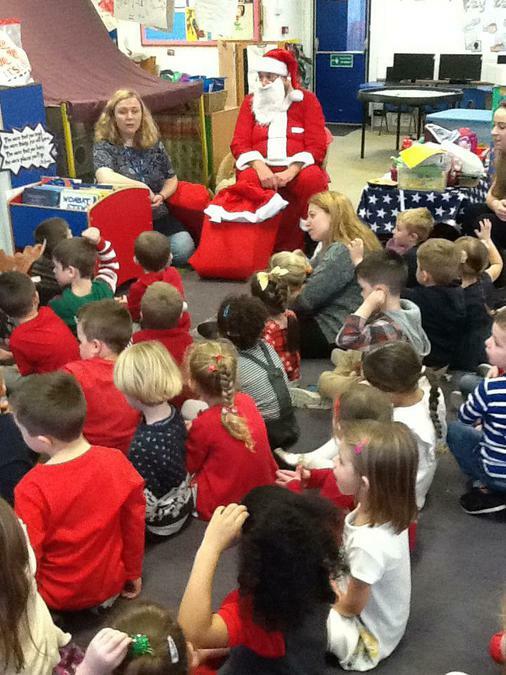 Happy reading and happy holidays. 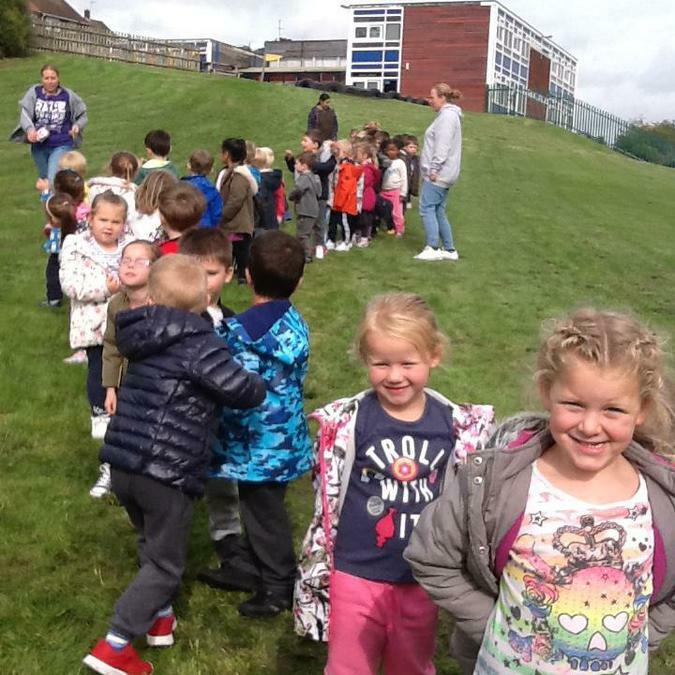 What would a wonderful end of term we have! 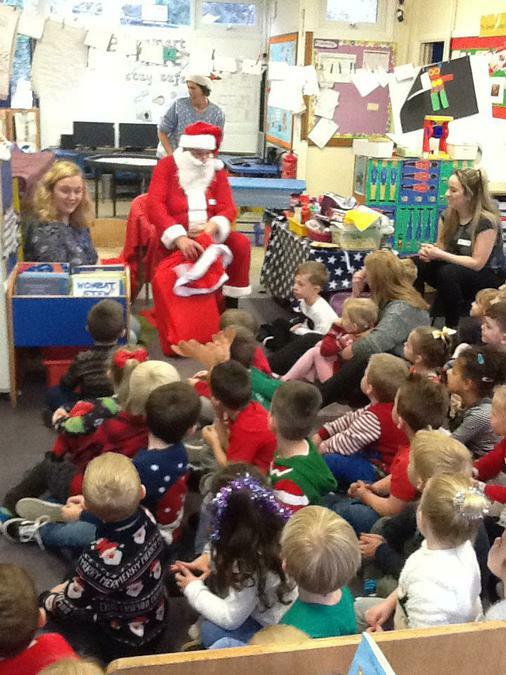 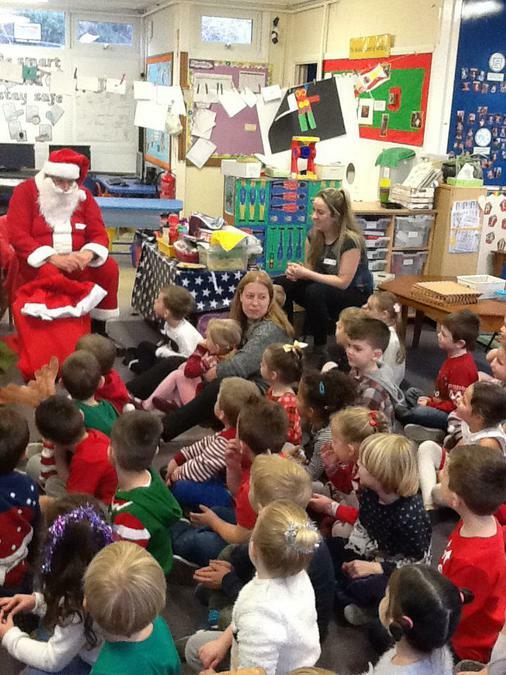 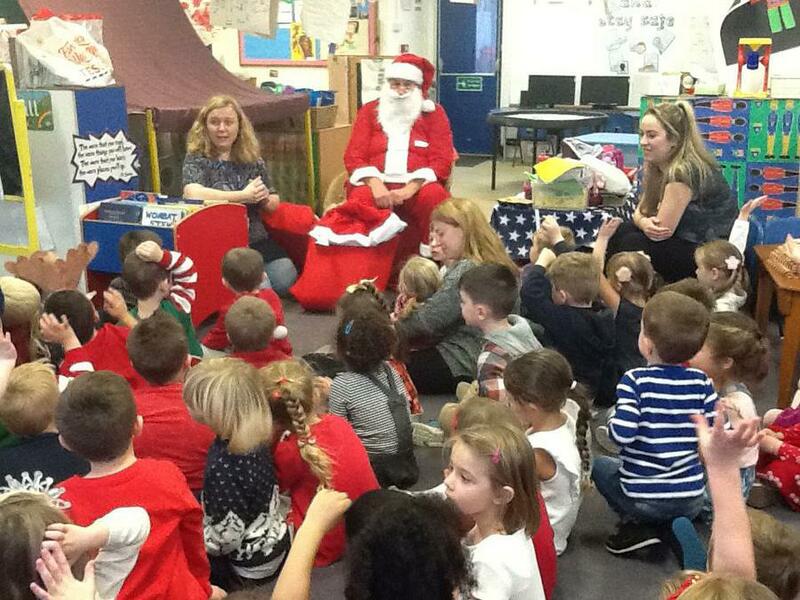 The panto, the party with a visit from Santa! 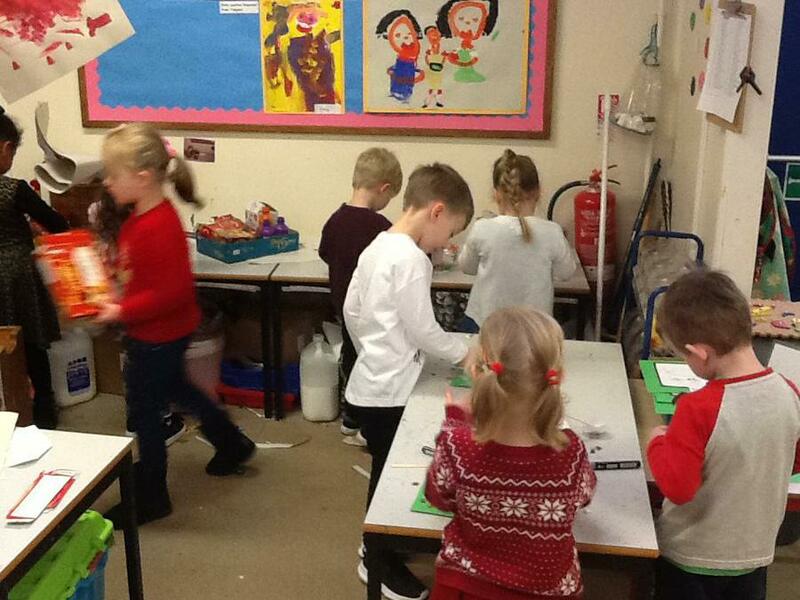 Then toy day for the final day! 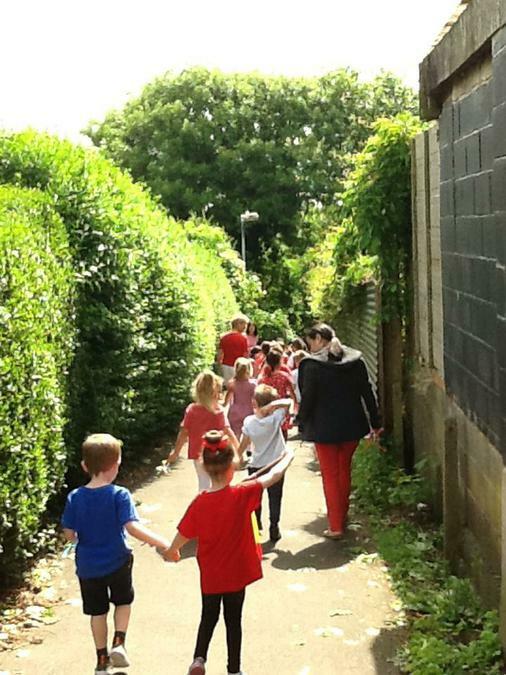 Thank you for all your support over the past term. 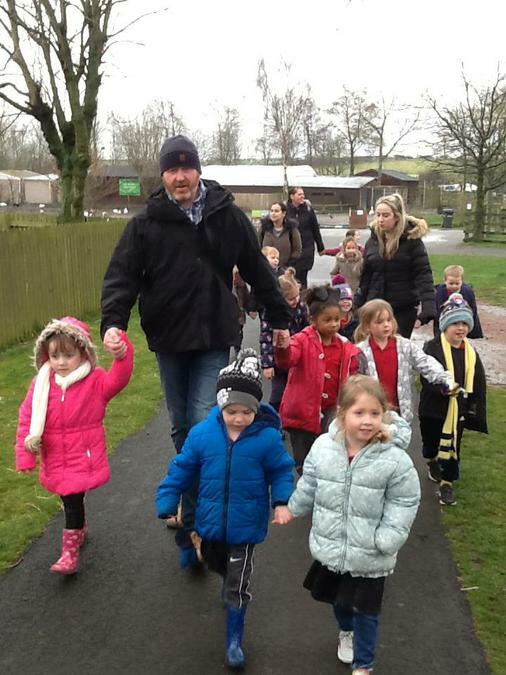 We hope you have a lovely, relaxing, fun holiday and see you in 2018. 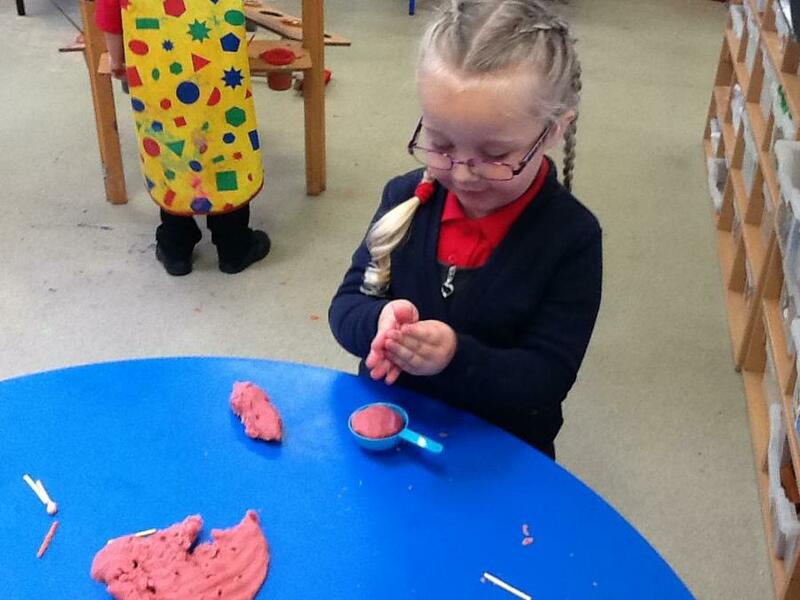 Autumn Term fun in Foundation. 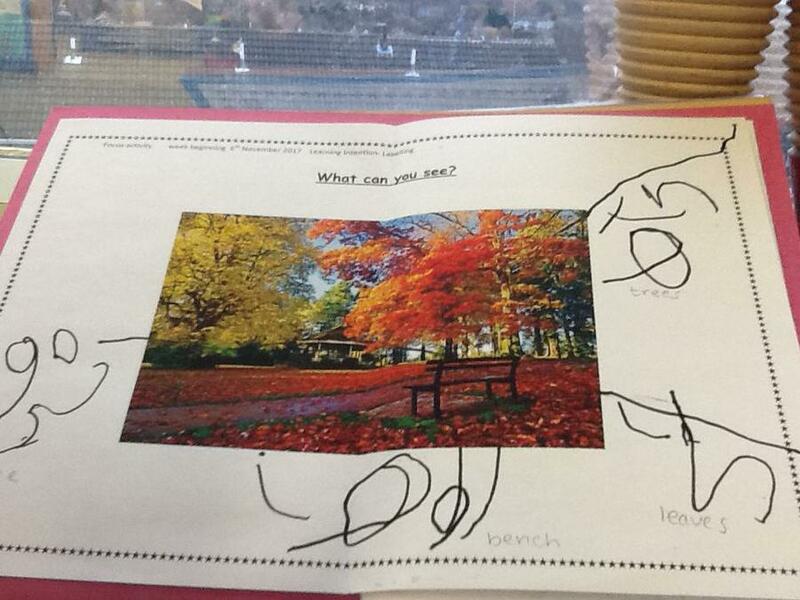 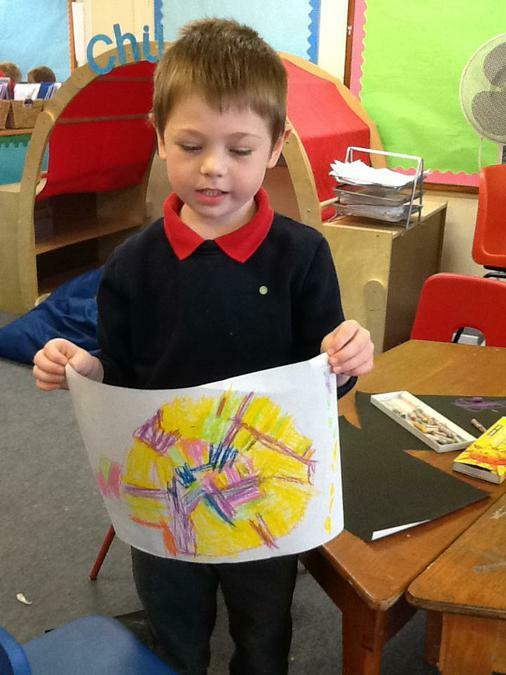 We have been learning about Autumn and Light. 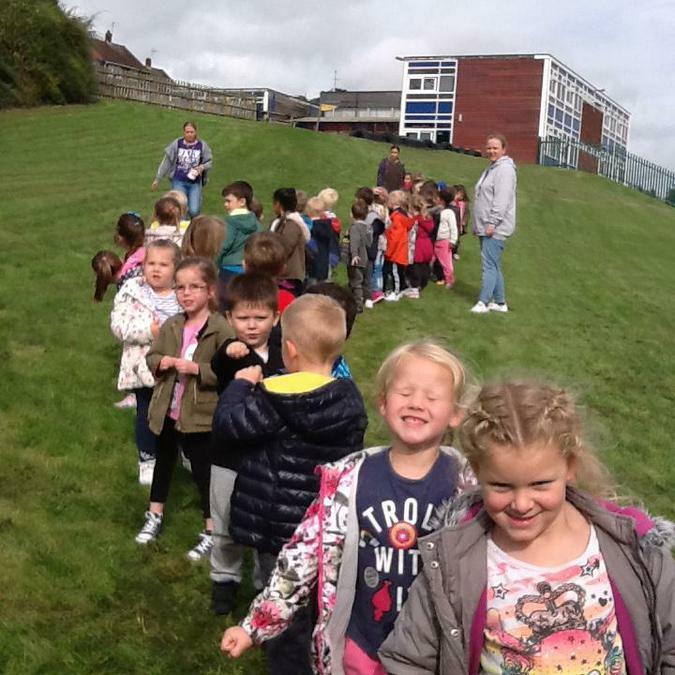 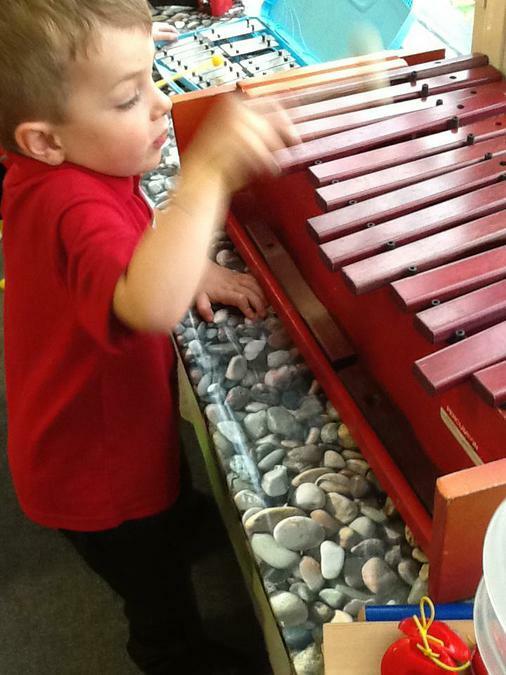 Take a look at all of the fun we've been having ! 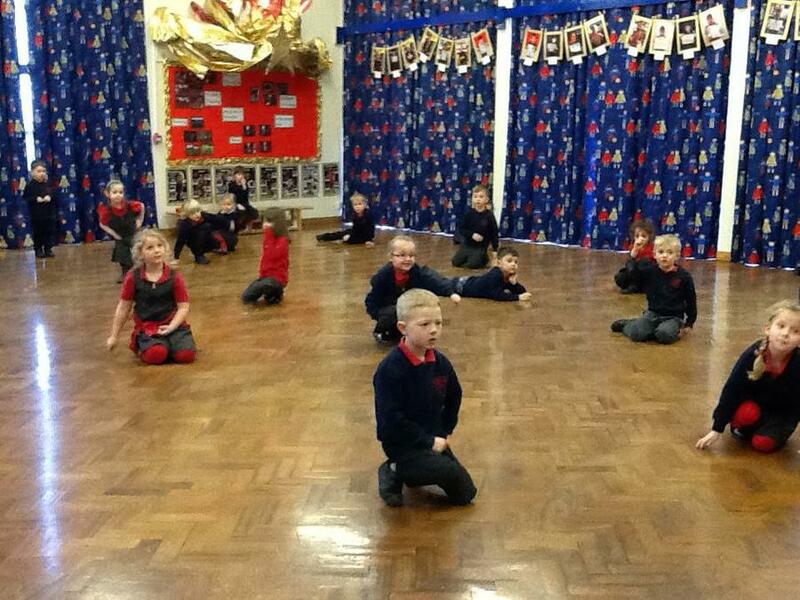 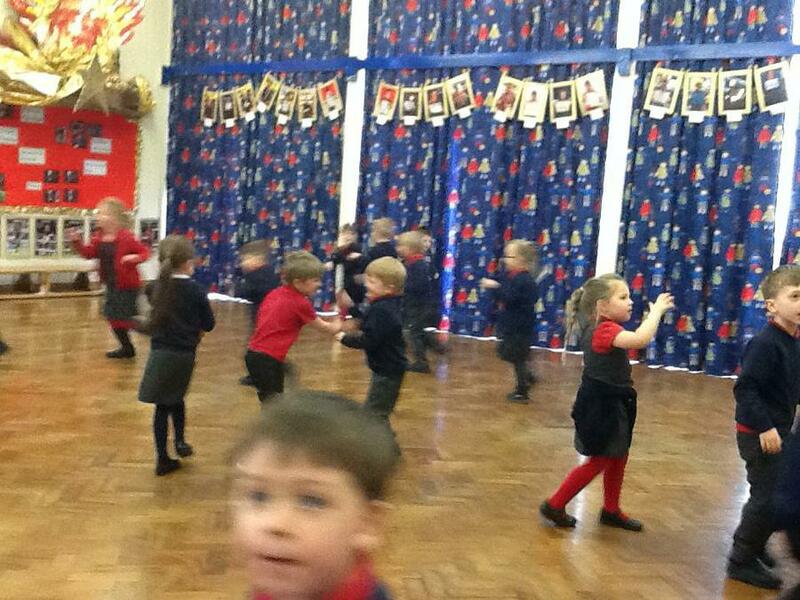 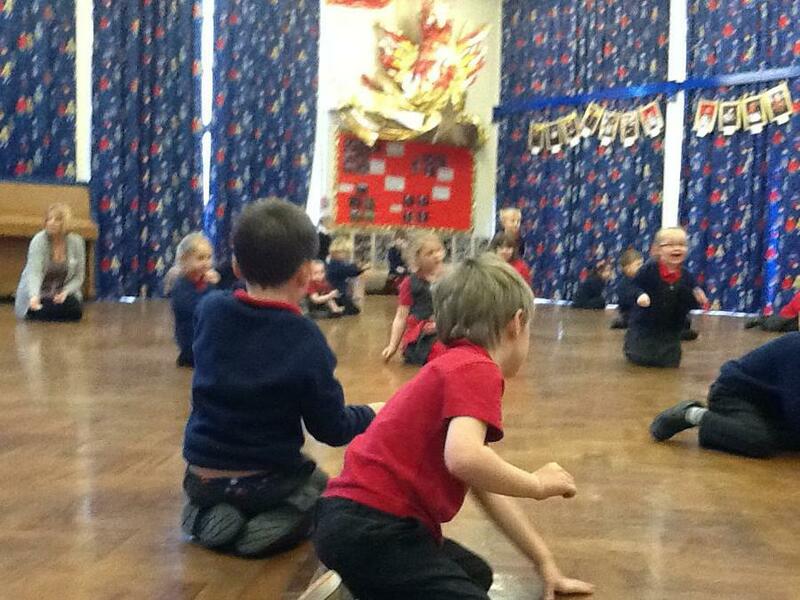 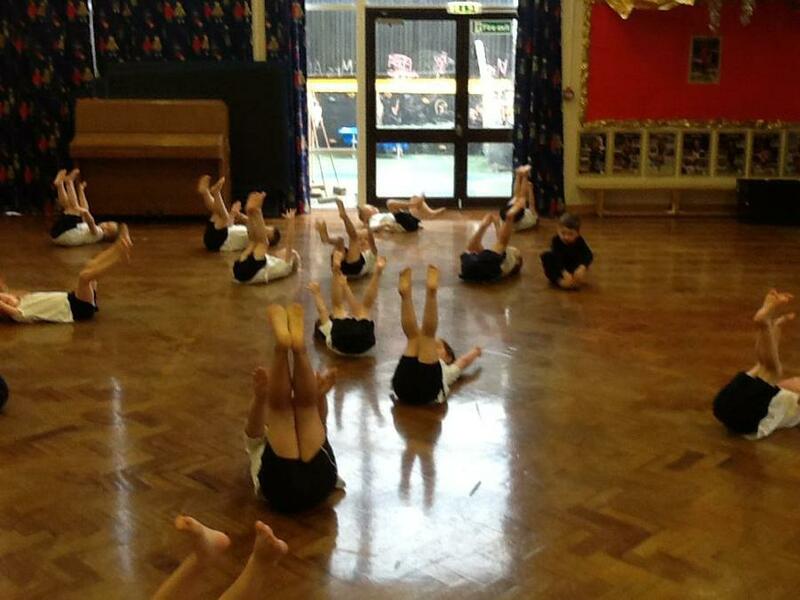 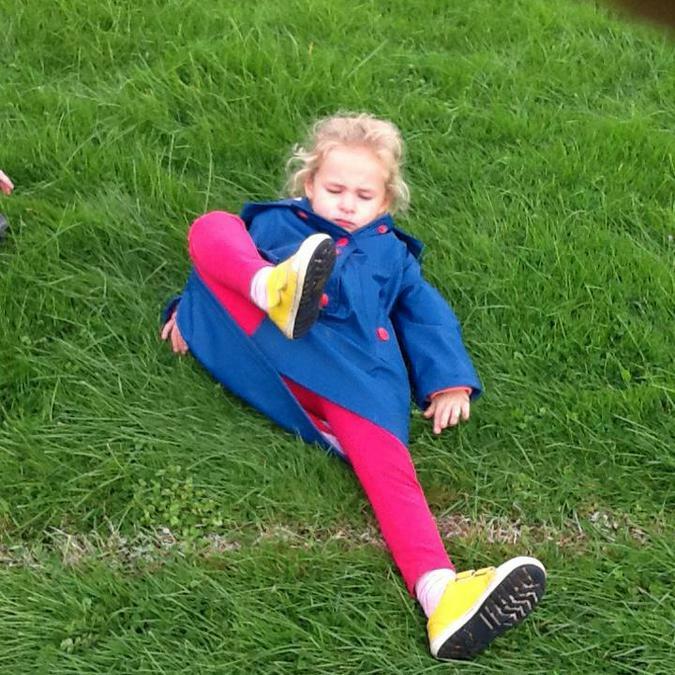 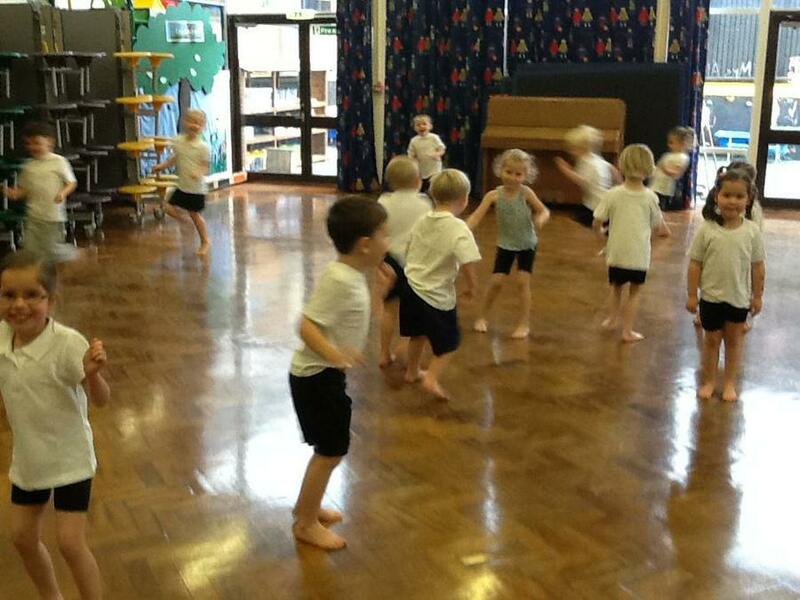 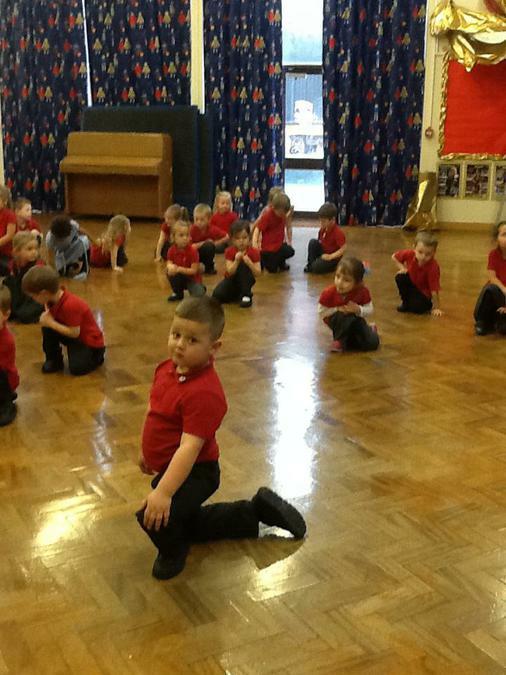 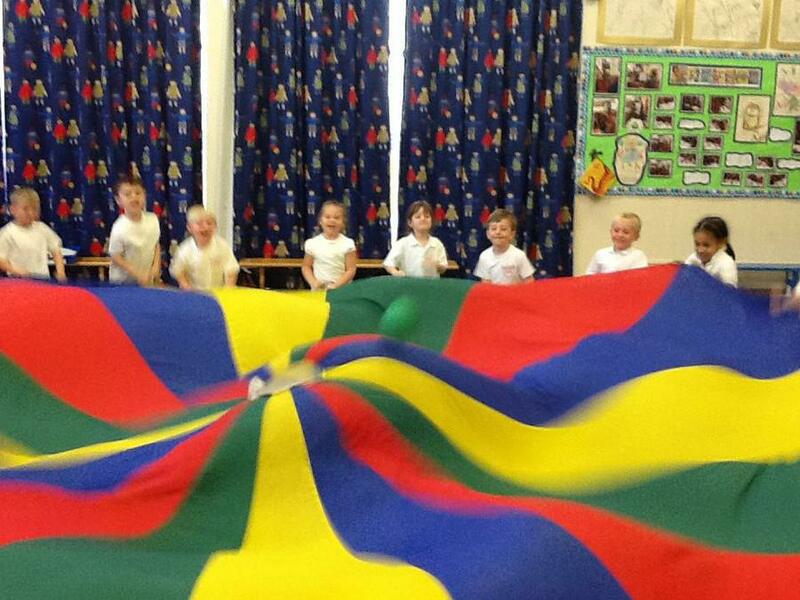 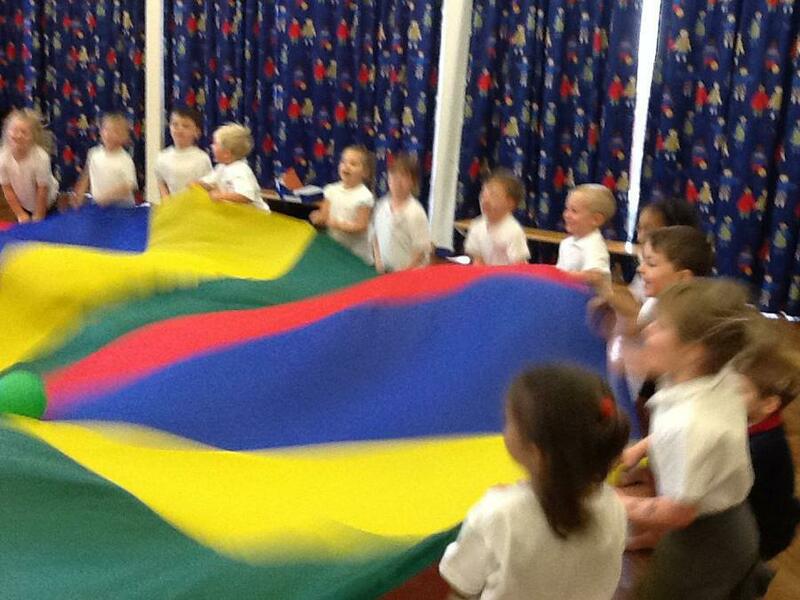 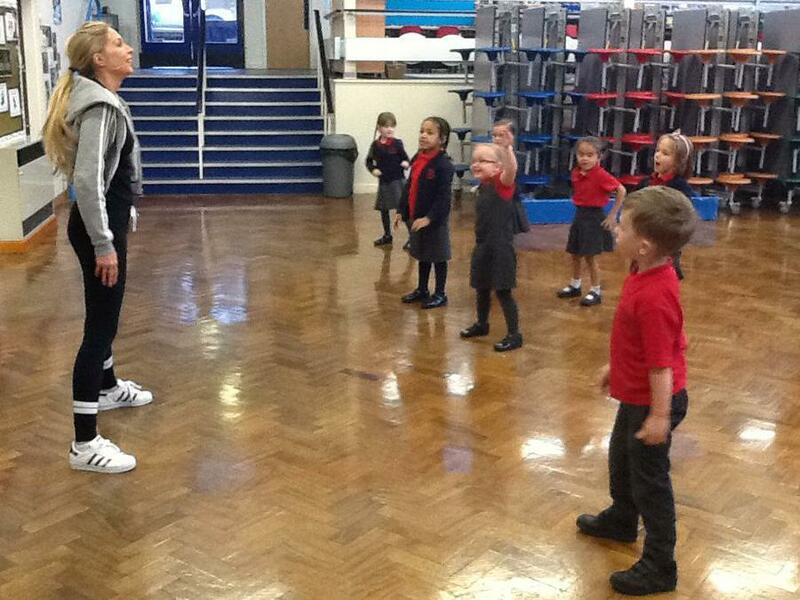 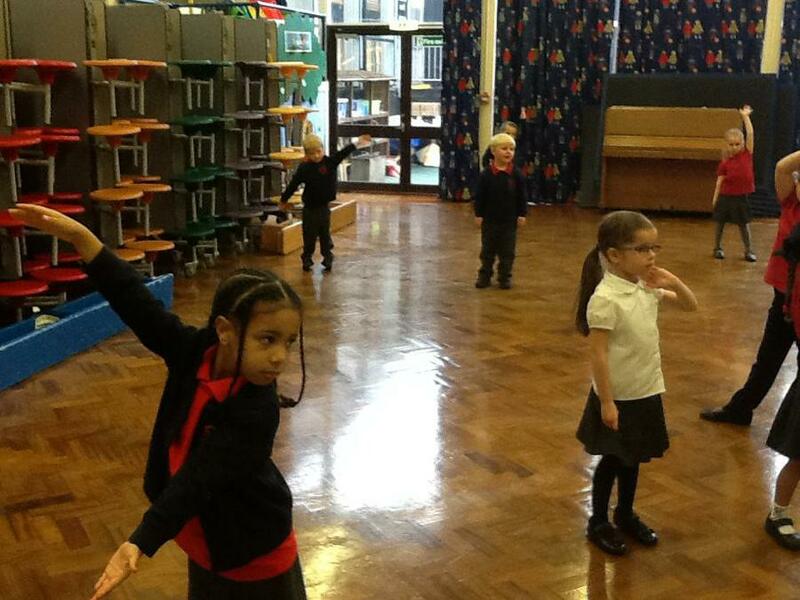 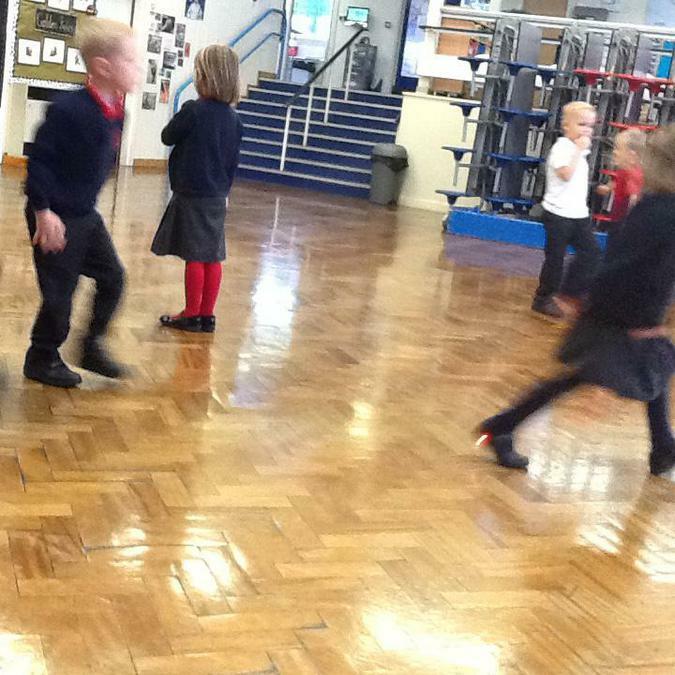 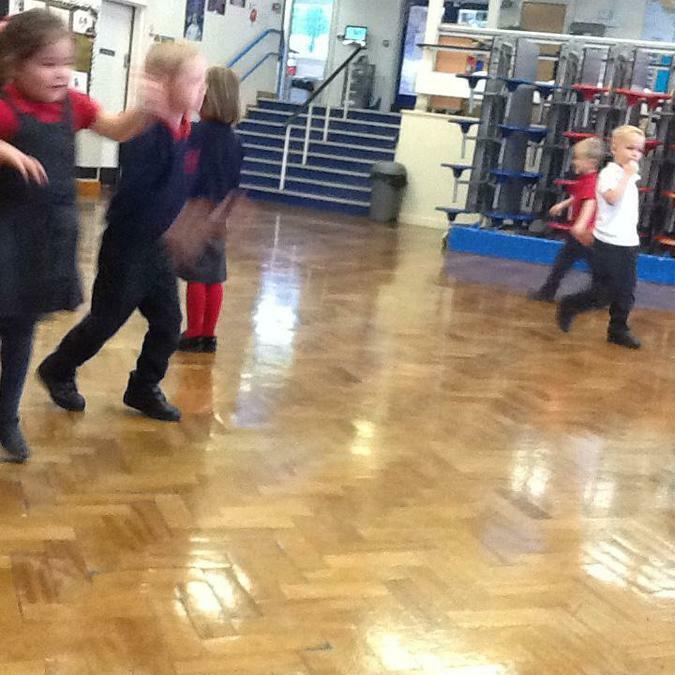 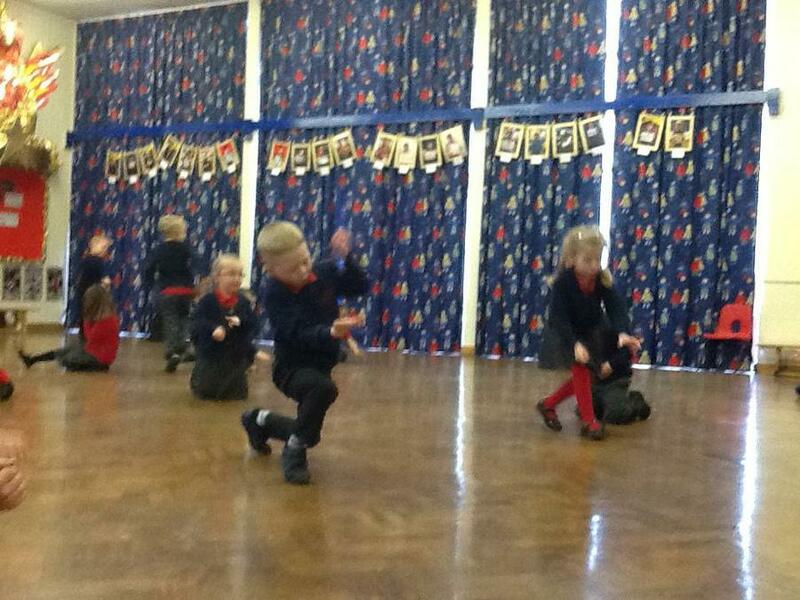 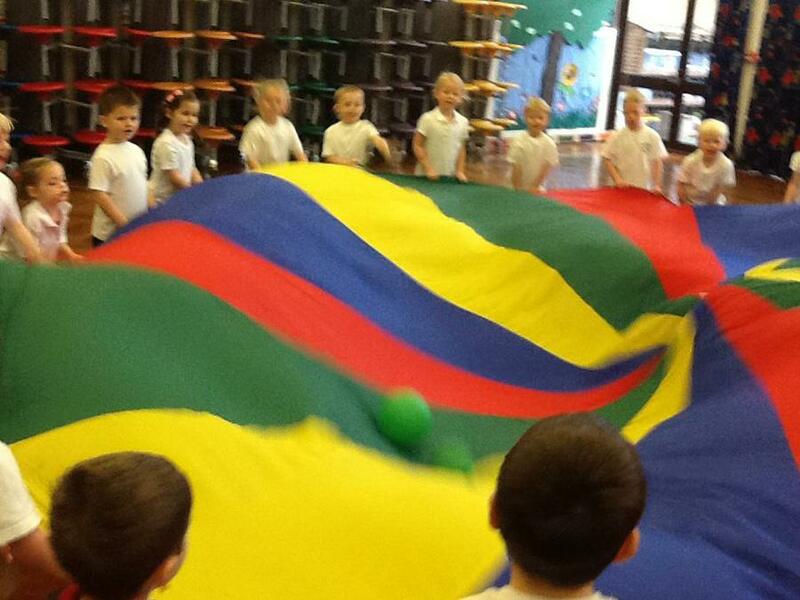 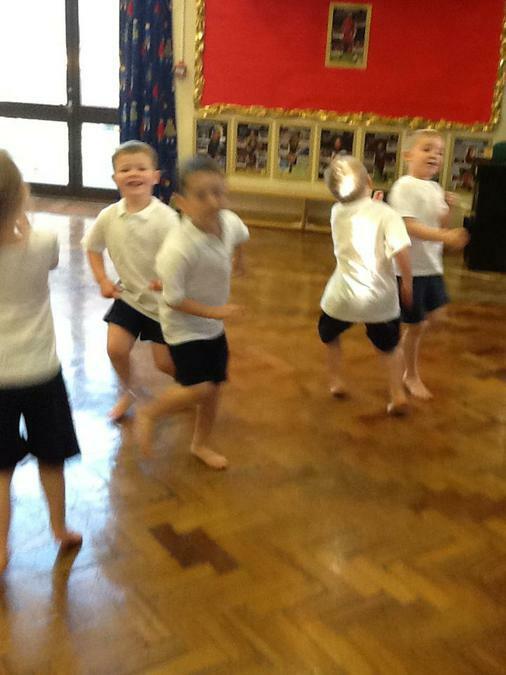 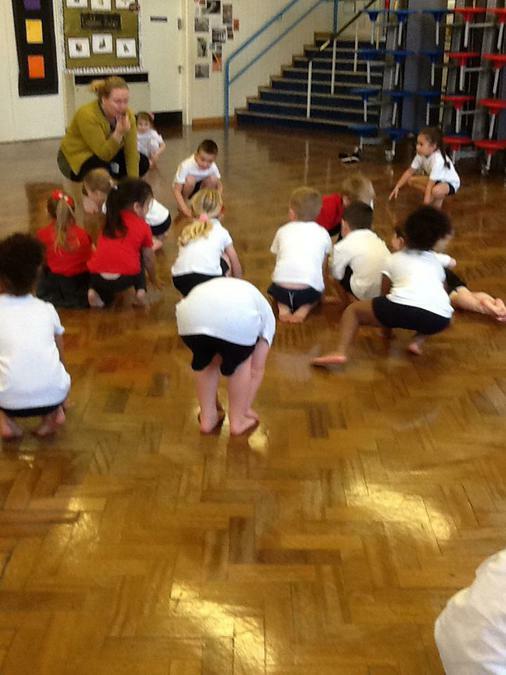 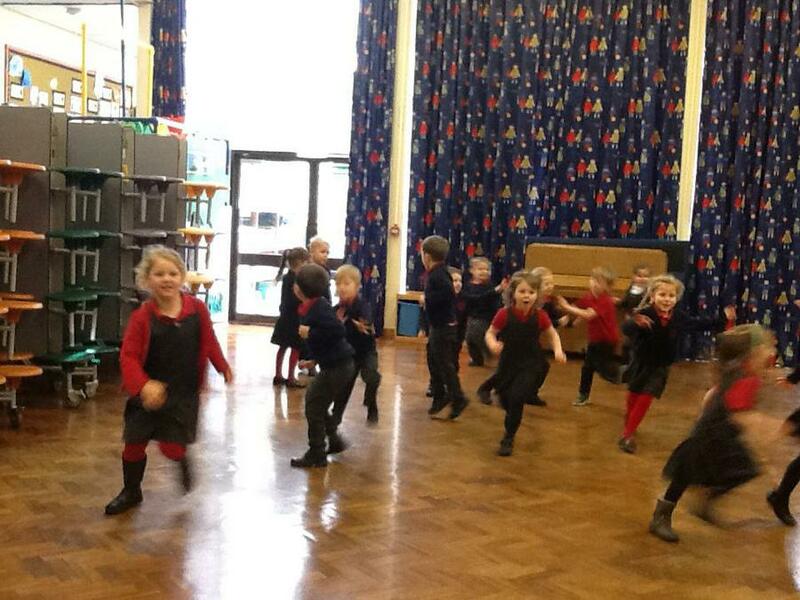 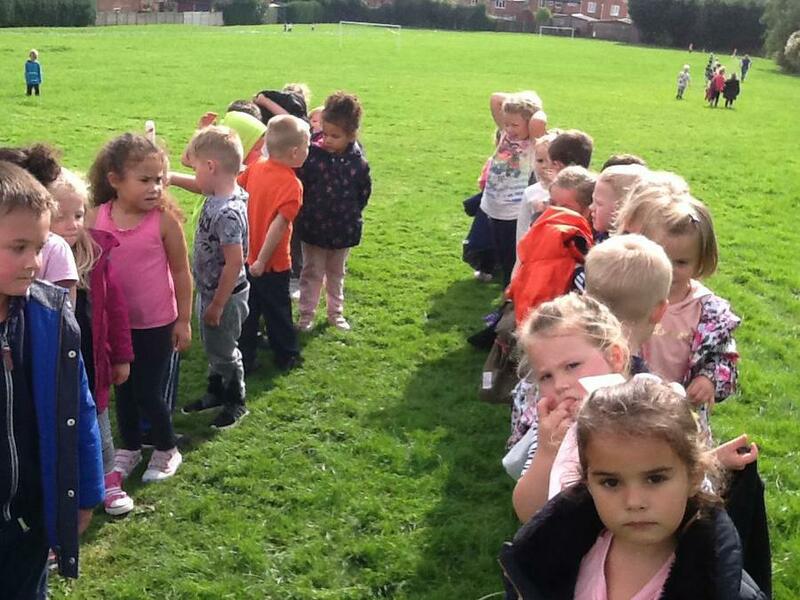 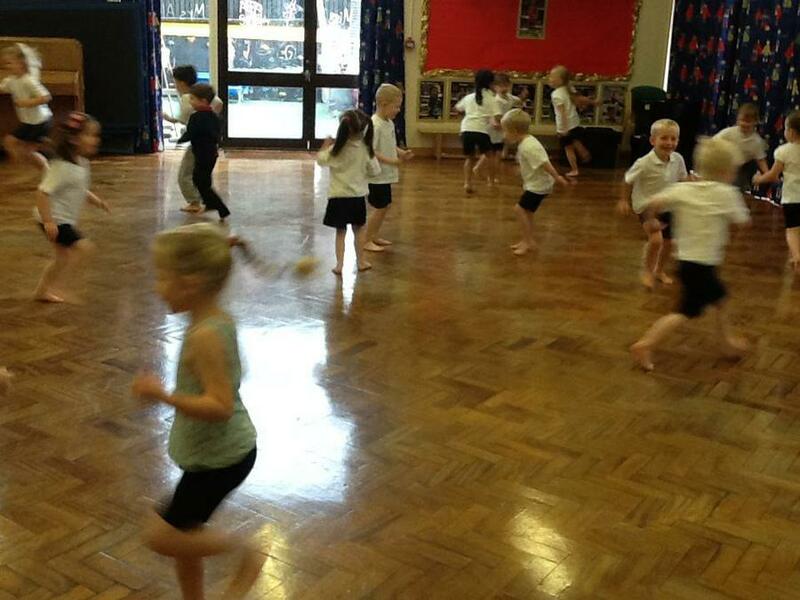 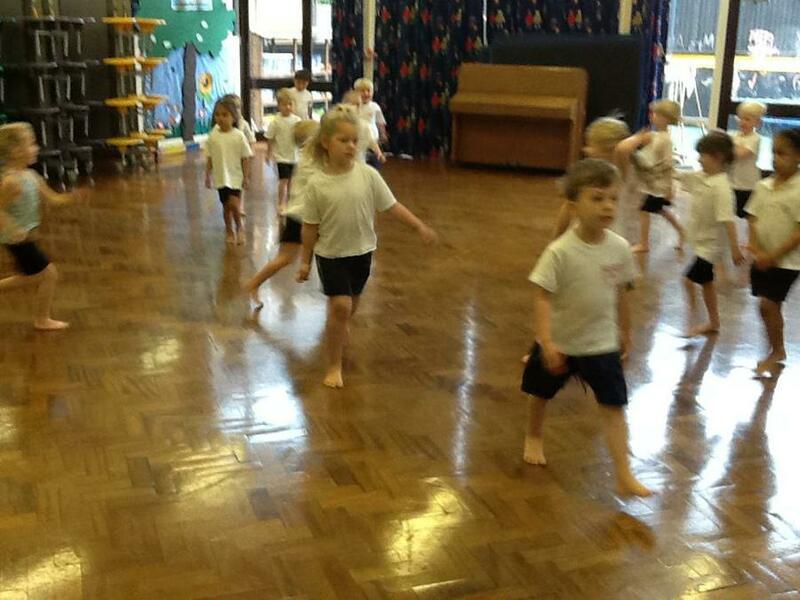 Down in F2 we love our PE sessions. 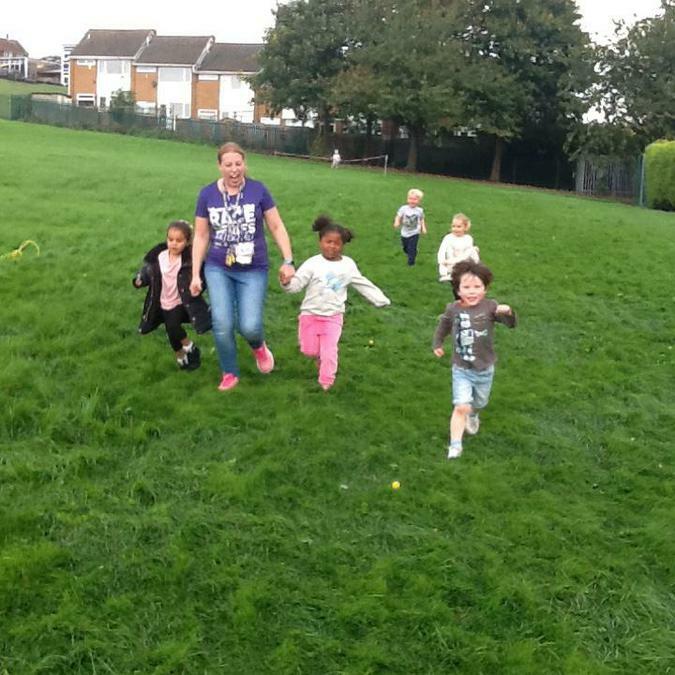 As you may know the government are promoting physical education in primary schools and suggest the children have 2 sessions a week. 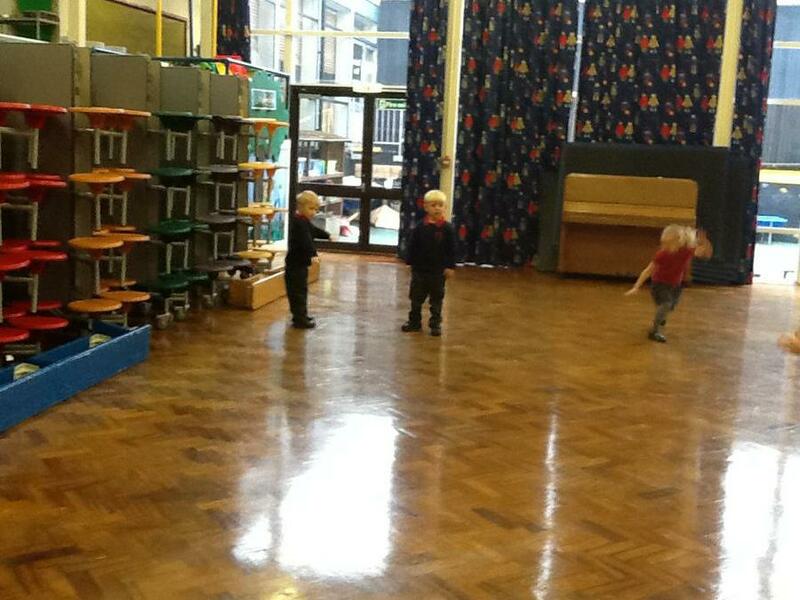 In F2 we have one formal PE session in the hall on a Friday. 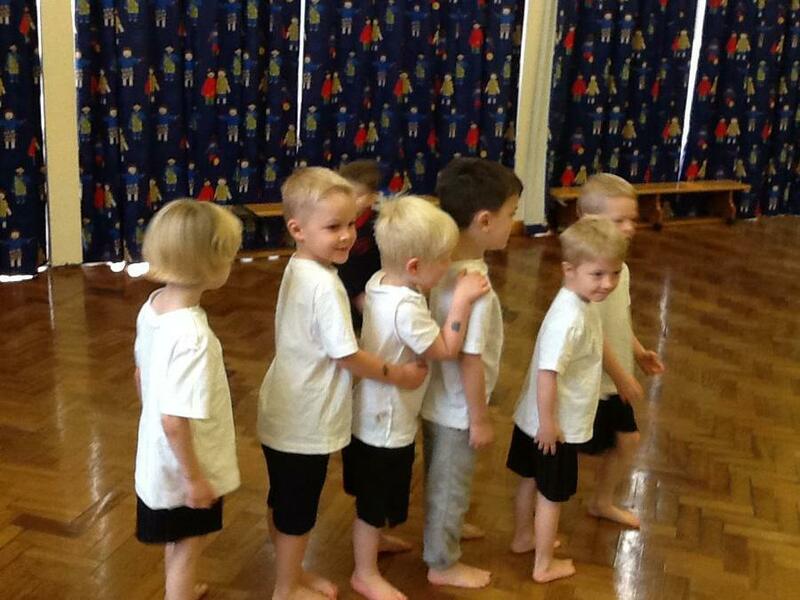 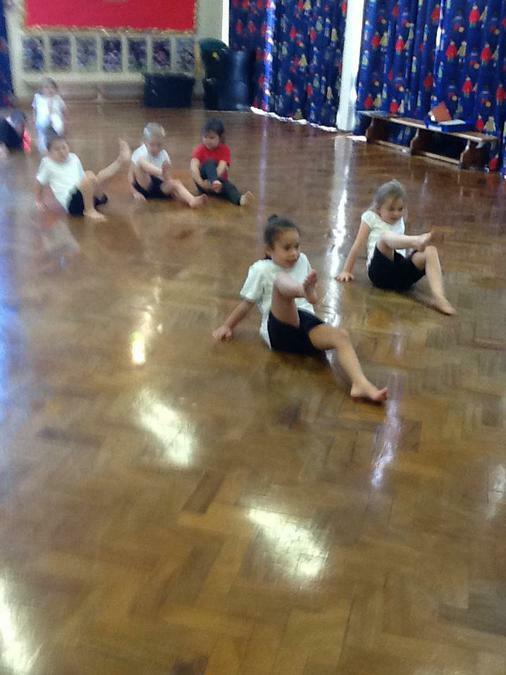 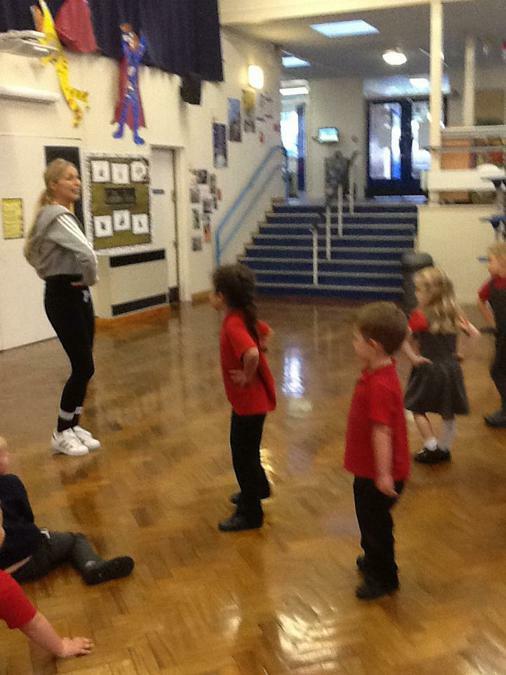 In this session we get changed into our PE kits (in the first half term of the year we only took shoes and socks off to focus more on getting used to the routine and working in the hall) and take part in sessions that cover dance to ball games to apparatus. 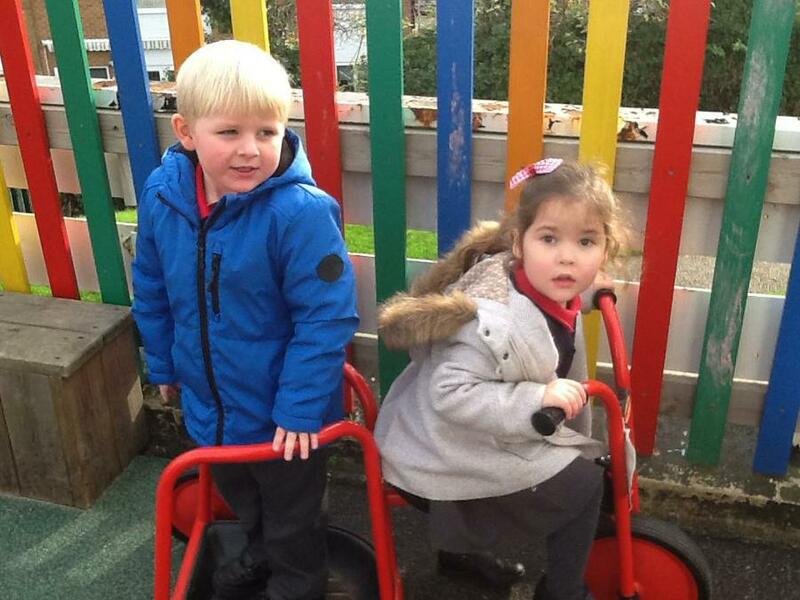 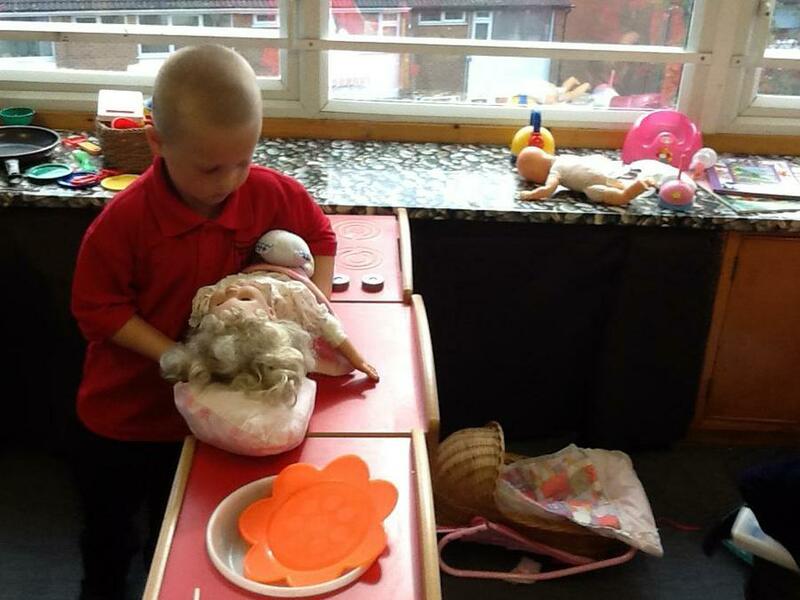 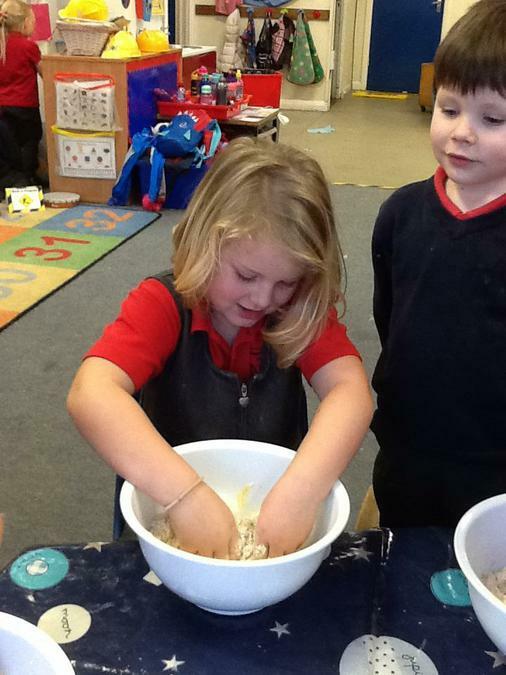 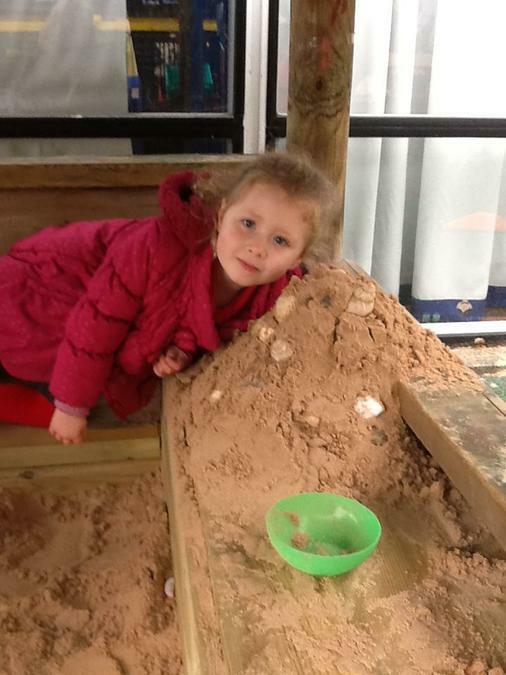 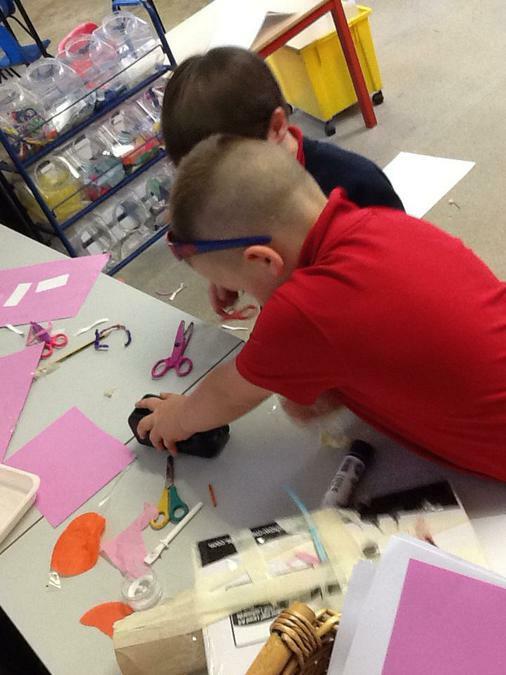 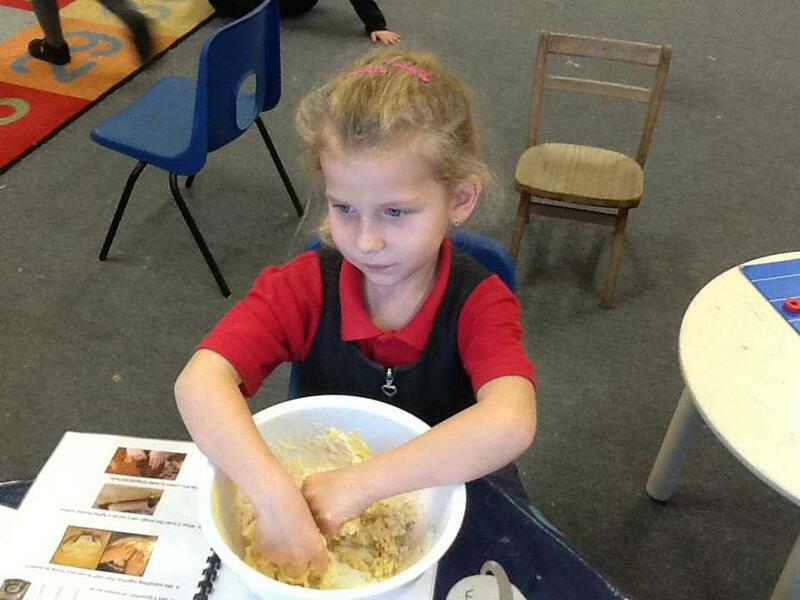 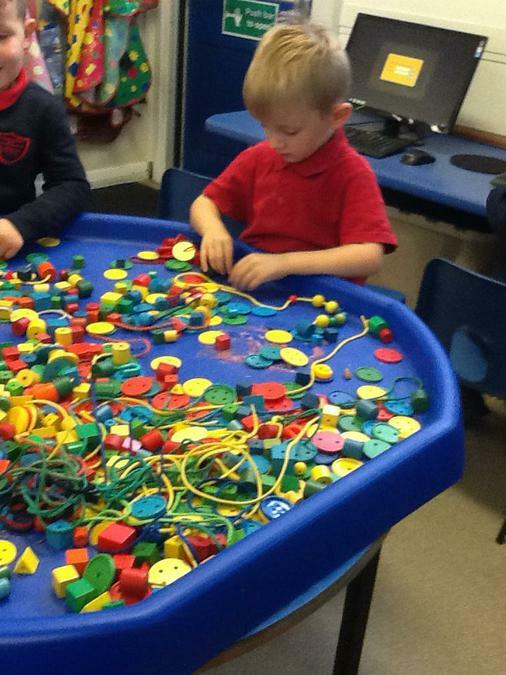 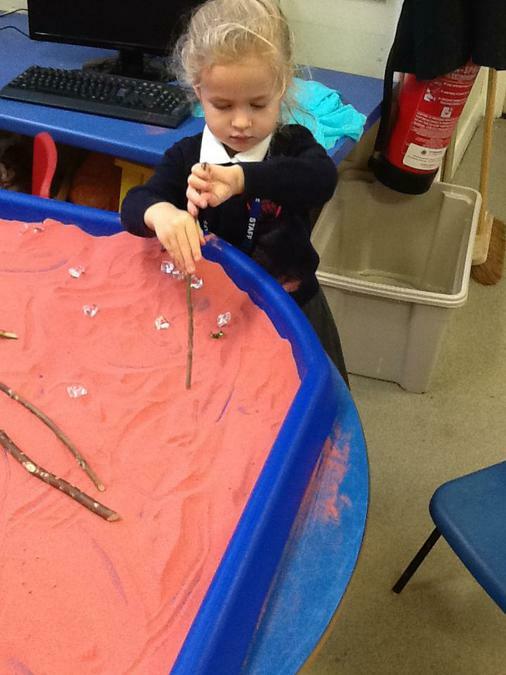 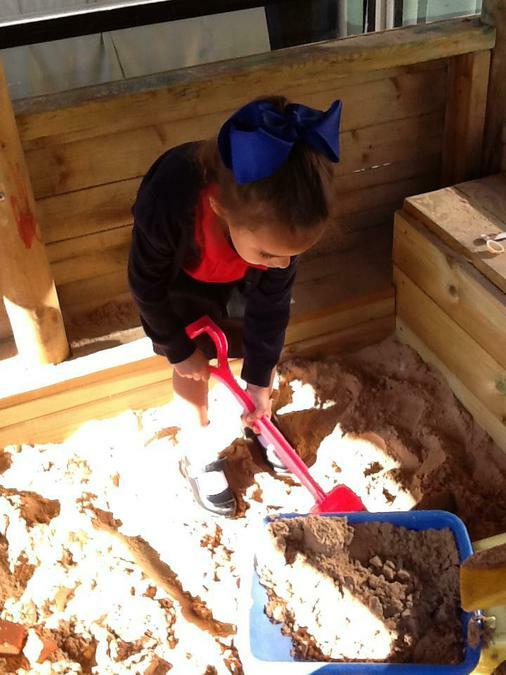 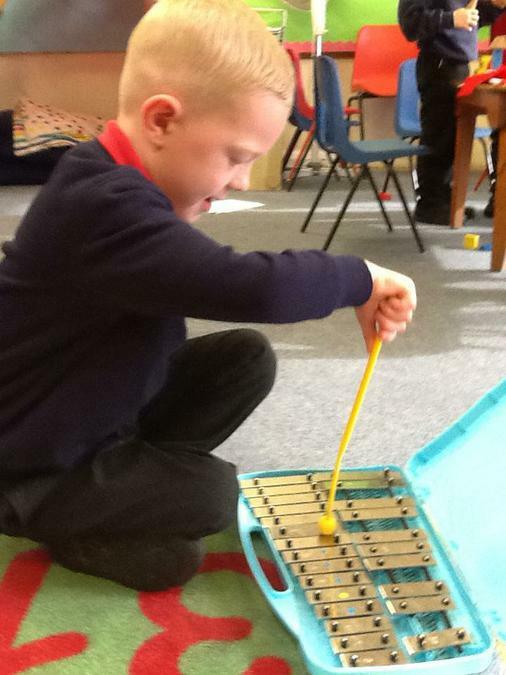 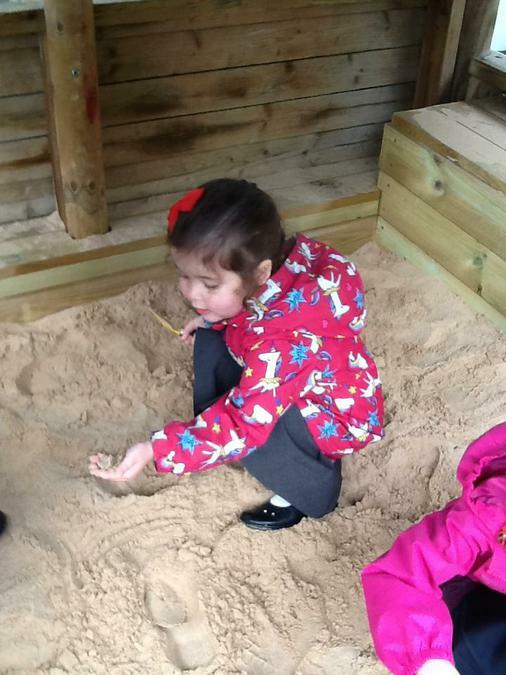 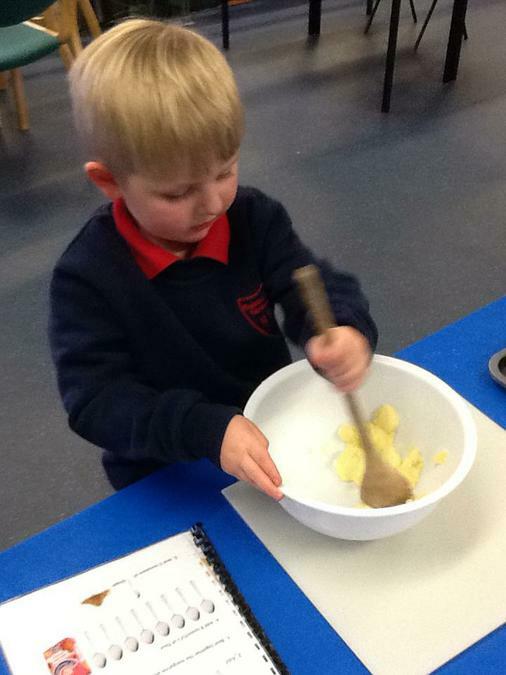 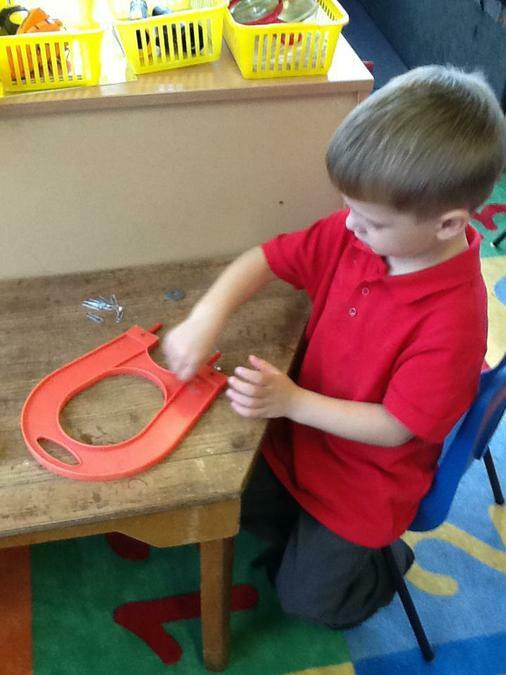 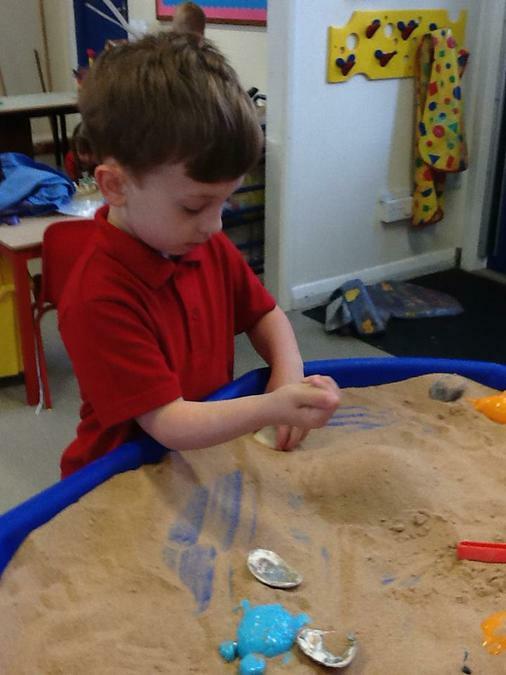 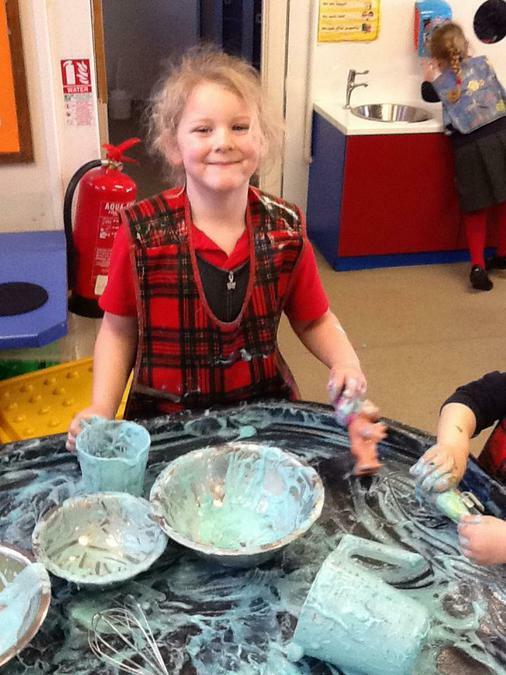 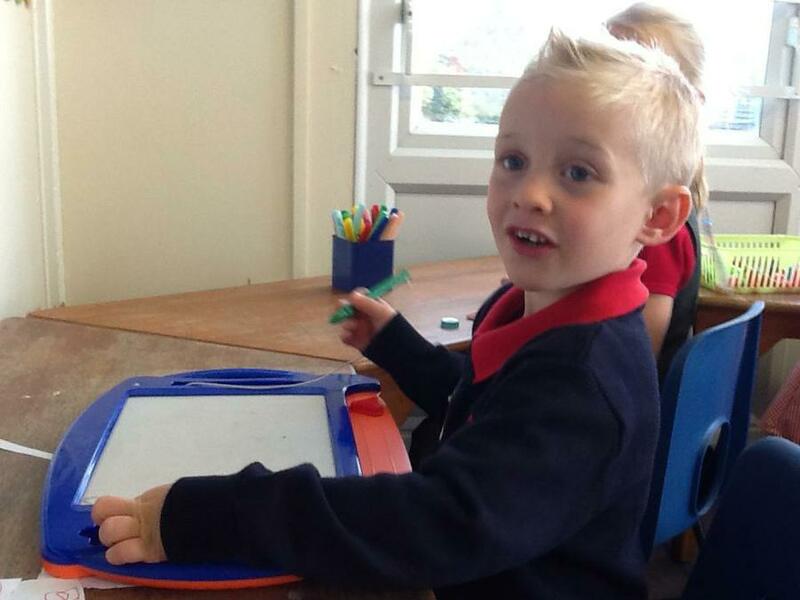 The other session is focussed on the fine motor and gross motor skills required within the Early Years Foundation Stage curriculum, this is through activities set up both inside and outside which we ensure the children access. 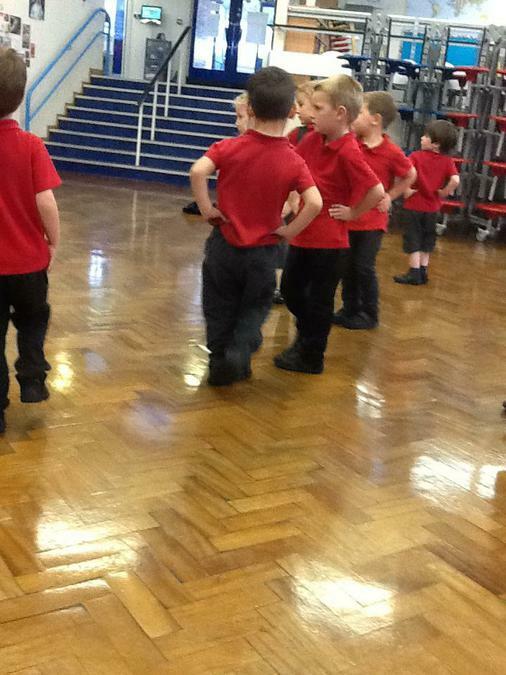 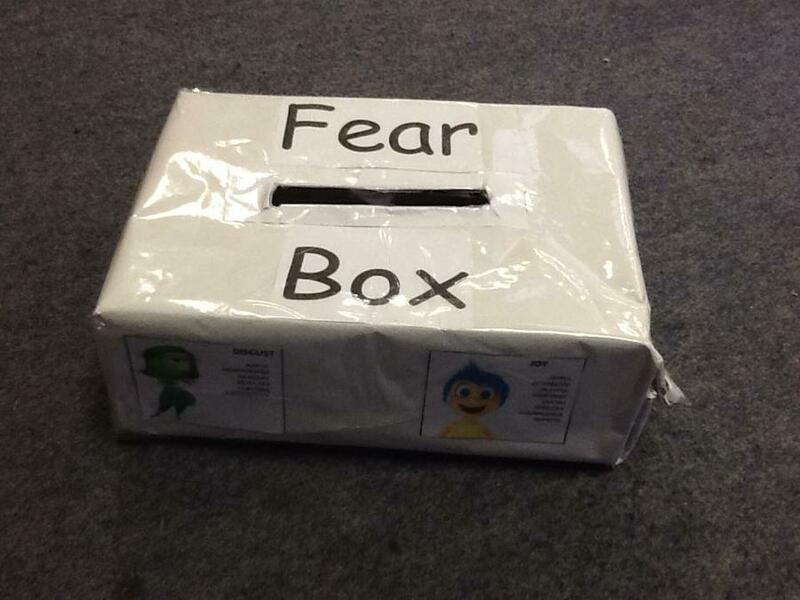 When there are themed days on a Friday we still do PE but make it fit with the theme of the day e.g. 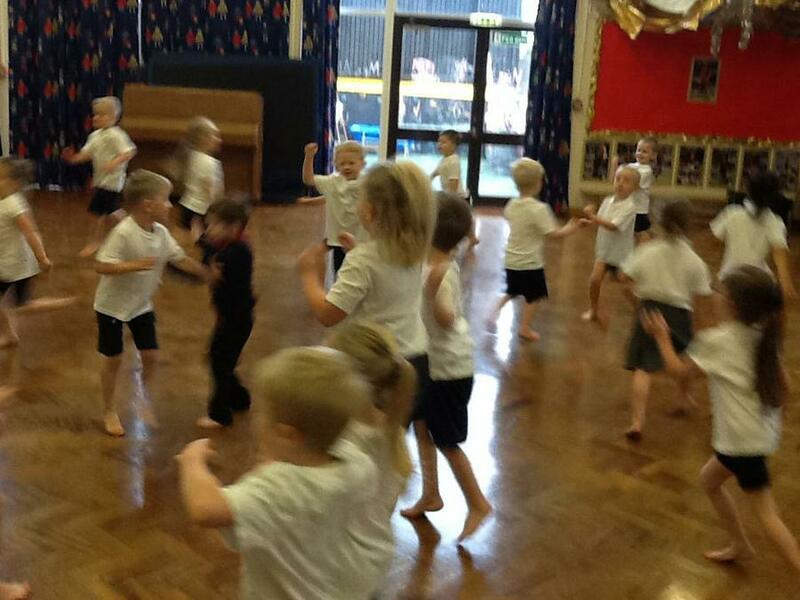 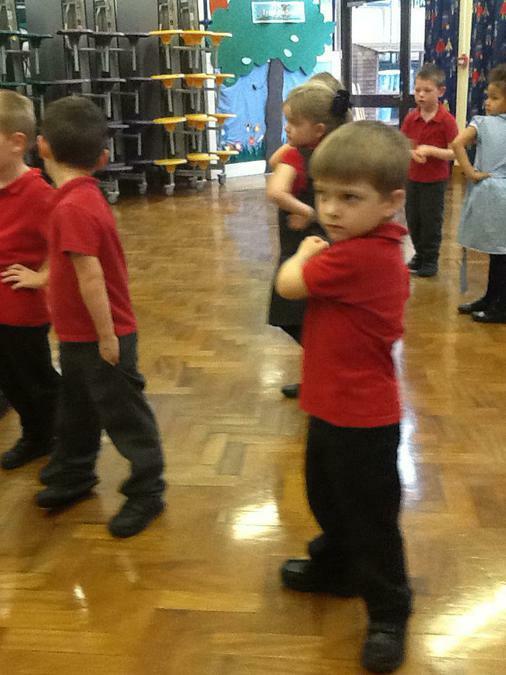 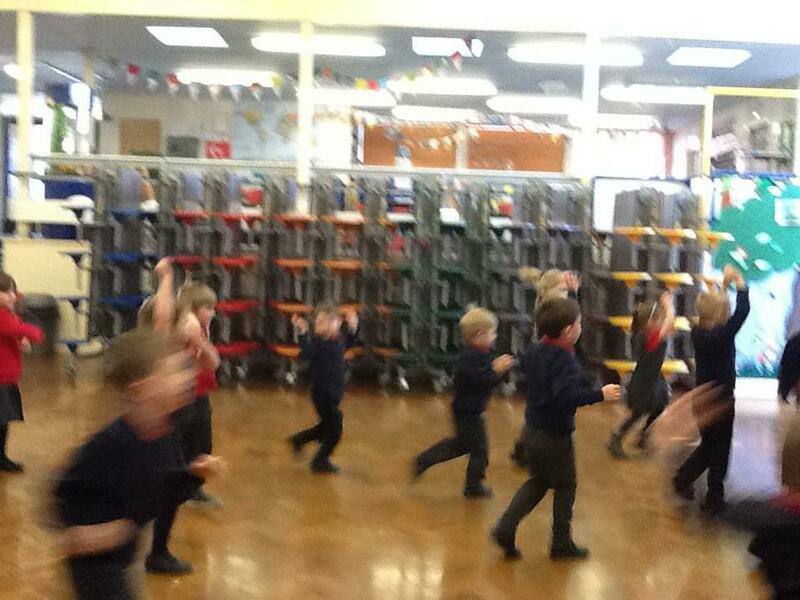 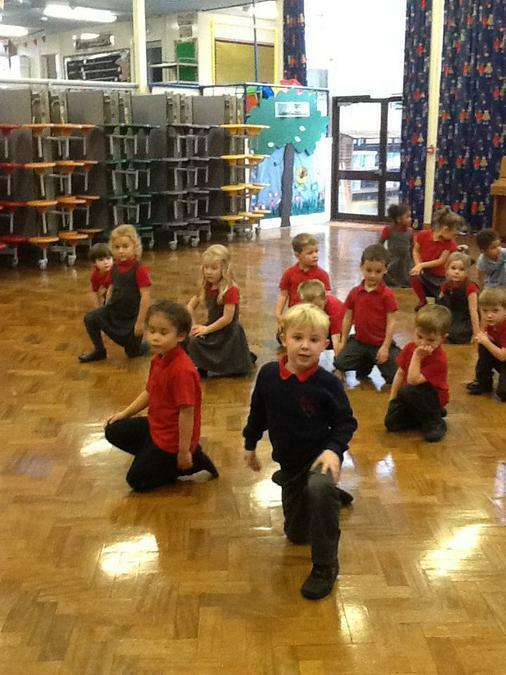 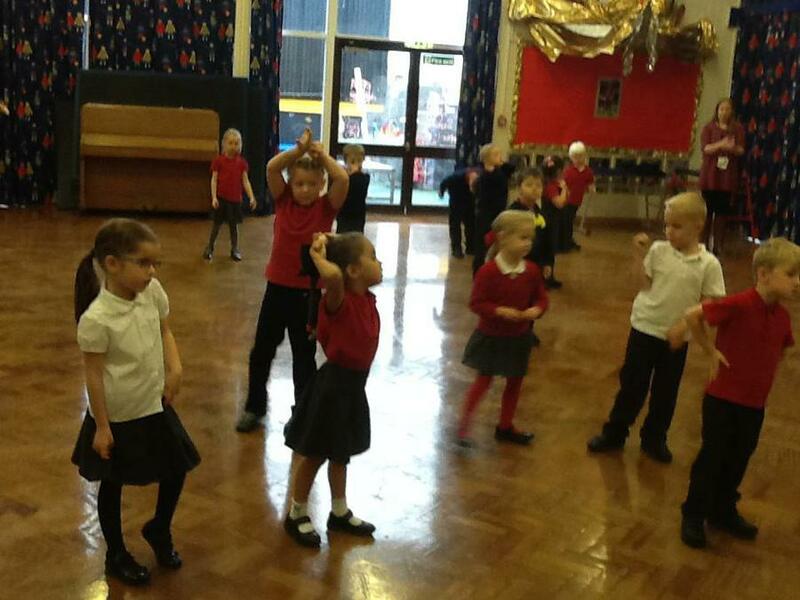 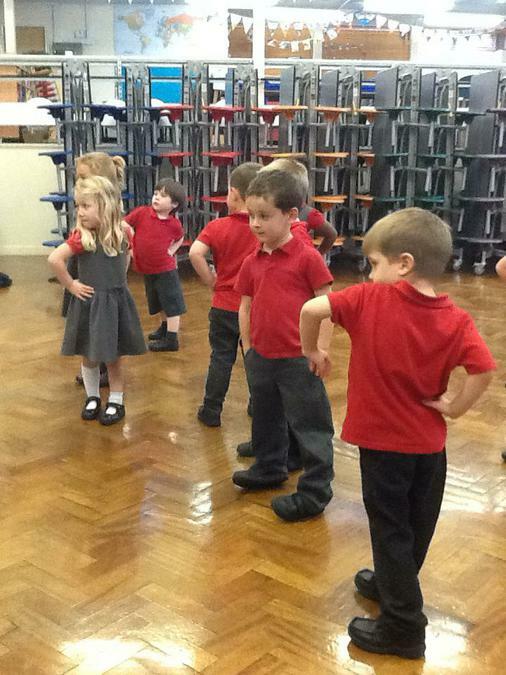 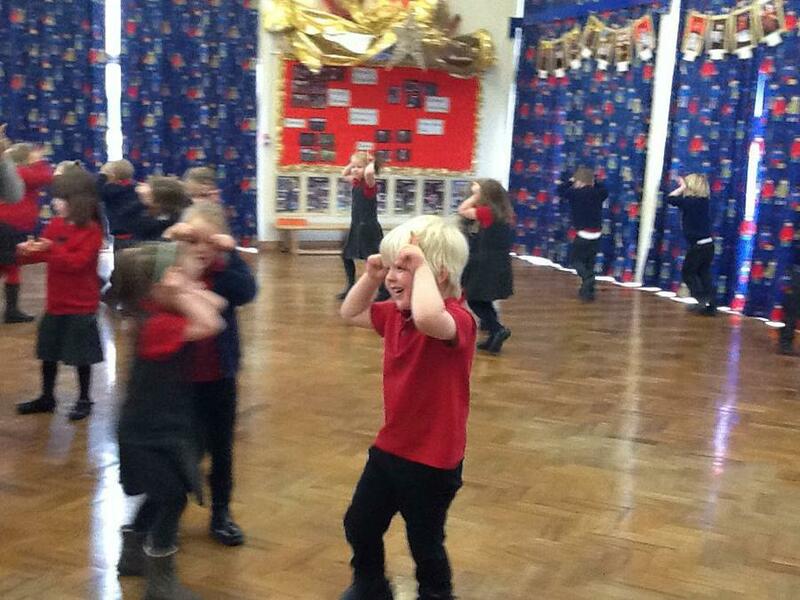 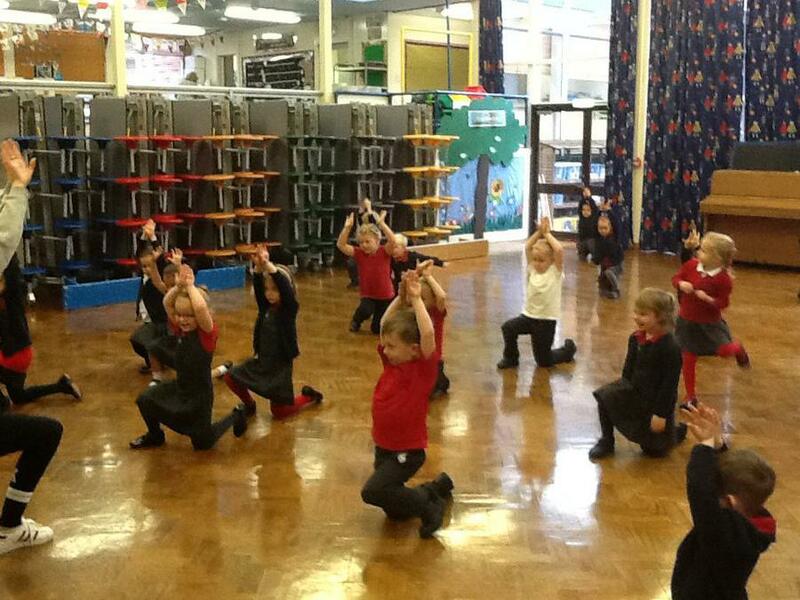 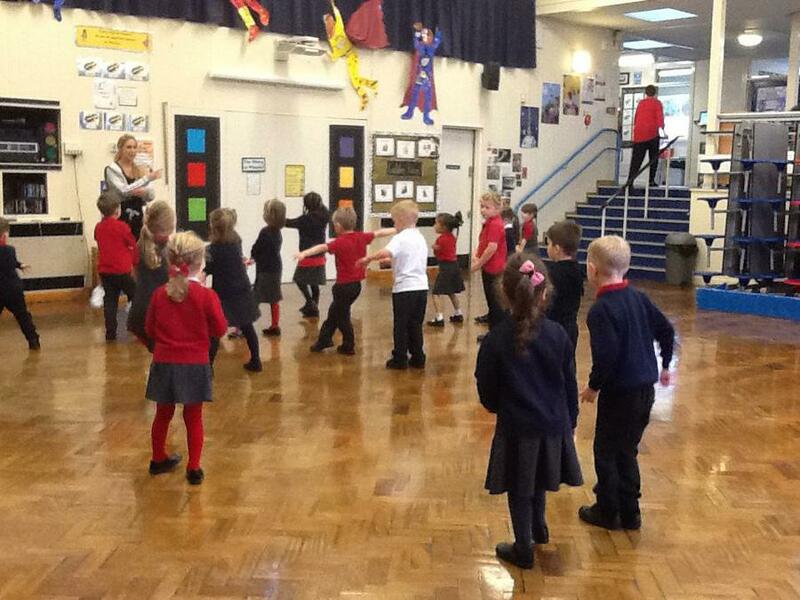 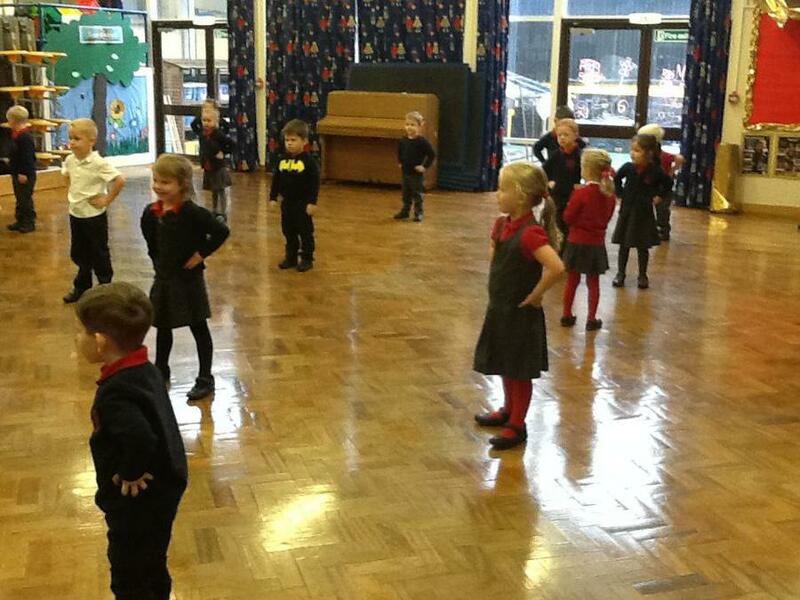 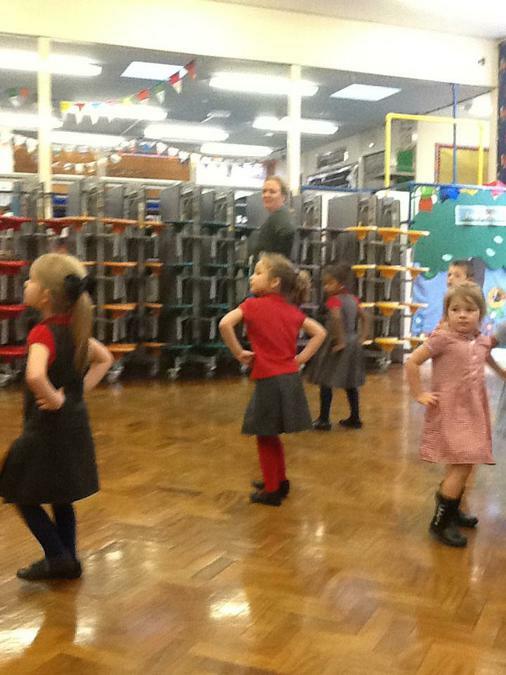 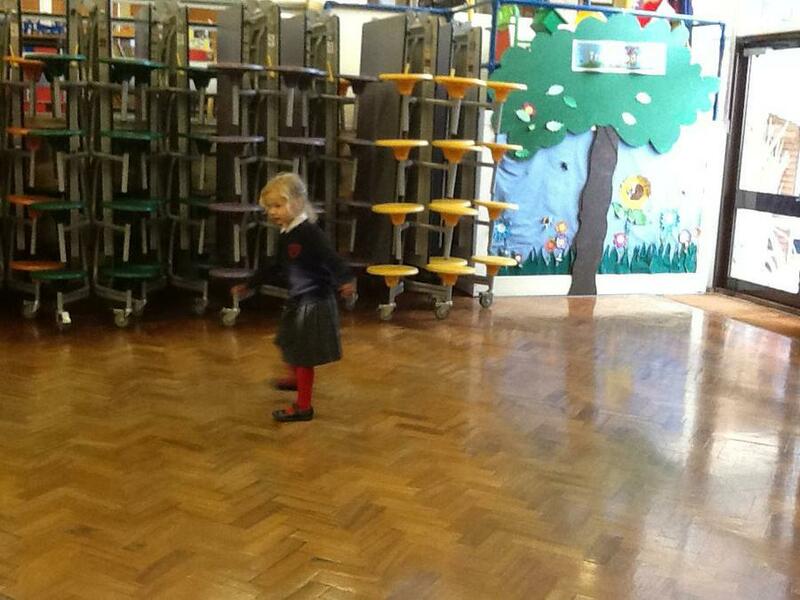 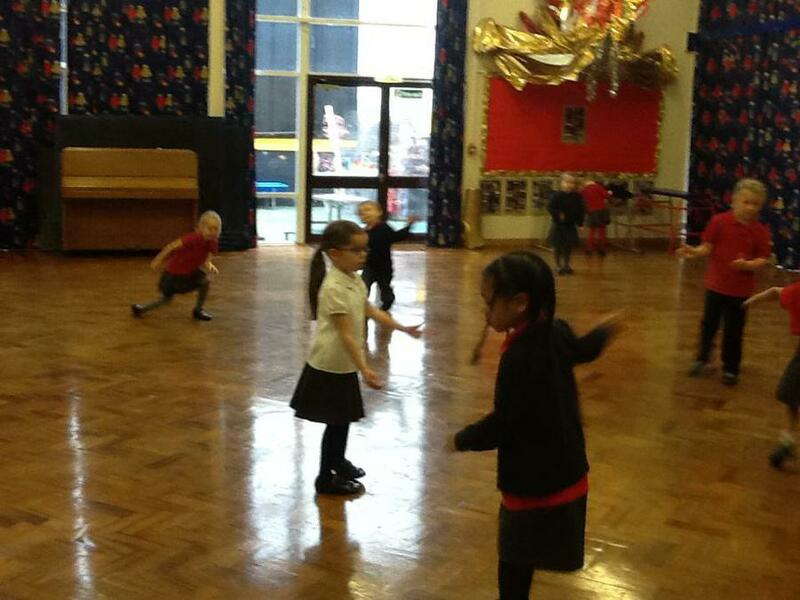 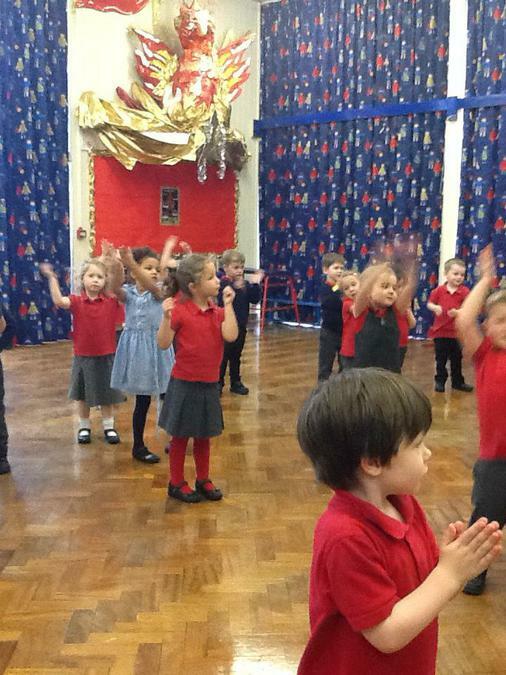 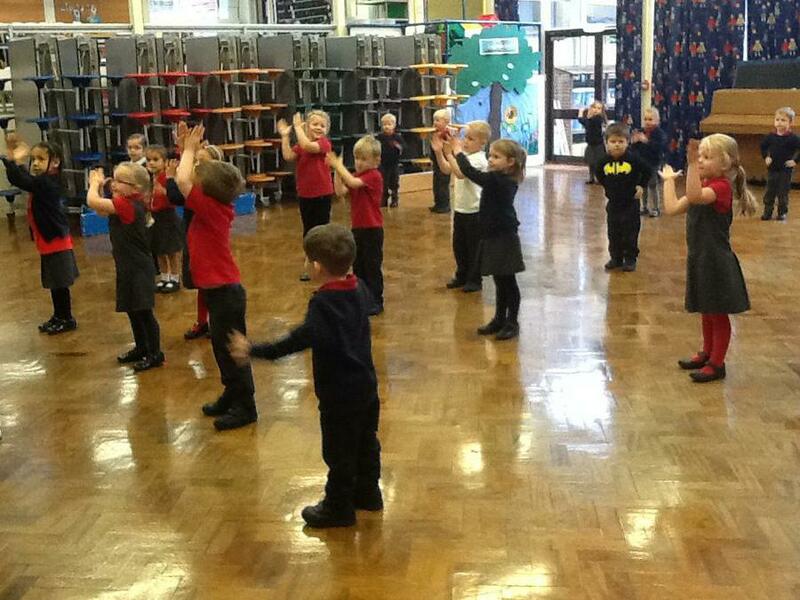 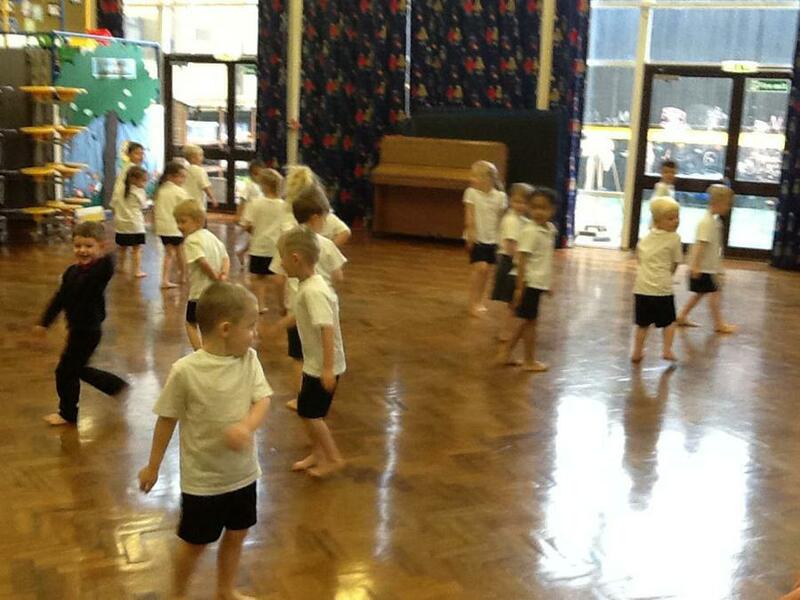 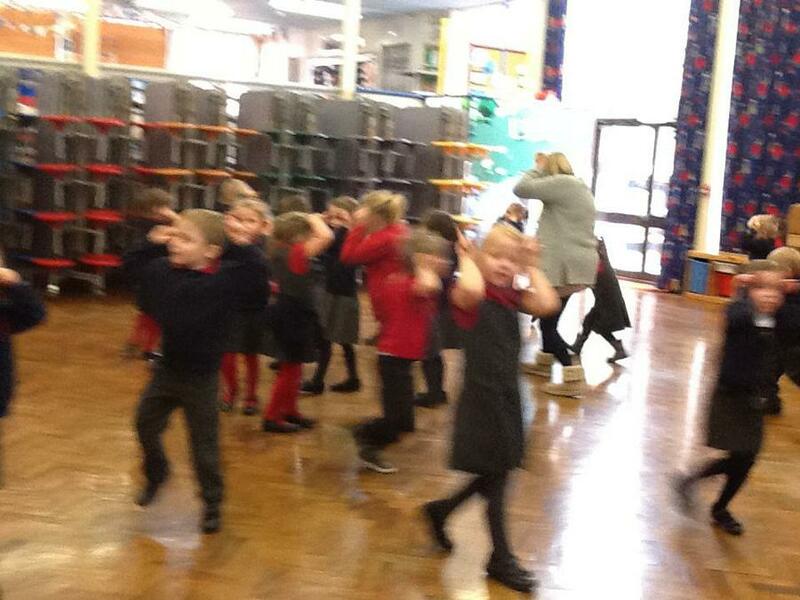 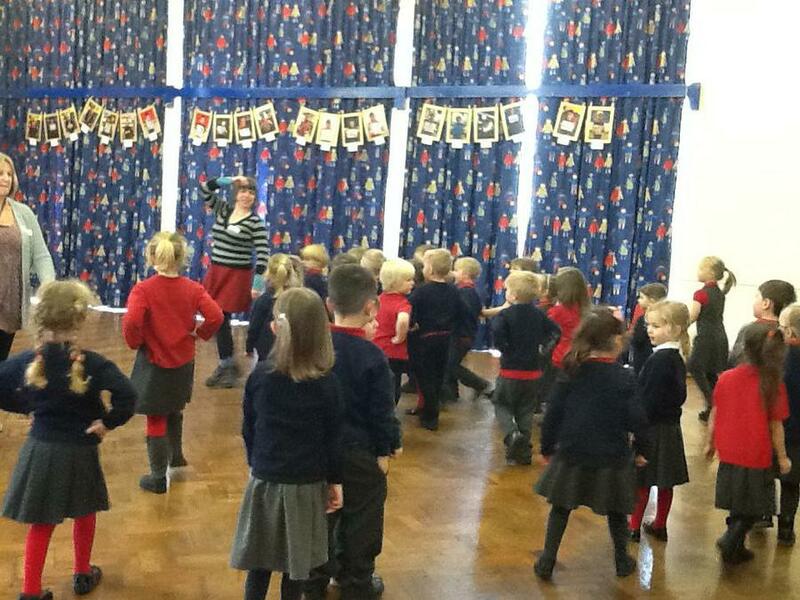 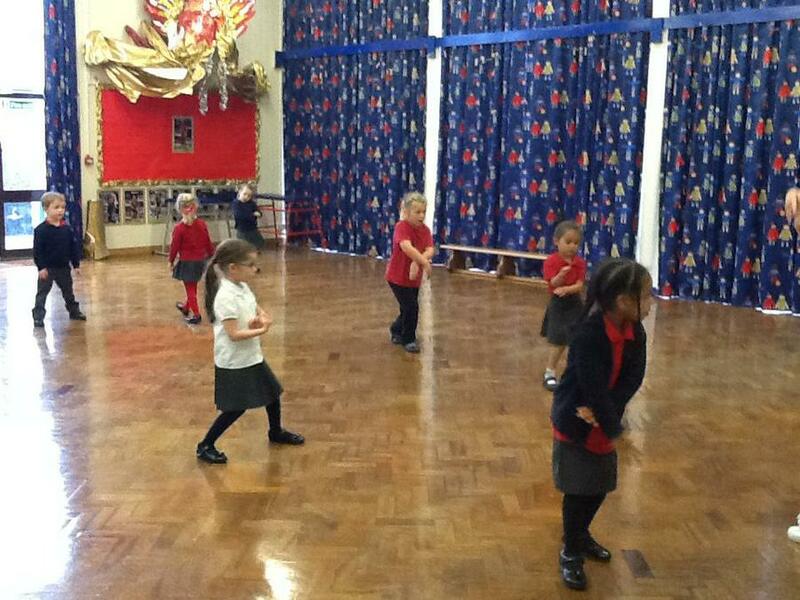 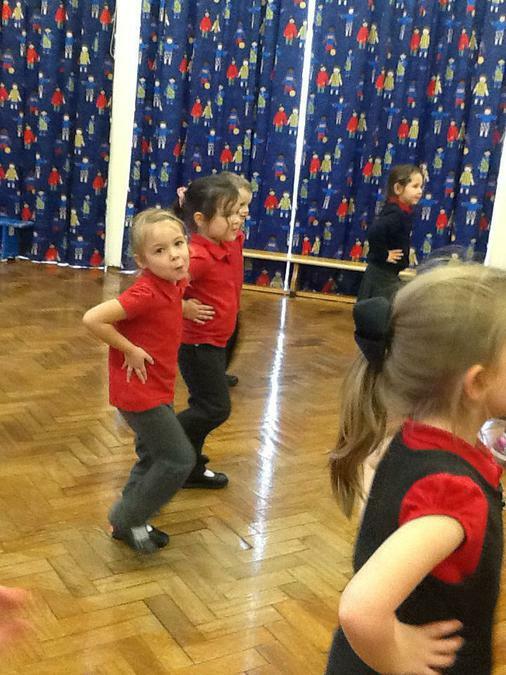 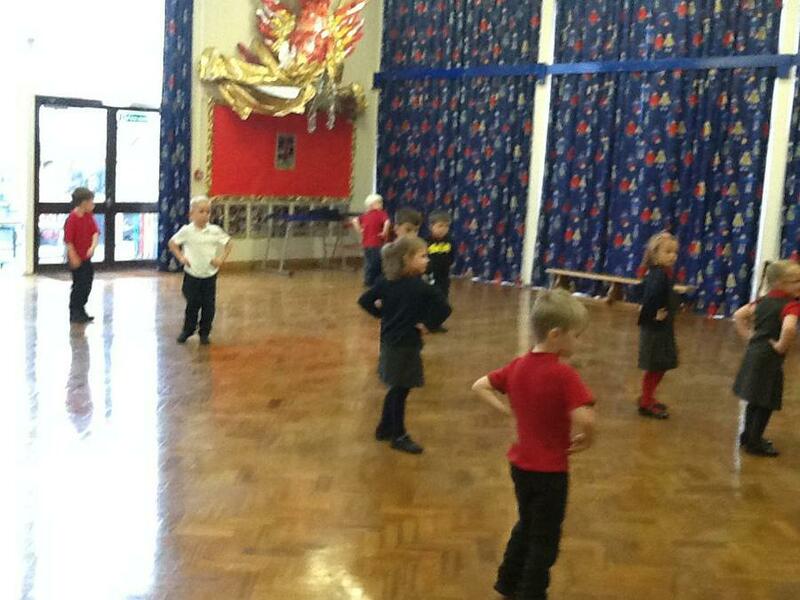 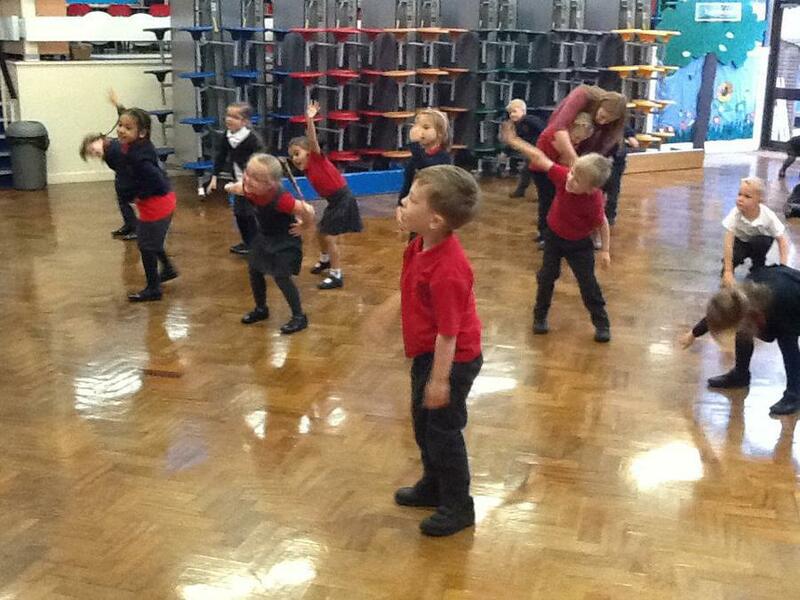 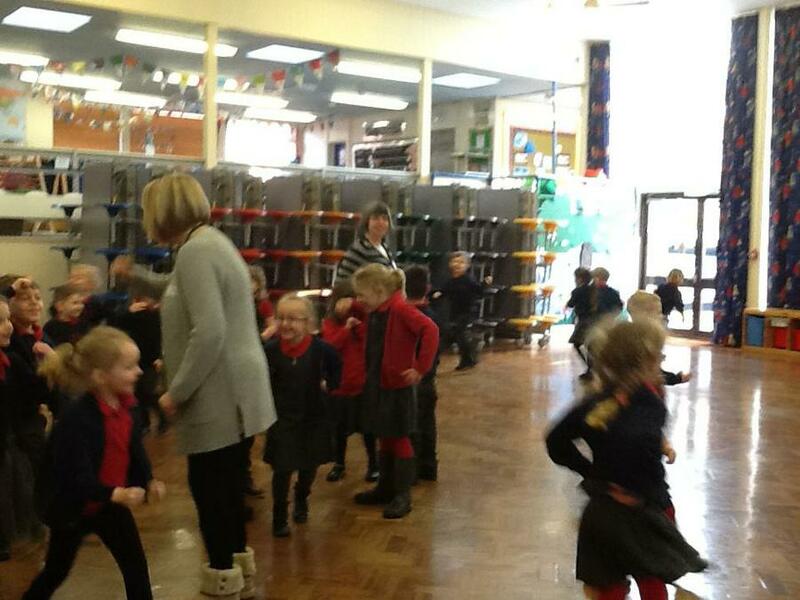 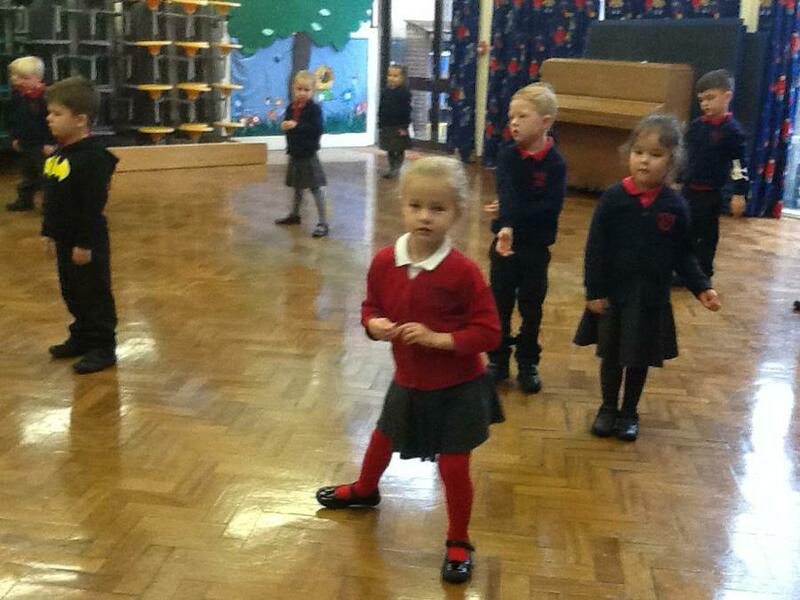 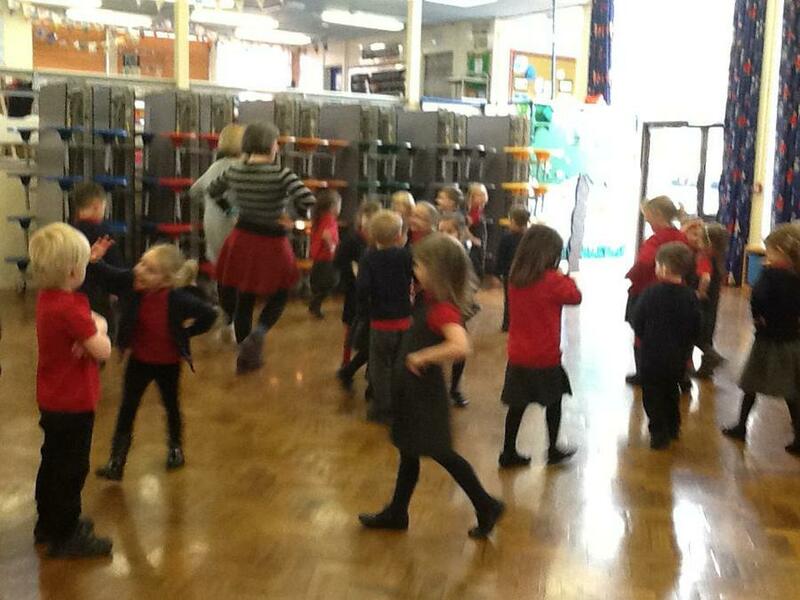 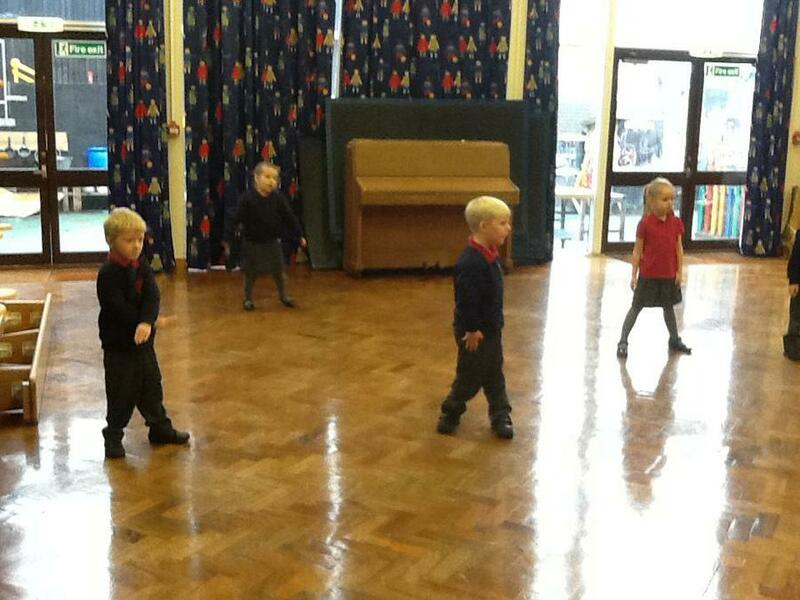 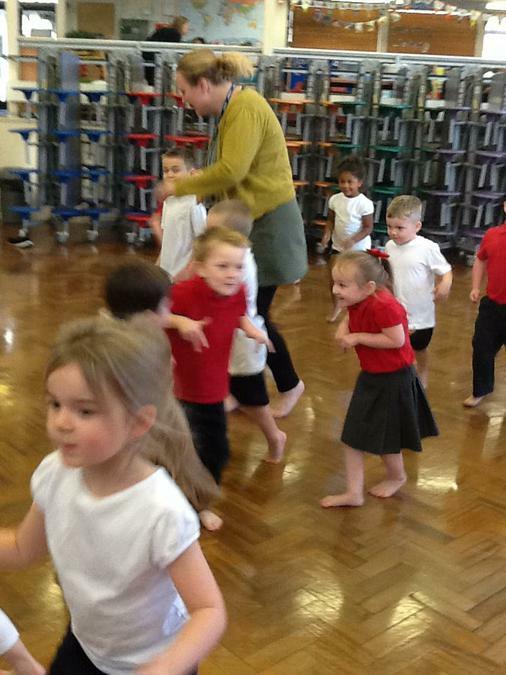 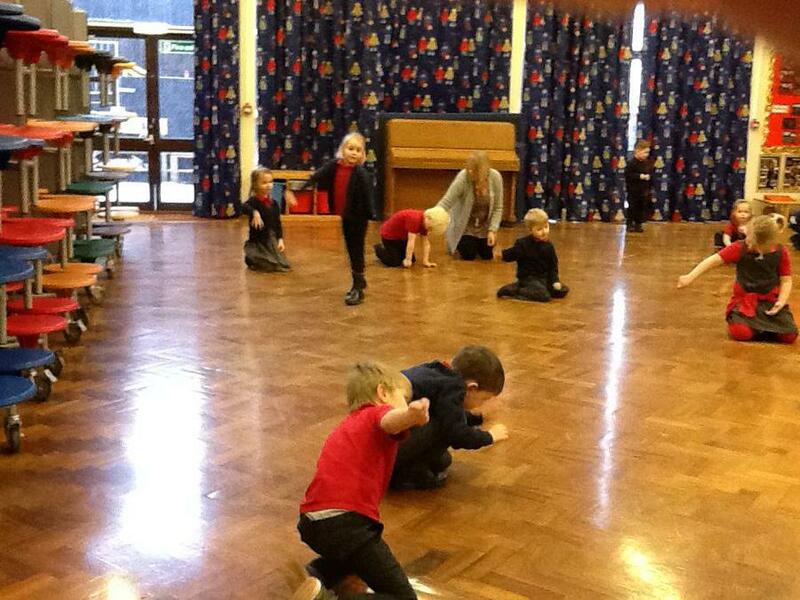 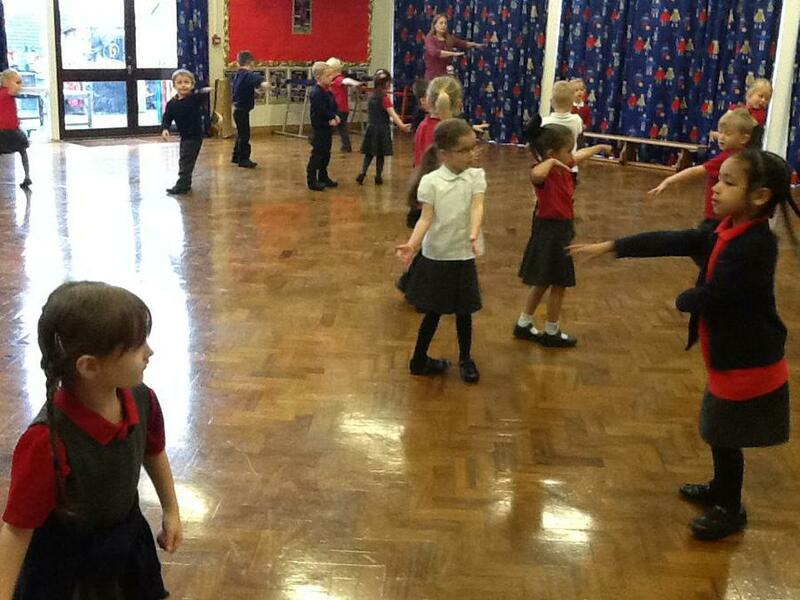 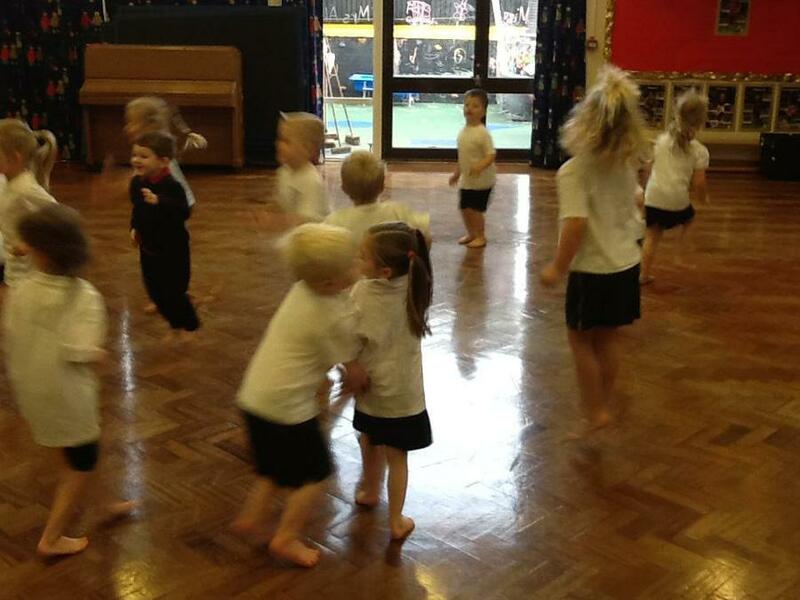 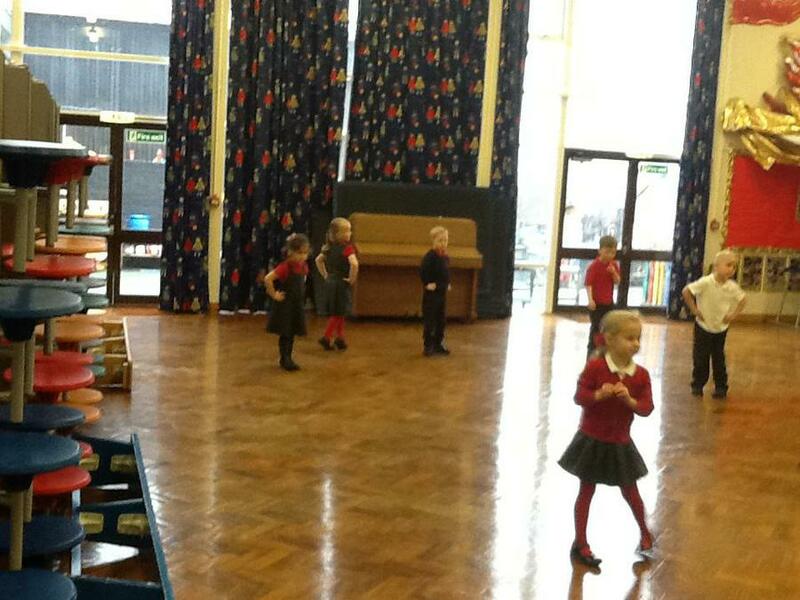 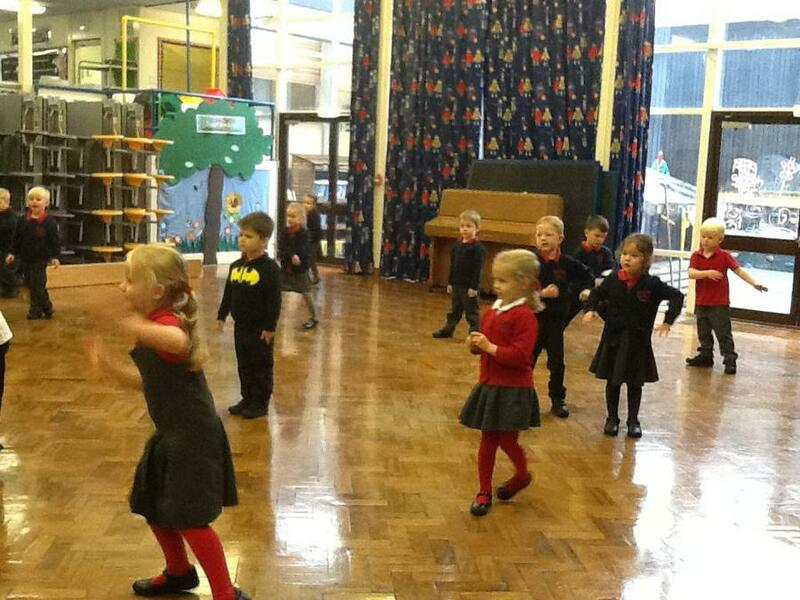 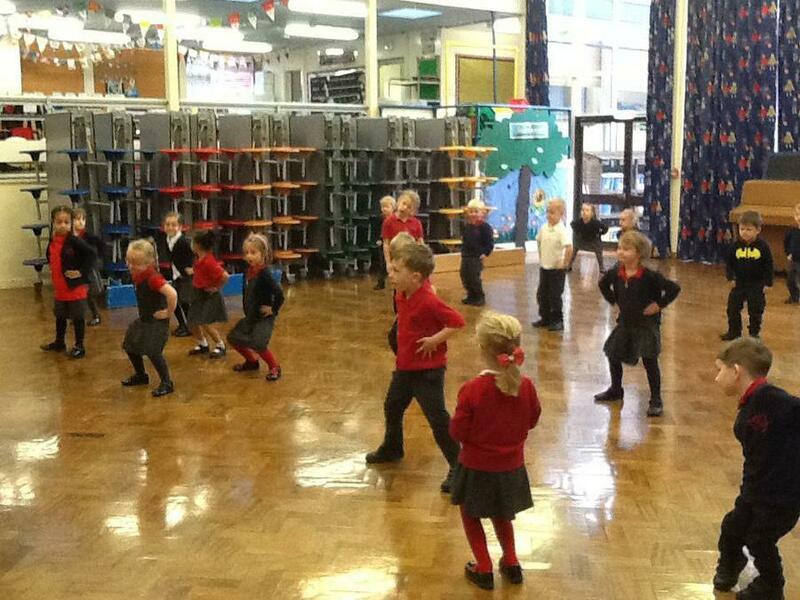 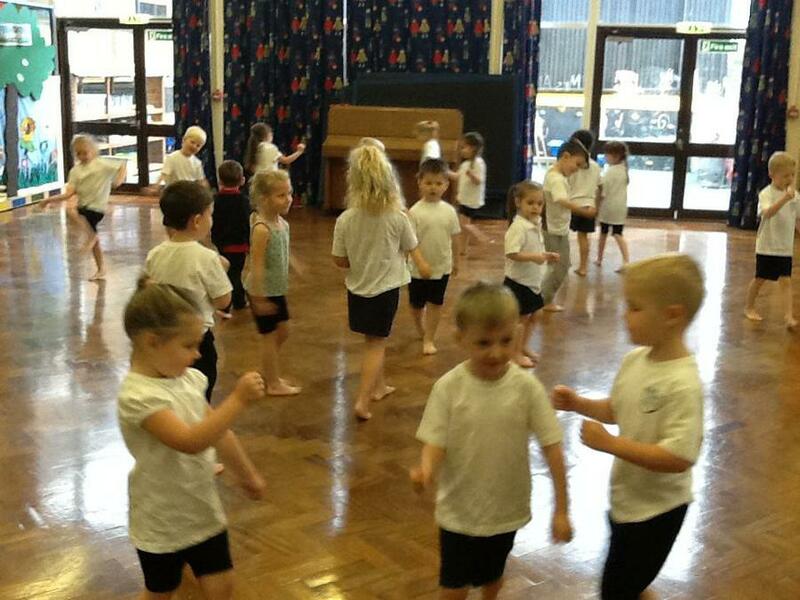 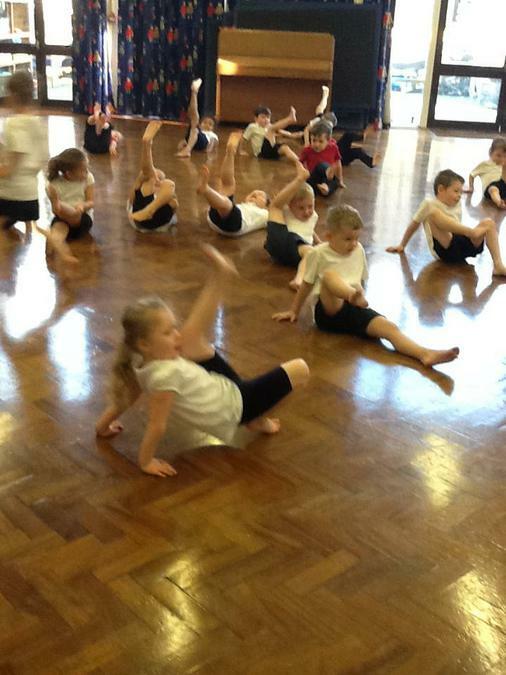 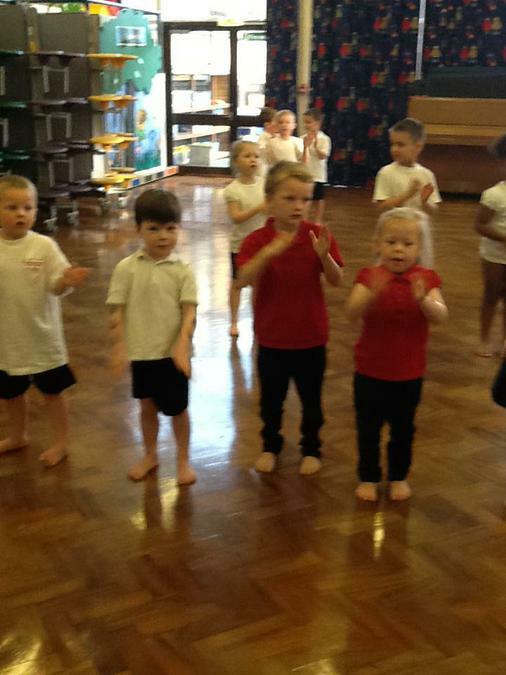 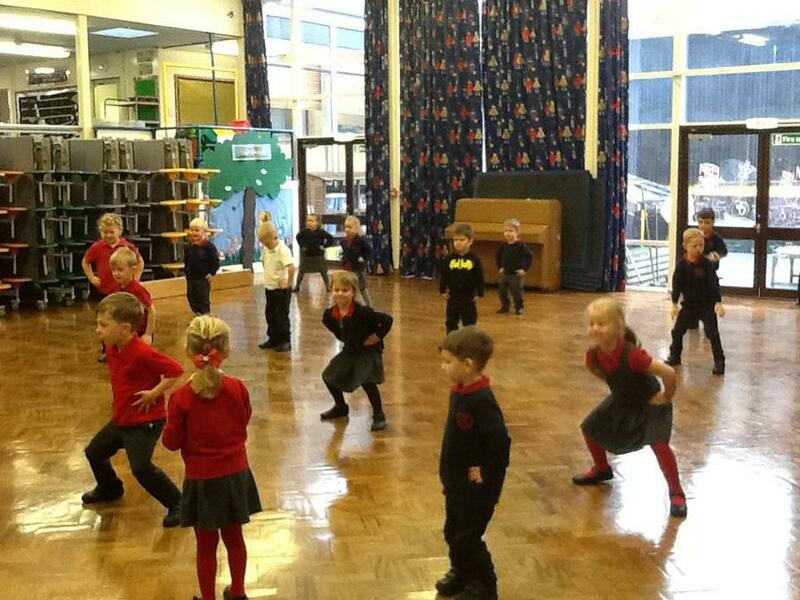 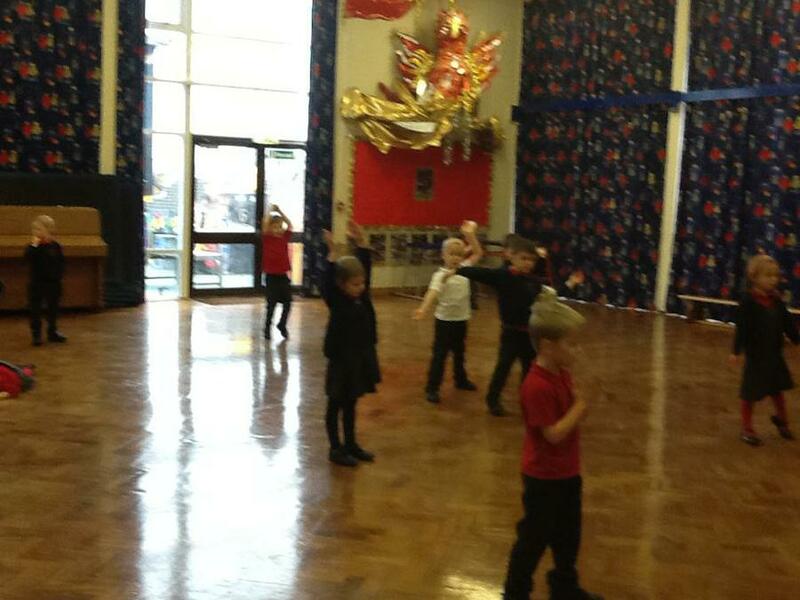 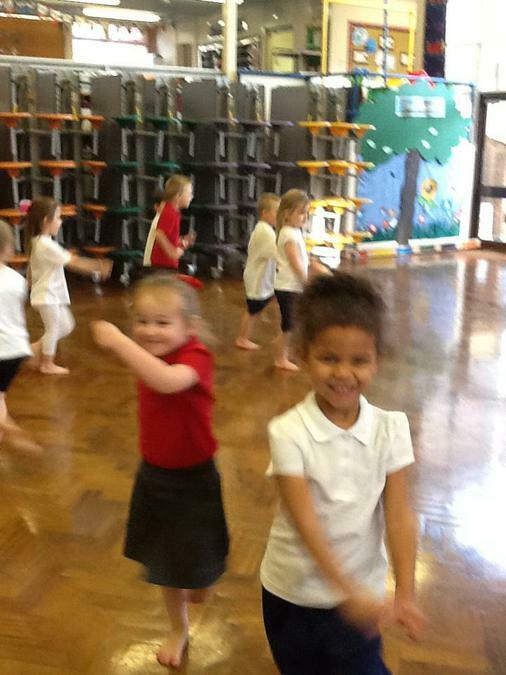 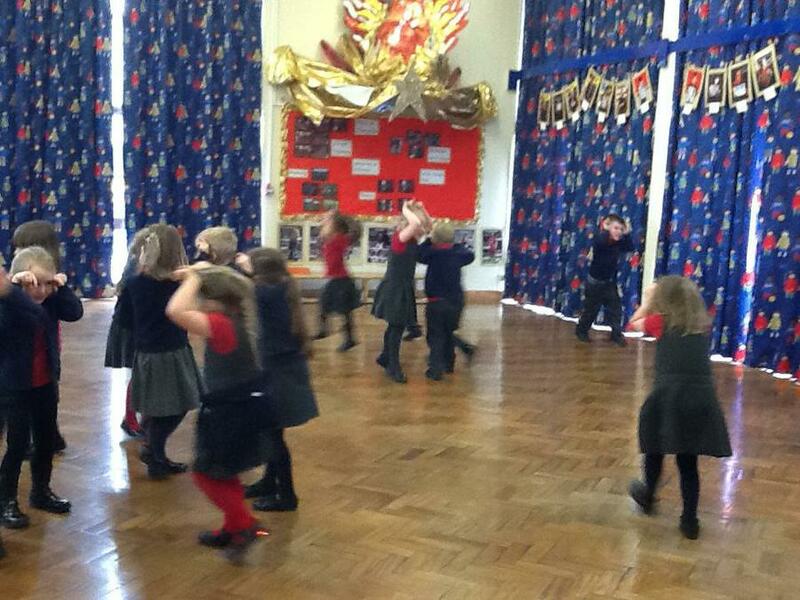 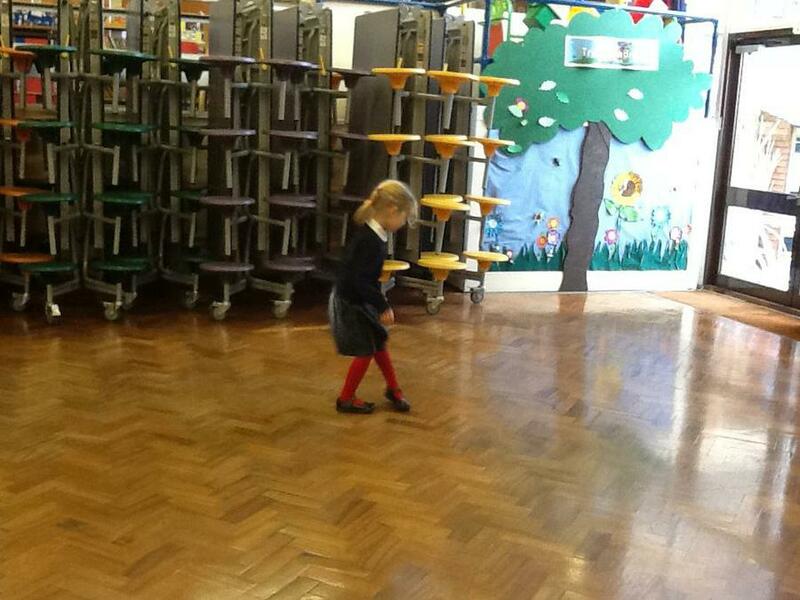 we will focus on dance on Children in Need day as the school fundraiser is a dance-a-thon. 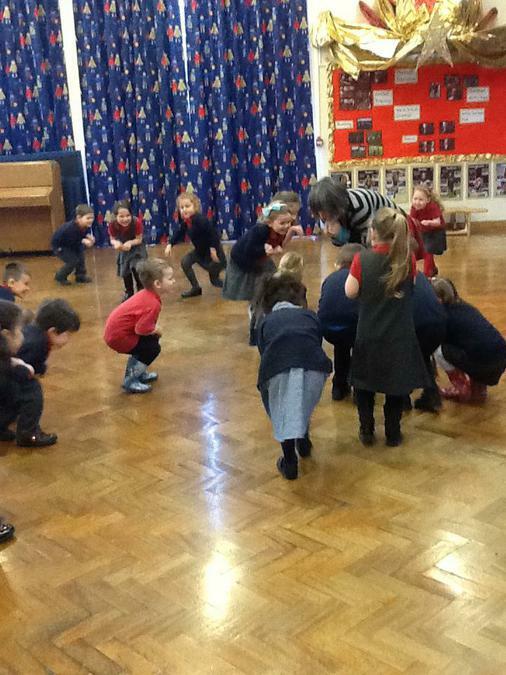 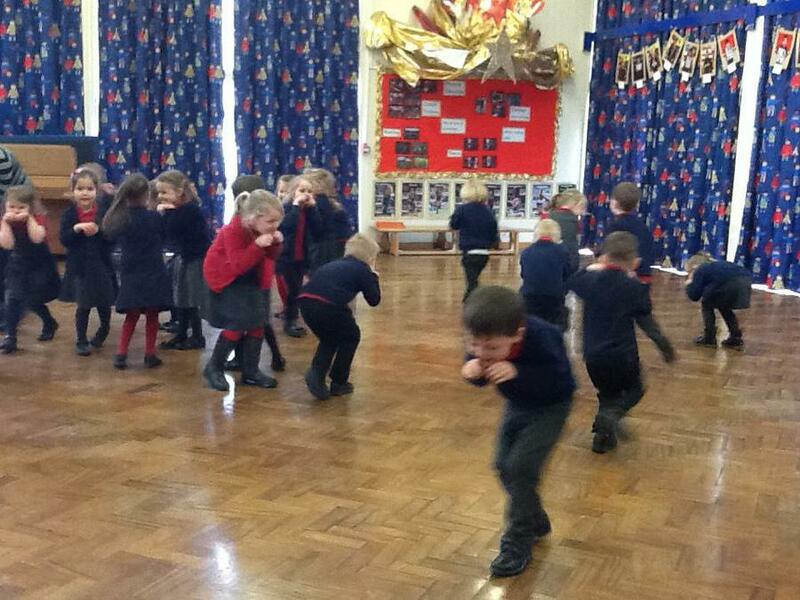 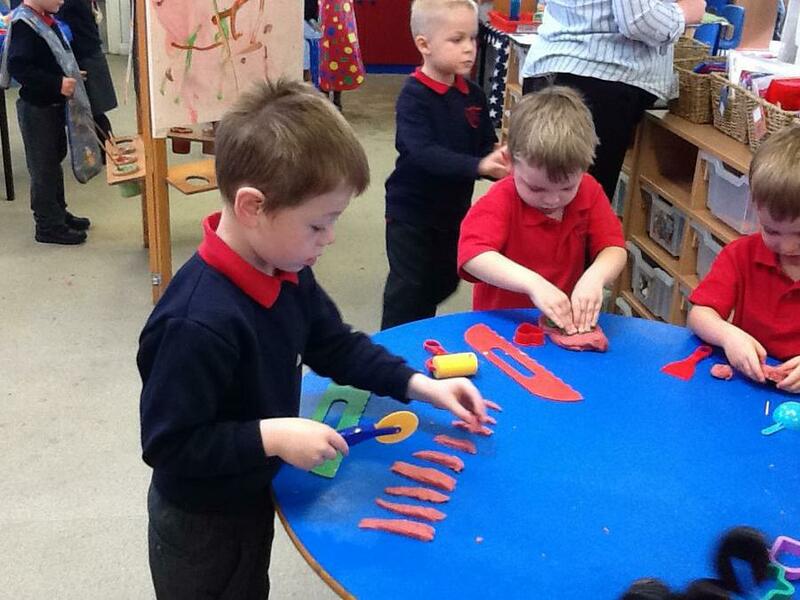 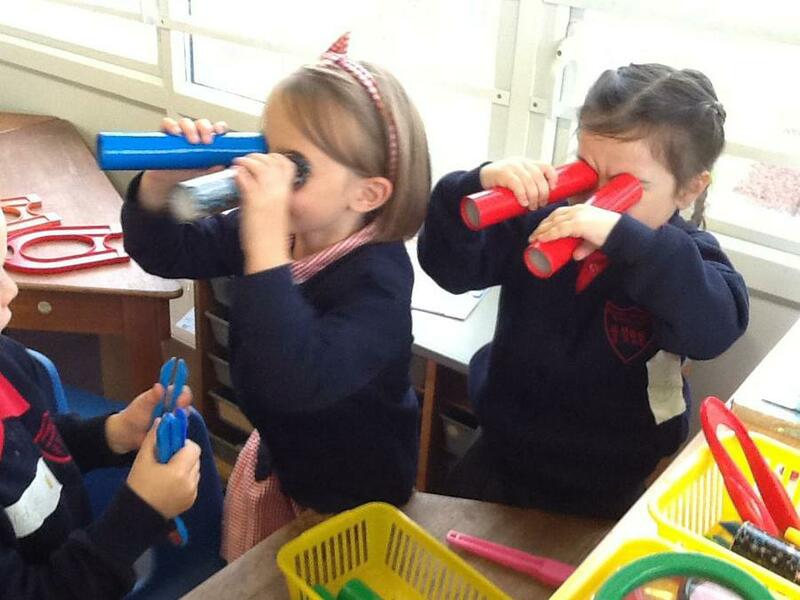 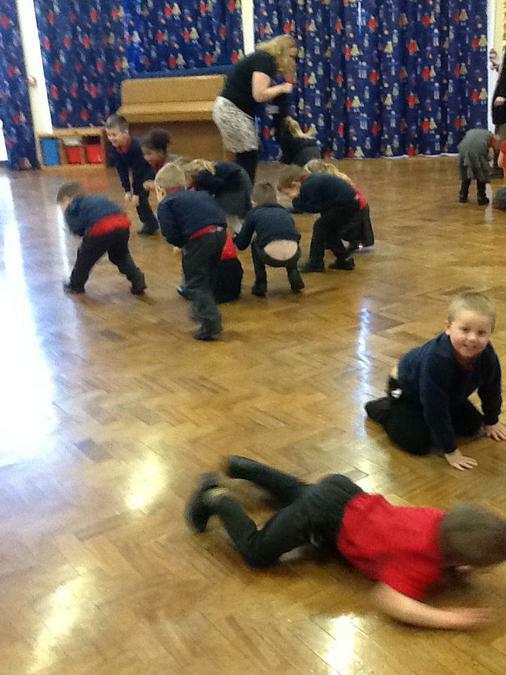 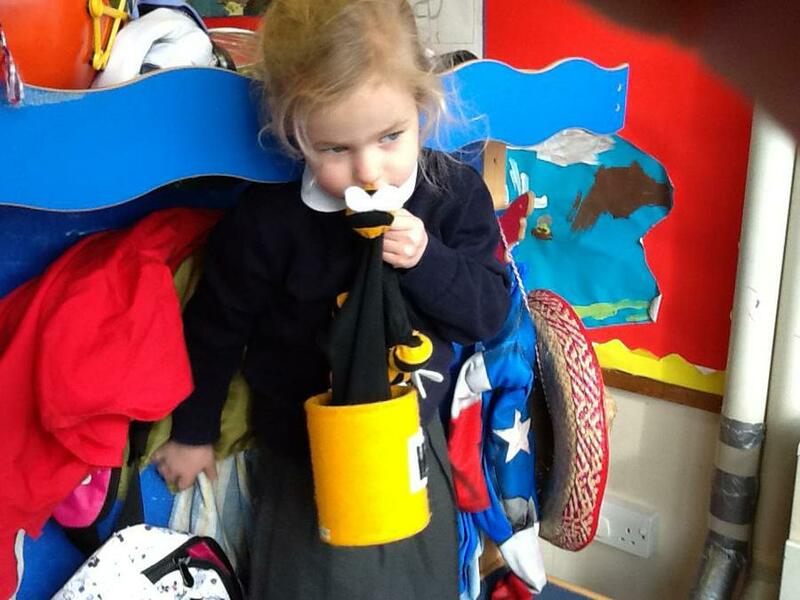 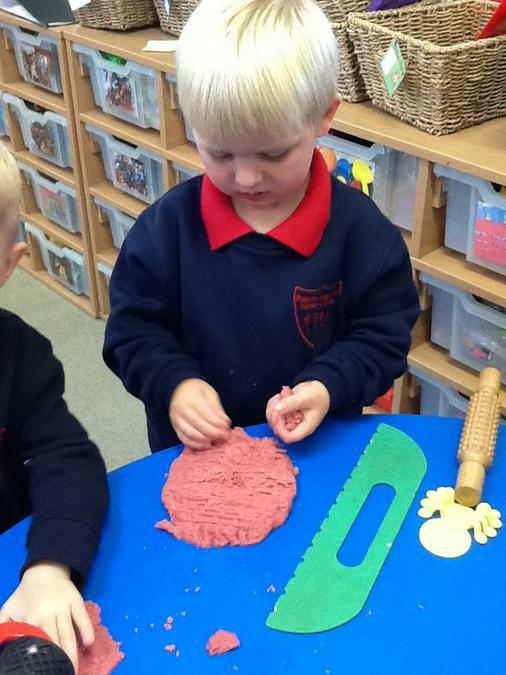 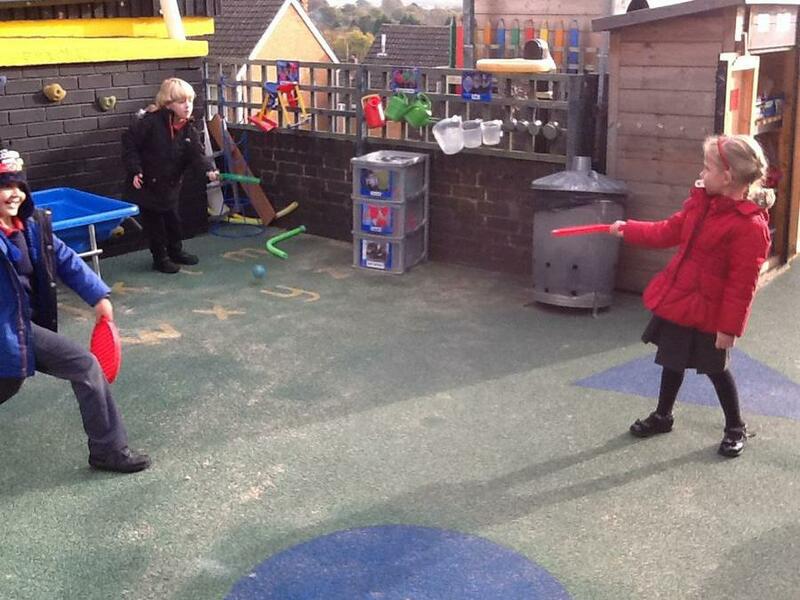 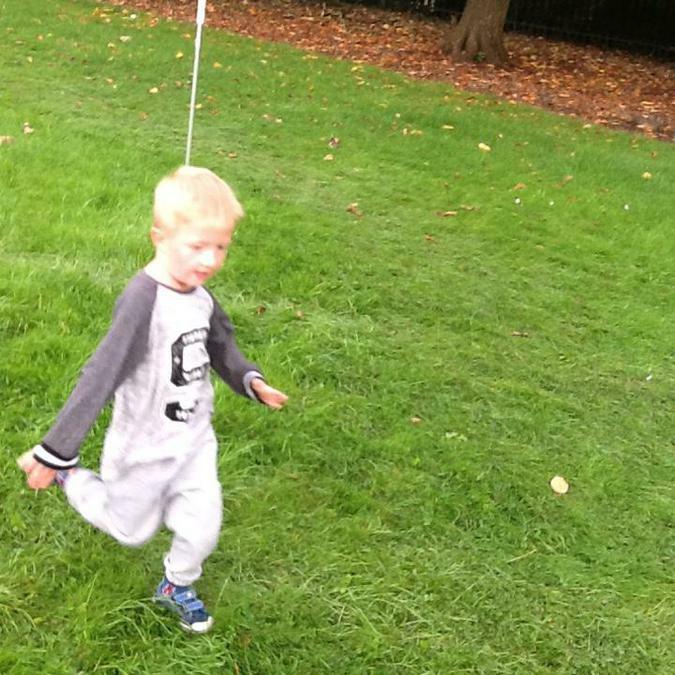 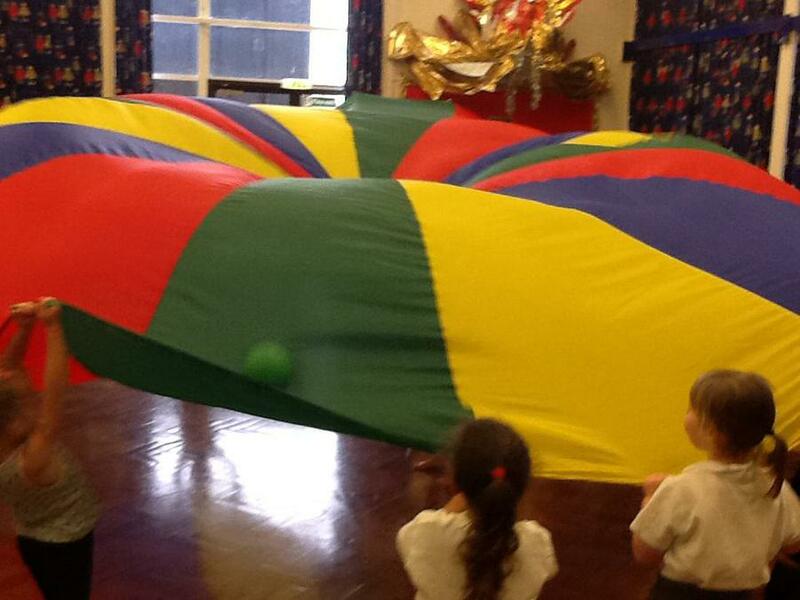 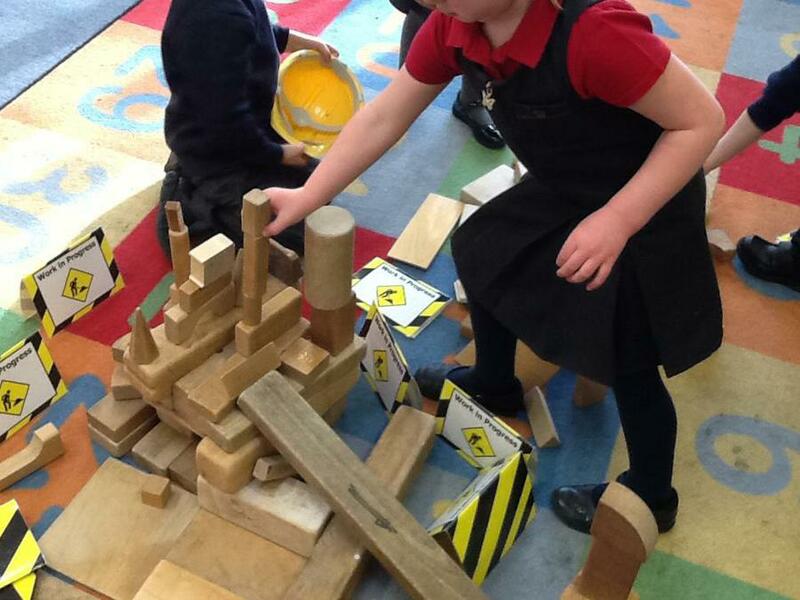 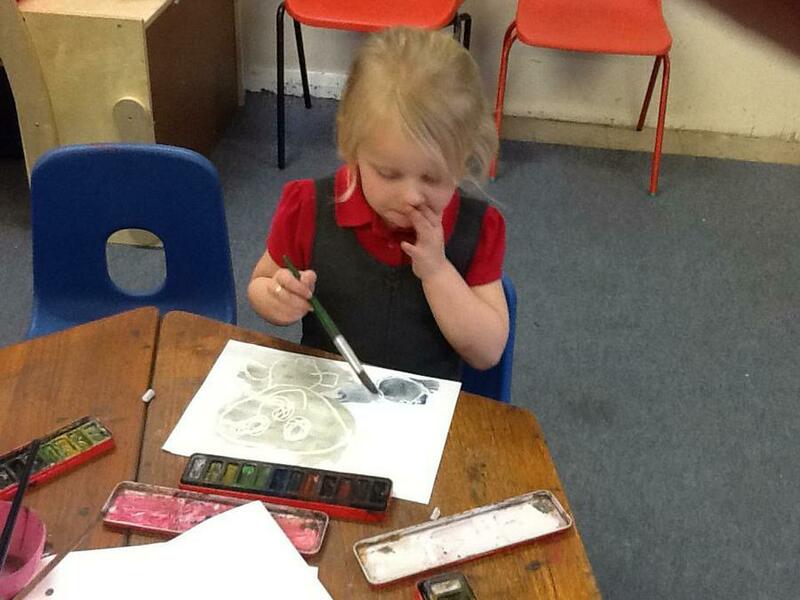 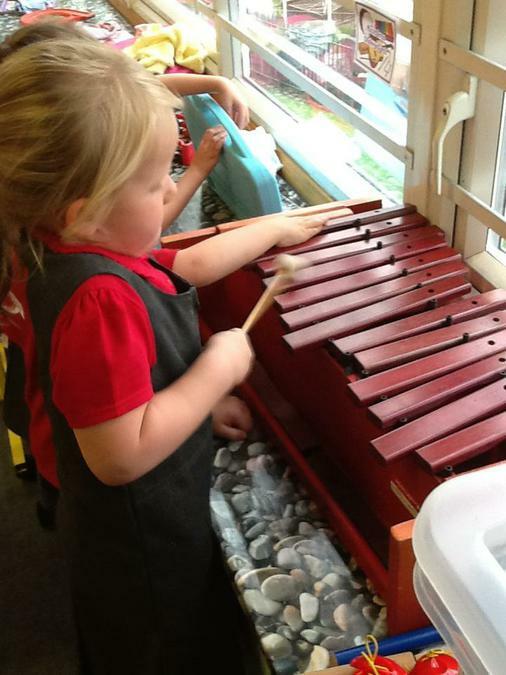 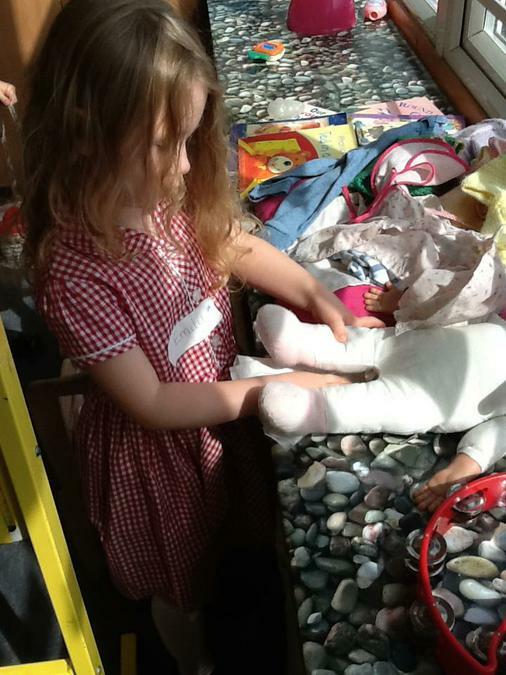 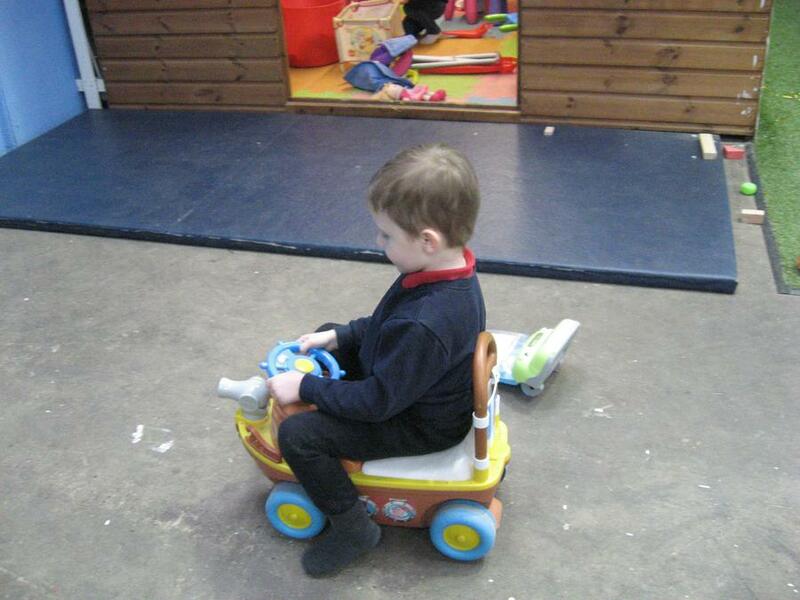 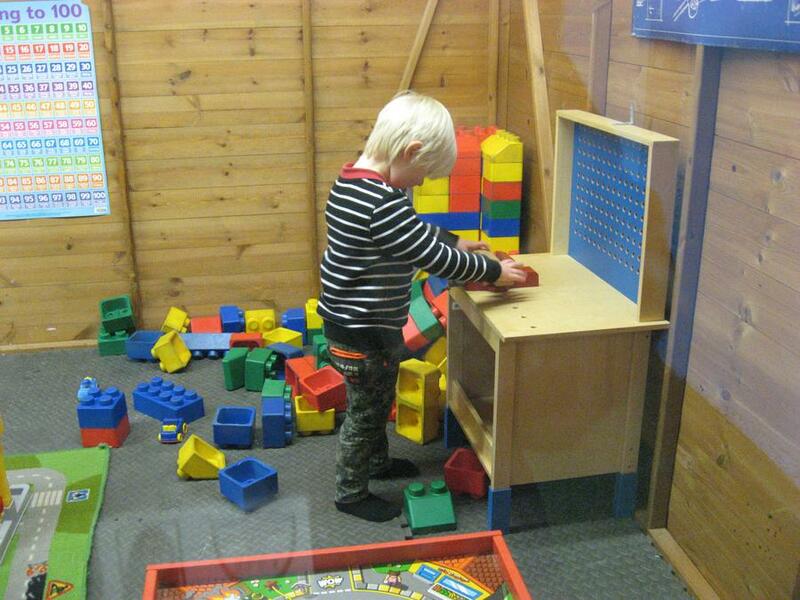 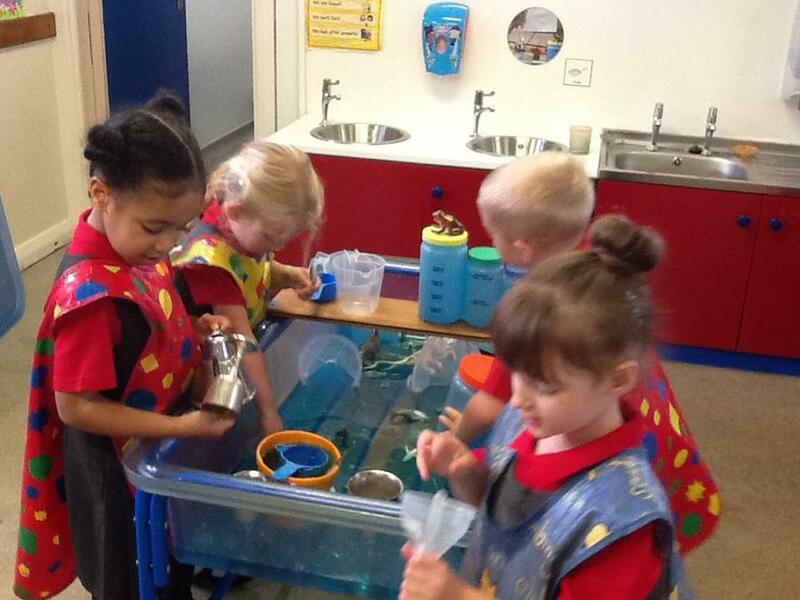 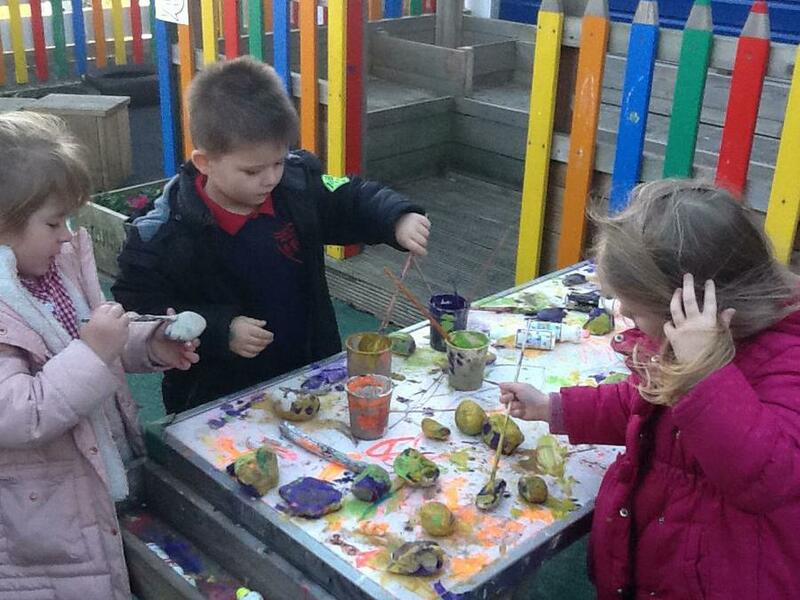 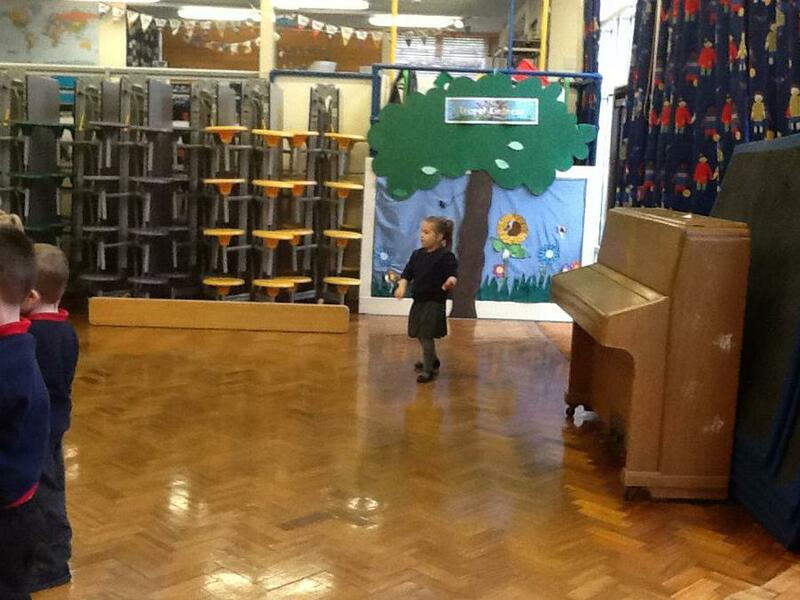 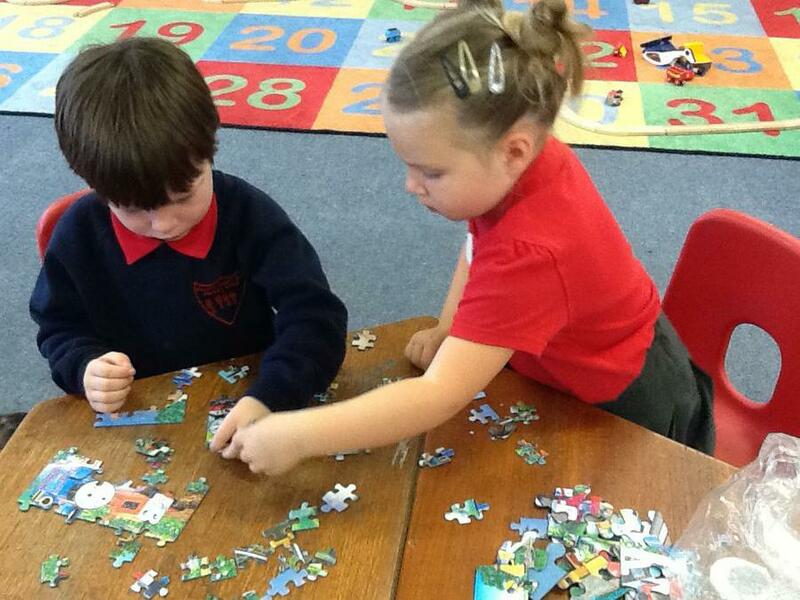 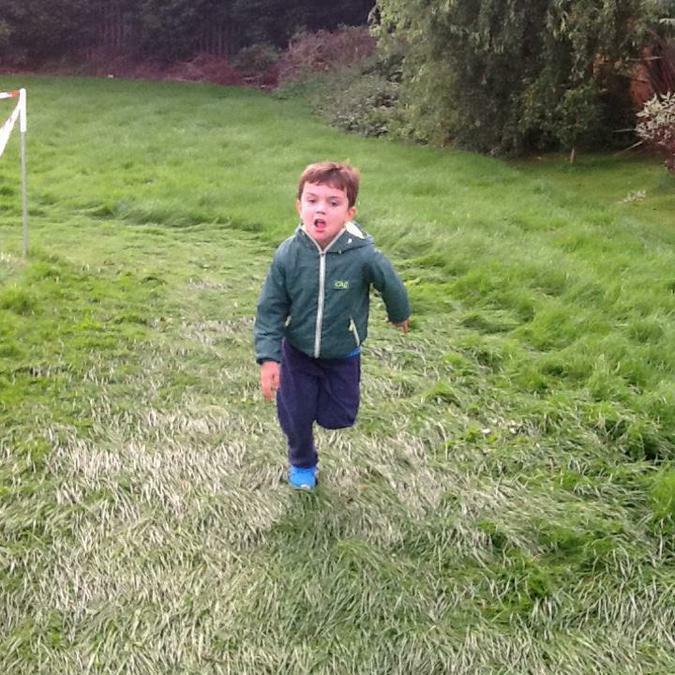 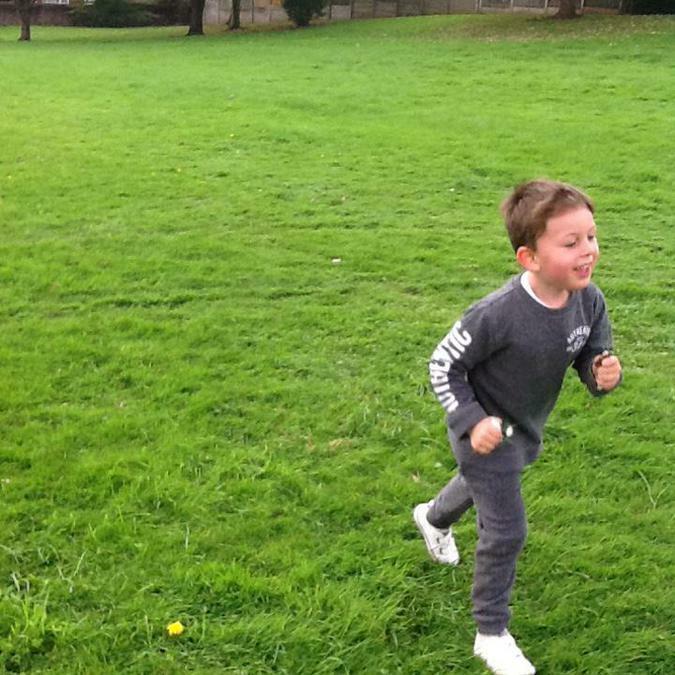 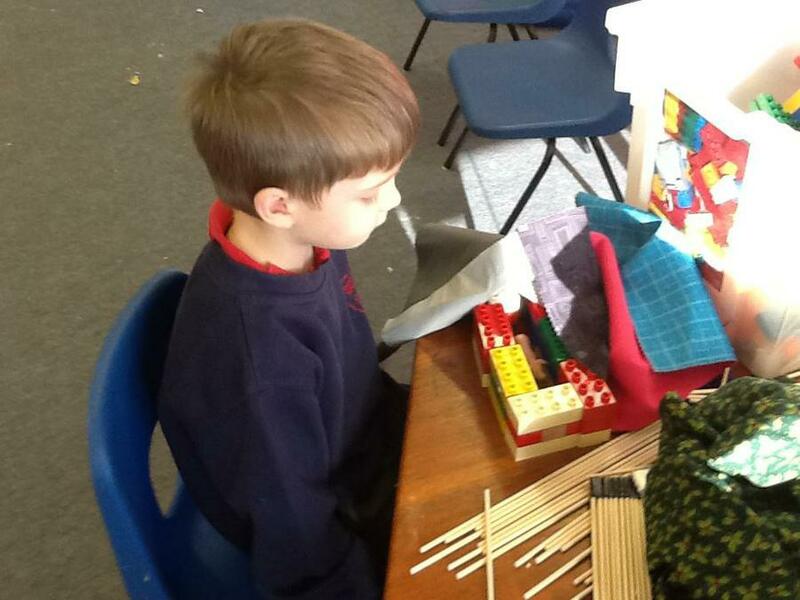 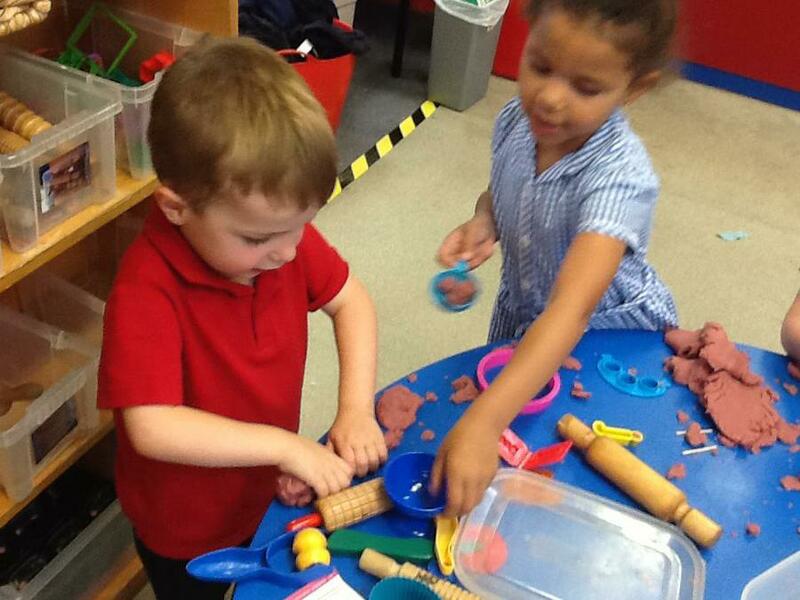 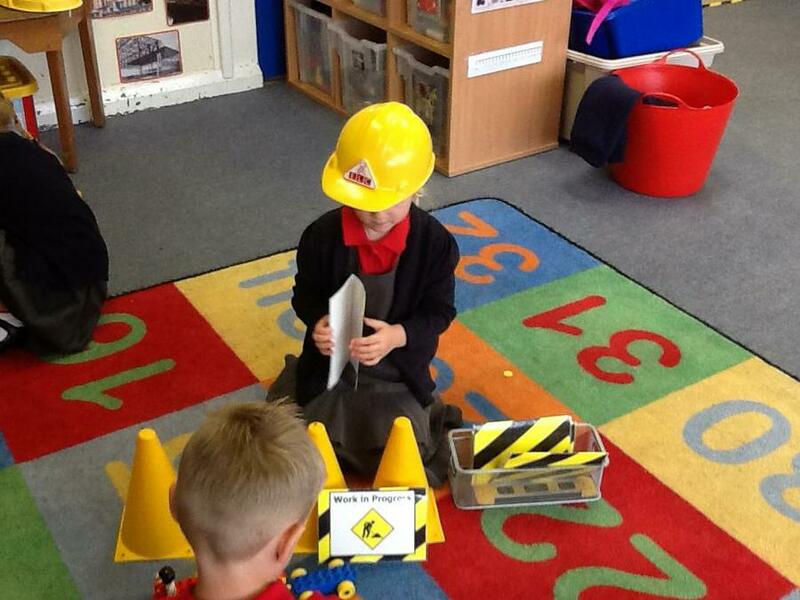 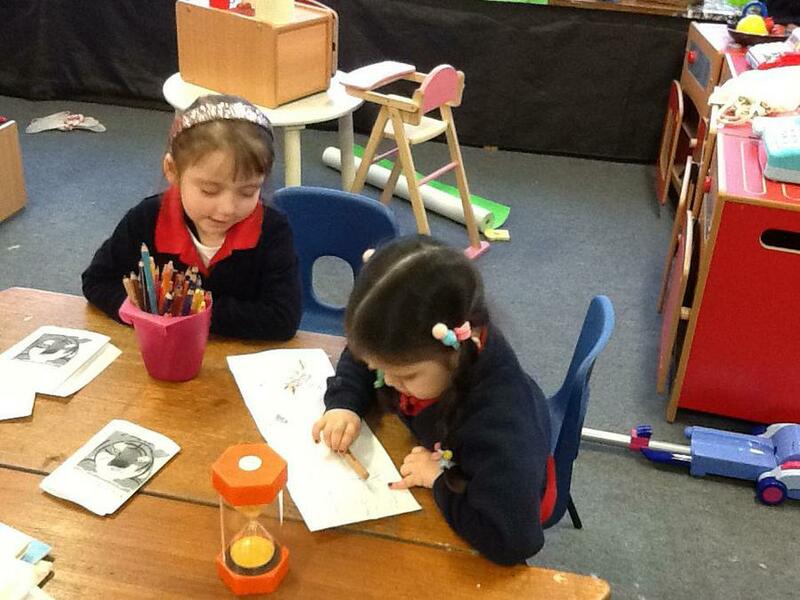 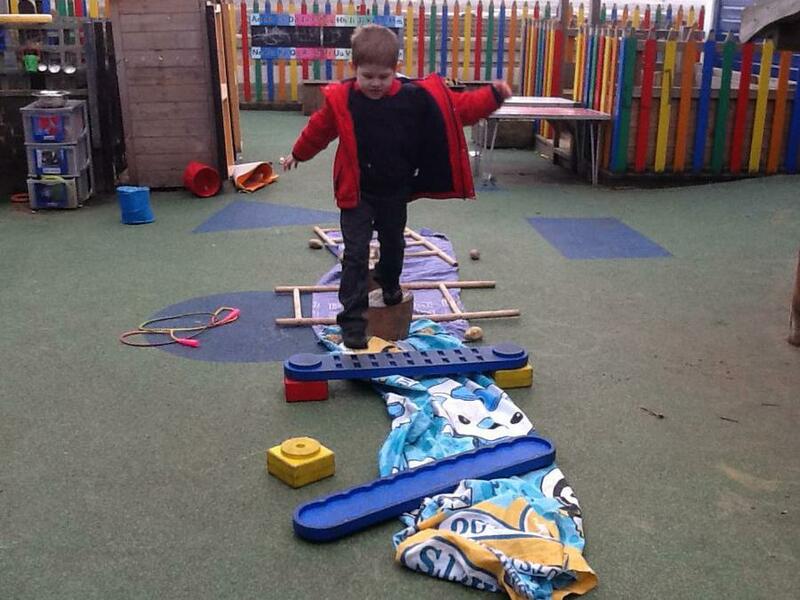 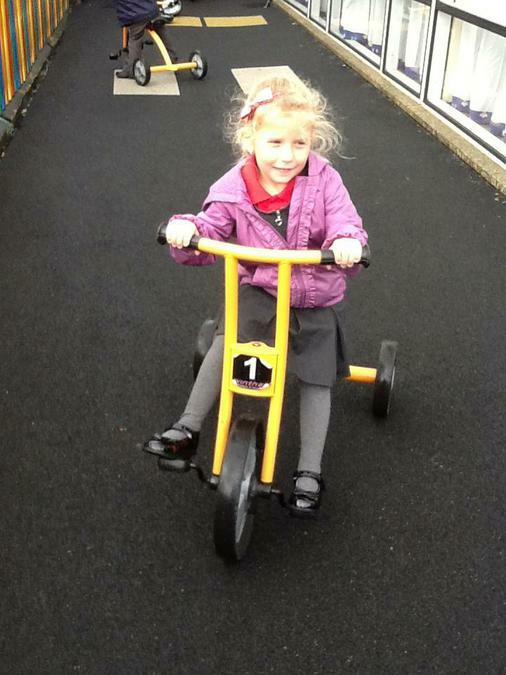 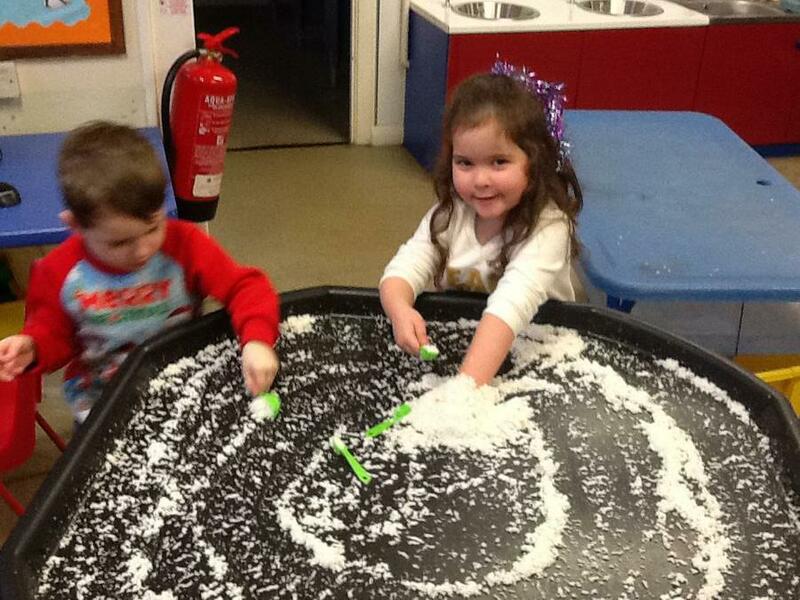 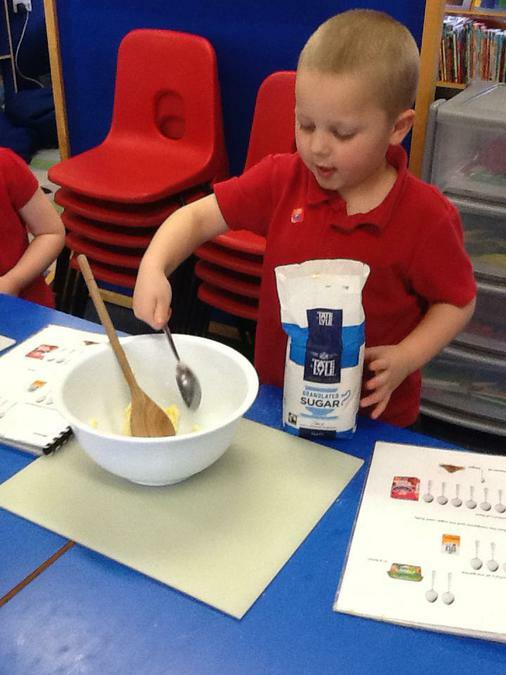 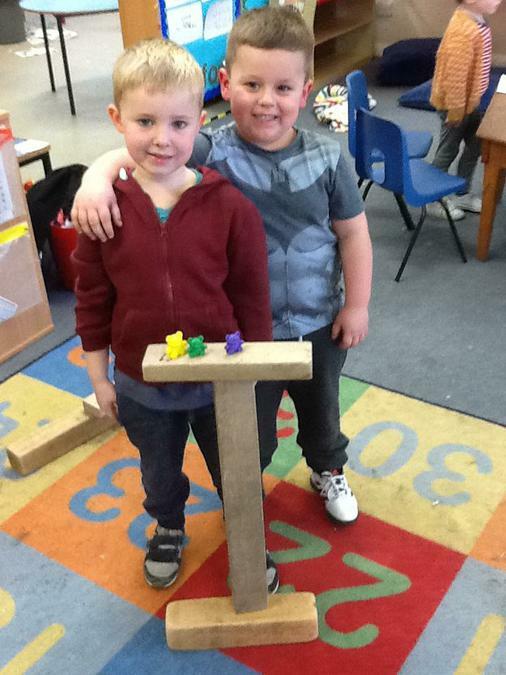 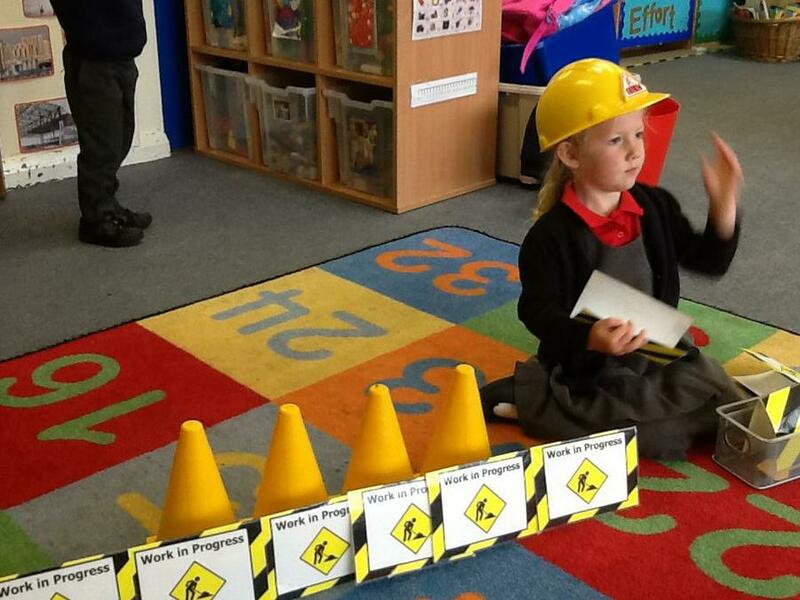 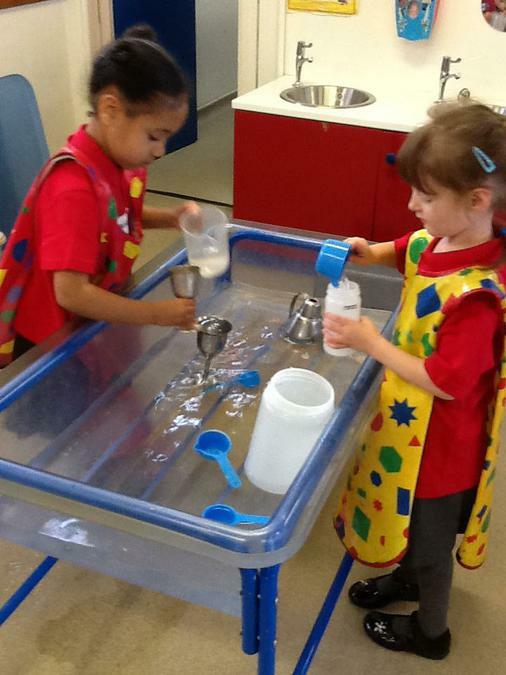 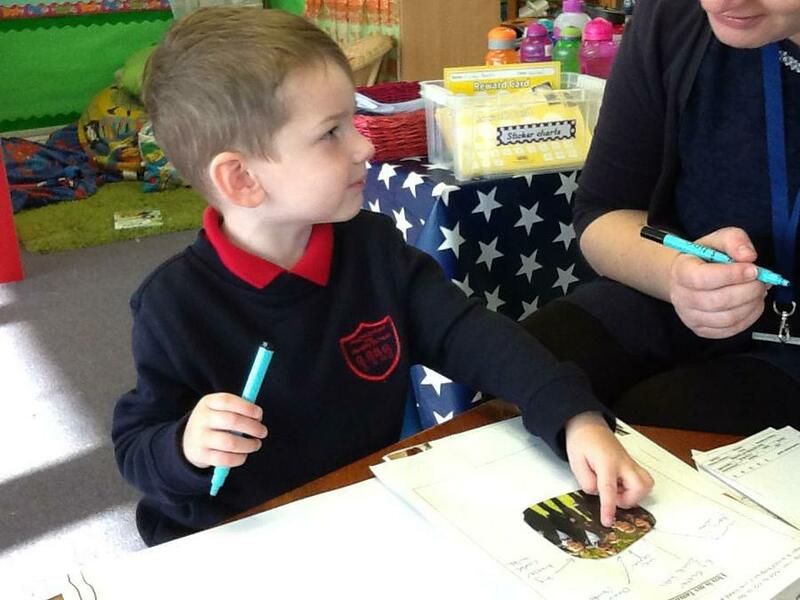 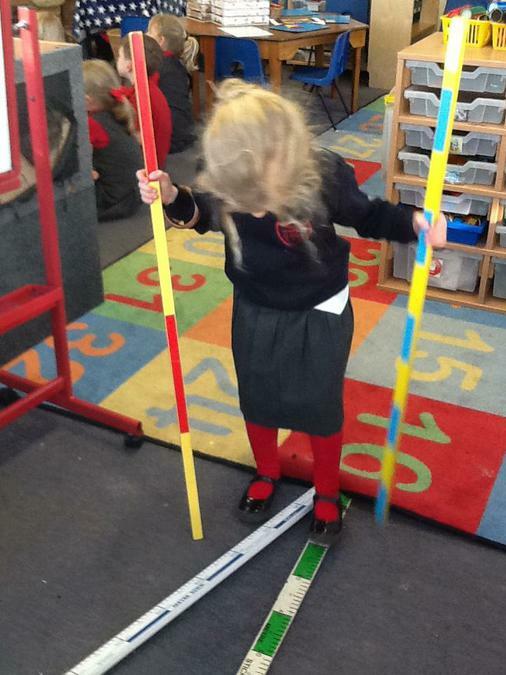 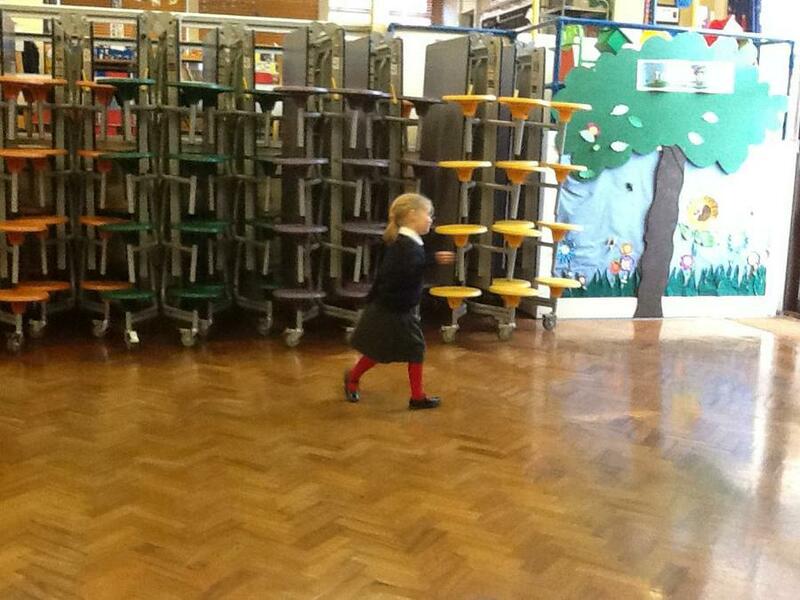 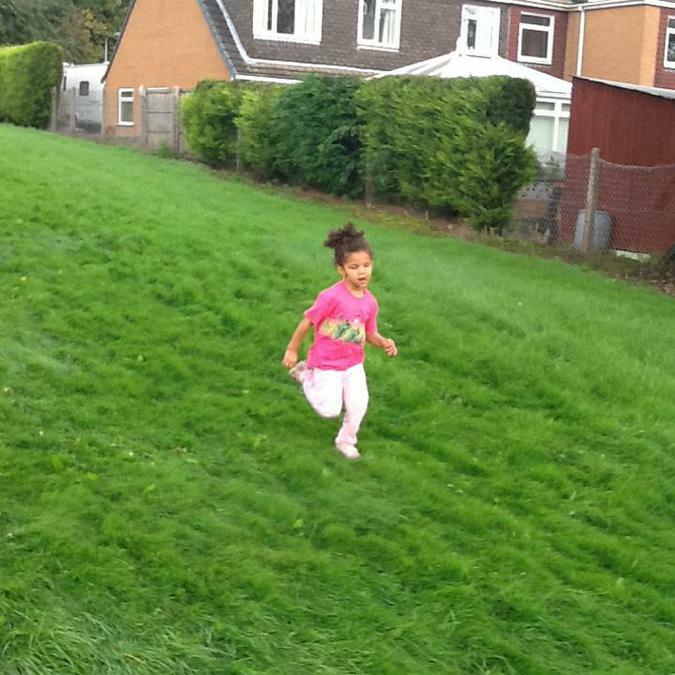 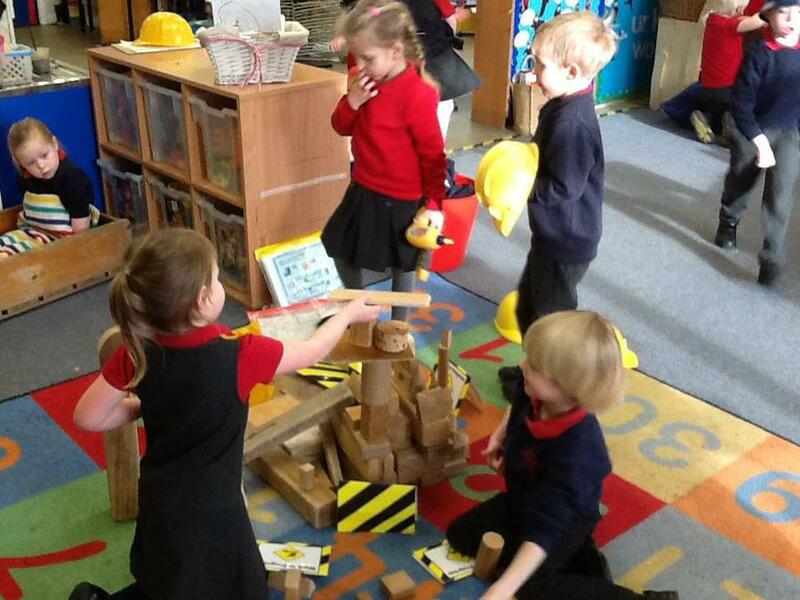 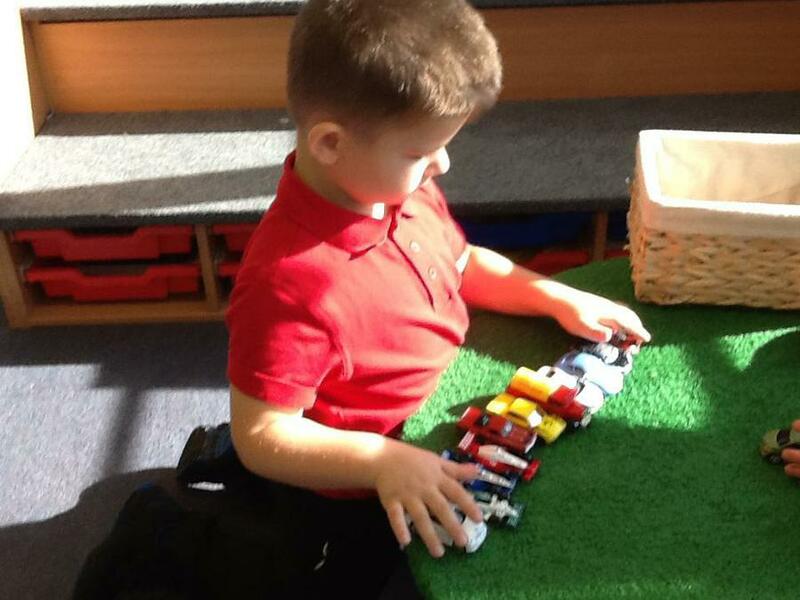 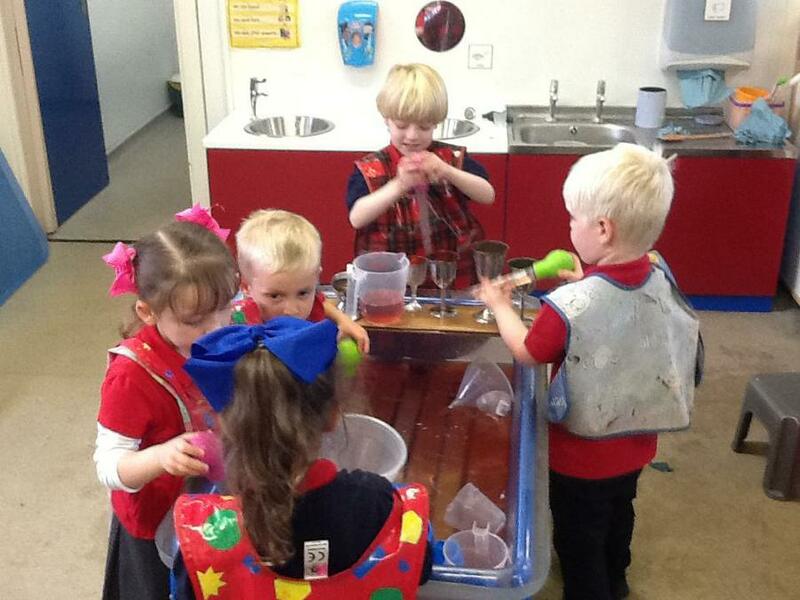 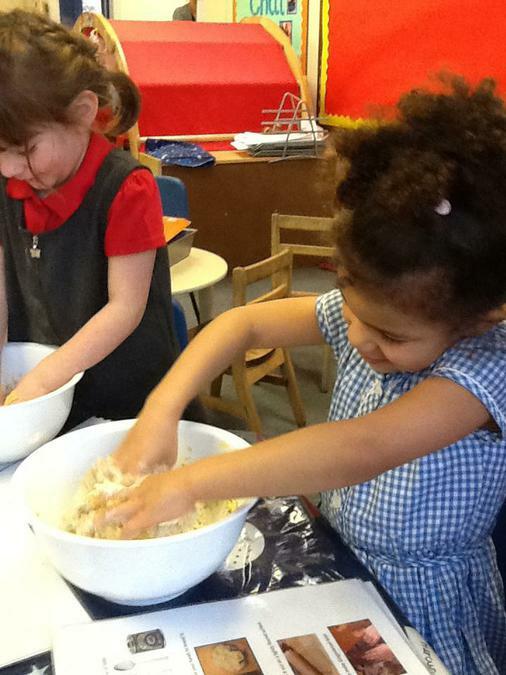 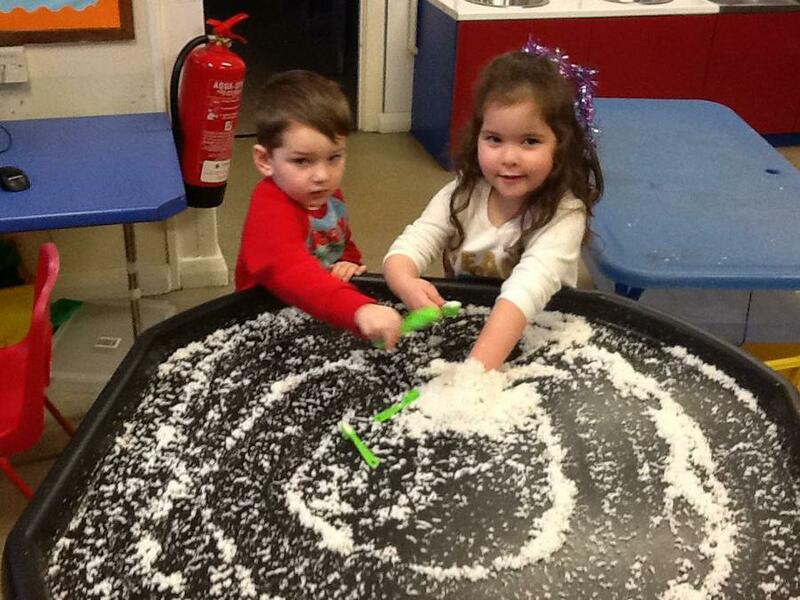 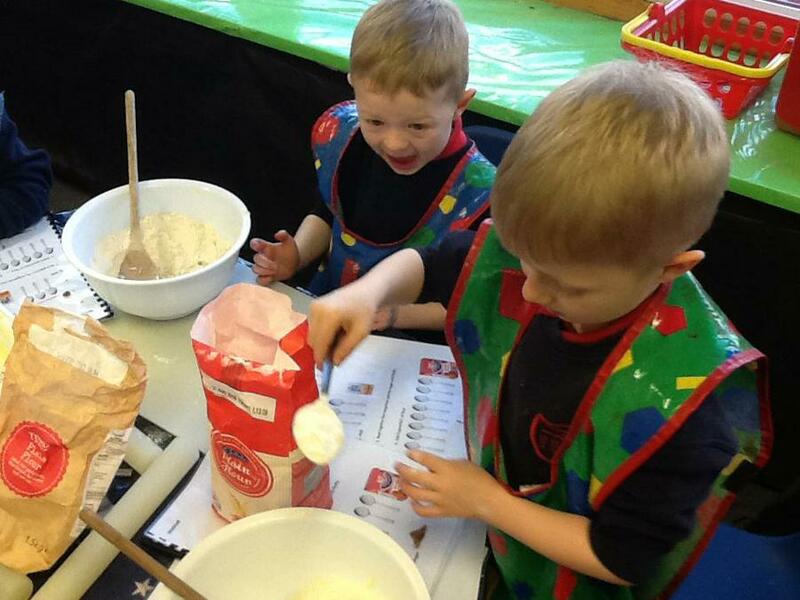 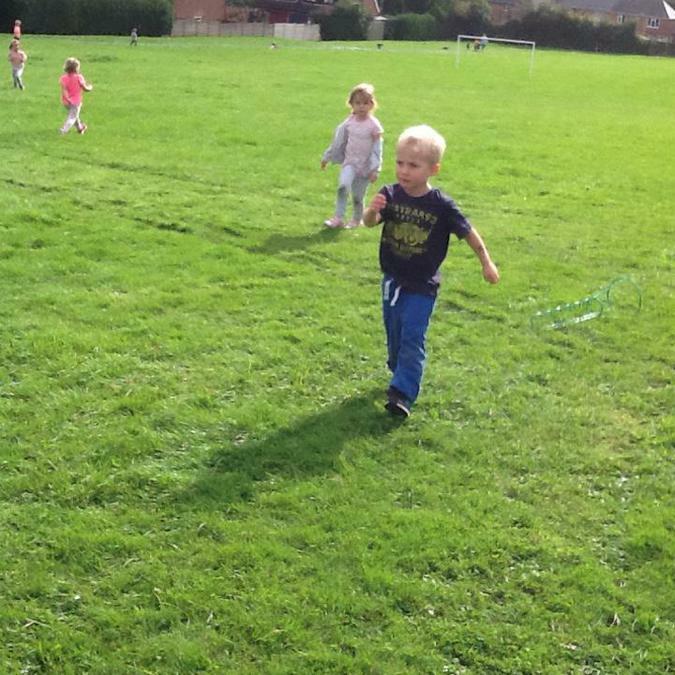 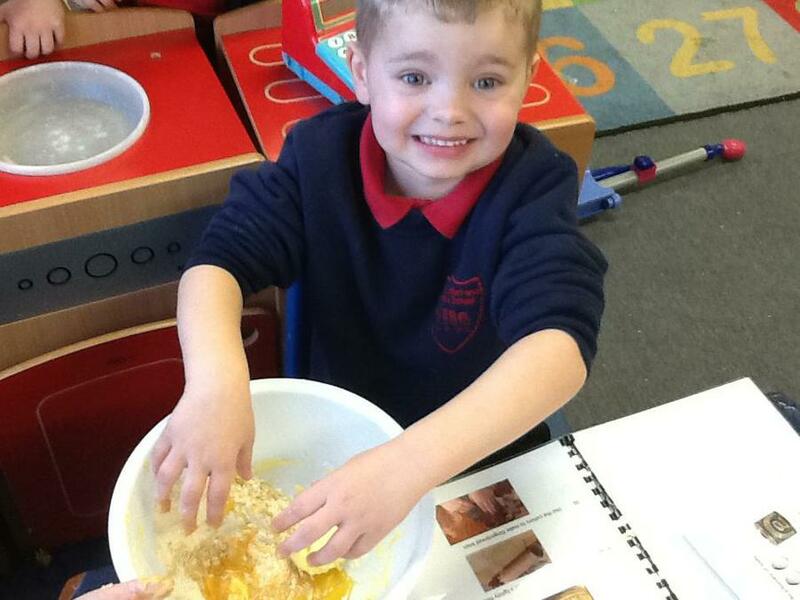 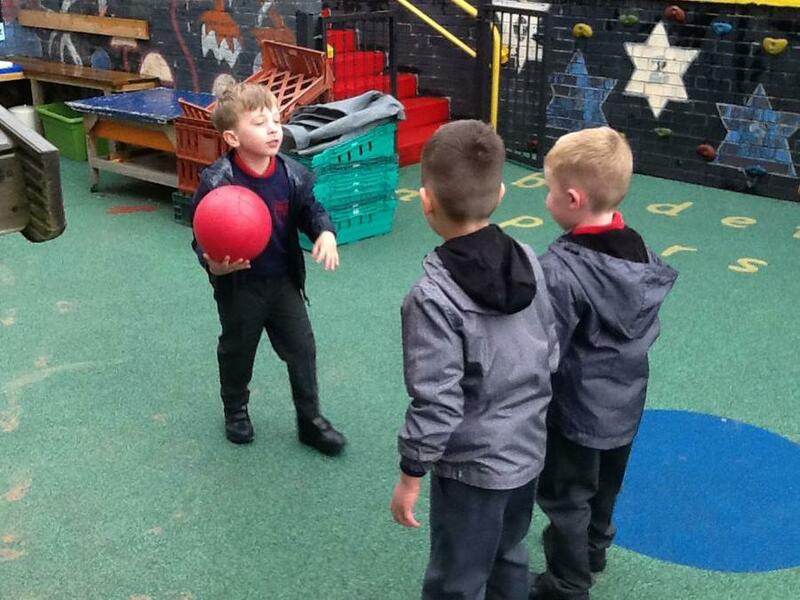 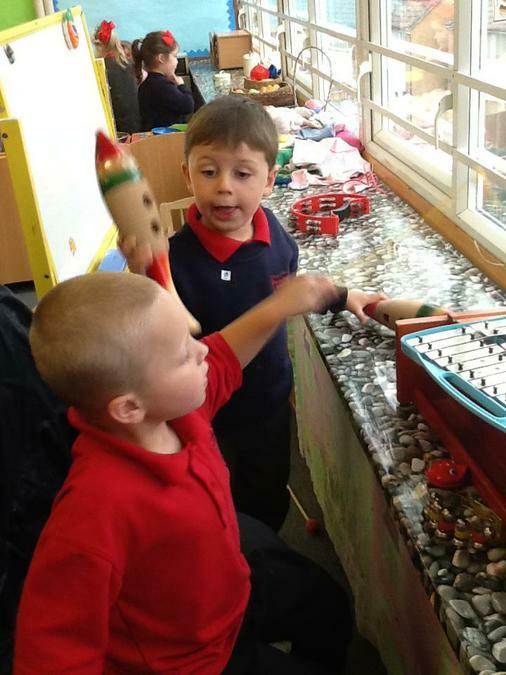 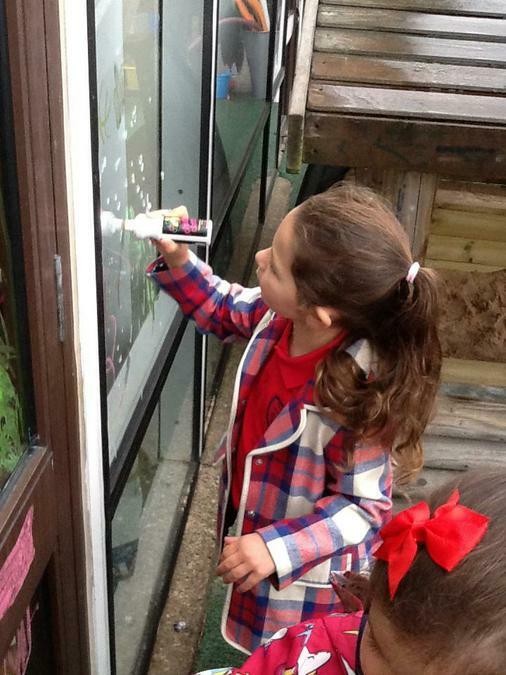 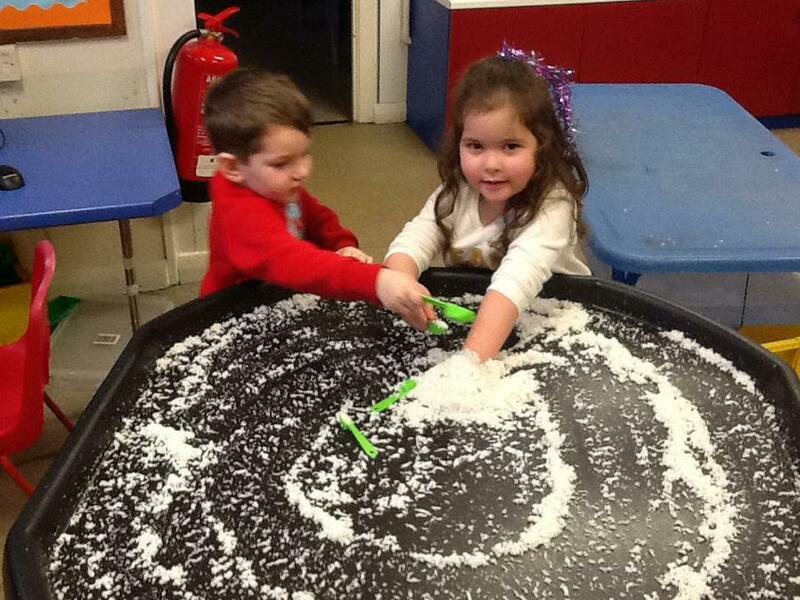 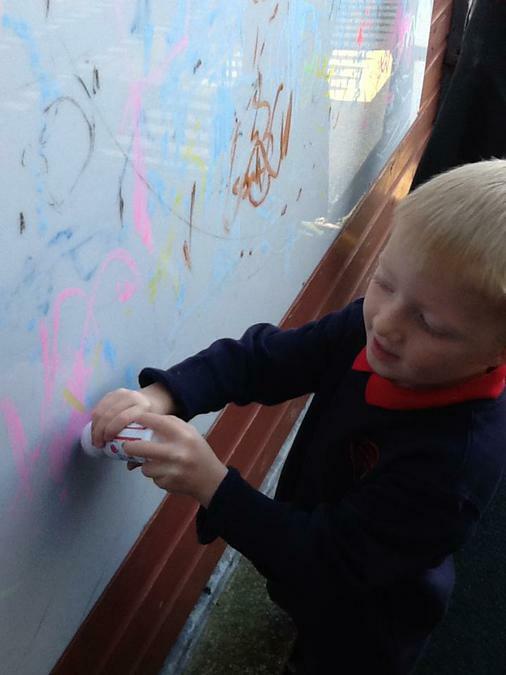 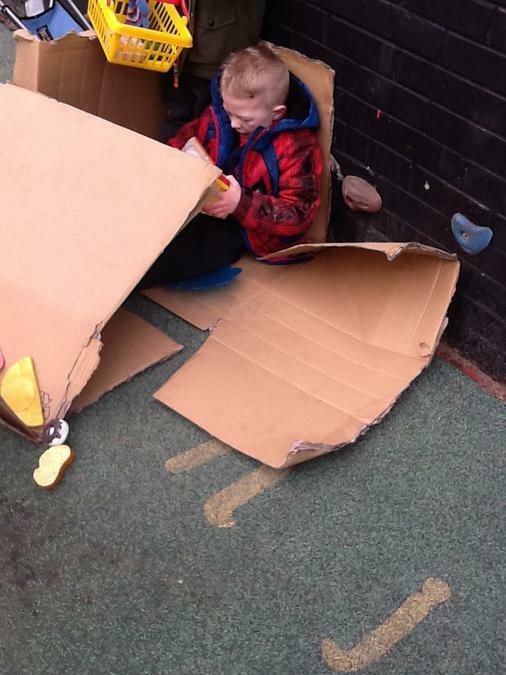 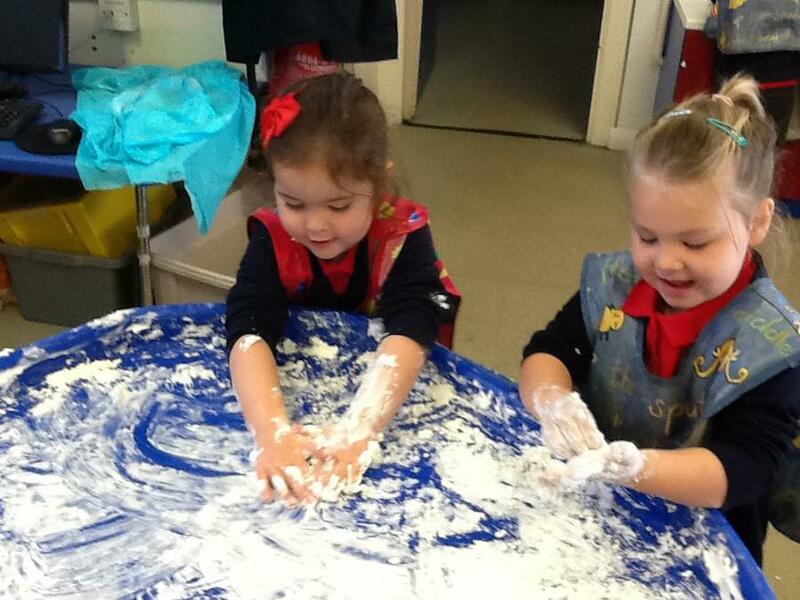 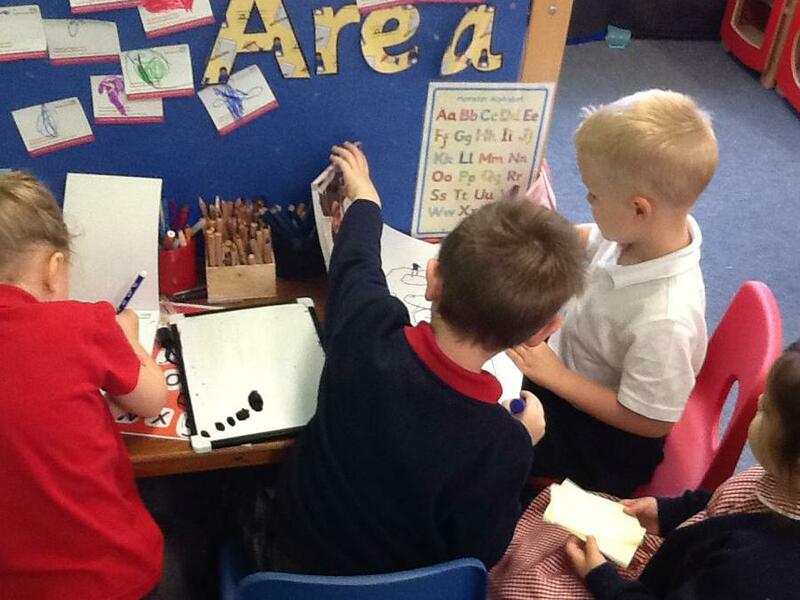 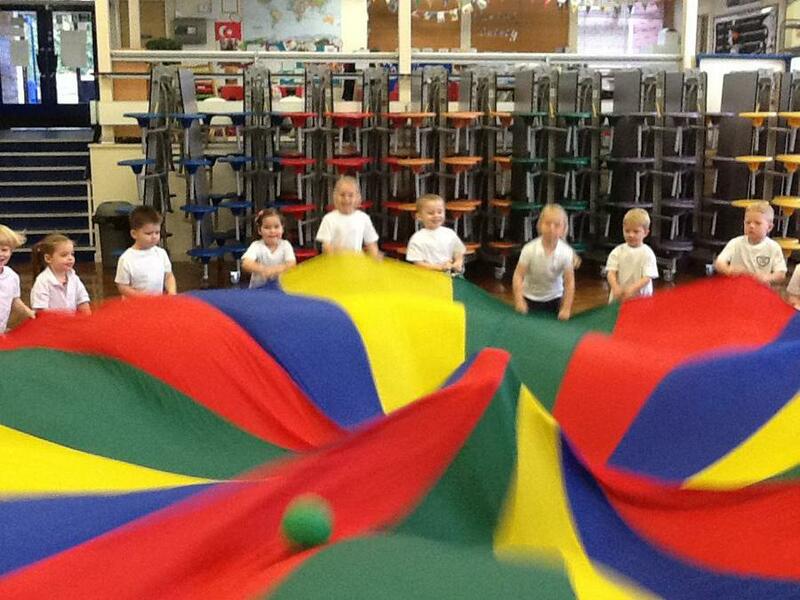 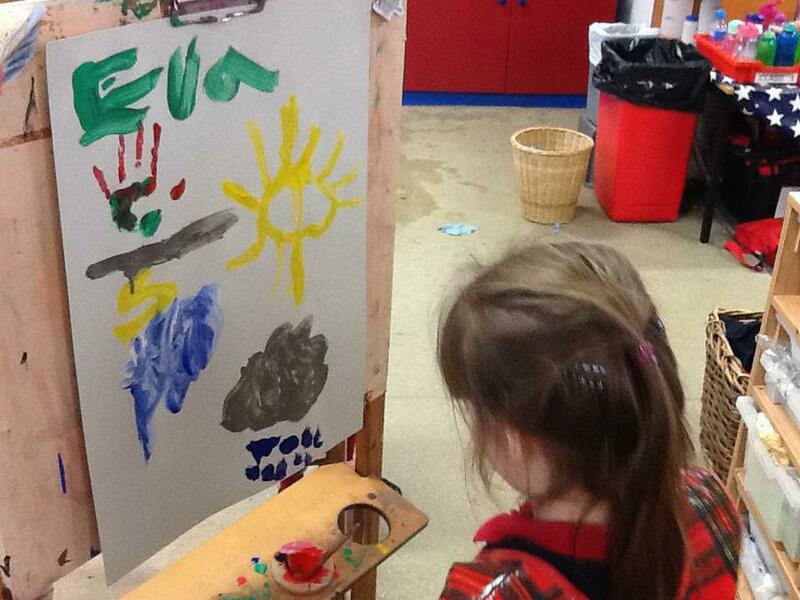 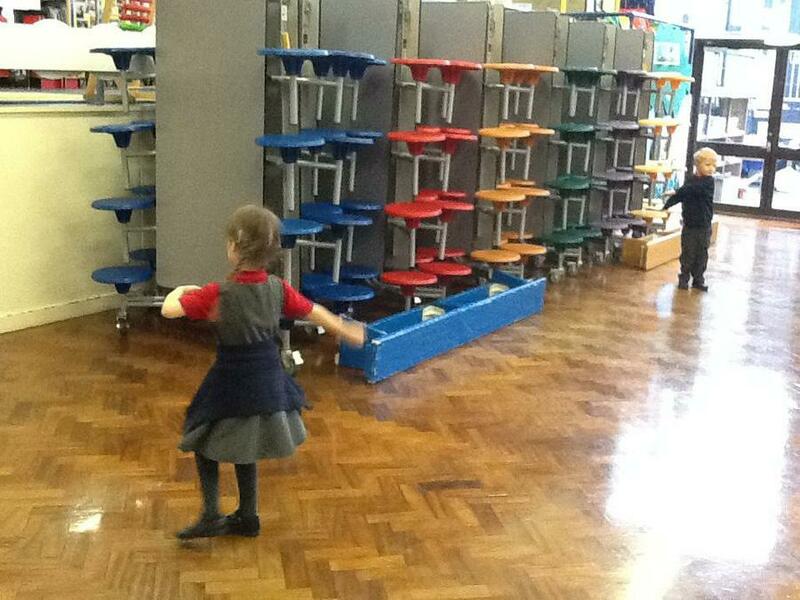 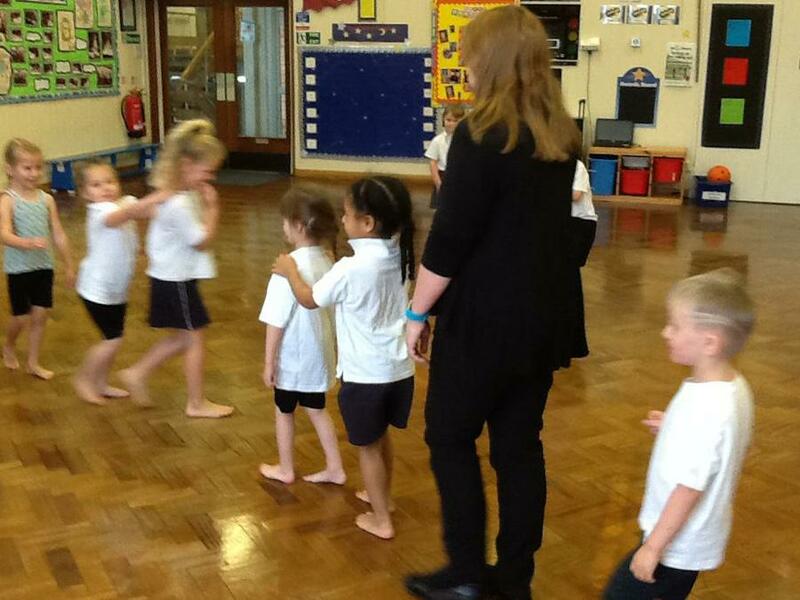 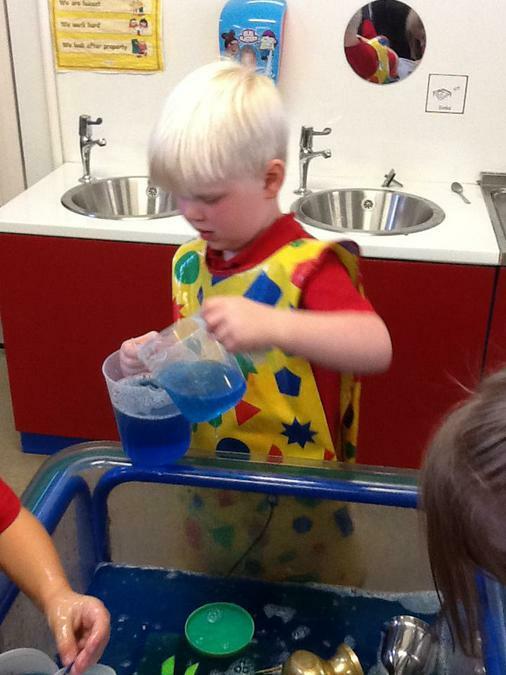 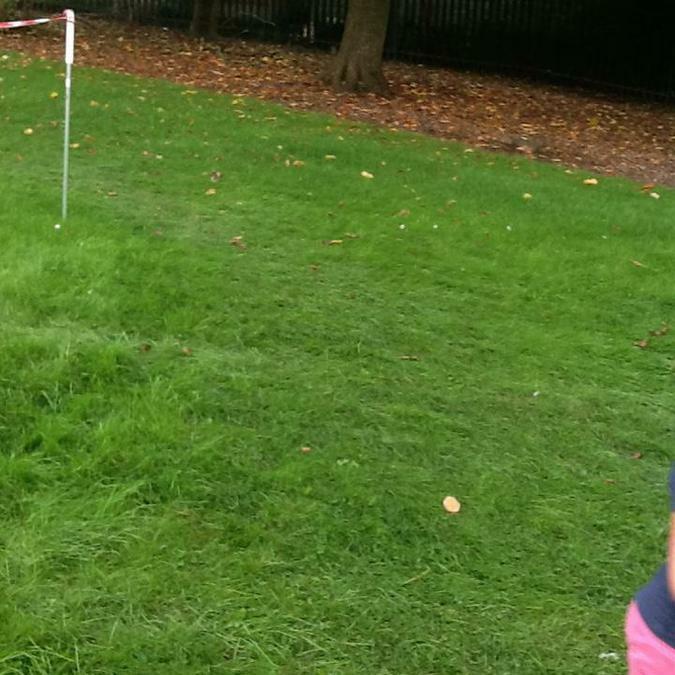 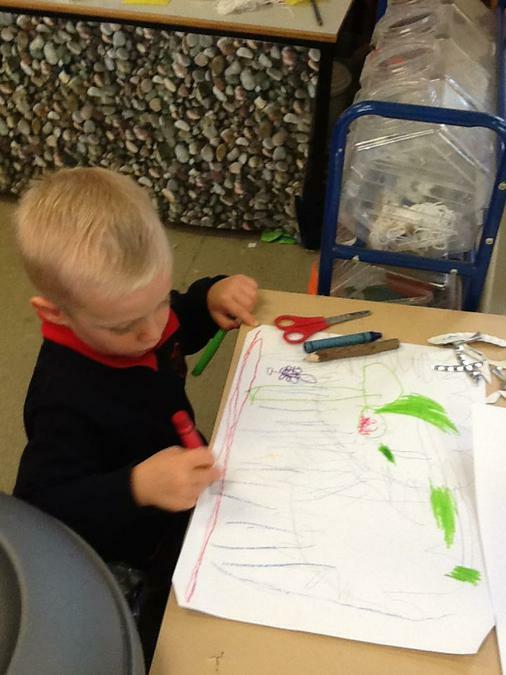 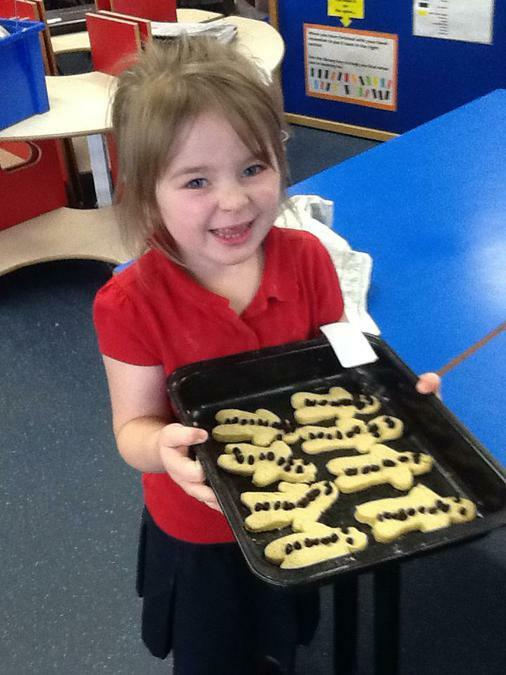 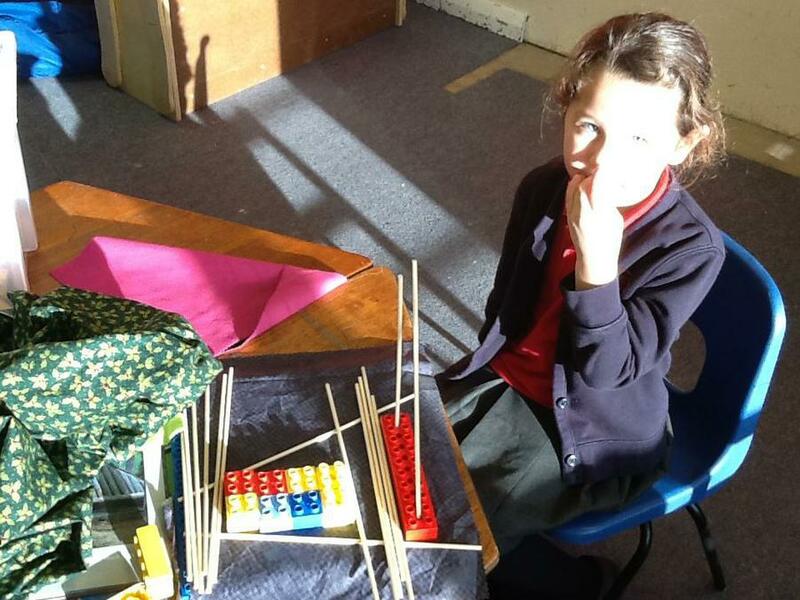 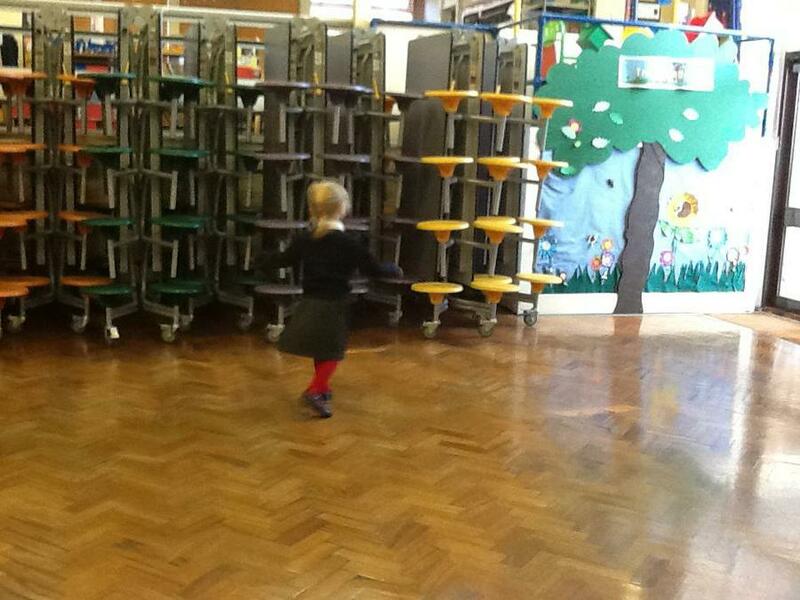 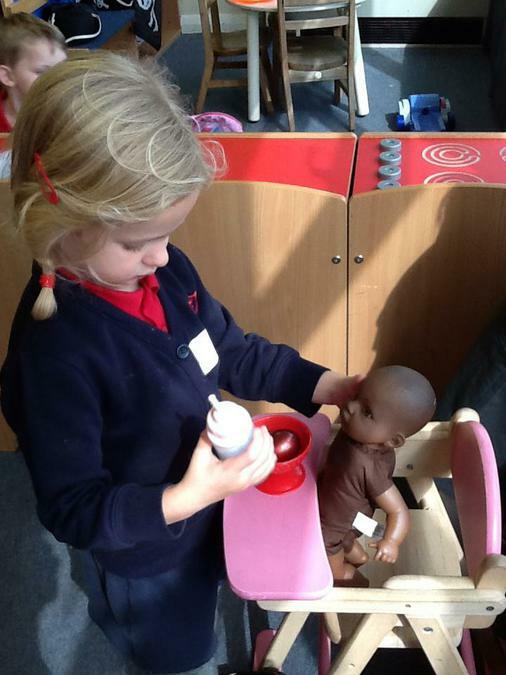 Here are some pictures showing a range of activities that link into the EYFS physical development curriculum. 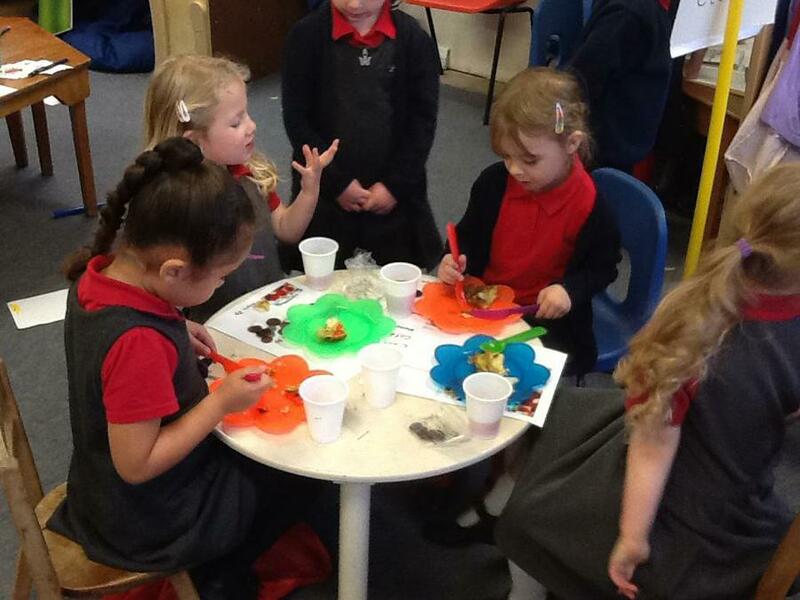 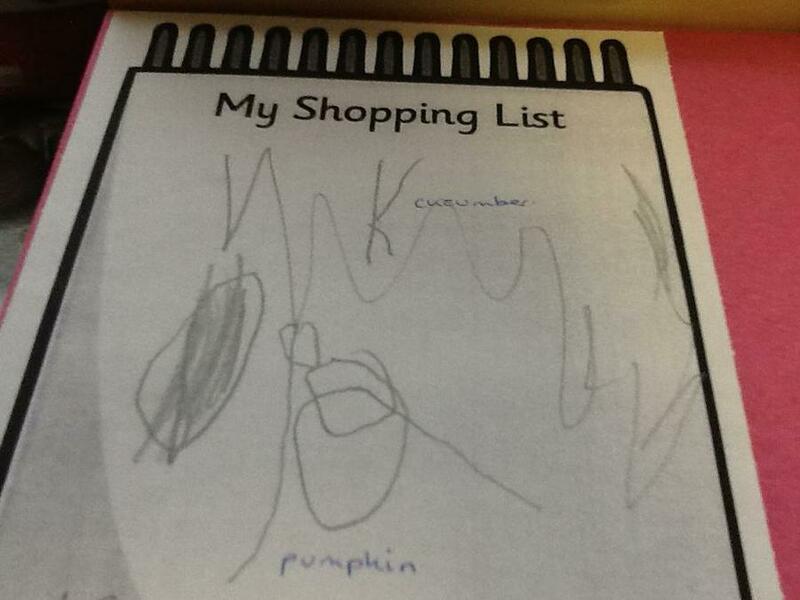 This term we will be learning about Autumn, light and CHRISTMAS!!! 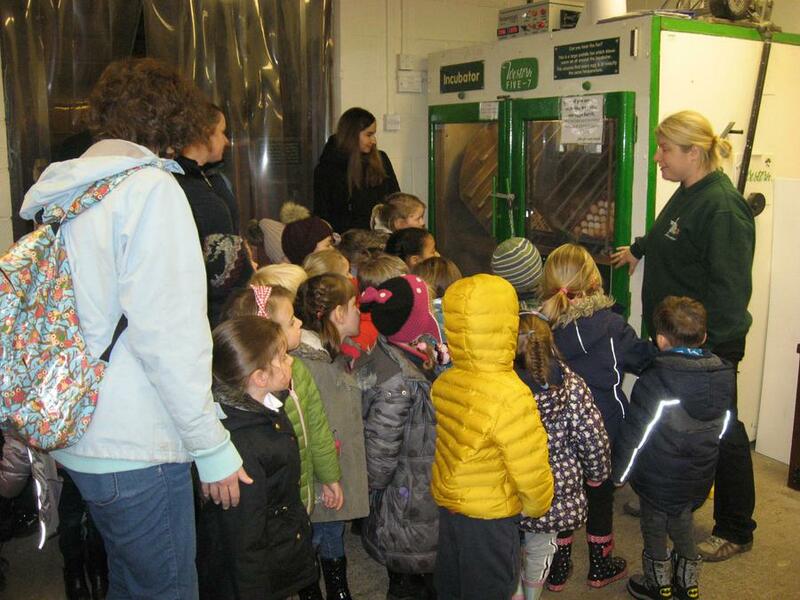 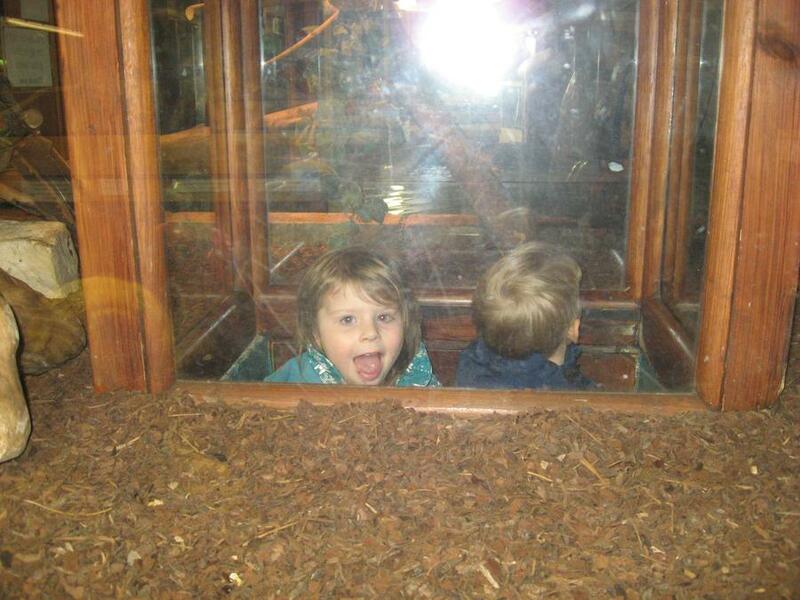 We will be exploring with so many exciting things this half term but we could do with your help. 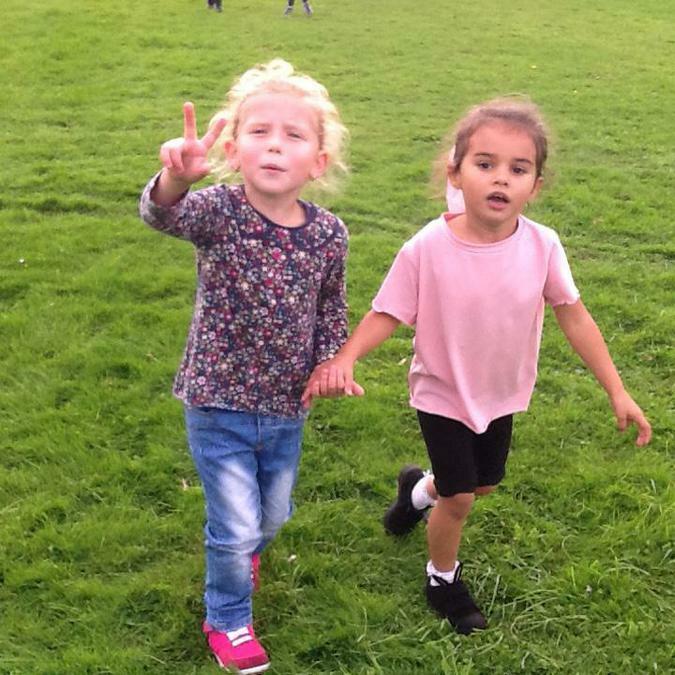 Over the half term holiday could you please collect leaves that have fallen from the trees, conkers, acorns and anything else that shows it’s Autumn and bring them to school. 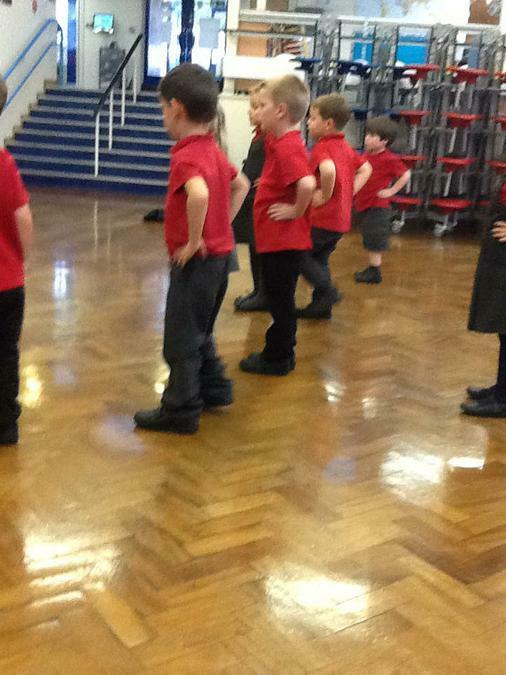 We can’t wait to show you all everything we get up to so keep an eye on our page. 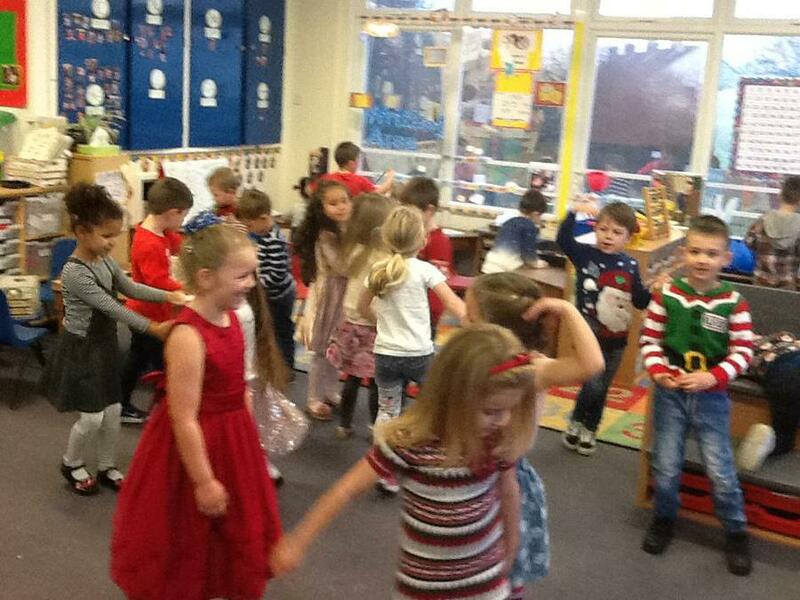 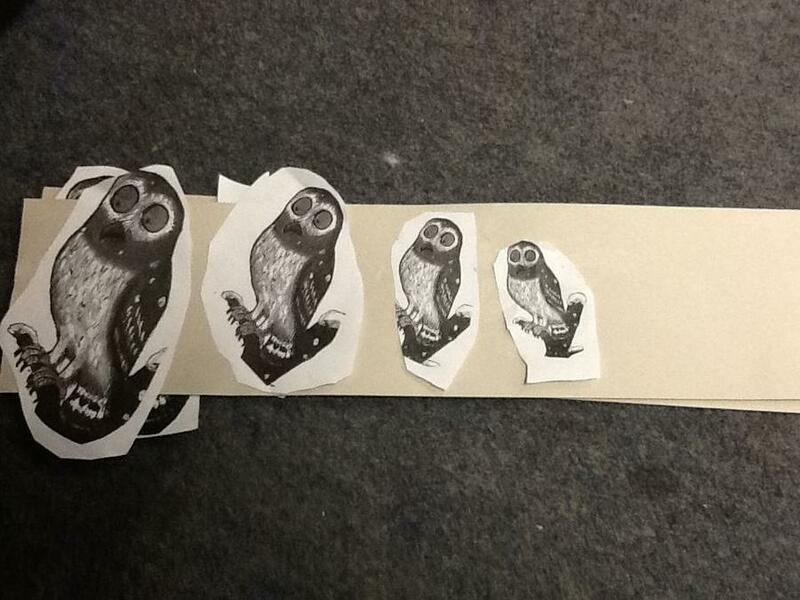 Also look out for any notes in your child's bag about the Christmas performance costumes. 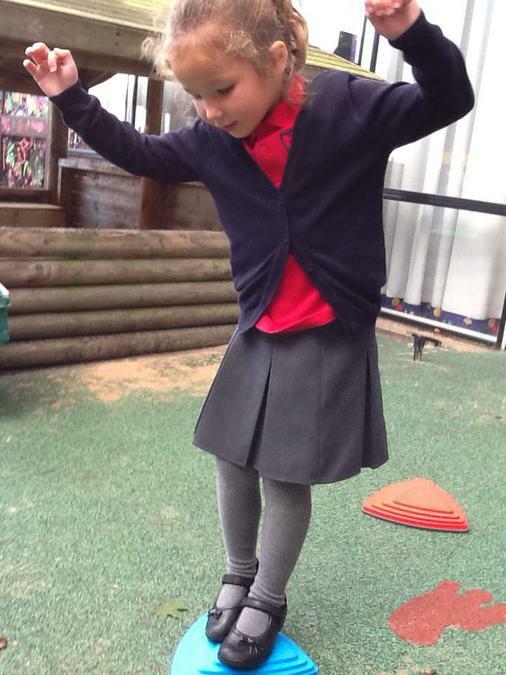 Have a great half term! 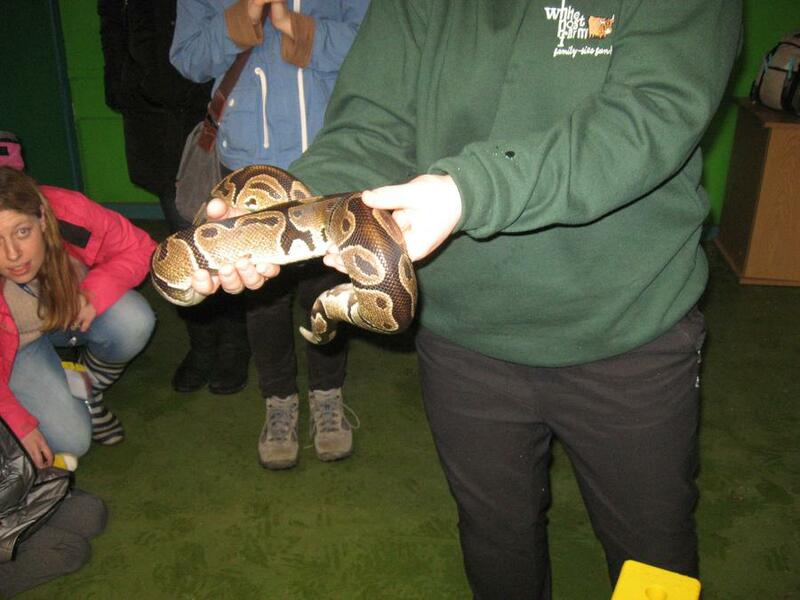 Wow, what an amazing way to end our very first half term at School. 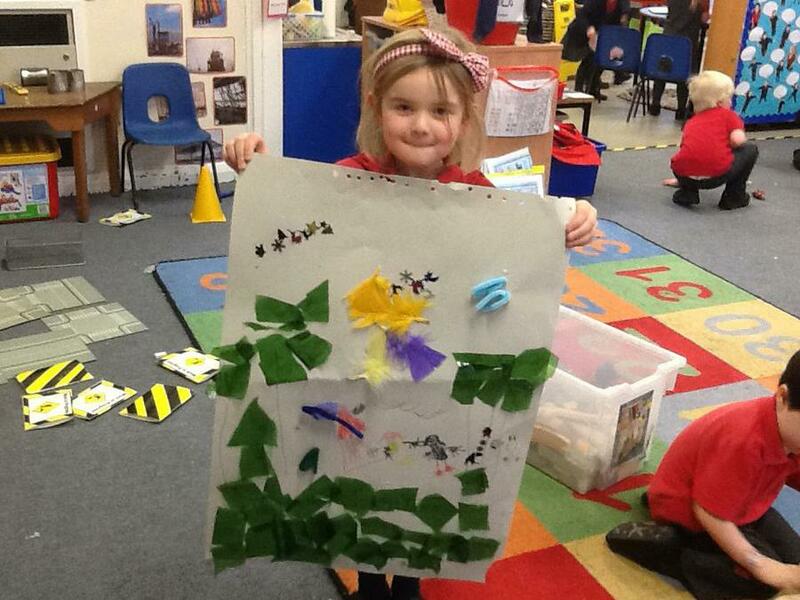 We learnt all about Spain! 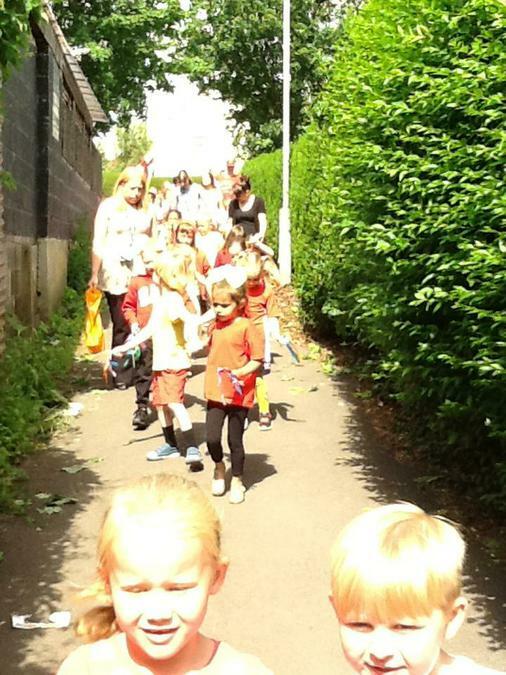 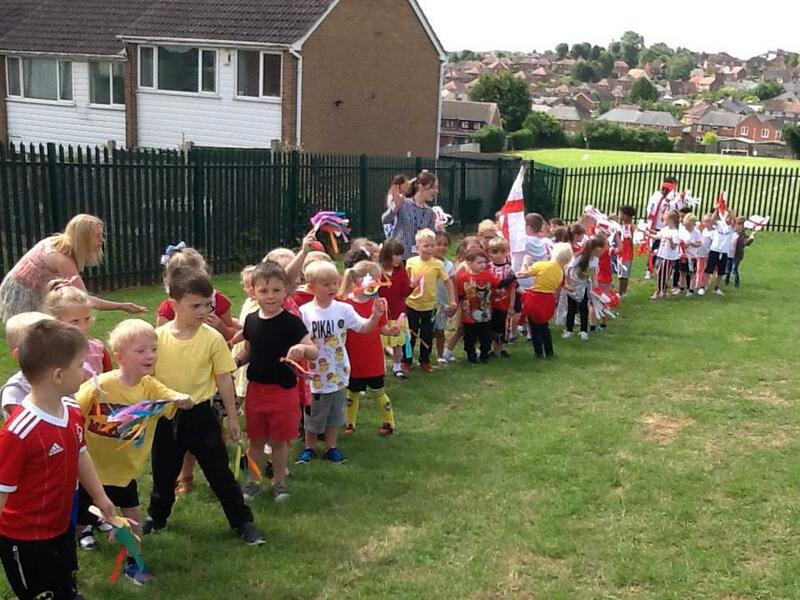 We looked at all sorts of things like the flag, food, music and we also learnt that Spanish people know how to party! 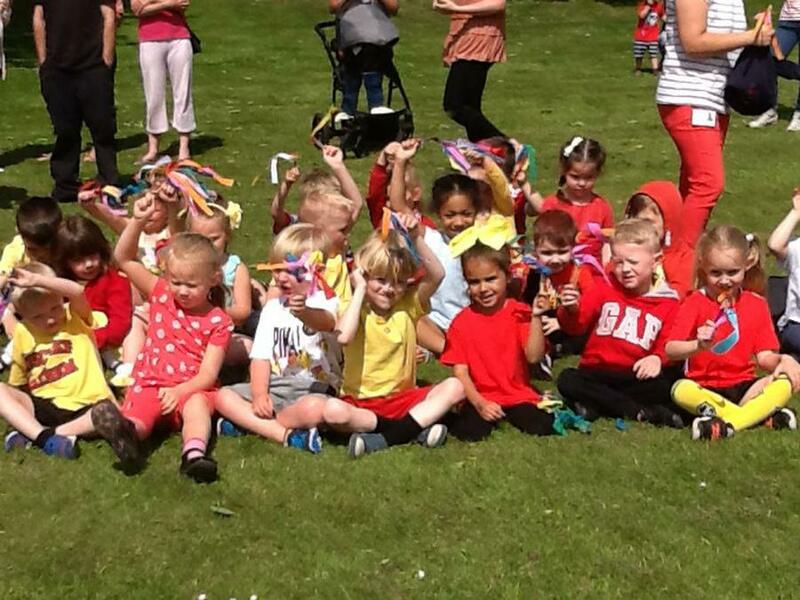 We really enjoyed making fans (as its very warm in Spain) and creating our own necklaces using the Spanish flag colours. 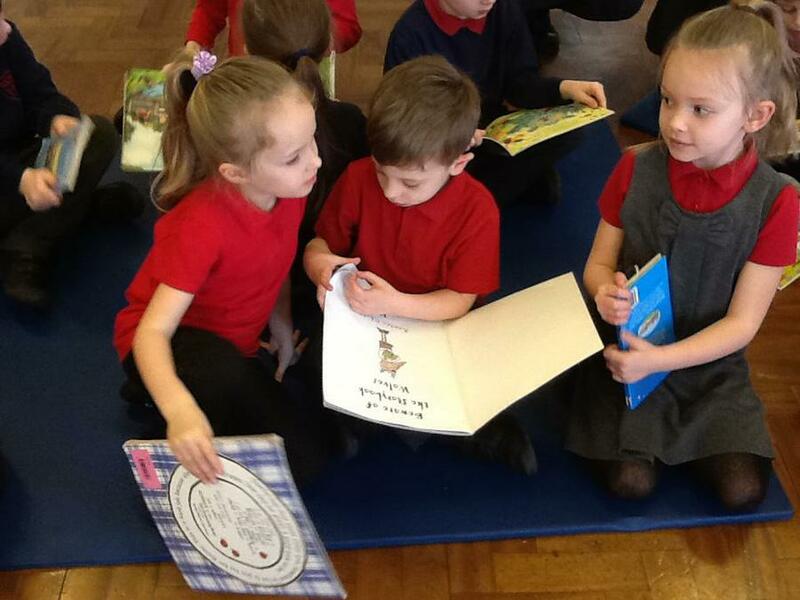 We made the class 1 and 2 team very proud by telling the rest of the school all about what we have learnt this week in the school assembly. 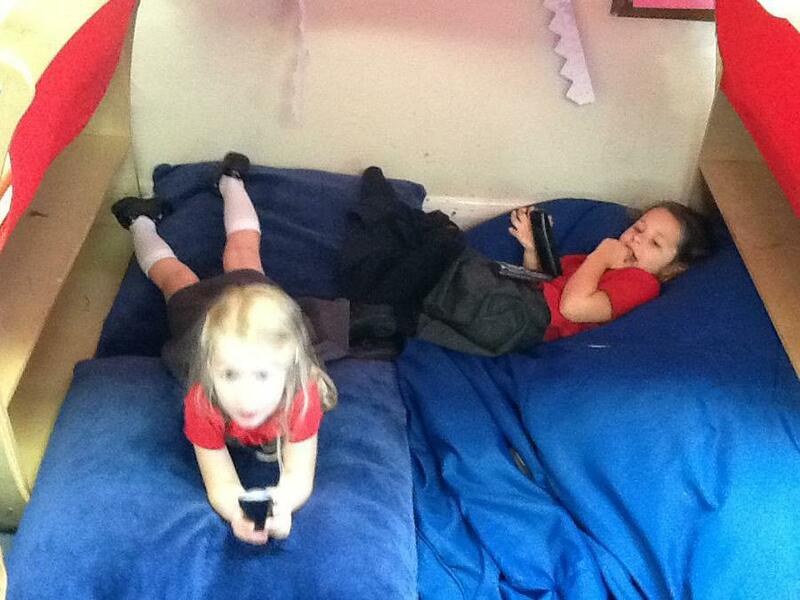 We have had a great week, now to recharge our batteries ready for the next half term. 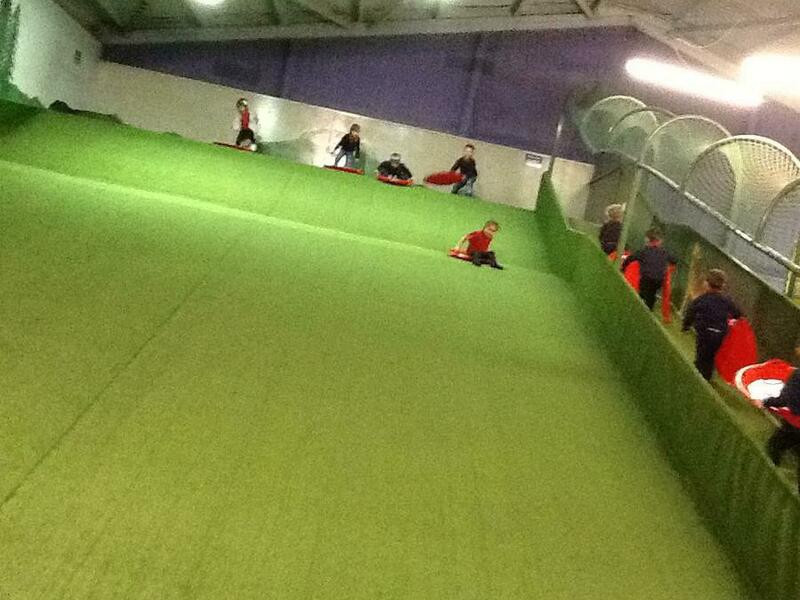 Phew...that was tiring but fun!